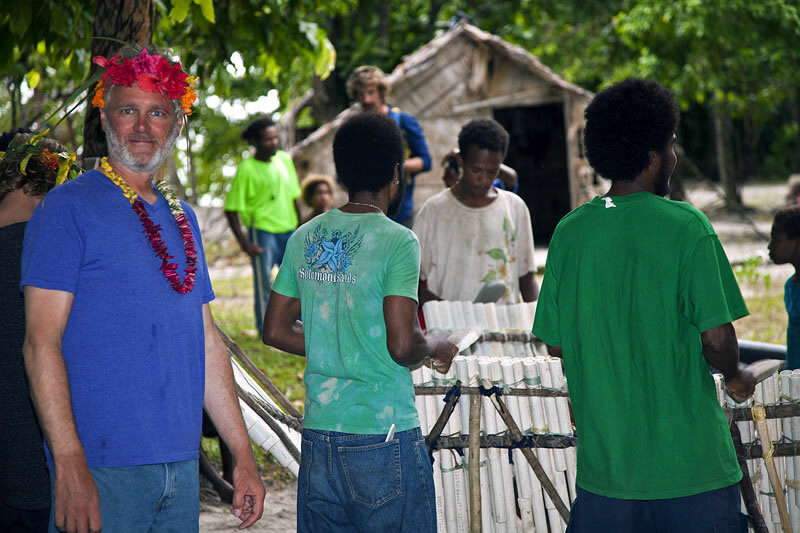 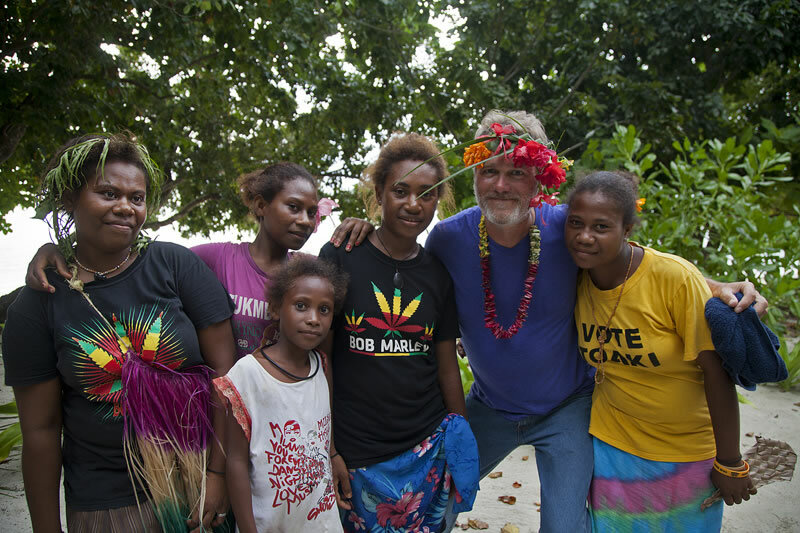 Fifteen years ago Ken Marks became involved with AGRRA due to his work with REEF (Reef Environmental Education Foundation) as a fish watcher. 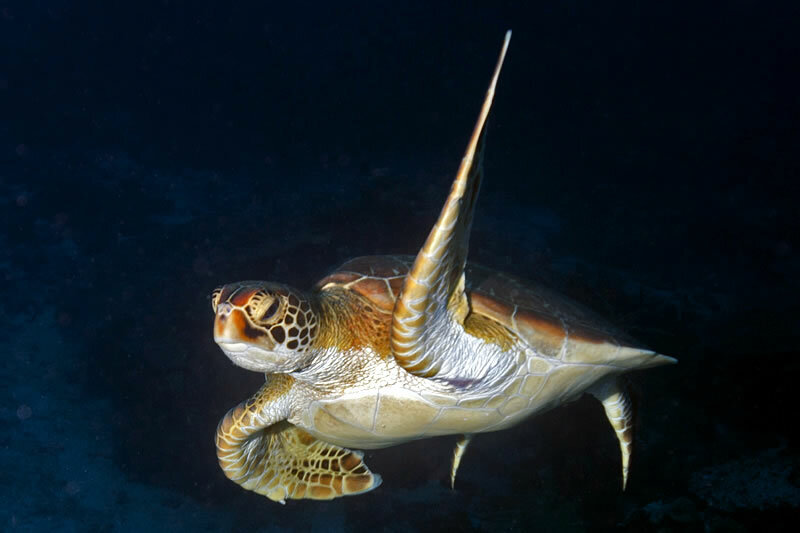 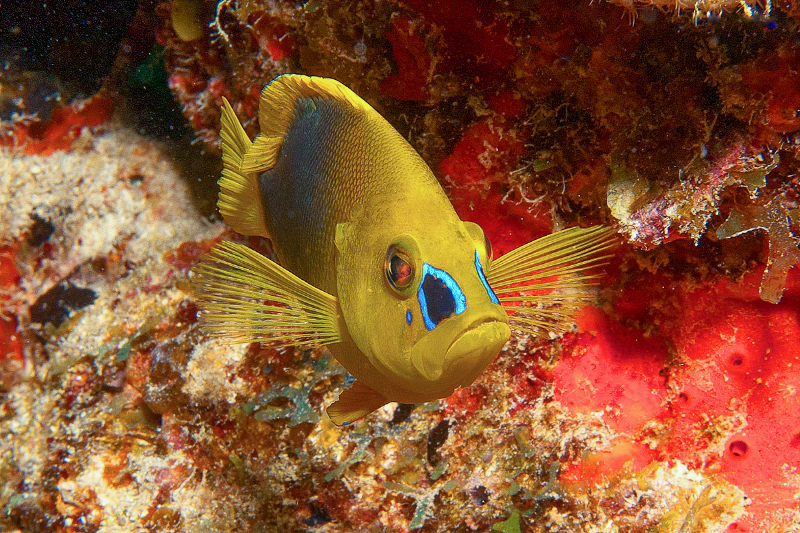 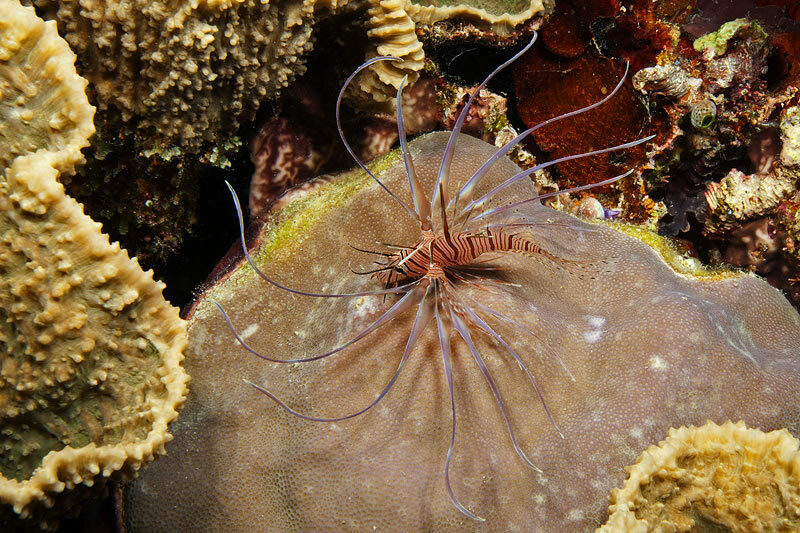 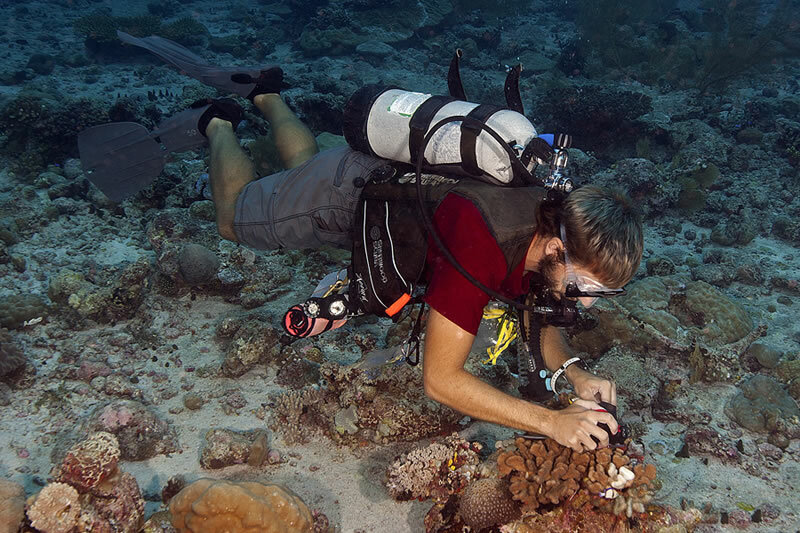 Though formally trained in computer science, Ken Marks has been able to work closely with marine biologists using his computer skills in combination with his extensive knowledge of the fascinating creatures inhabiting the underwater world. 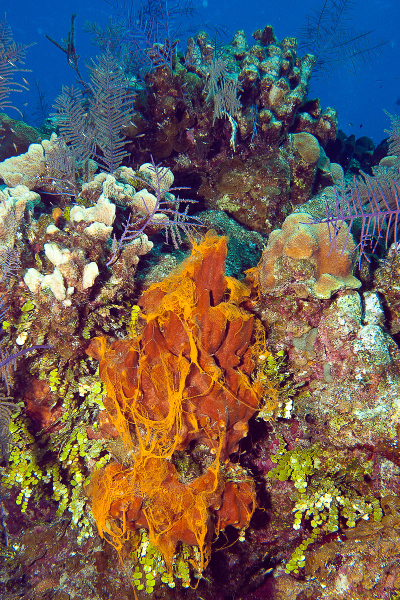 Mustard Hill Coral and Lettuce Coral with encrusting sponge. 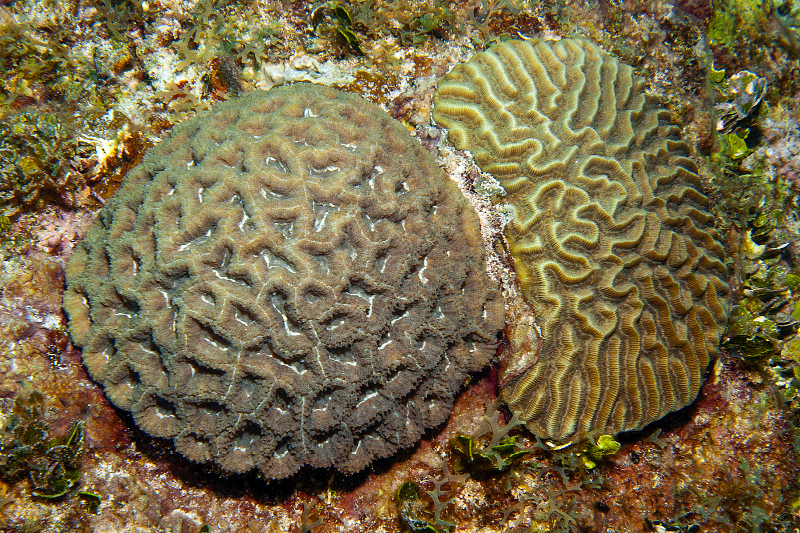 Rough Star Coral on the left and Symmetrical Brain Coral on the right. 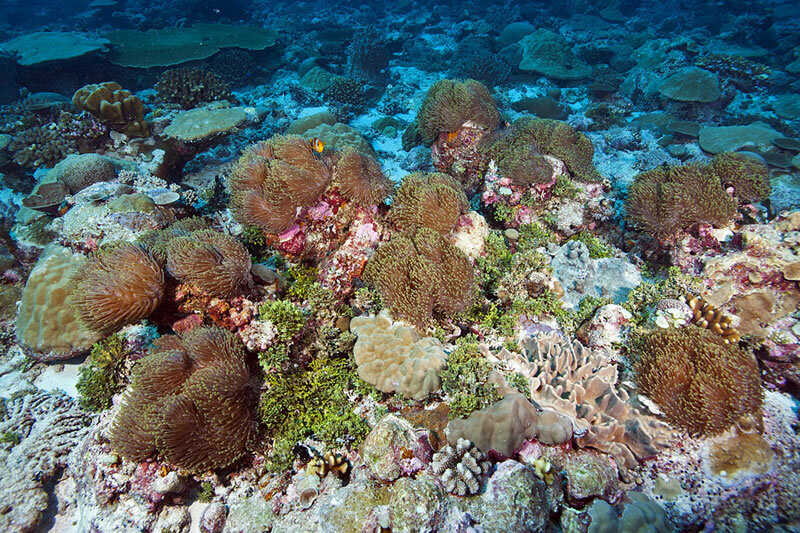 A beautiful coral reef in New Caledonia. 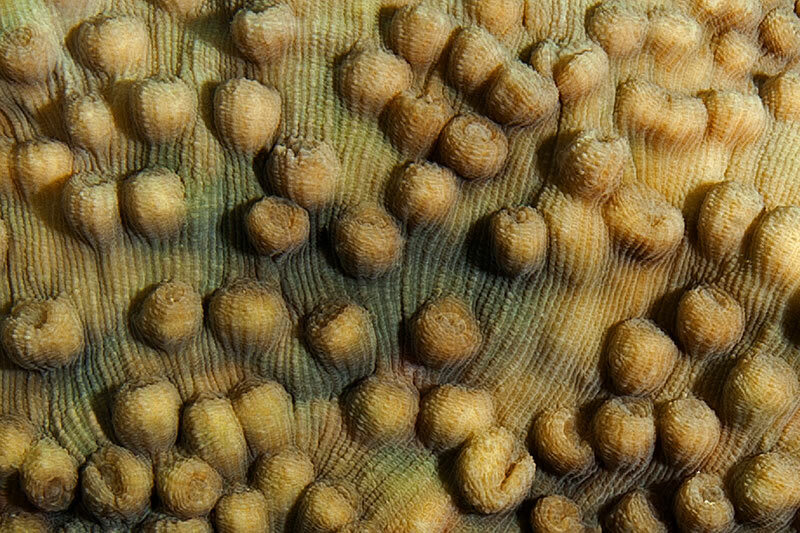 Coral with its tentacles exposed and polyp mouths visible. 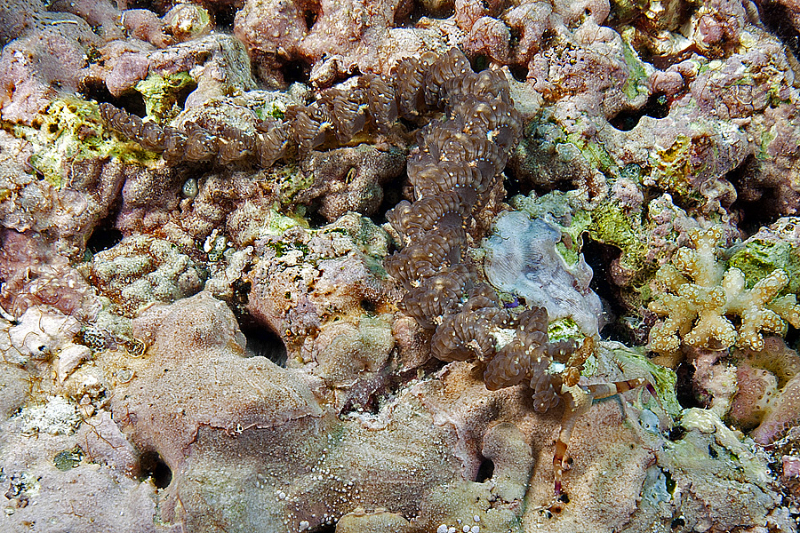 Incredibly well camouflaged, this Pitted Ceratosoma nudibranch (Ceratosoma miamiranum) would not have been seen had it not moved. 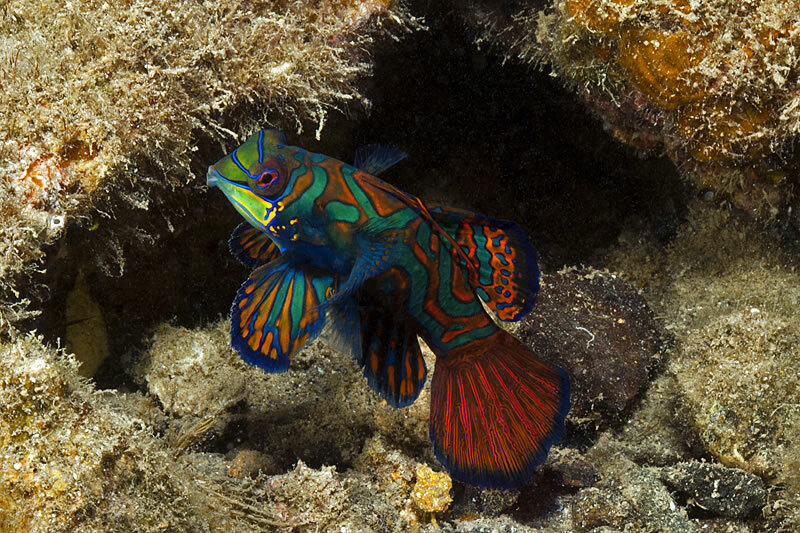 Male Mandarinfish (Synchiropus splendidus) displaying in an effort to attract mates to spawn at dusk. 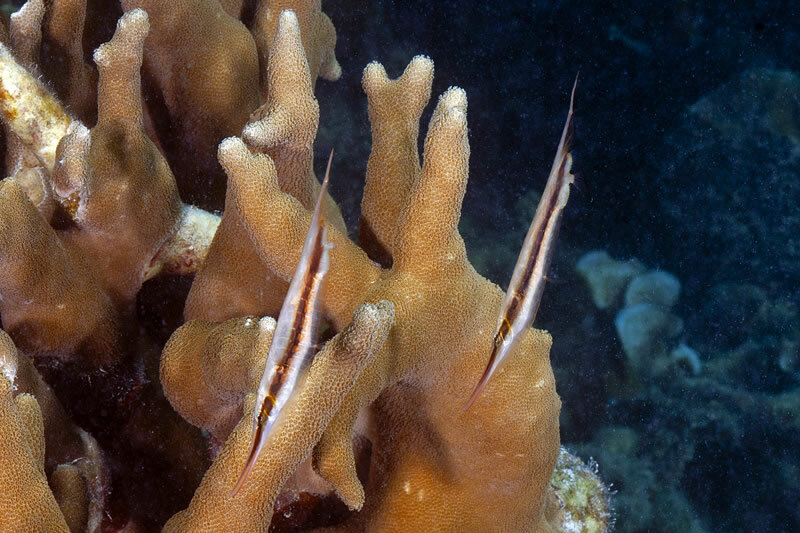 Pair of Razorfish (Aeoliscus strigatus) hover head down over a digitate Porites coral. 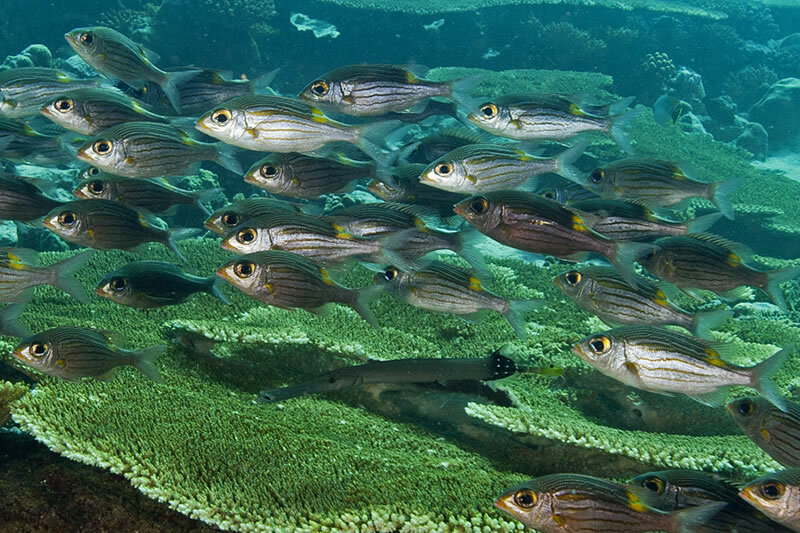 School of small Sangi Cardinalfish (Apogon thermalis) was a novel sight on a shallow dive. 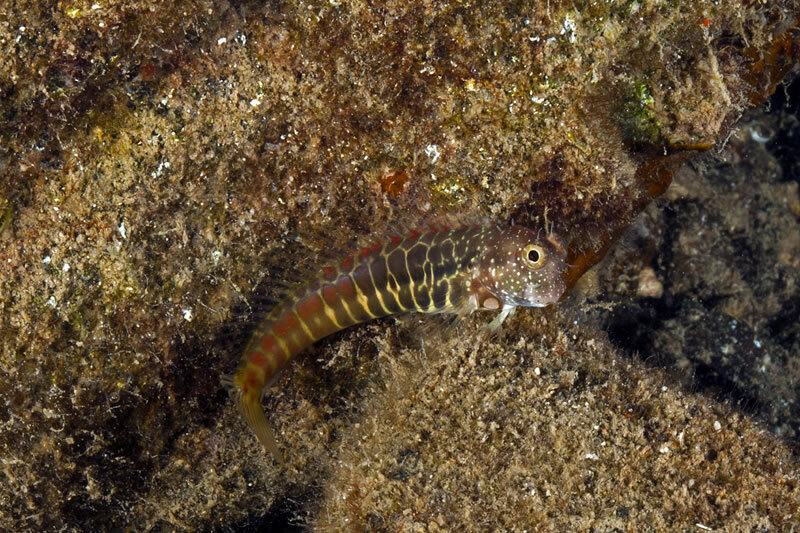 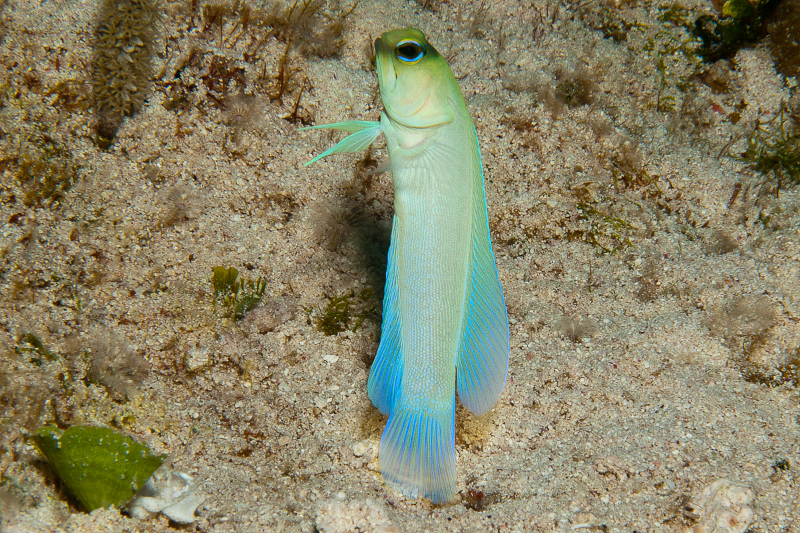 Segented Blenny (Salarias segmentatus) peers inquisitively before darting away. 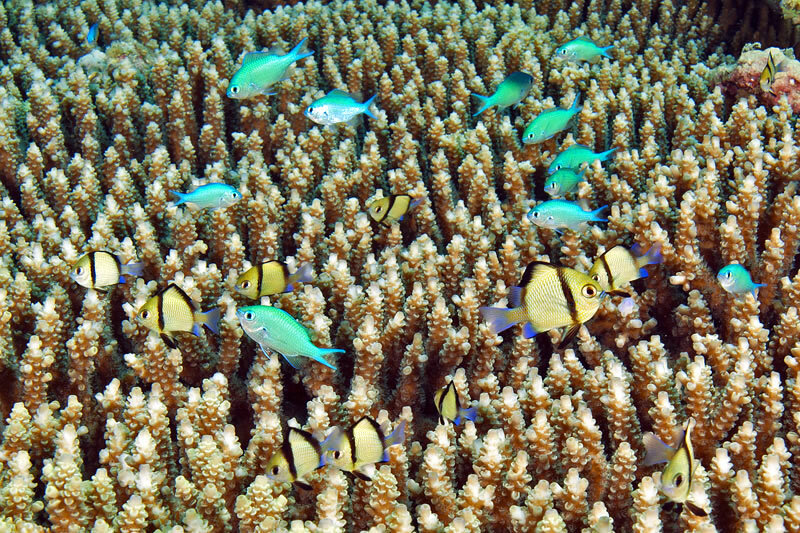 Swarm of brilliantly colored Chromis damselfish seek protection withing this Pocillopora coral. 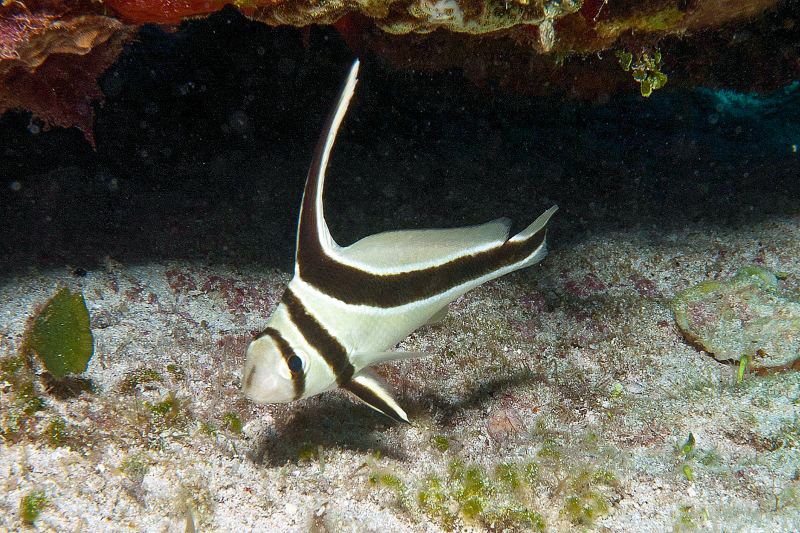 The ghastly appearance of the Spiny Devilfish (Inimicus didactylus). 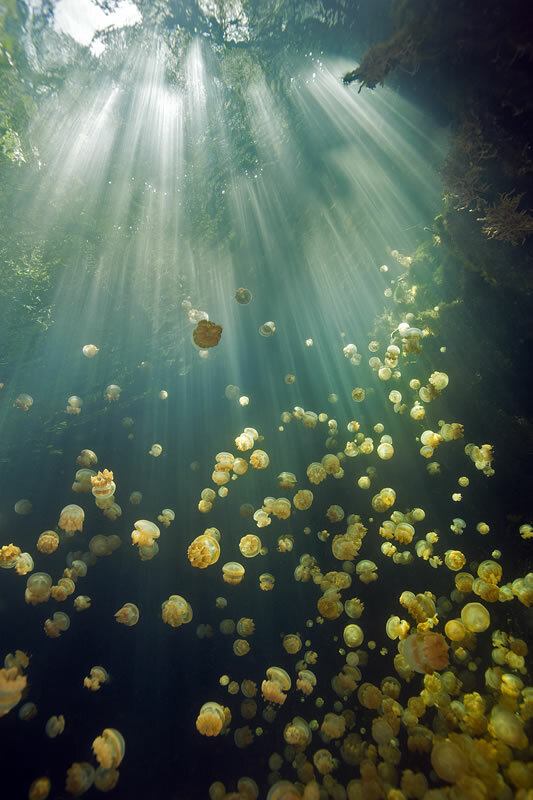 Artistic fun with Golden Jellyfish and sunburst. 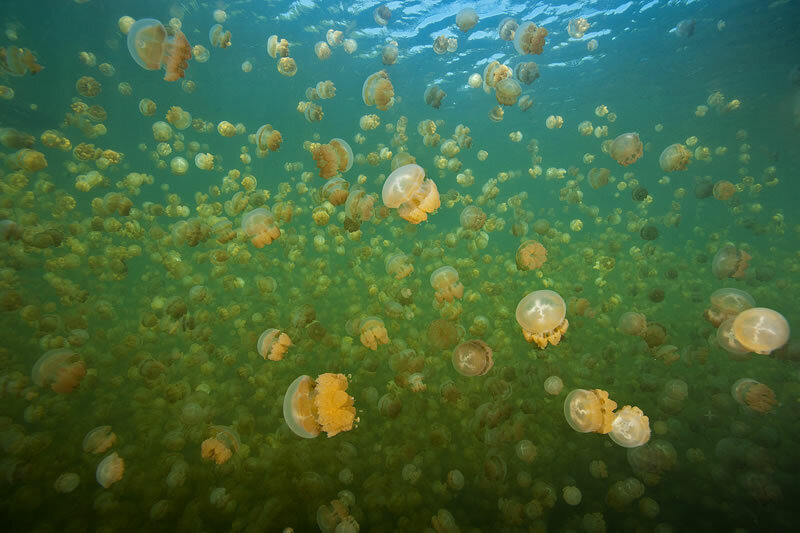 At its thickest the lake is more jellyfish than water. 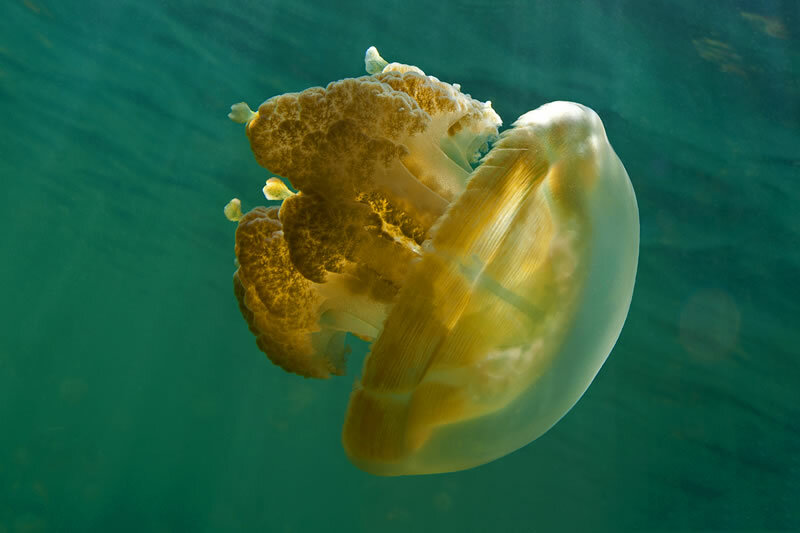 Golden Jellyfish owe their color to the symbiotic algae that live within their tissues and provide them with their sustinance. 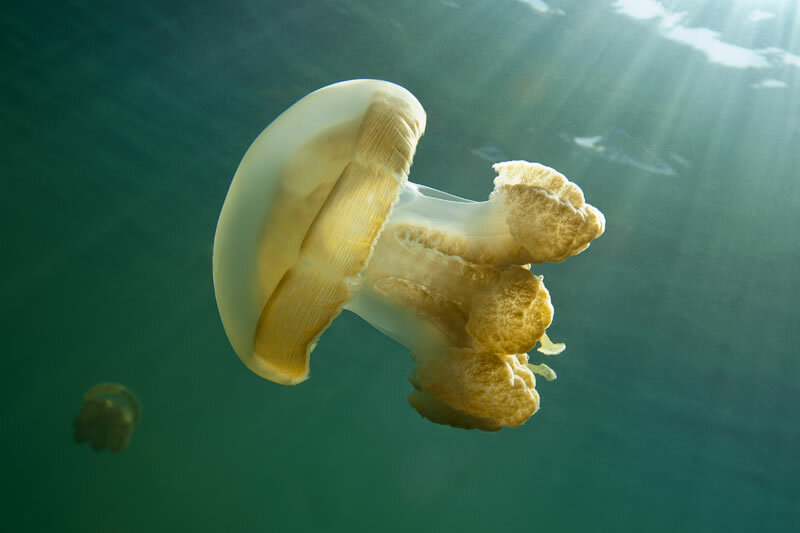 Golden Jellyfish differ from their oceanic kin the Spotted Jellyfish by the lack of spots on the dome and the greatly reduced stinging clubs (small tabs) on the ends of the frilled oral arms. 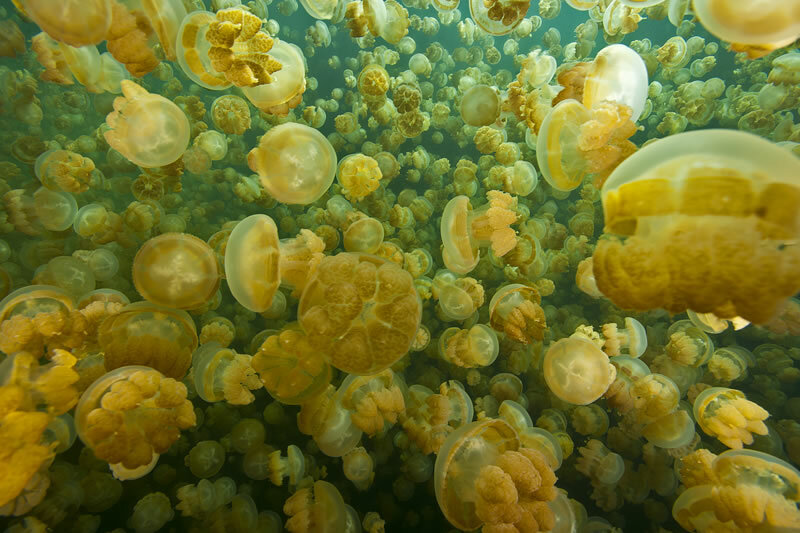 High density of Golden Jellyfish Mastigias cf. 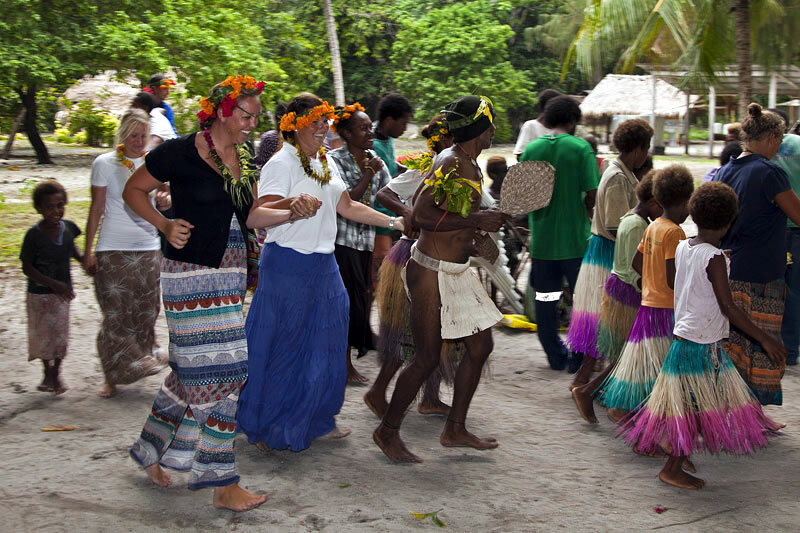 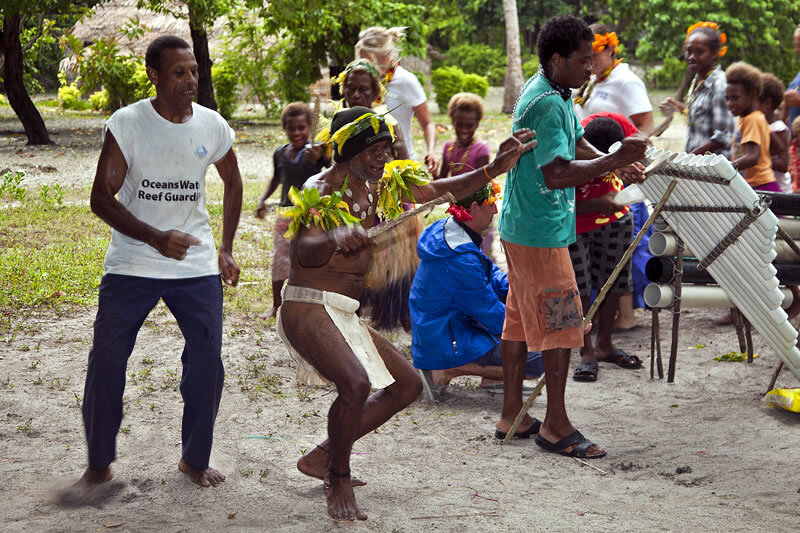 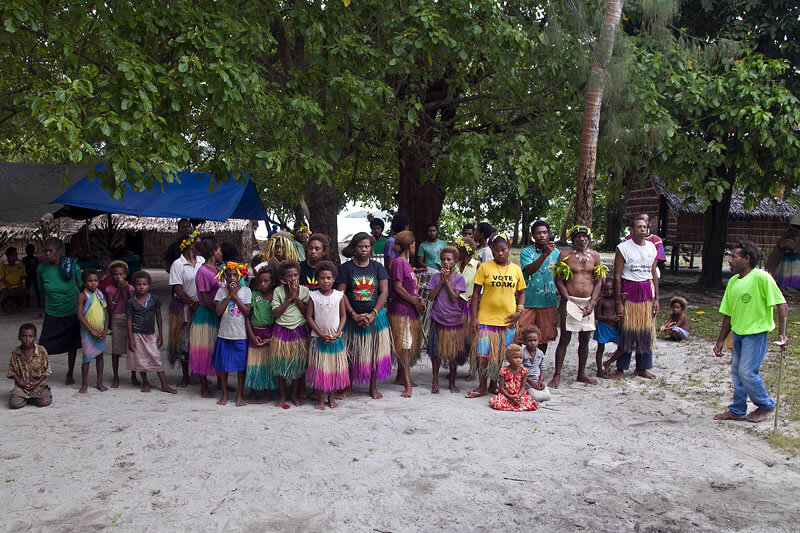 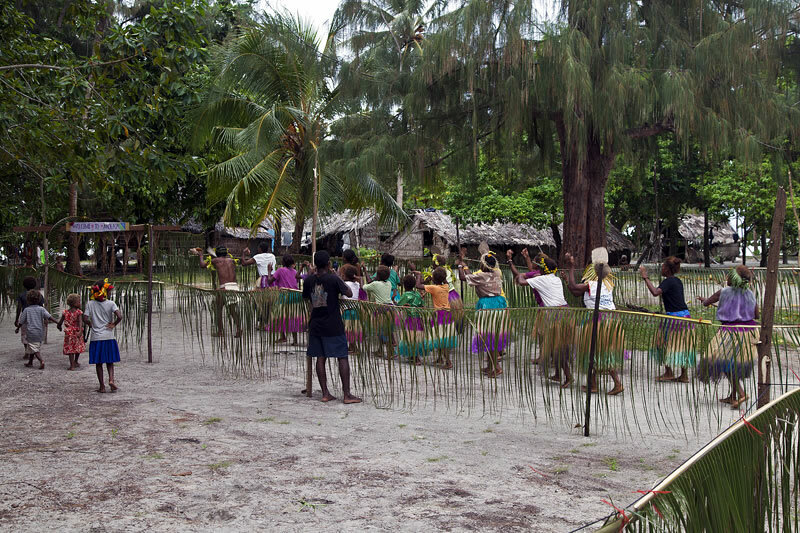 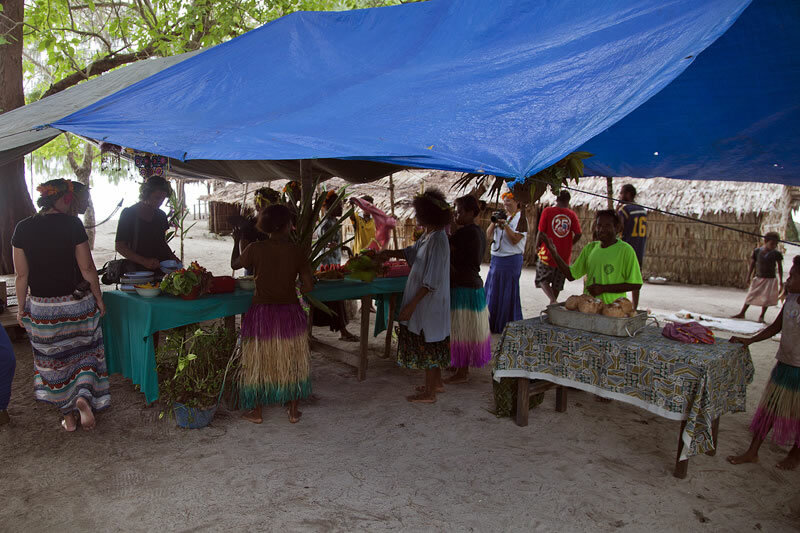 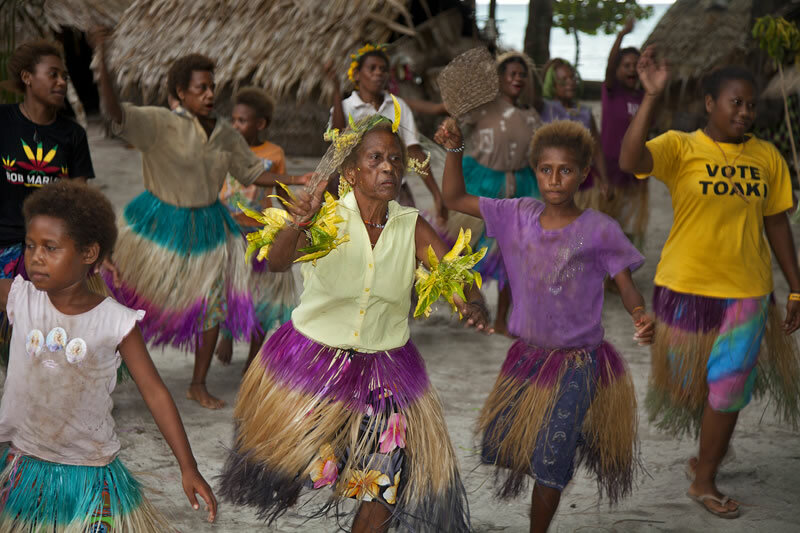 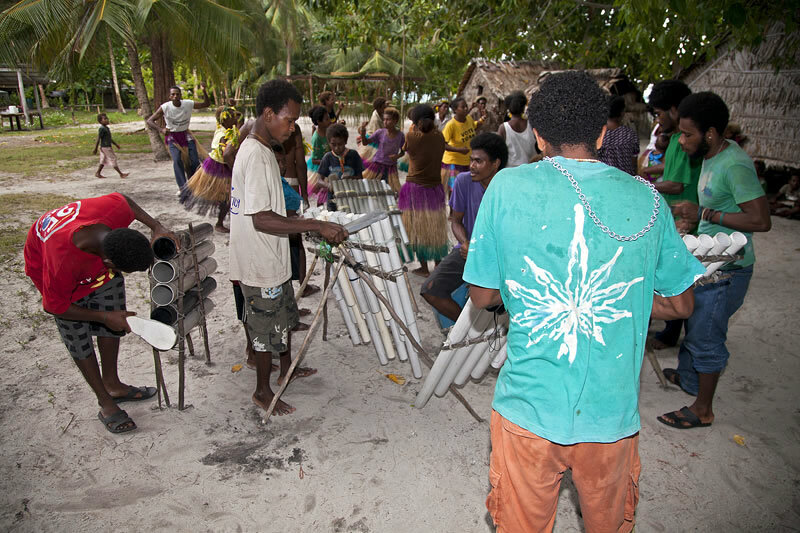 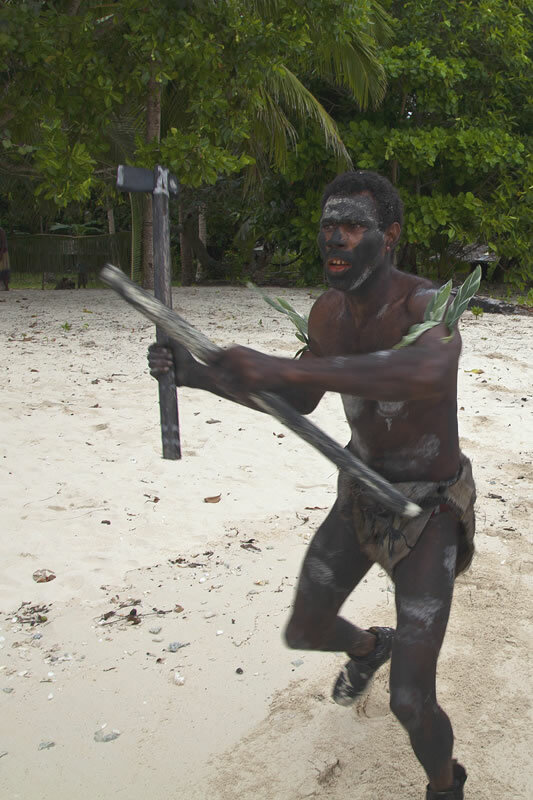 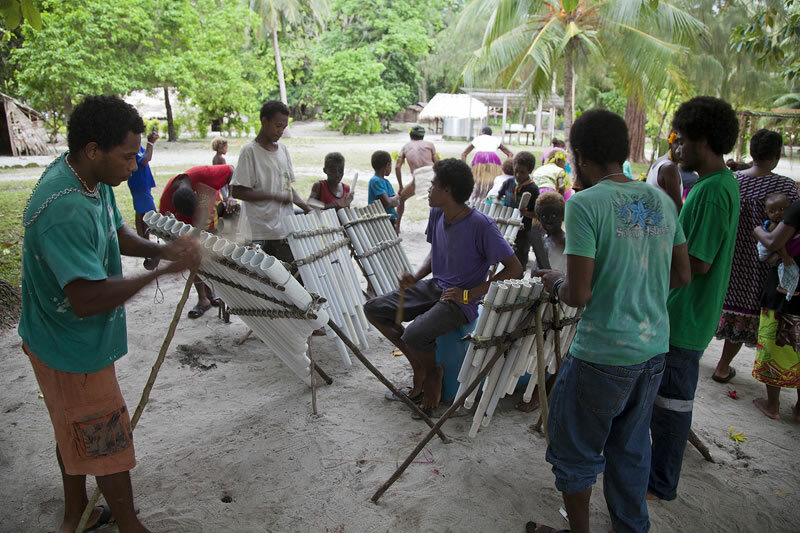 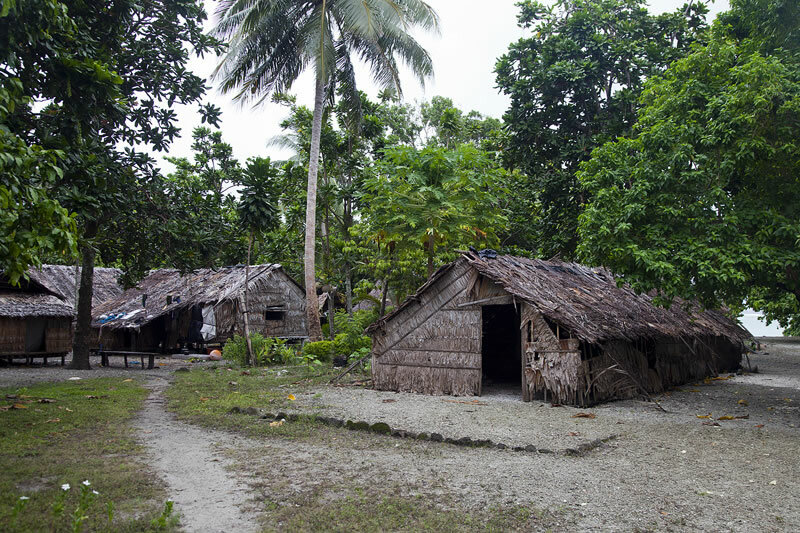 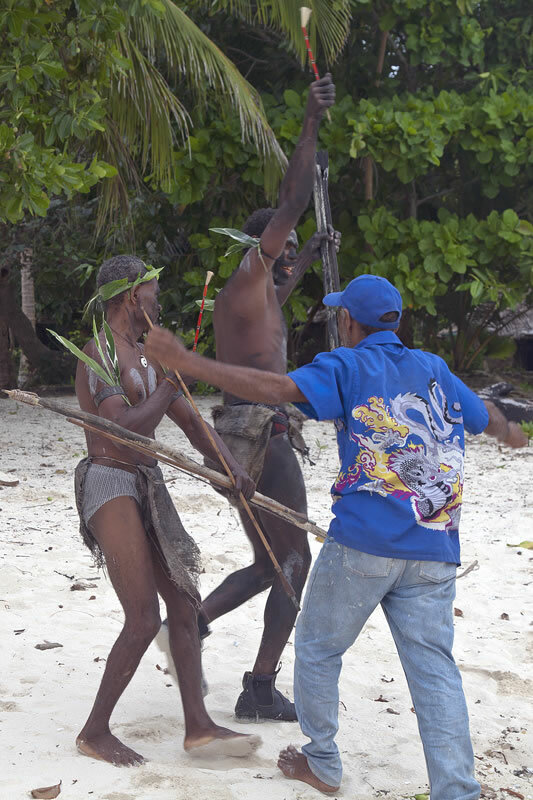 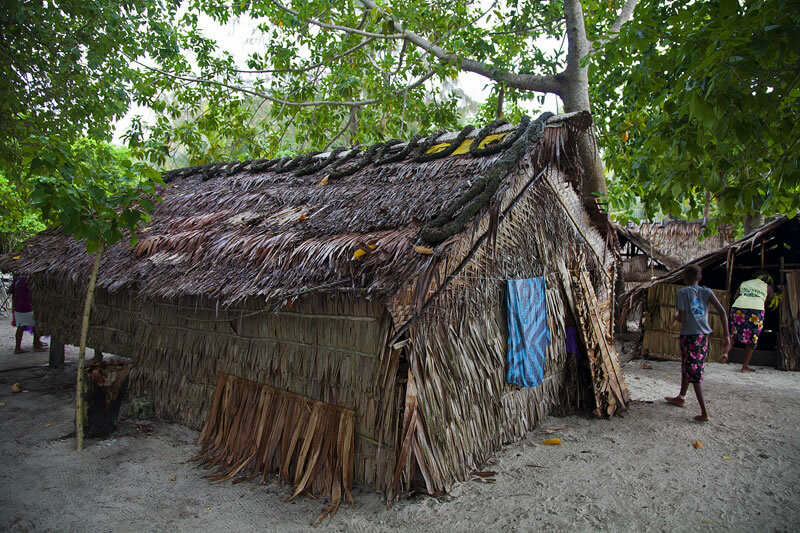 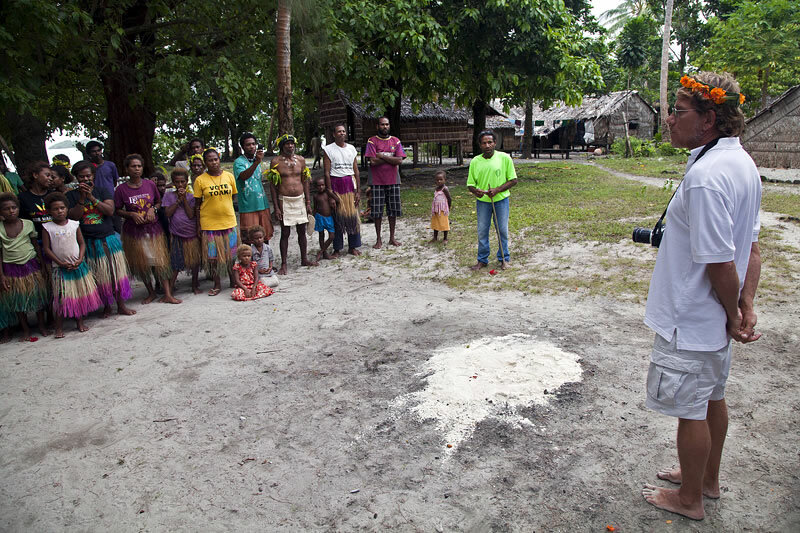 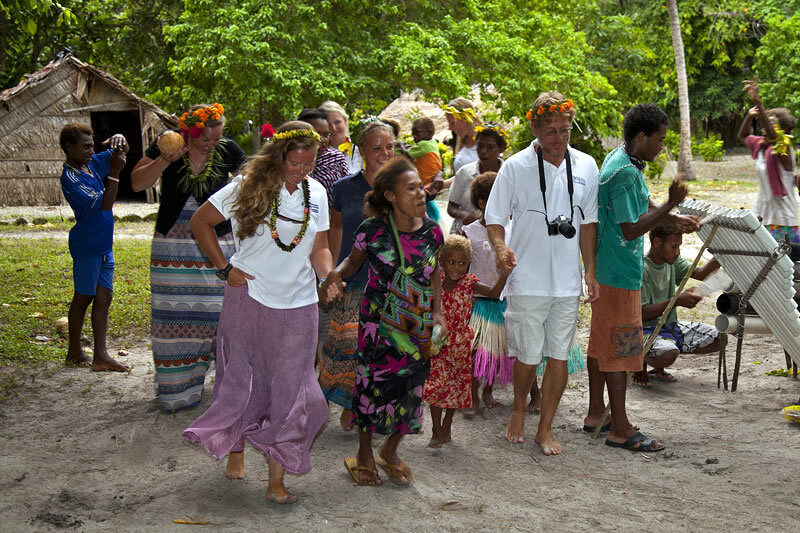 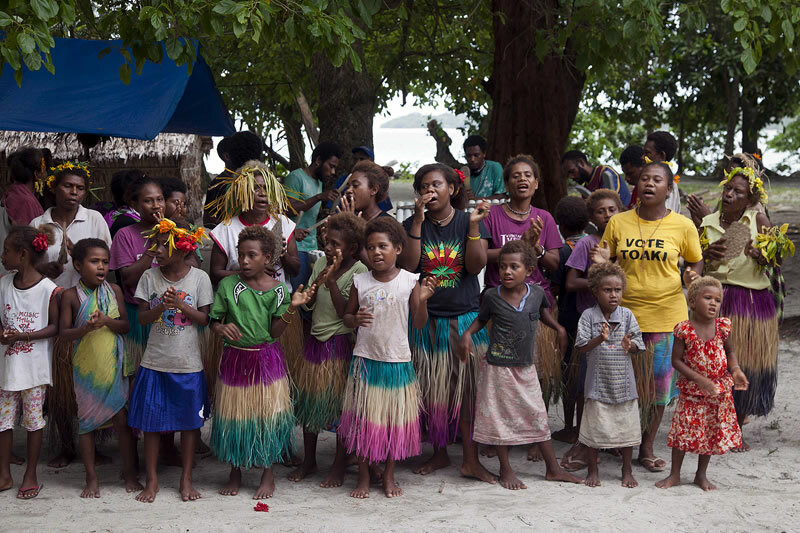 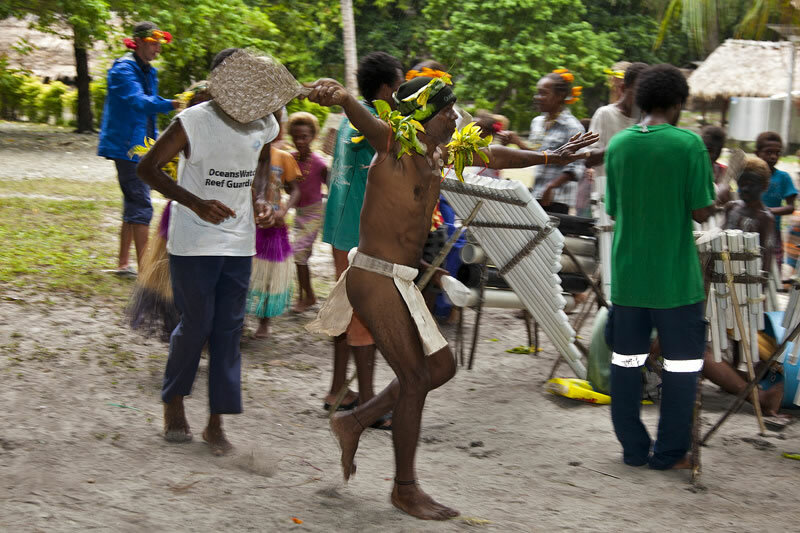 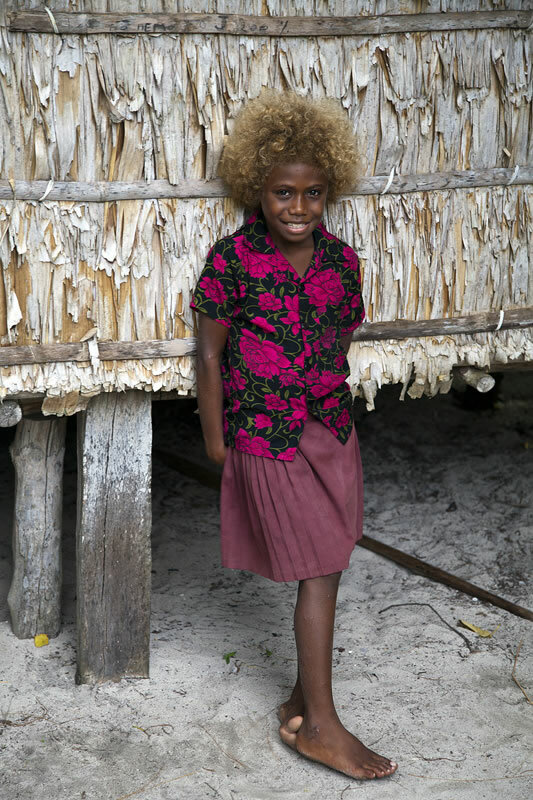 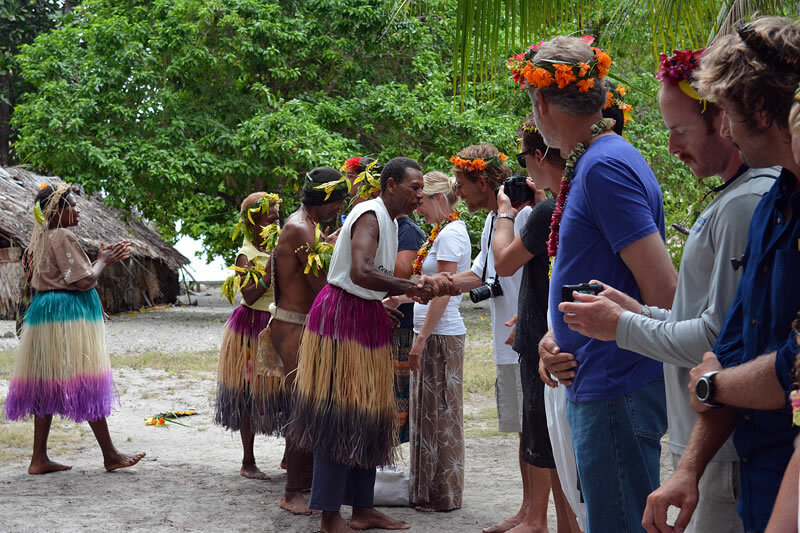 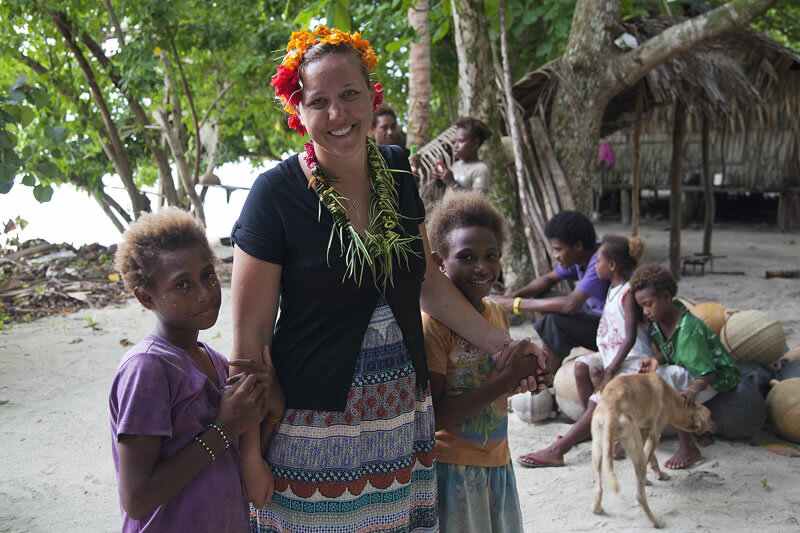 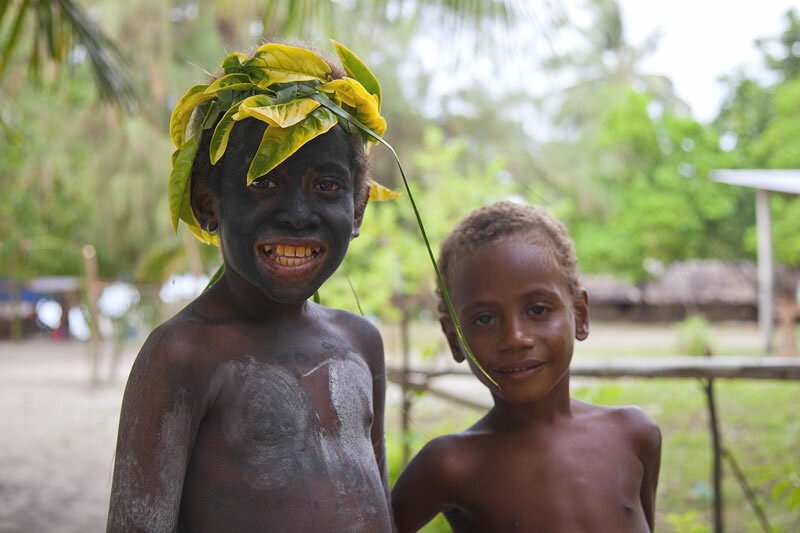 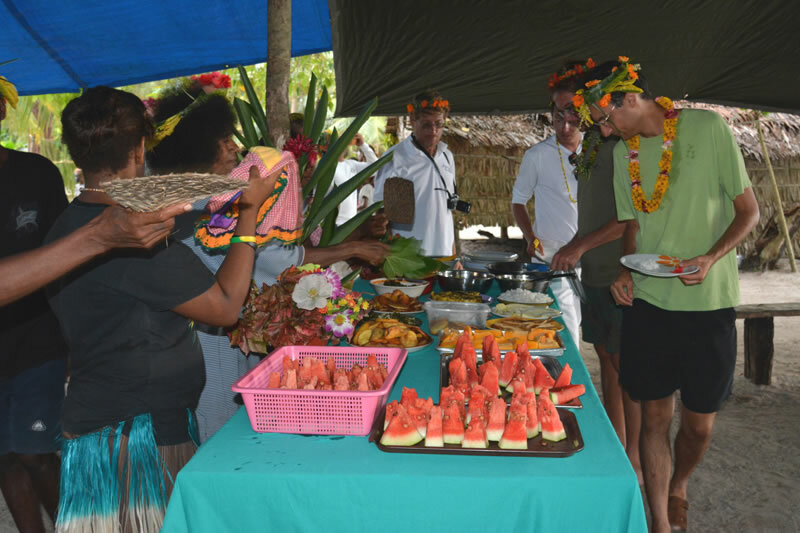 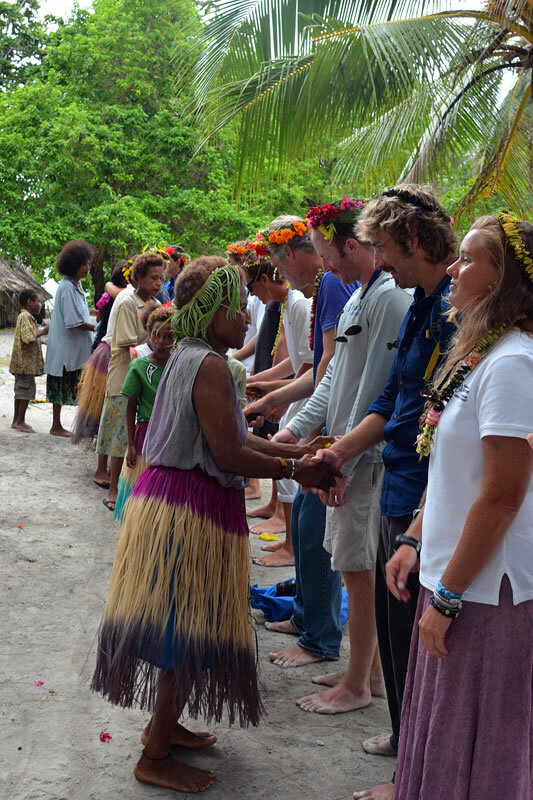 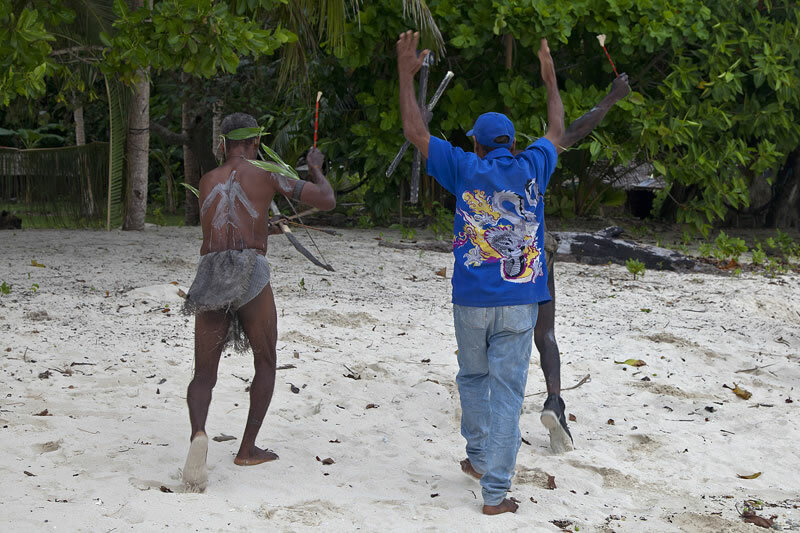 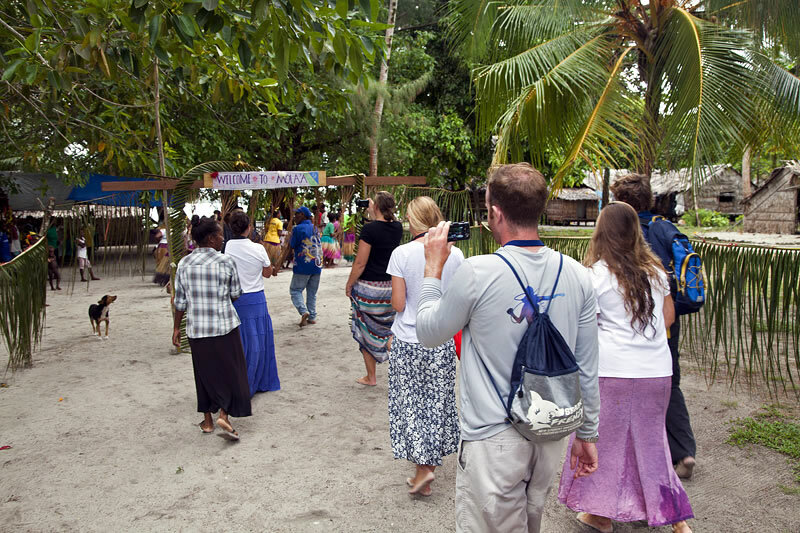 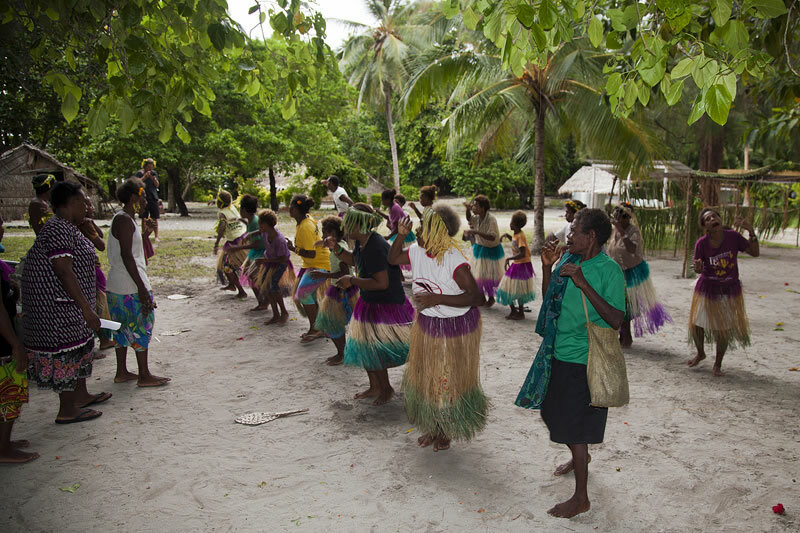 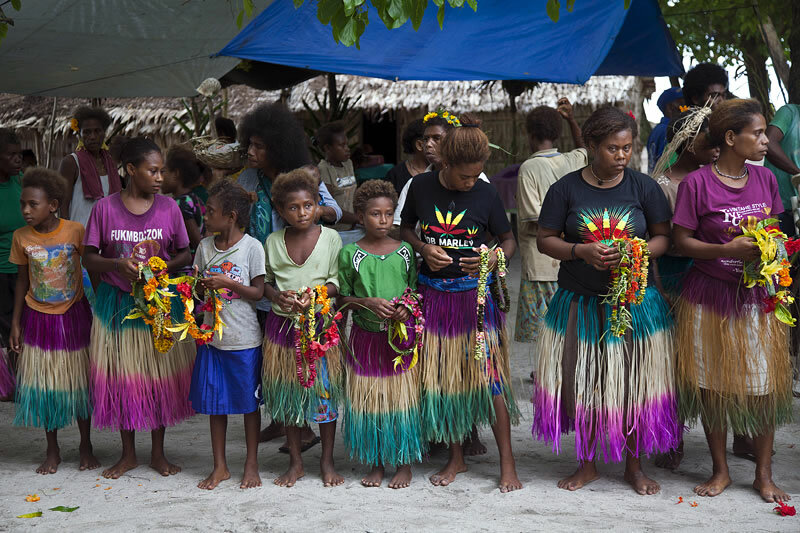 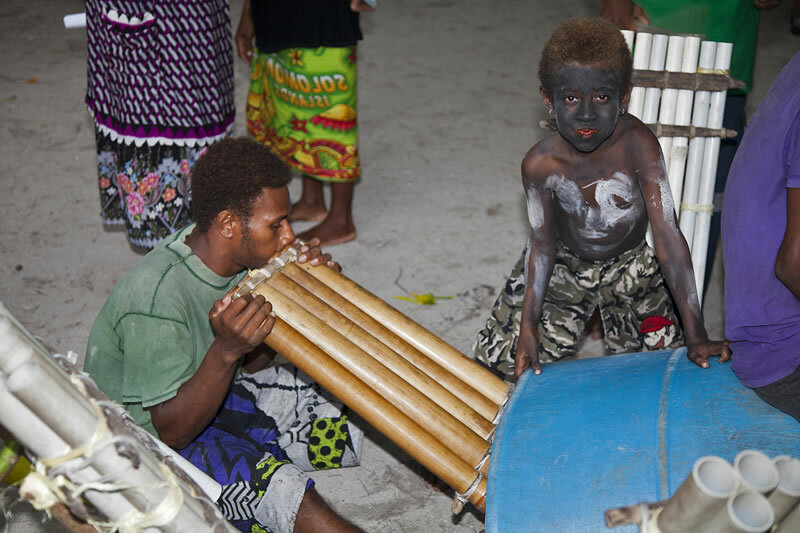 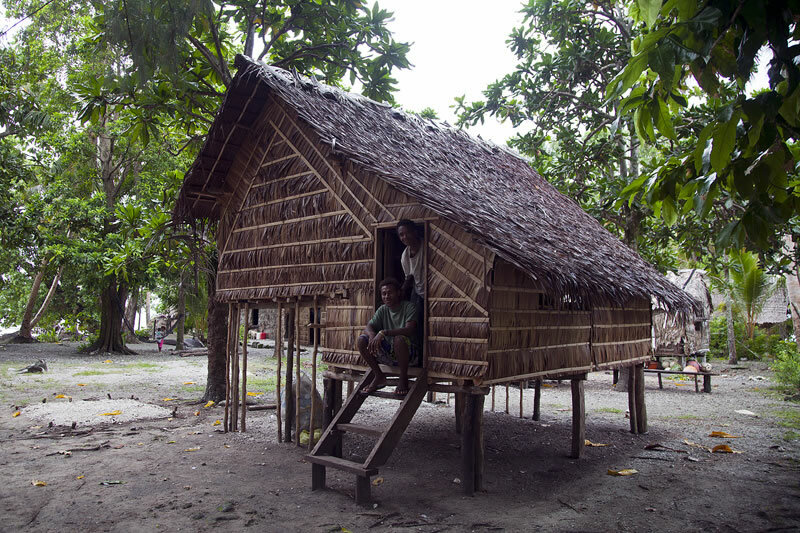 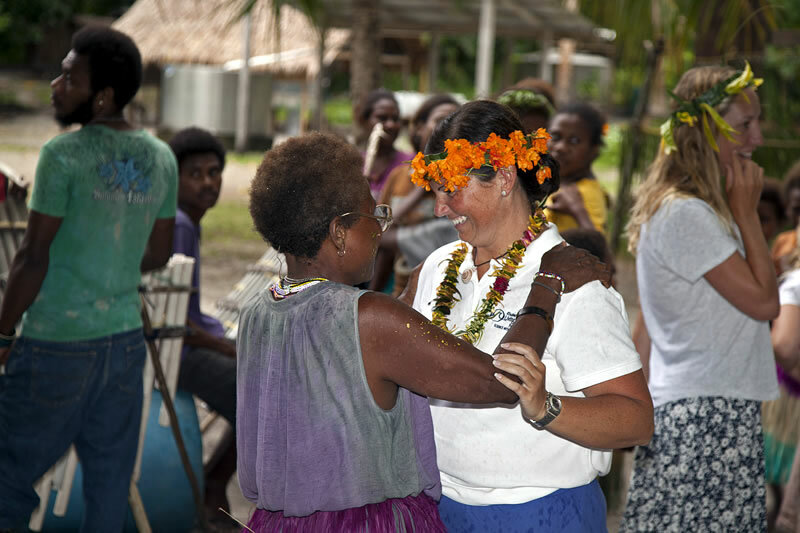 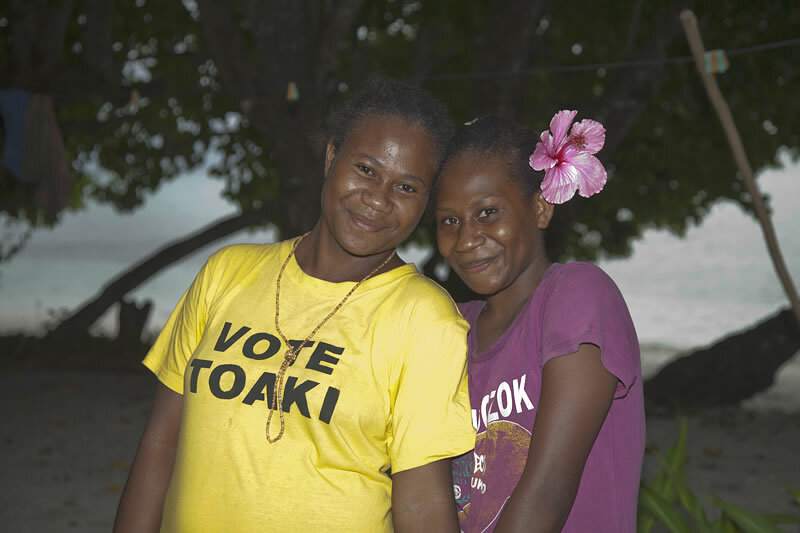 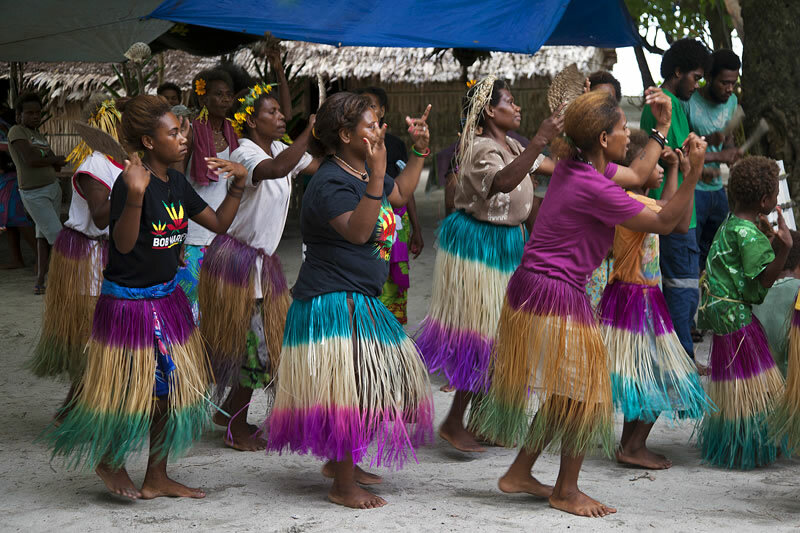 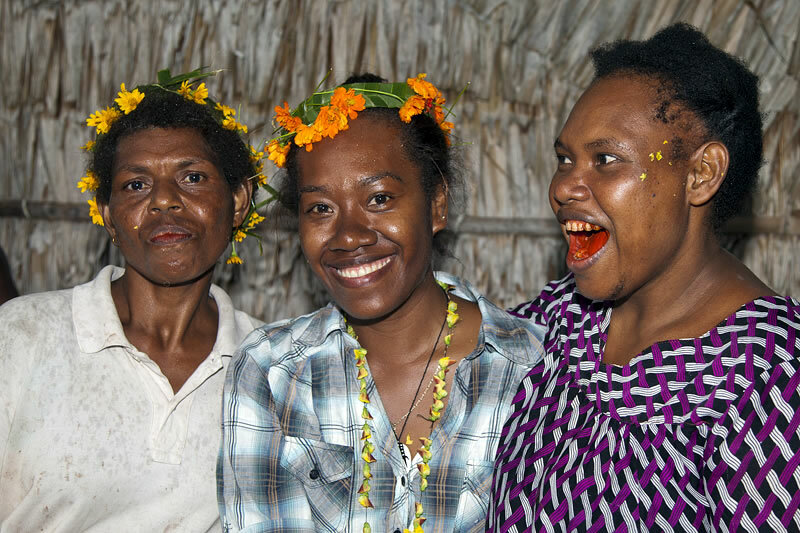 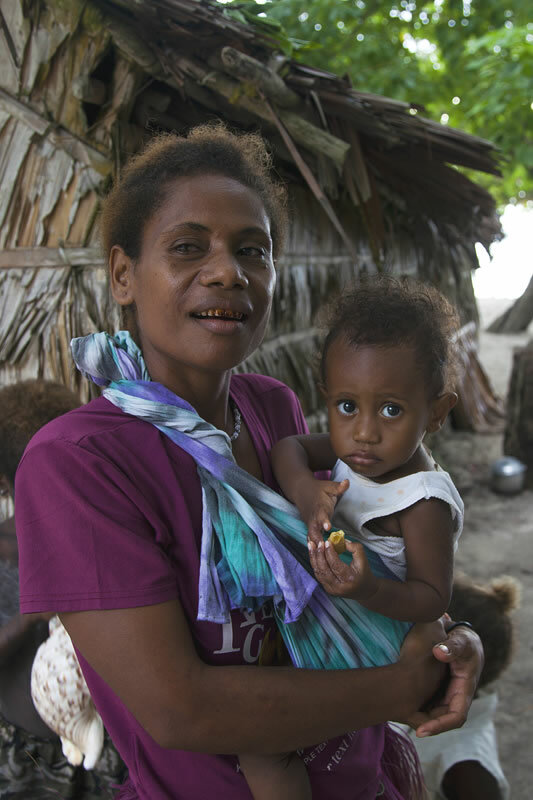 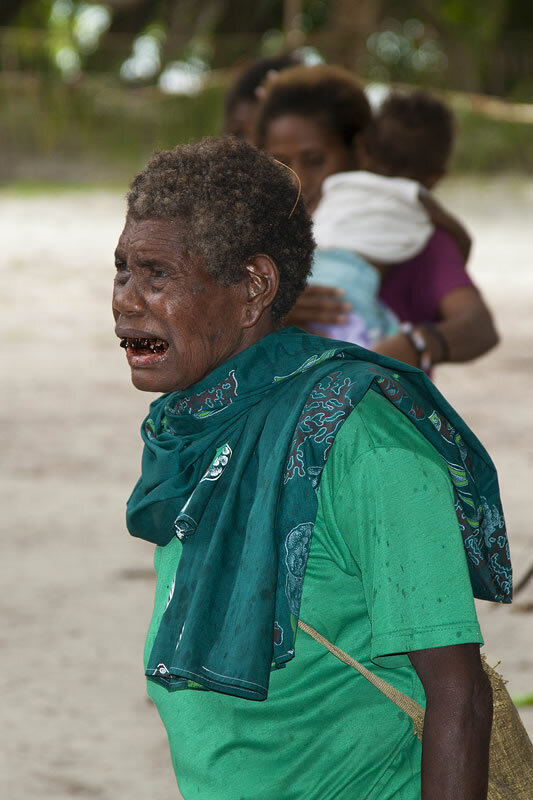 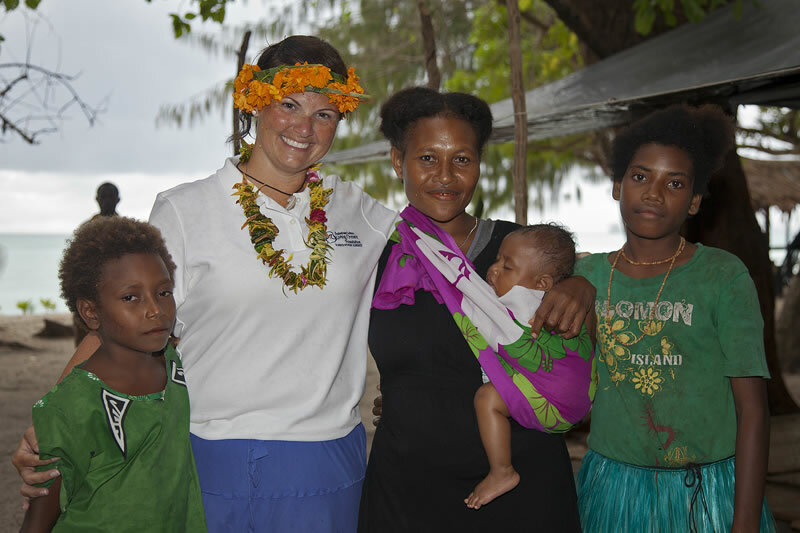 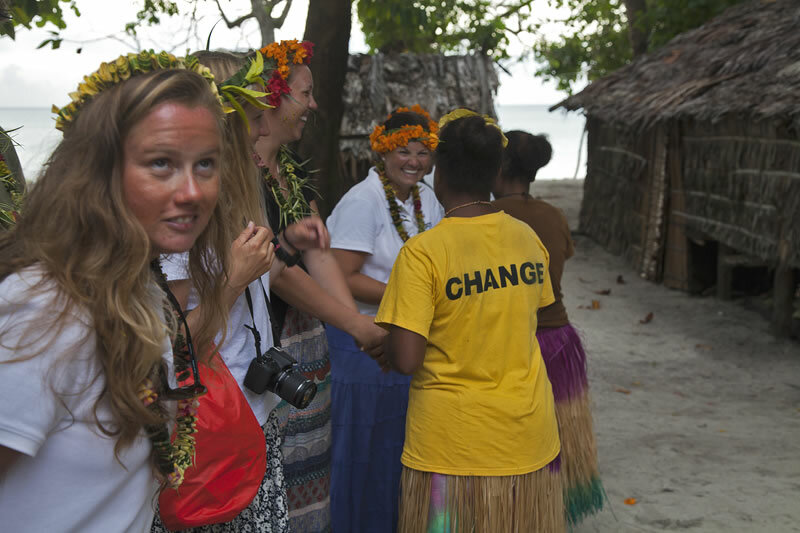 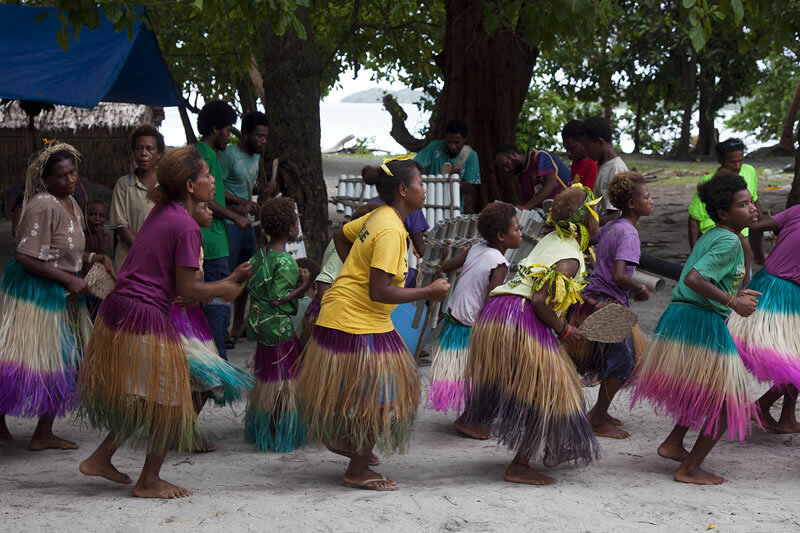 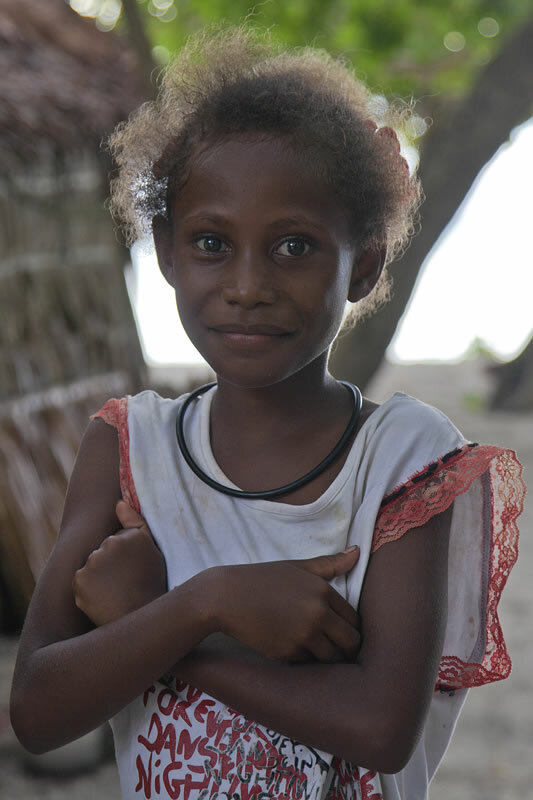 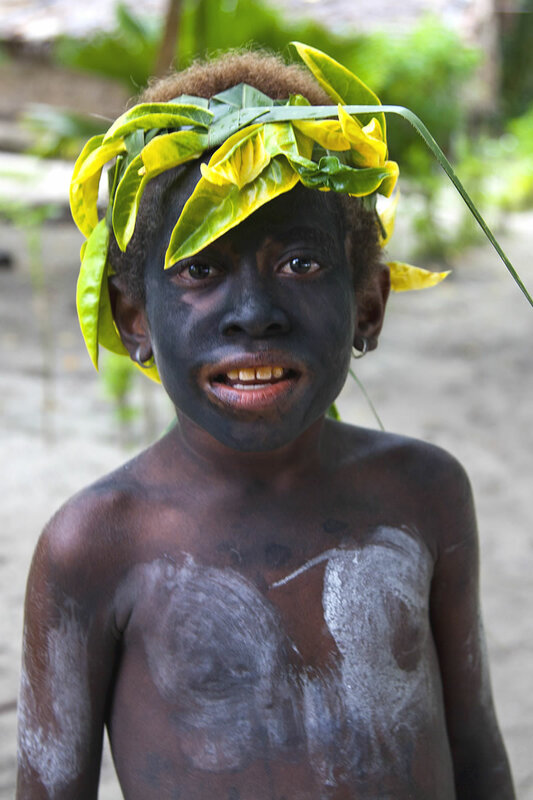 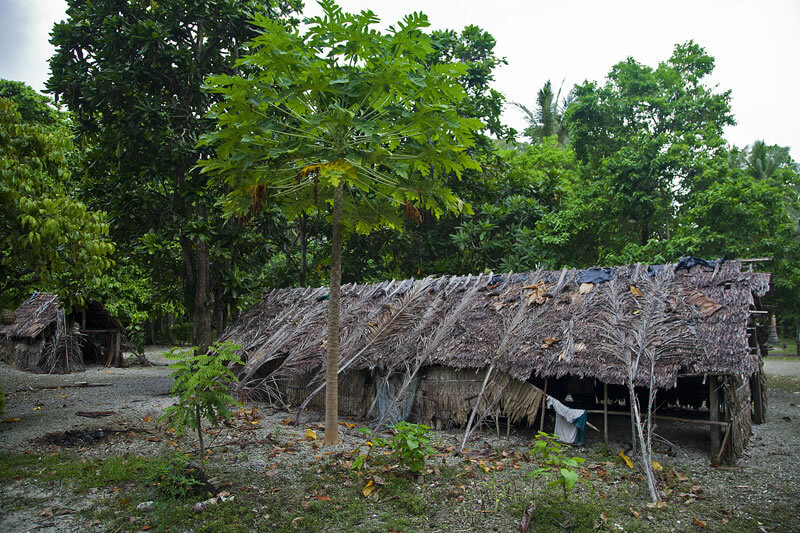 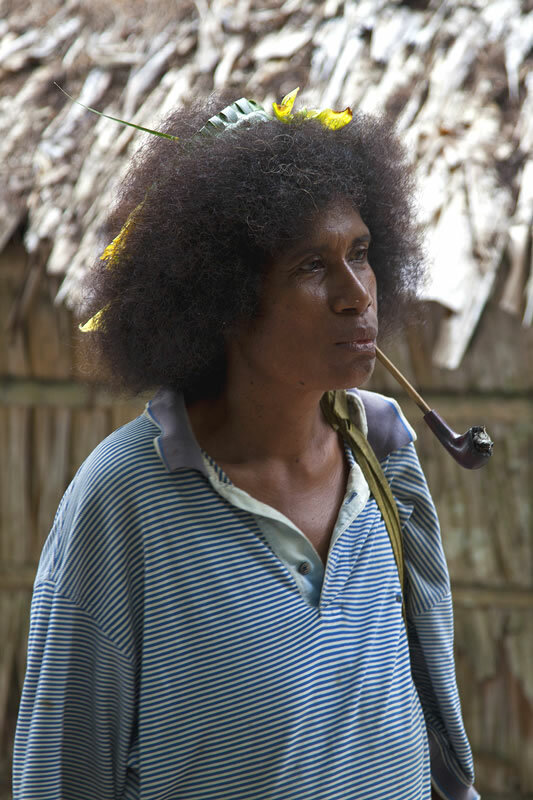 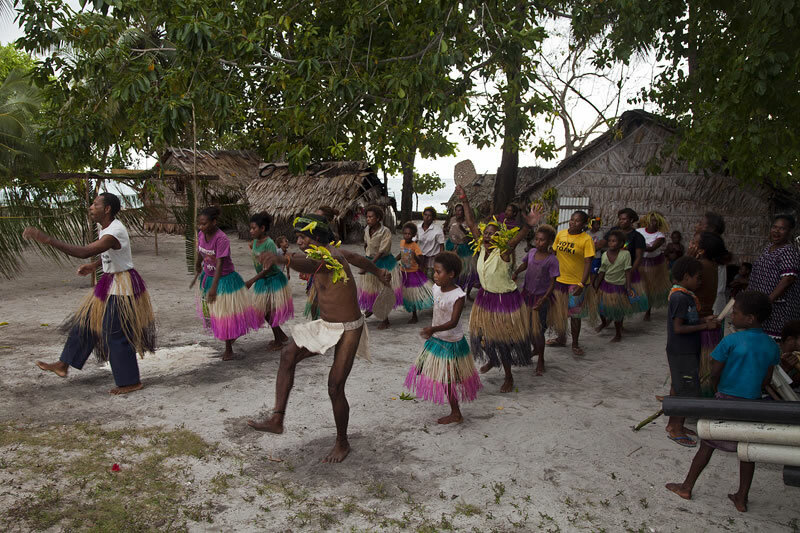 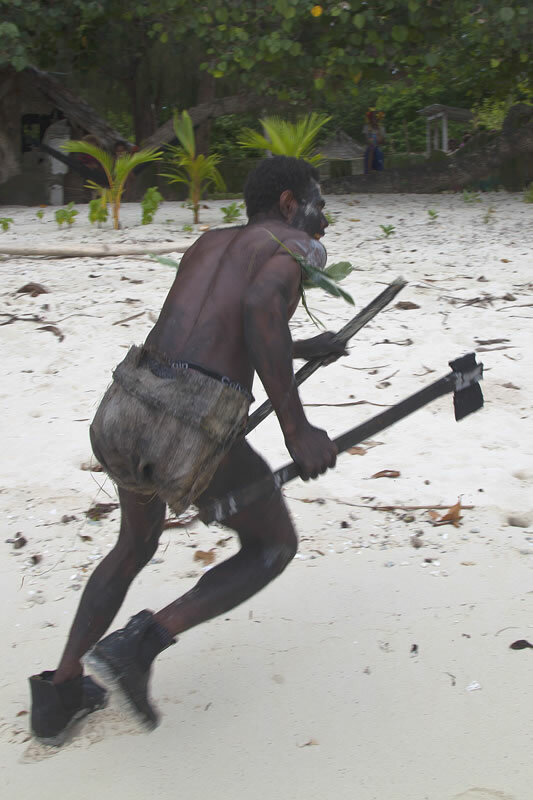 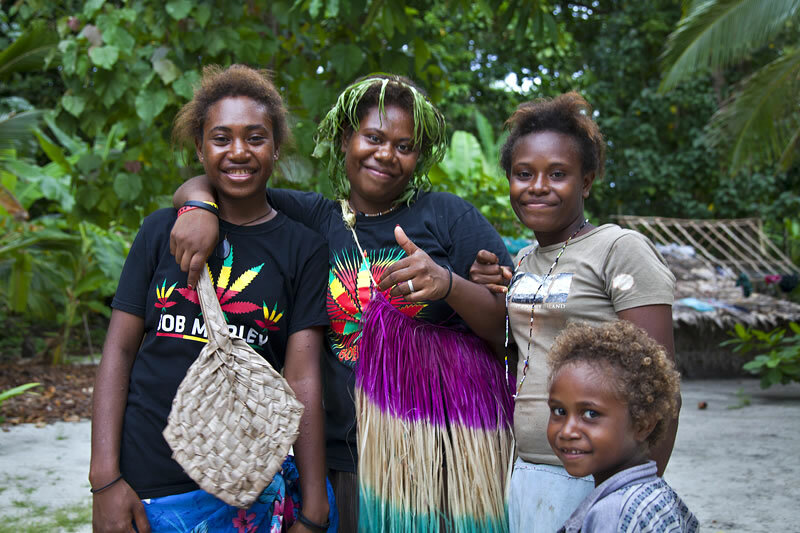 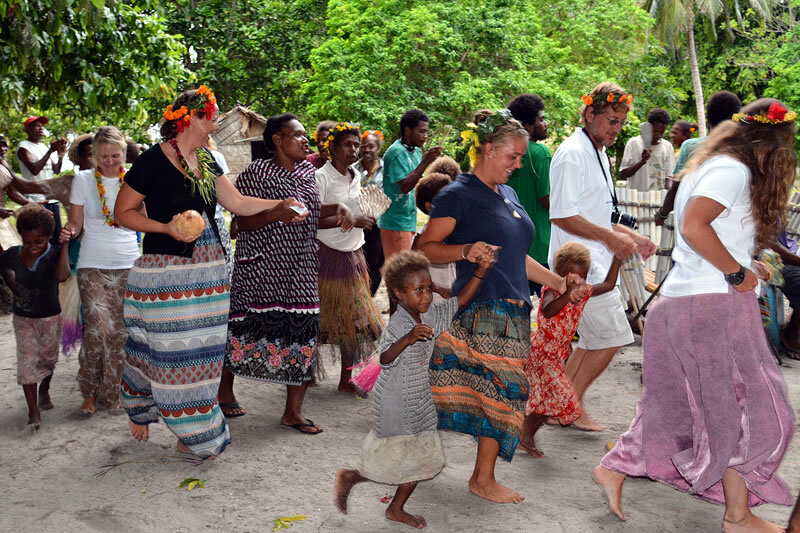 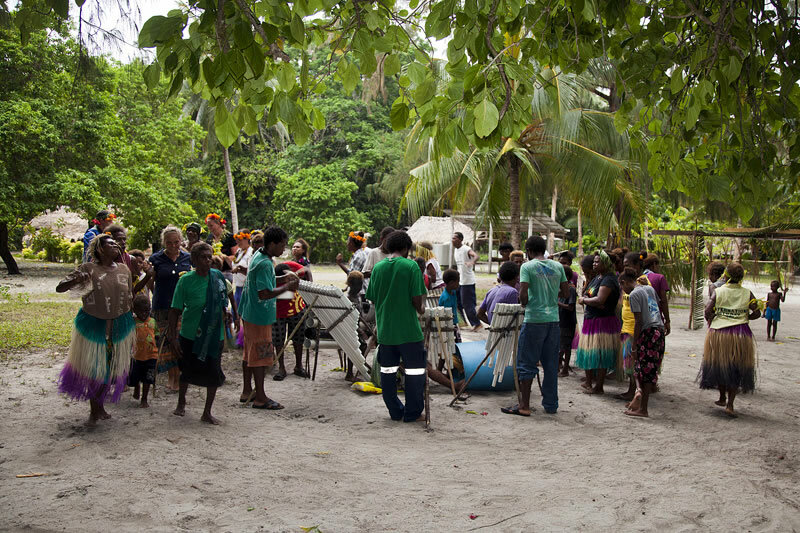 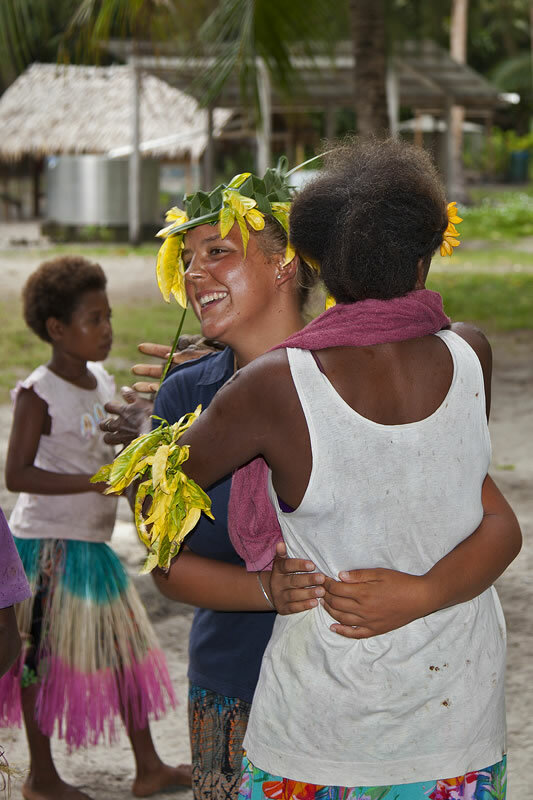 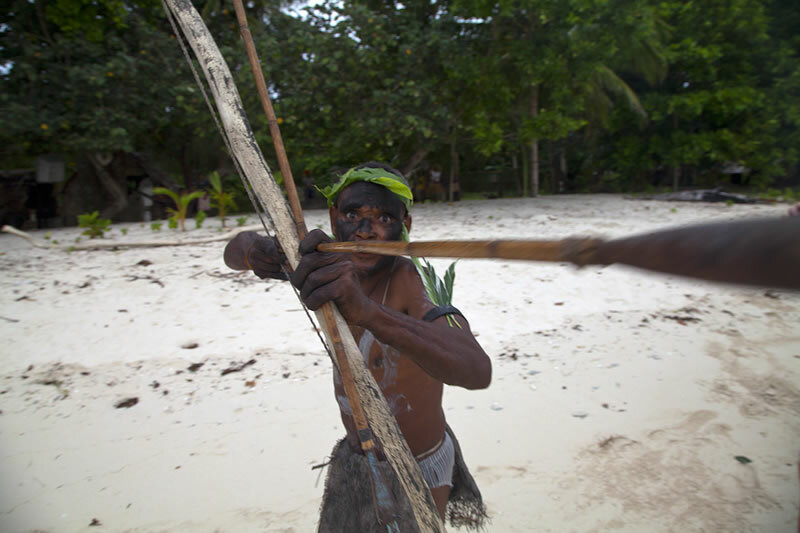 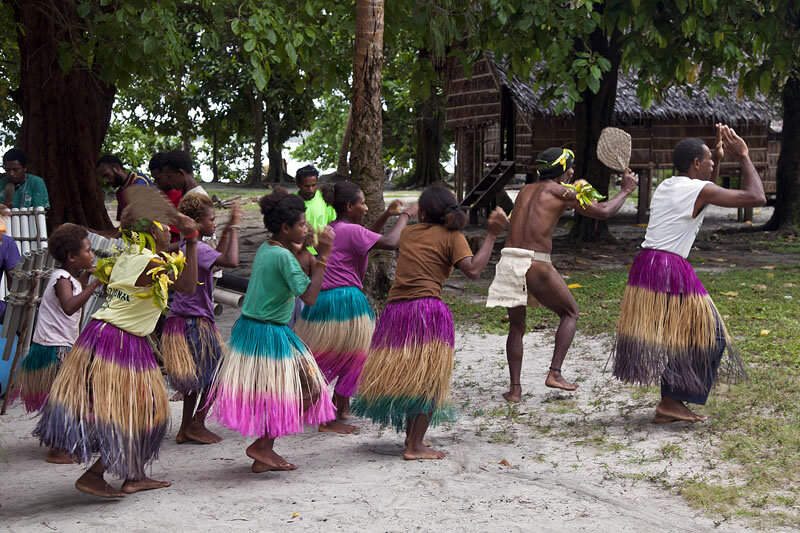 Papua etpisoni. 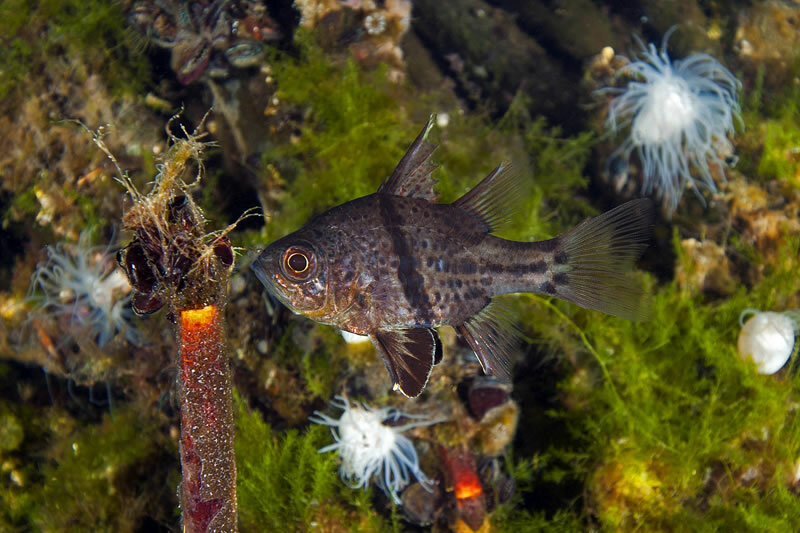 One of two fish species in the lake, the Orbicular Cardinalfish (Sphaeramia orbicularis) are curious and unafraid. 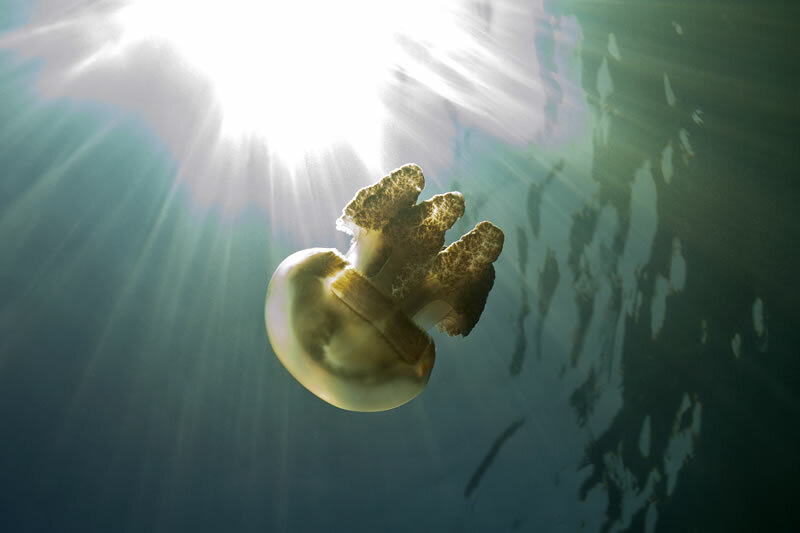 Solar powered Golden Jellyfish with its energy source. 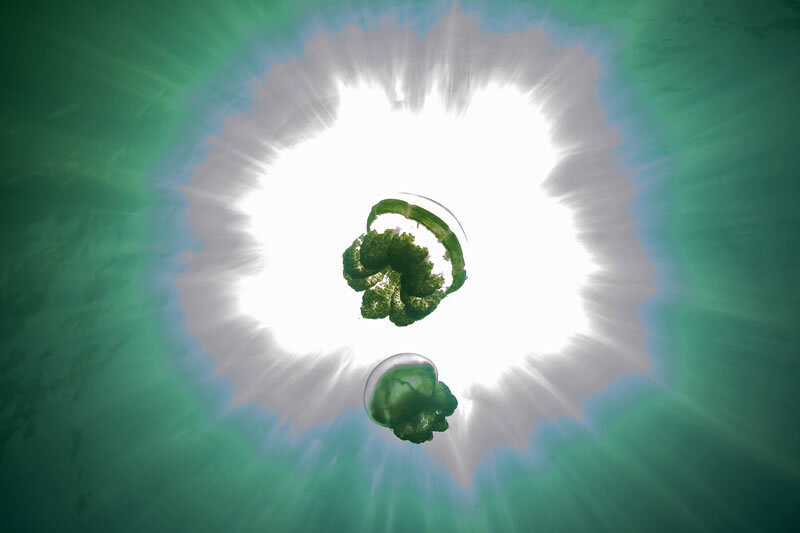 Sunlight streans down through the trees at the edge of the lake. 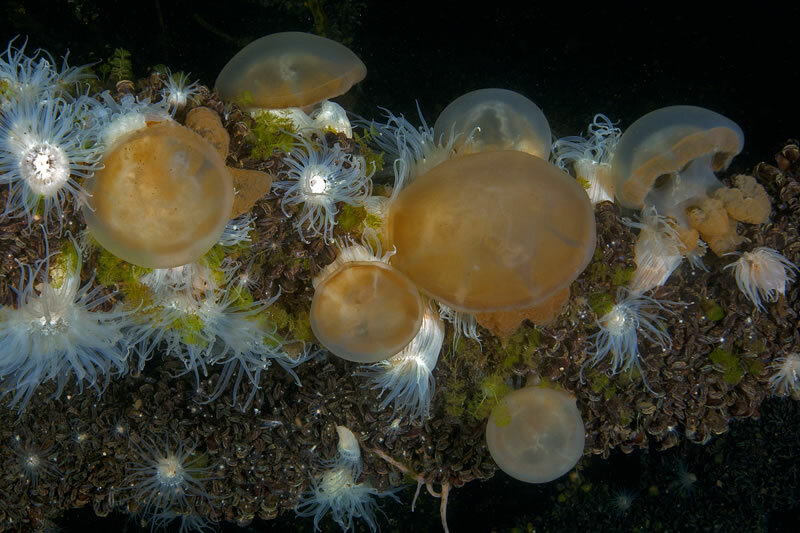 White Sea Anemone (Entacmaea medusivora) is the only predator of the jellyfish. 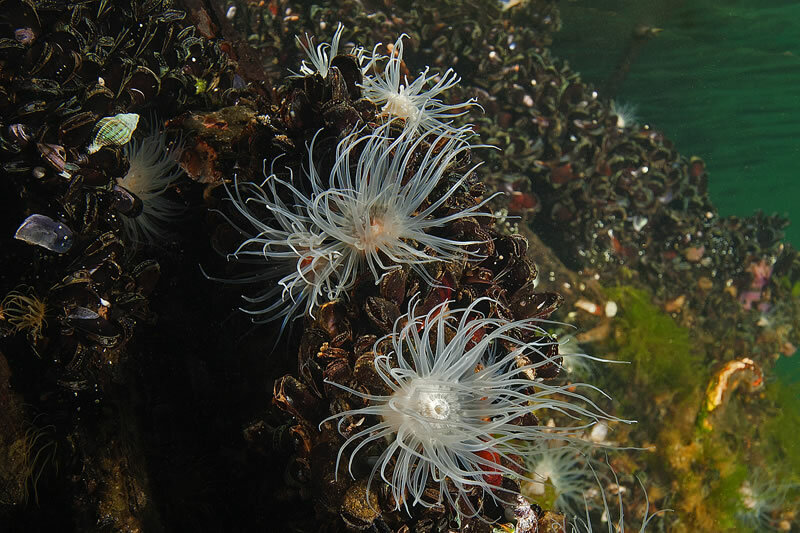 White Sea Anemone (Entacmaea medusivora) on a downed tree trunk are able to reach their prey which avoid the dark edges of the lake. 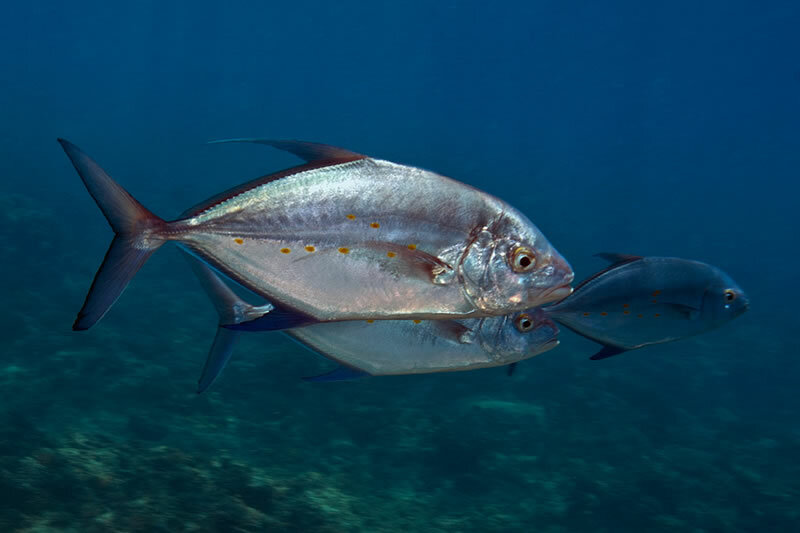 Pair of large Bluefin Trevally (Caranx melampygus) come by for a close inspection. 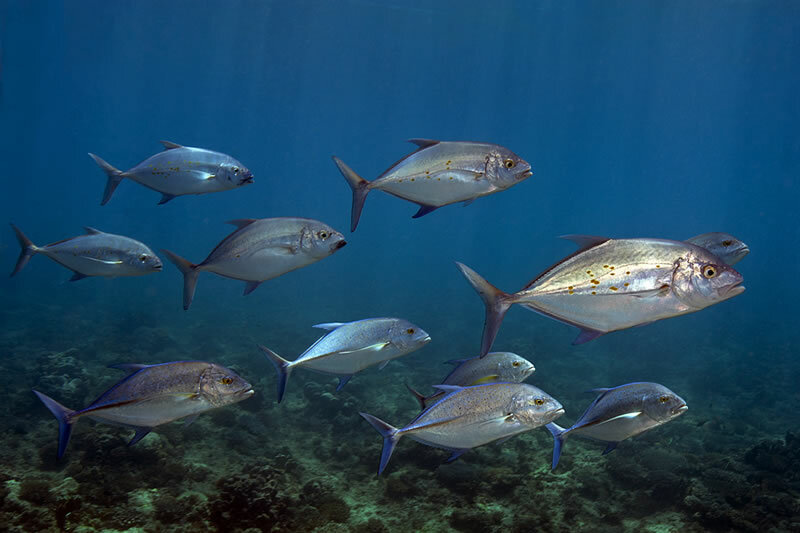 Mixed school of Bluefin Trevally (Caranx melampygus) and Yellow-spotted Trevally (Carangoides orthogrammus). 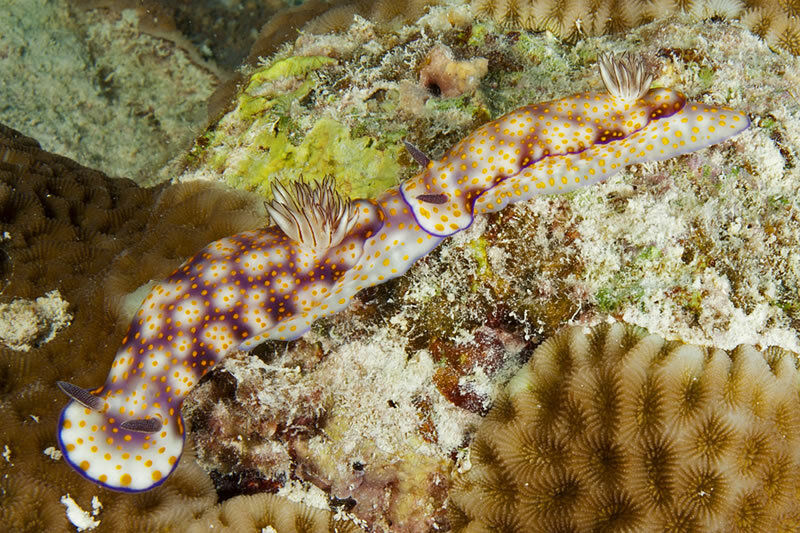 Pair of Beautiful Risbecia (Risbecia pulchella) displaying trailing behavior. 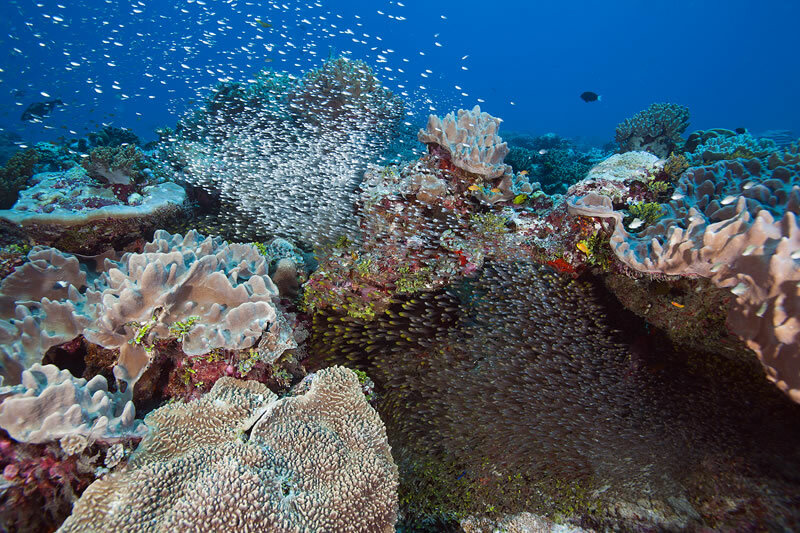 Cloud of Bluestreak Fusiler (Pterocaesio tile) swarms over the reef. 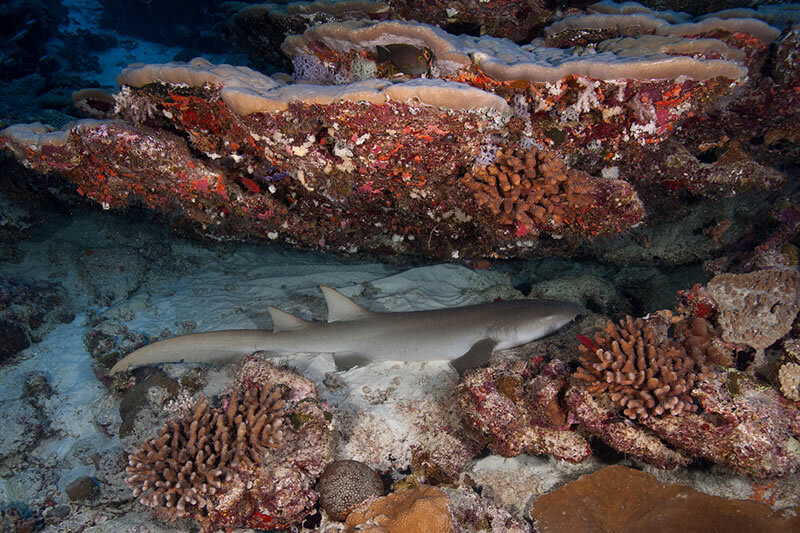 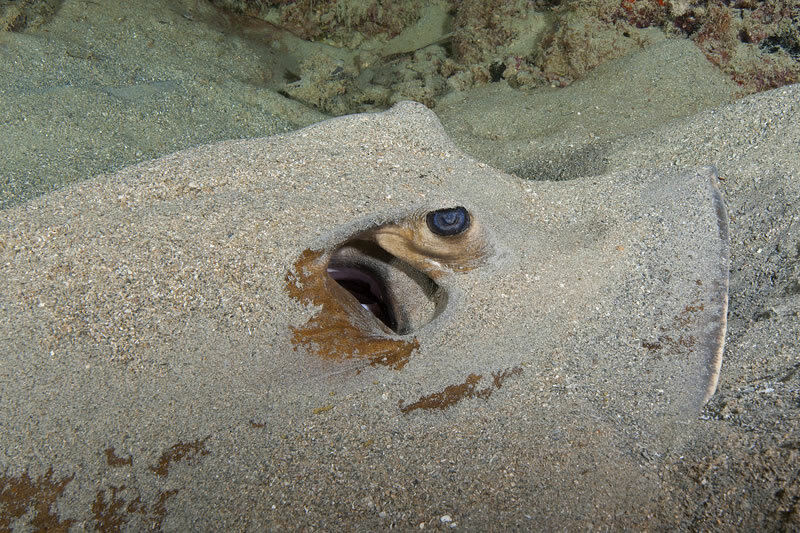 Tawny Nurse Shark (Nebrius ferrugineus) resting in a sand channel. 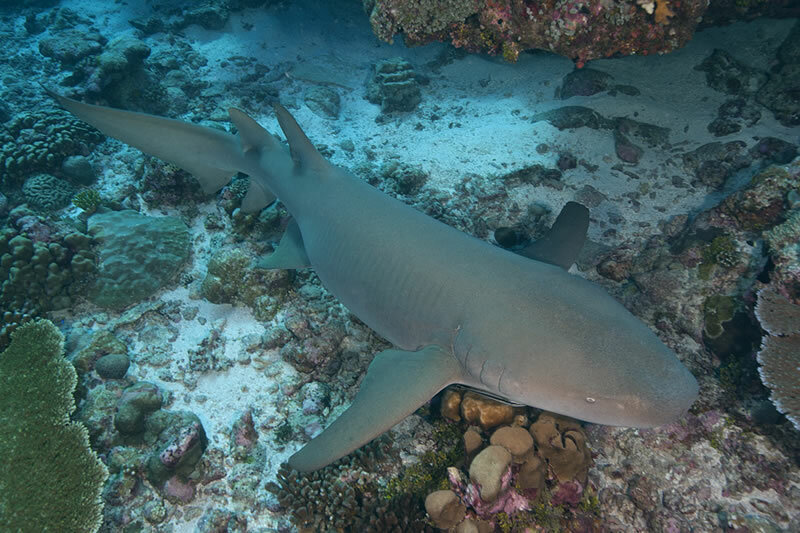 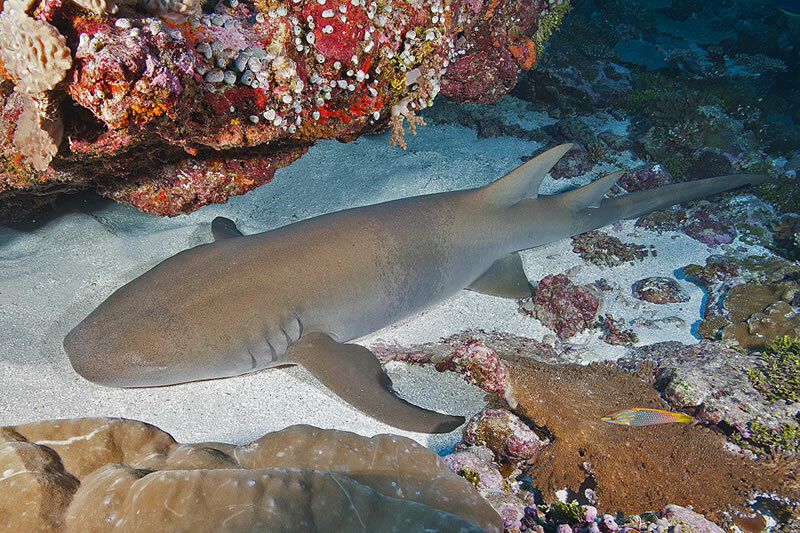 Tawny Nurse Shark (Nebrius ferrugineus). 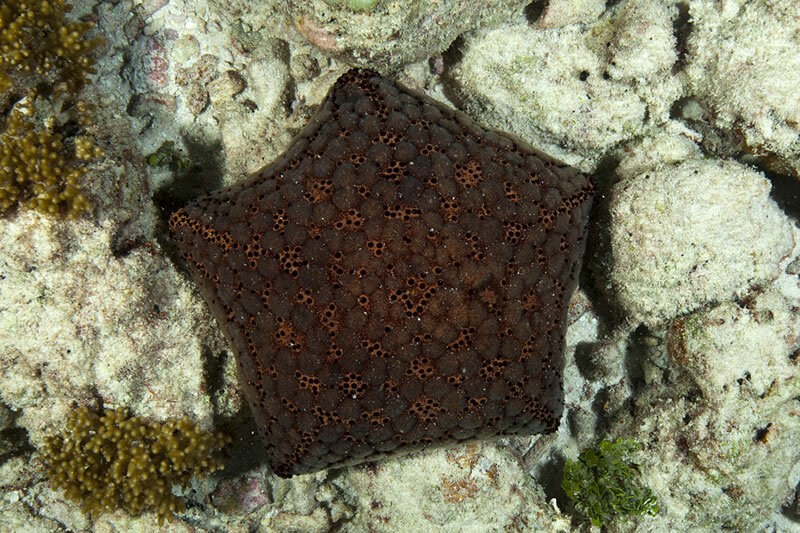 Cushion Stars (Culcita sp.) 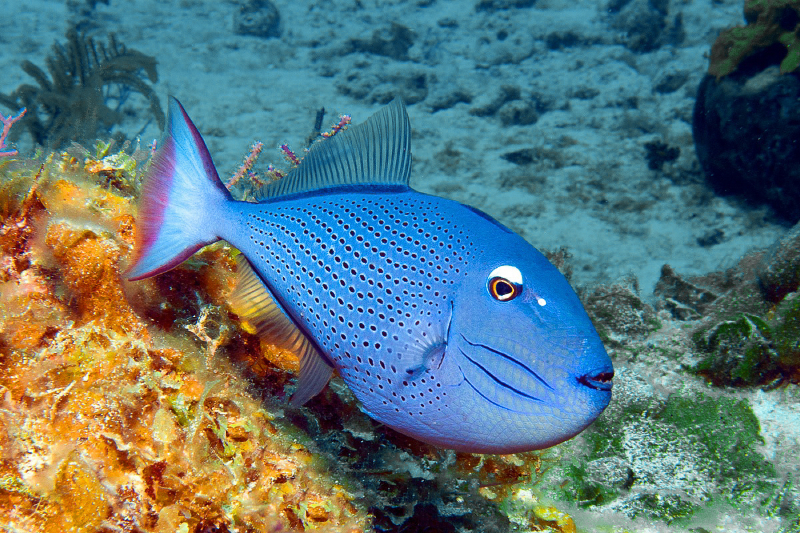 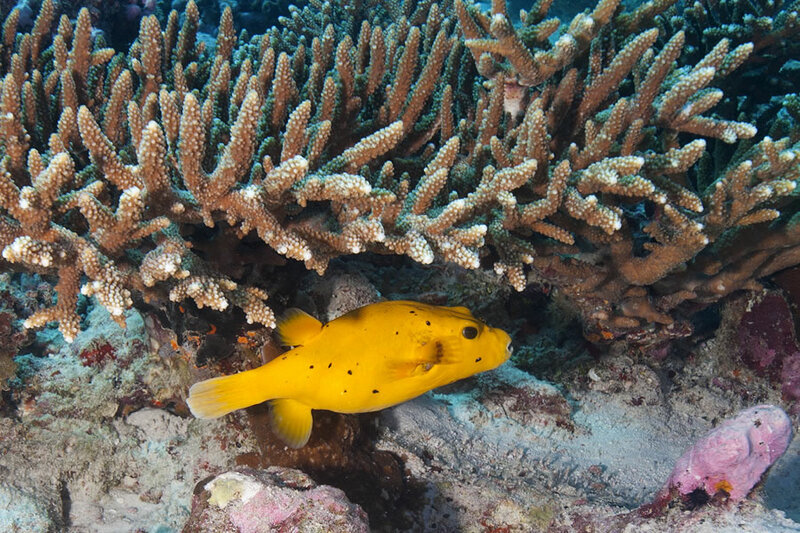 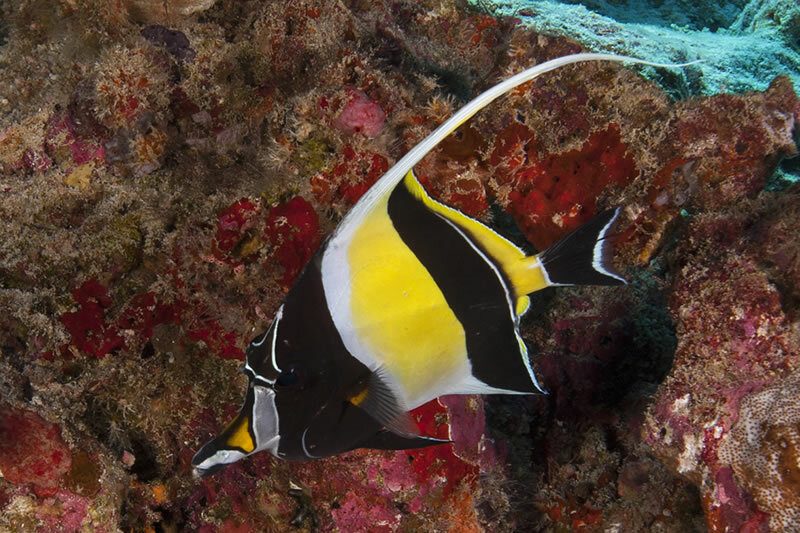 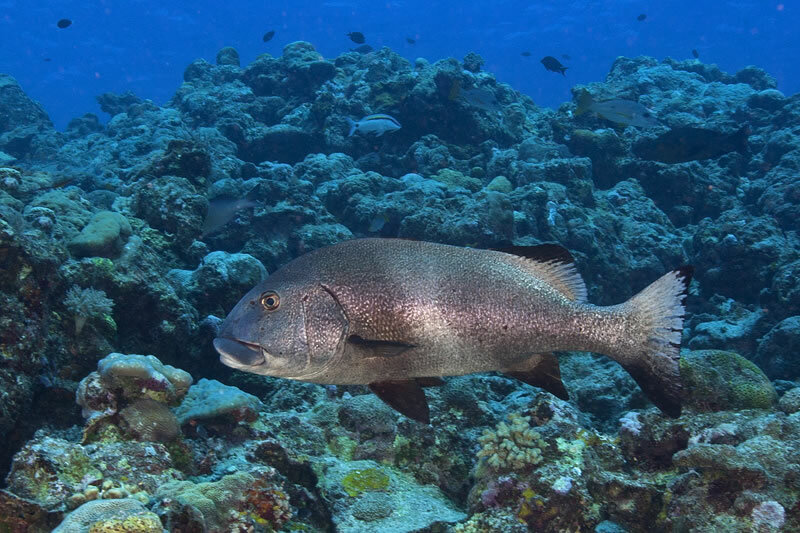 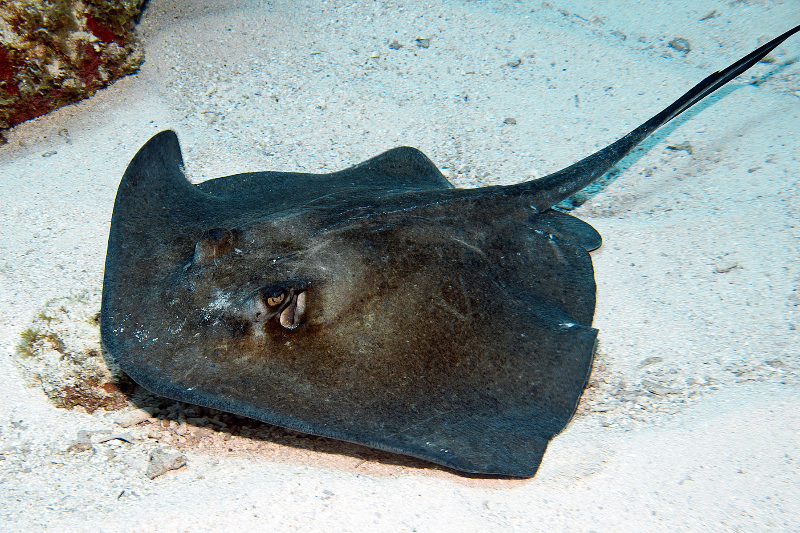 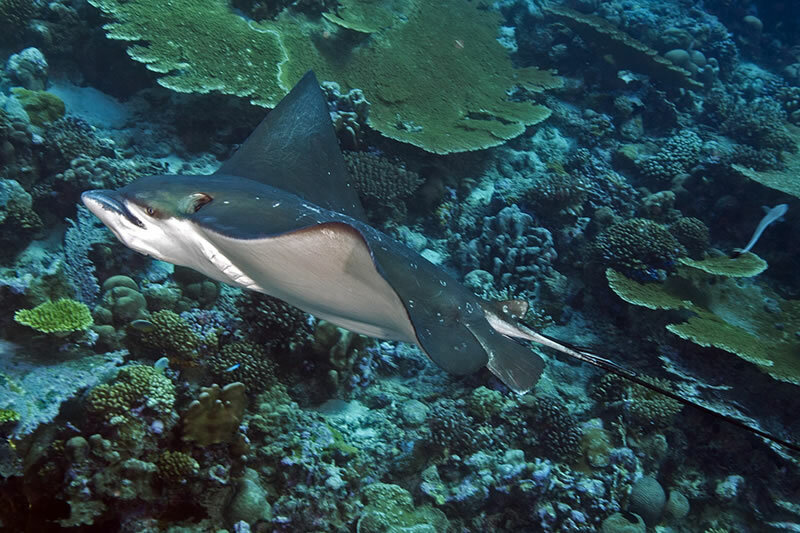 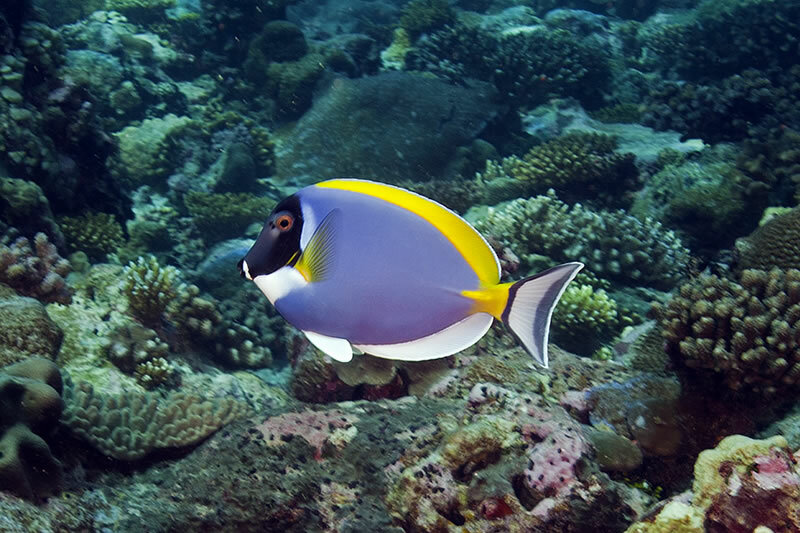 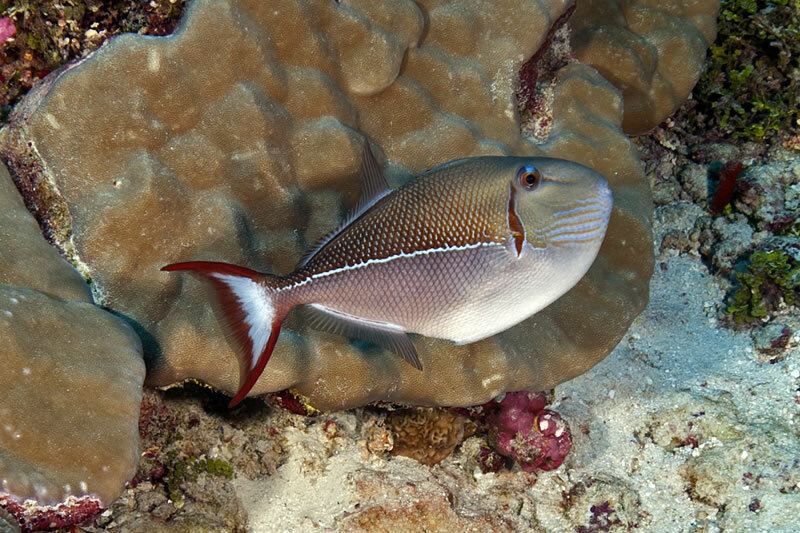 are very common on the reef flat. 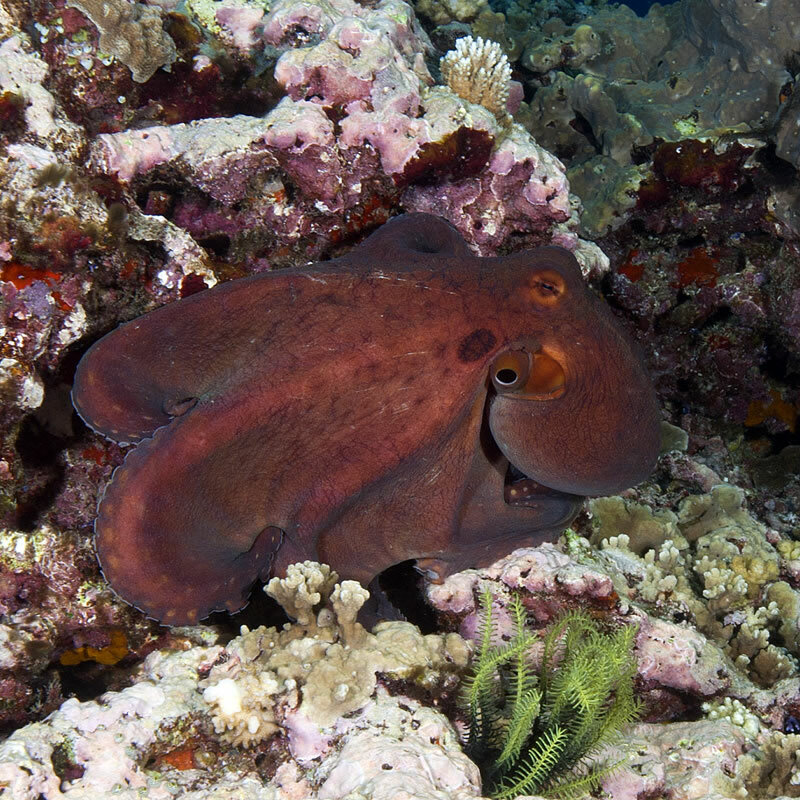 Day Octopus (Octopus cyanea) have been very common in Chagos with several spotted on nearly every dive. 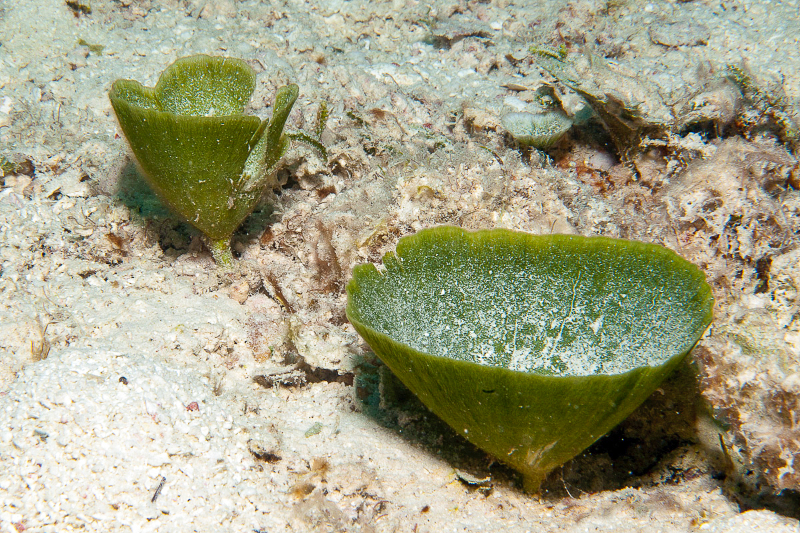 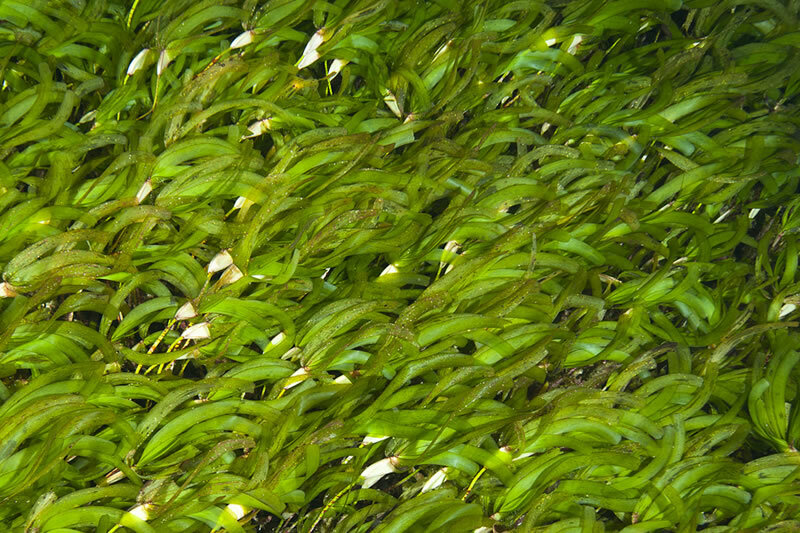 Dense beds of seagrass were seen on several dives around Egmont Islands. 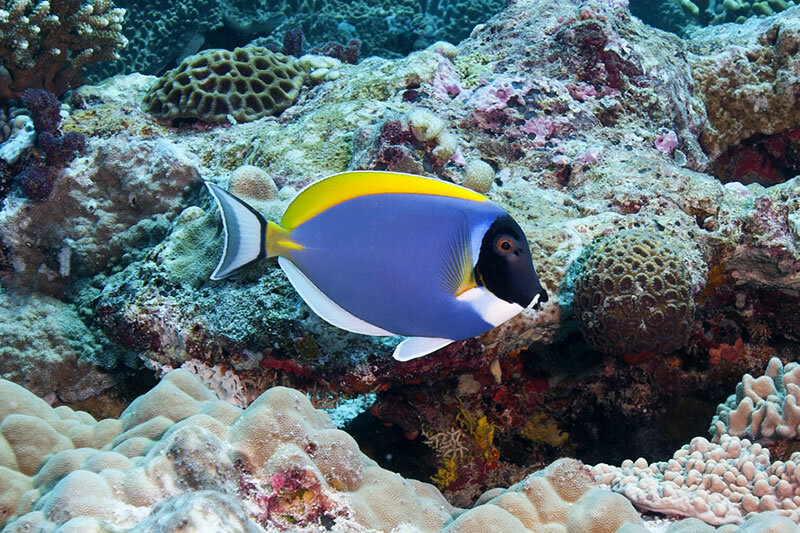 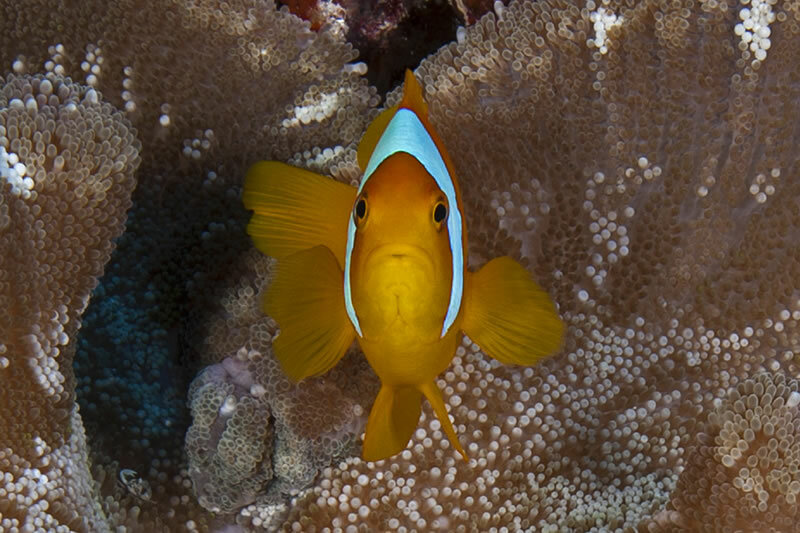 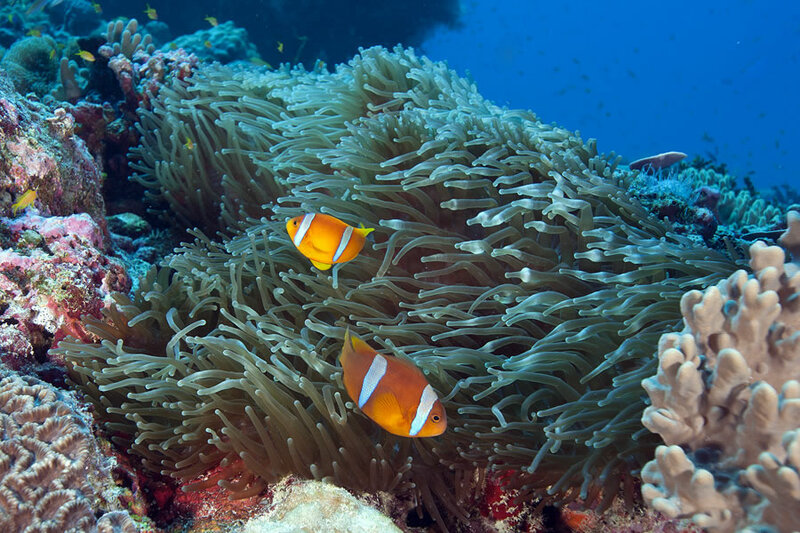 Two-banded Anemonefish (Amphiprion bicinctus) found only in the Red Sea and Chagos Archipelago. 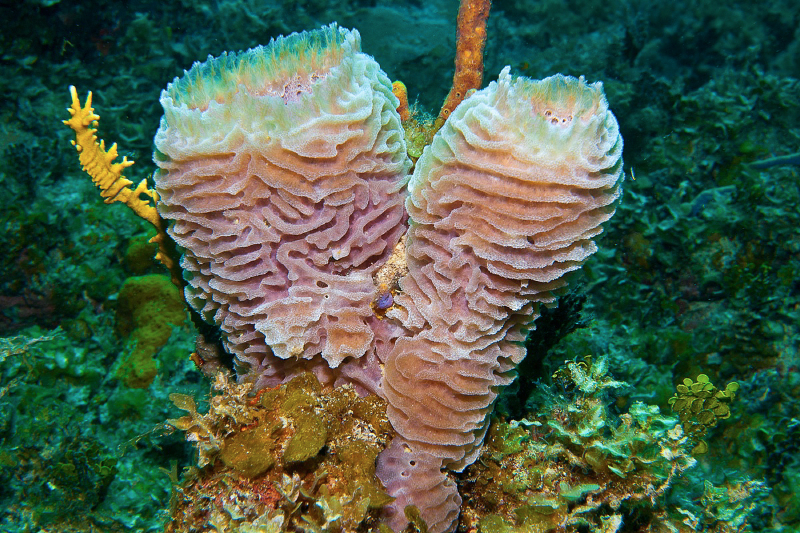 Entwined pair of leathery sponges. 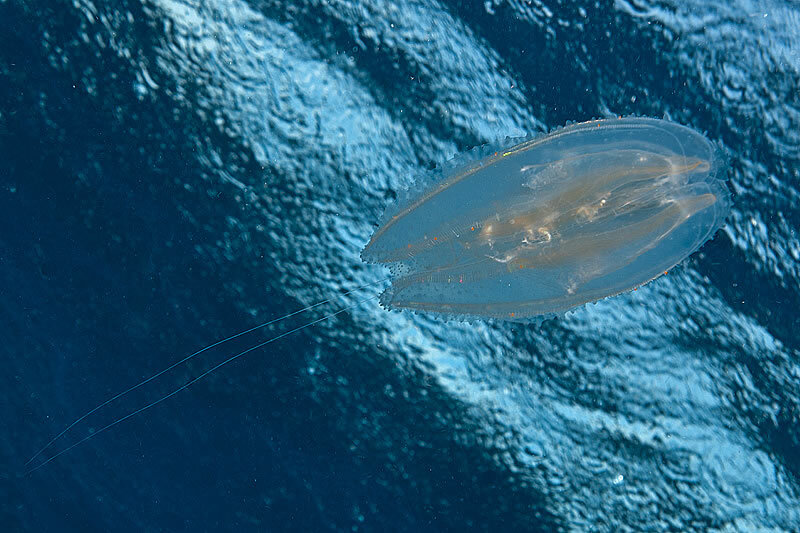 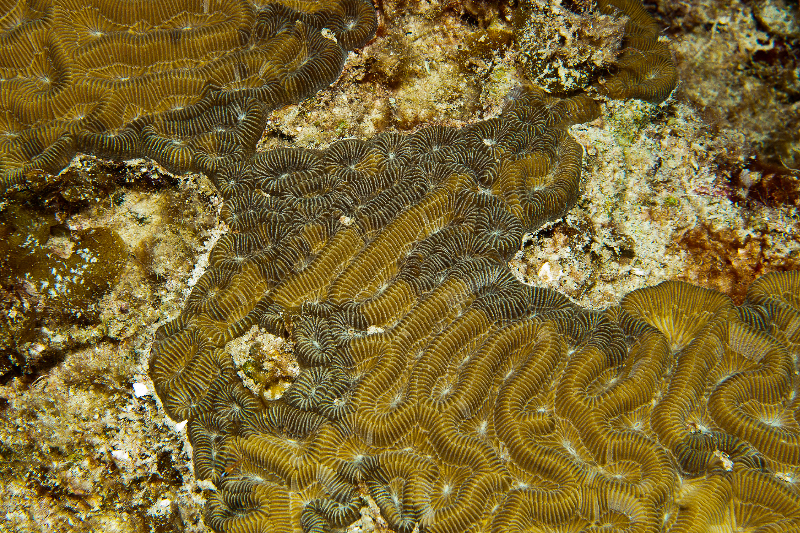 Spotted ctenphore floating near the surface. 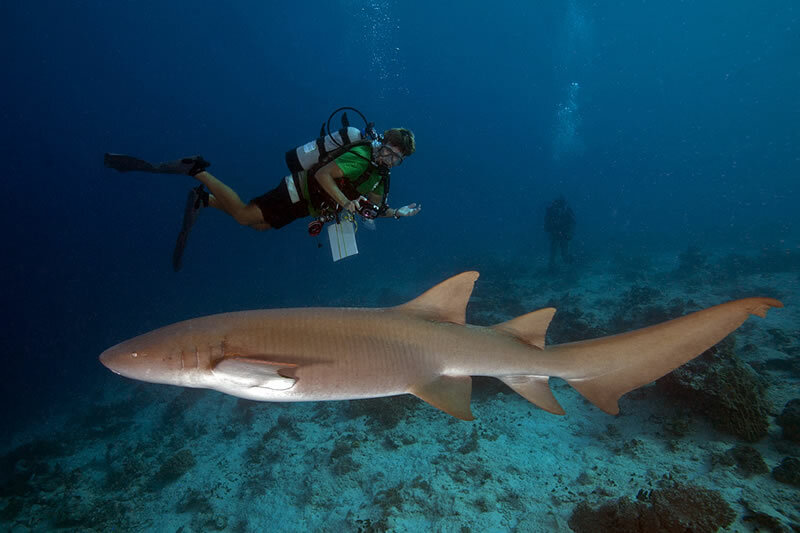 Curious Tawny Nurse Shark (Nebrius ferrugineus) swims by several scientists and gives Anderson Mayfield a close pass. 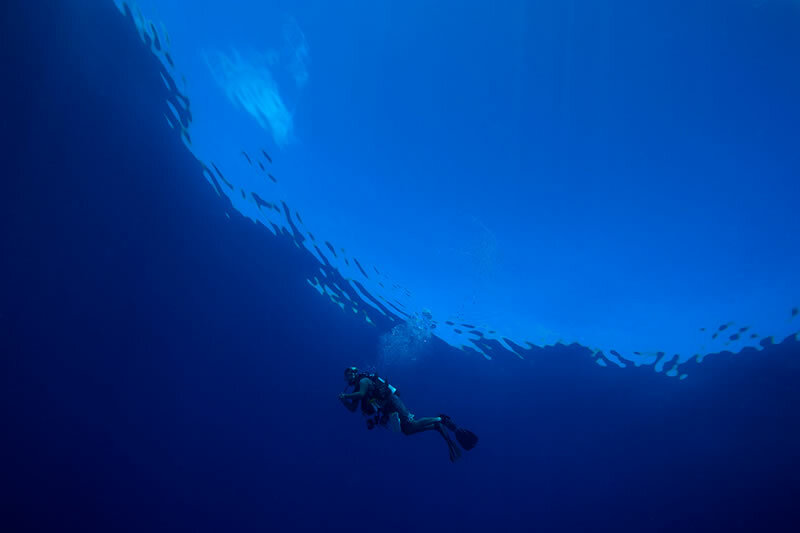 View of sand waves far below while on a safety stop at the end of a dive. 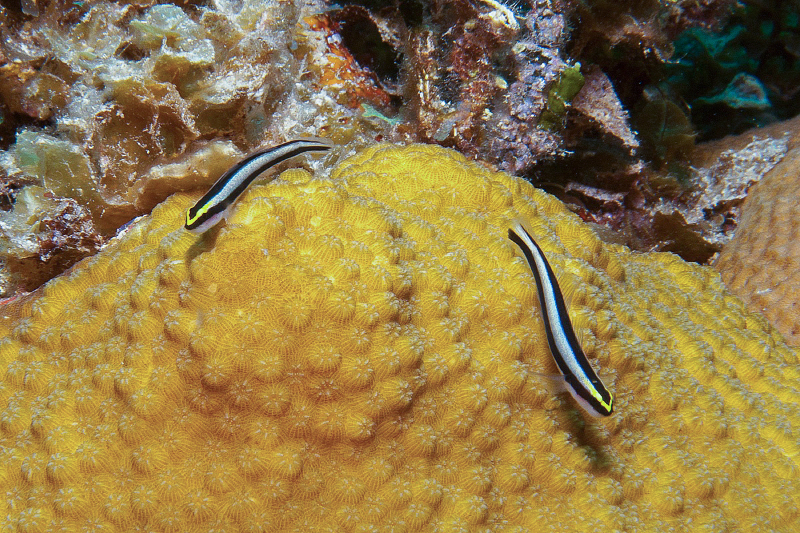 Polarized school of Black-nosed Cardinalfish (Rhabdamia cypselurus) and Golden Sweeper (Parapriacanthus ransonneti). 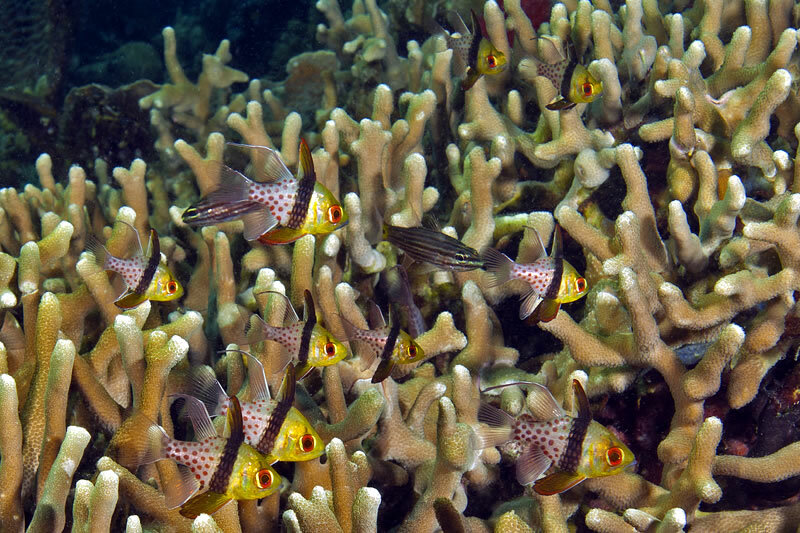 Scattered school of Black-nosed Cardinalfish (Rhabdamia cypselurus) and Golden Sweeper (Parapriacanthus ransonneti). 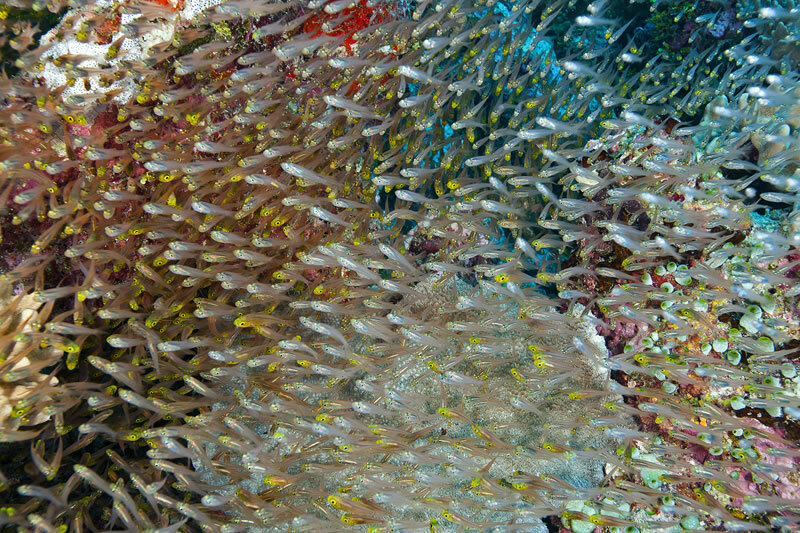 Dense cloud of Black-nosed Cardinalfish (Rhabdamia cypselurus) swarm out from under ledge. 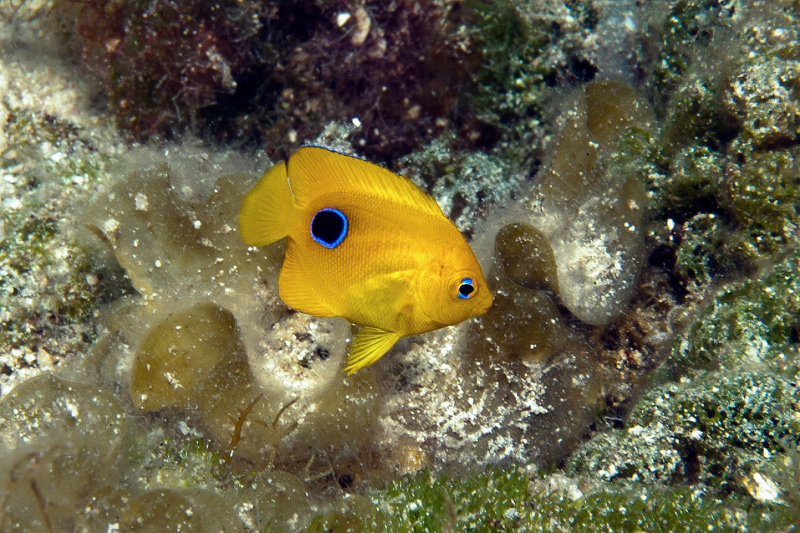 Juvenile Emperor Angelfisn (Pomacanthus imperator). 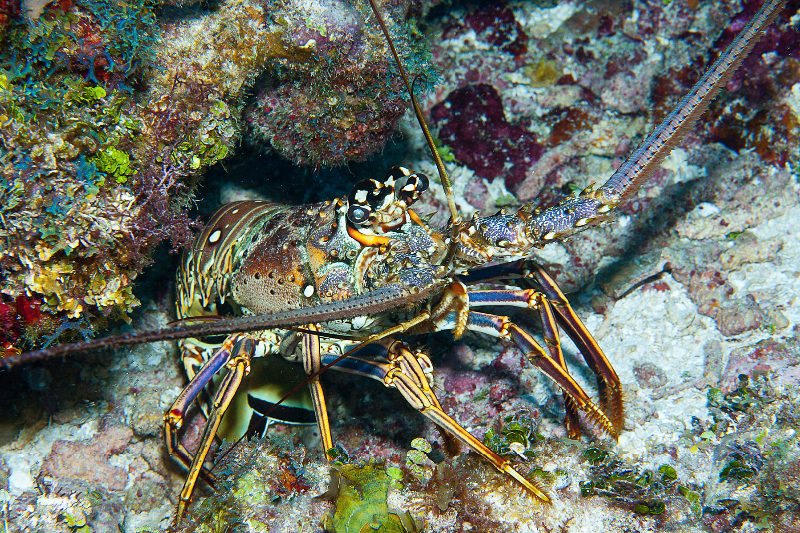 Painted Spiny Lobster (Panulirus versicolor) comes out from its hiding spot under a ledge. 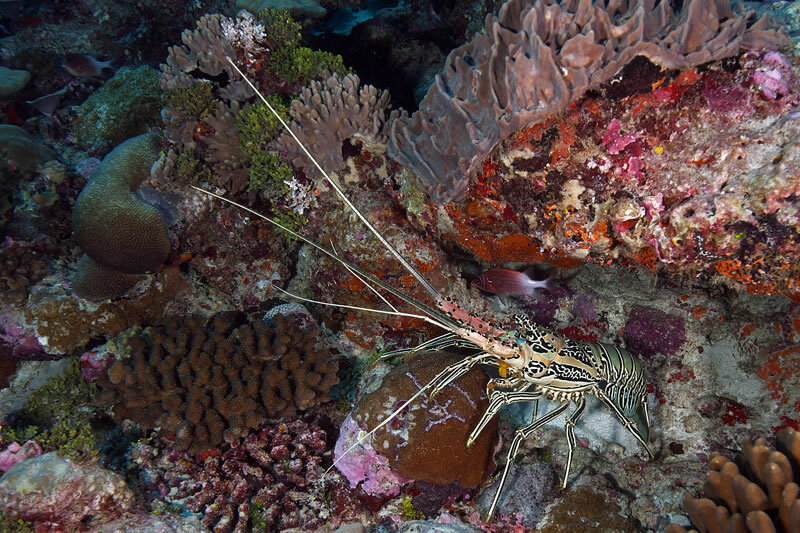 Anderson Mayfield photographs the curious Painted Spiny Lobster (Panulirus versicolor). 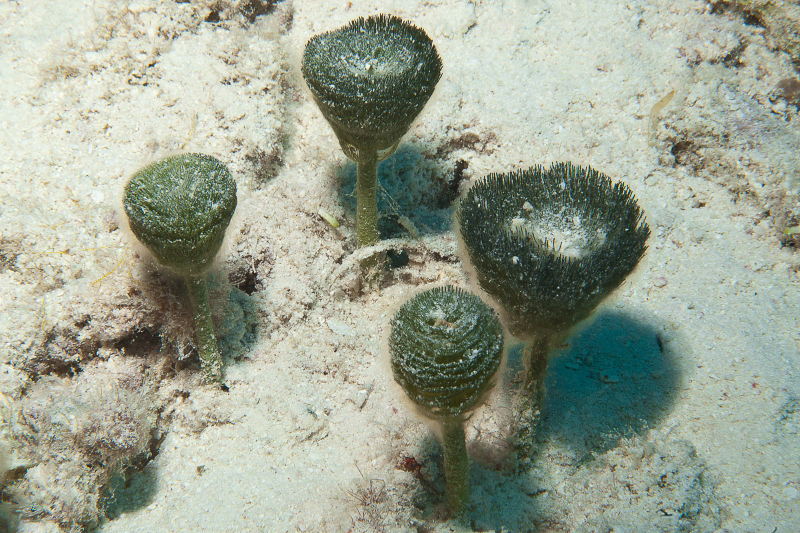 Sailor's Eyeball (Valonia ventricosa) algae is a common site but not usually seen in the asexual budding stage. 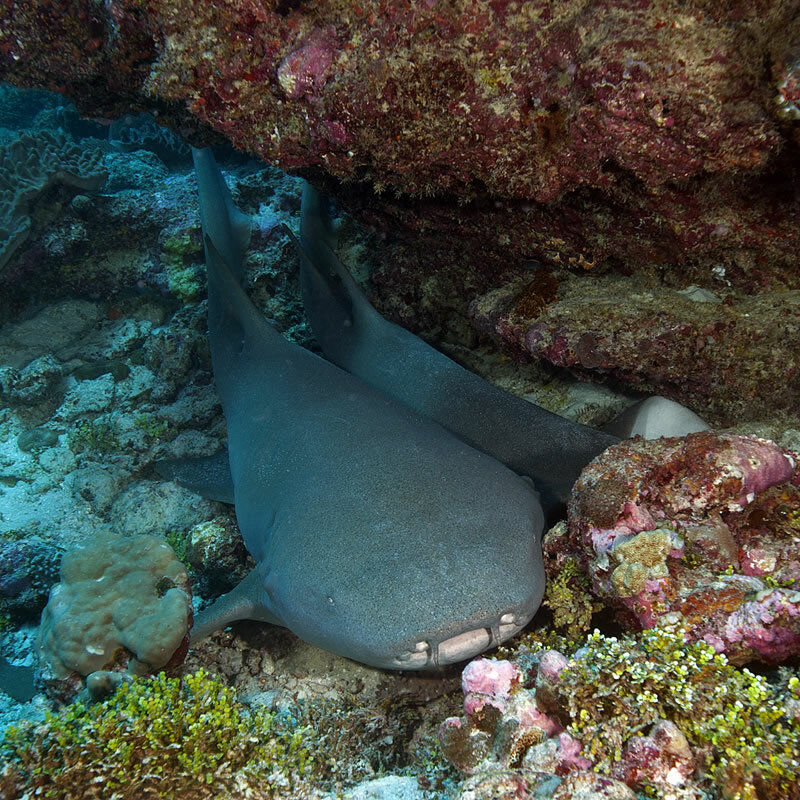 Pair of Tawny Nurse Sharks (Nebrius ferrugineus) getting cozy under an overhang. 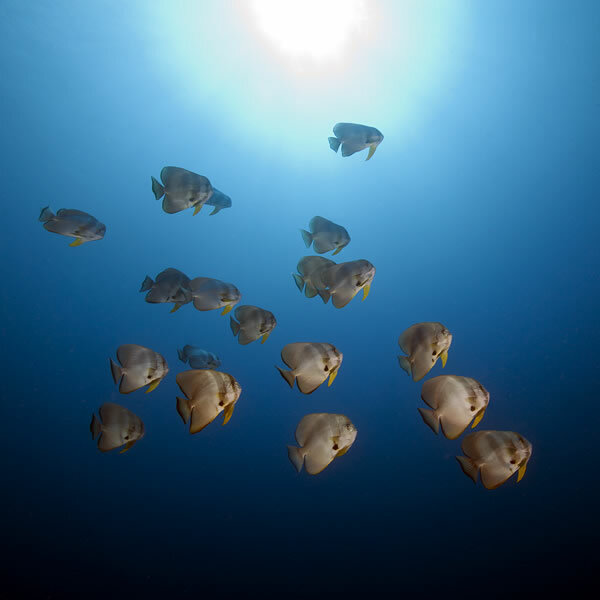 School of Yellowmask Surgeonfish (Acanthurus mata) schools above a sloping drop-off. 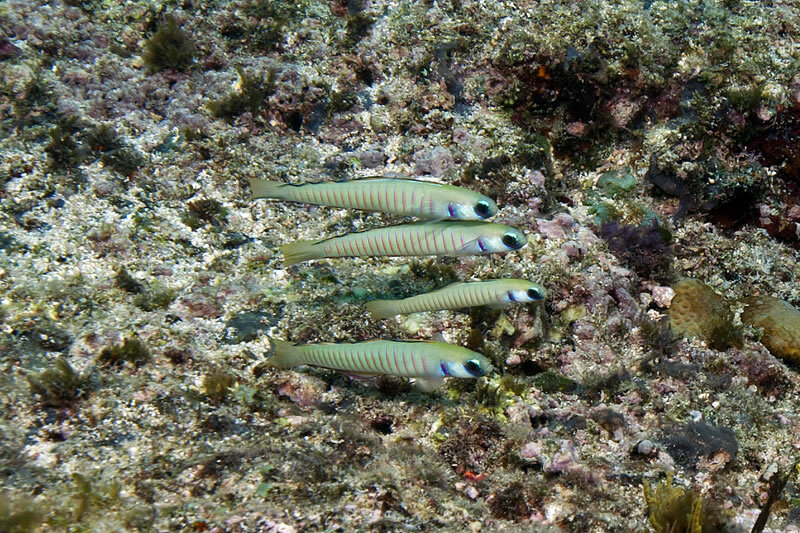 Mixed school of Blue and Yellow Fusiliers (Caesio teres) and Double-lined Fusiliers (Pterocaesio digramma). 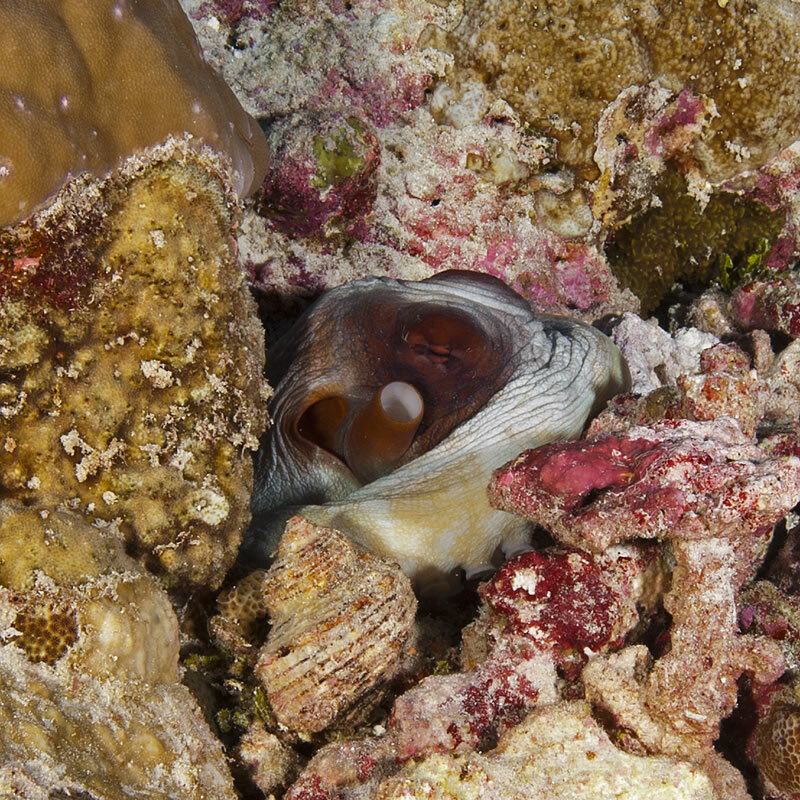 Day Octopus (Octopus cyanea) hiding in its burrow lined by rocks and shells. 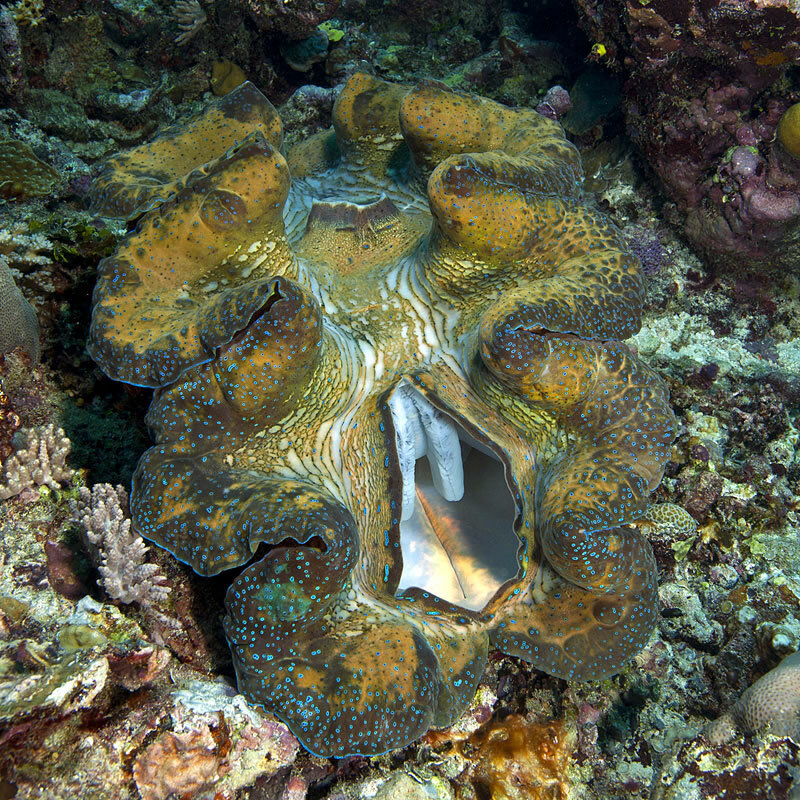 Fluted Giant Clam (Tridacna squammosa) with spotted mantle. 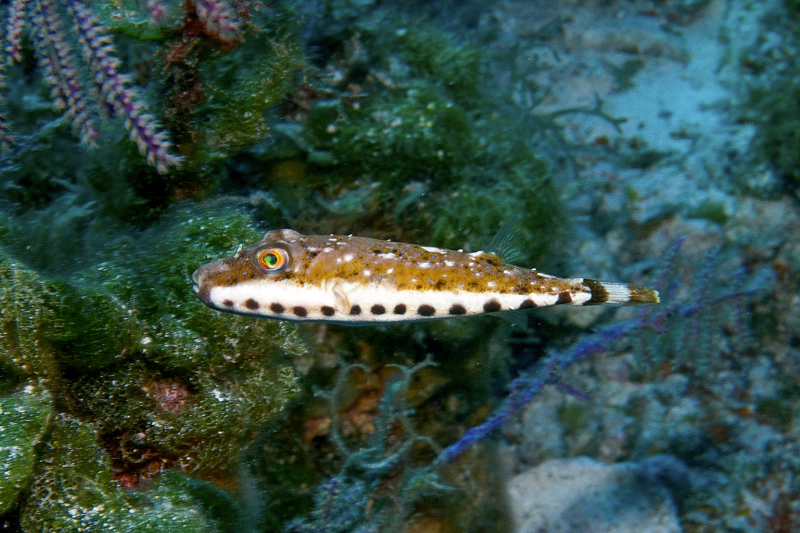 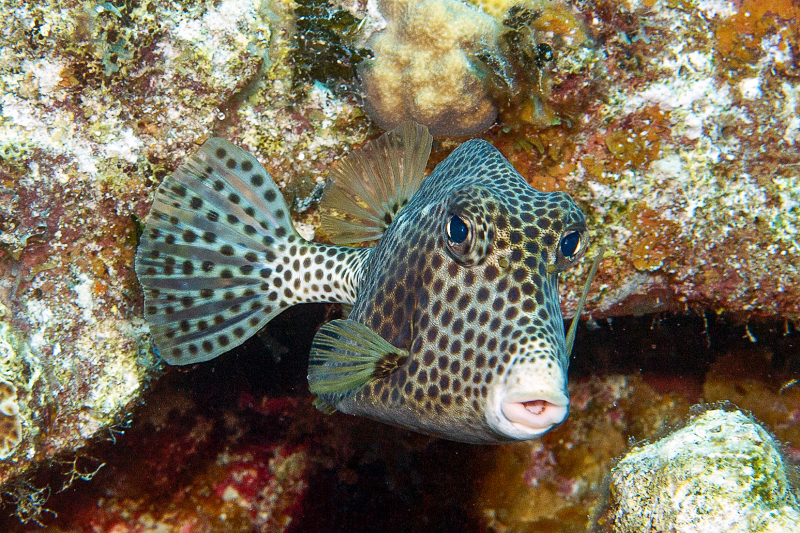 Guineafowl Puffer (Arothron meleagris) black spotted form. 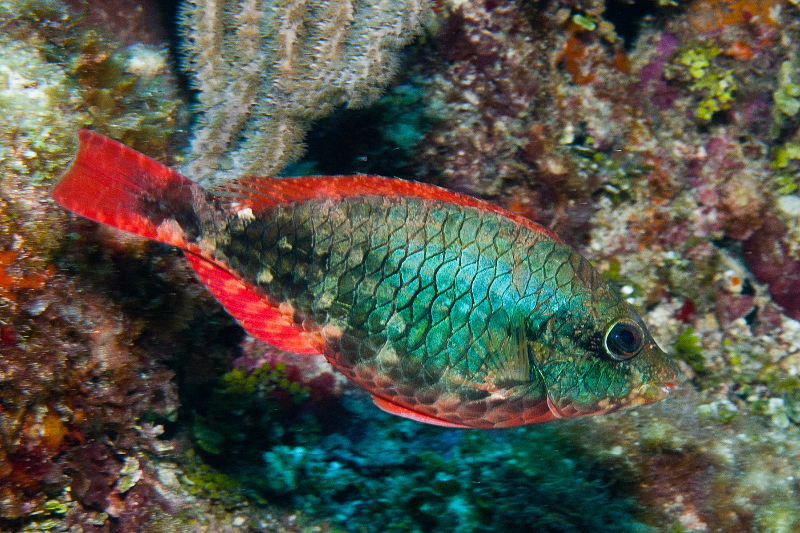 Juvenile Red Snapper (Lutjanus bohar). 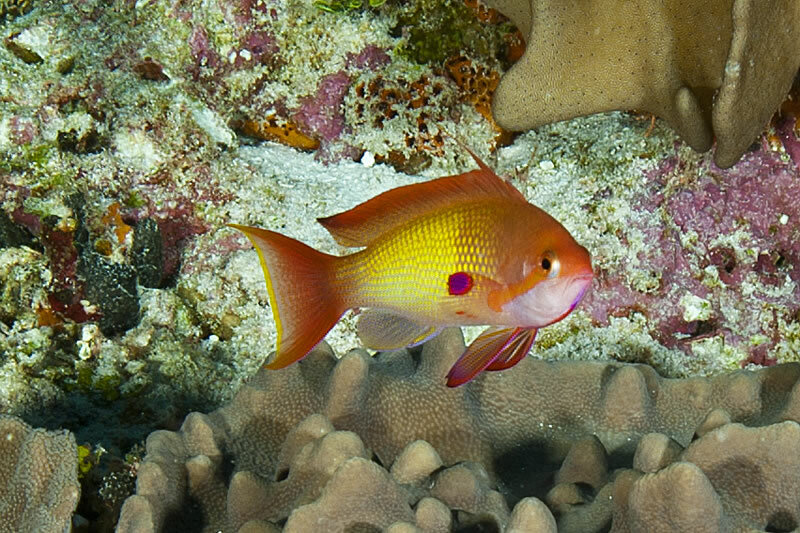 Male Scalefin Anthias (Pseudanthias squamipinnis). 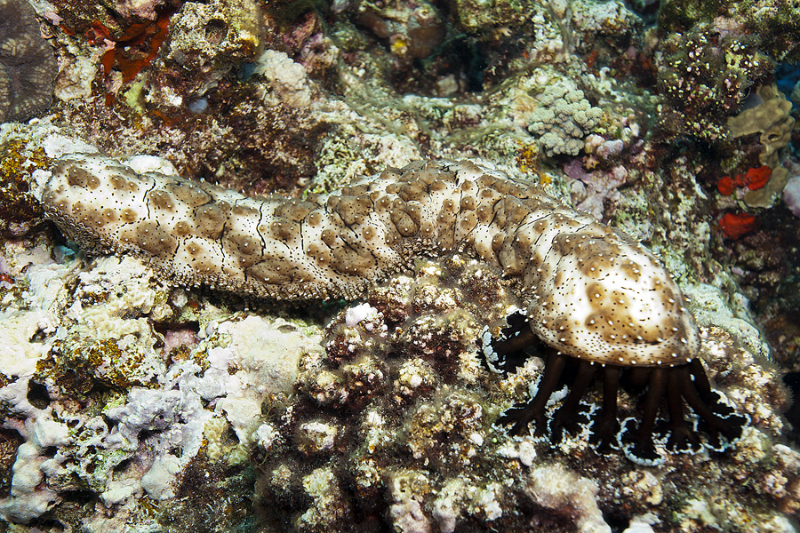 A new species of sea cucumber we've been seeing in Chagos--possibly related to the Pineapple Sea Cucumber. 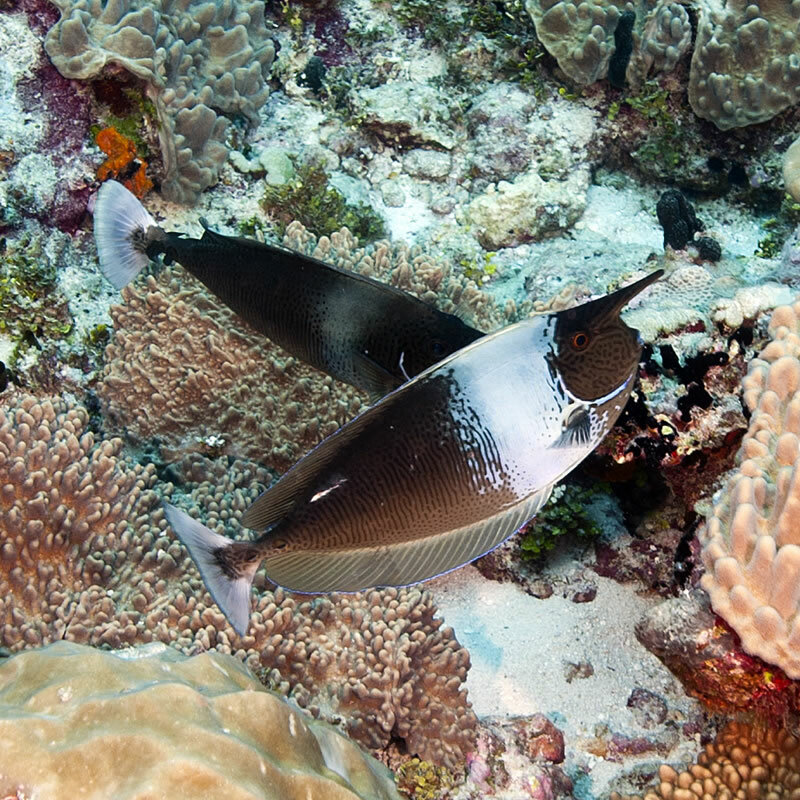 Pair of Spotted Unicornfish (Naso brevirostris). 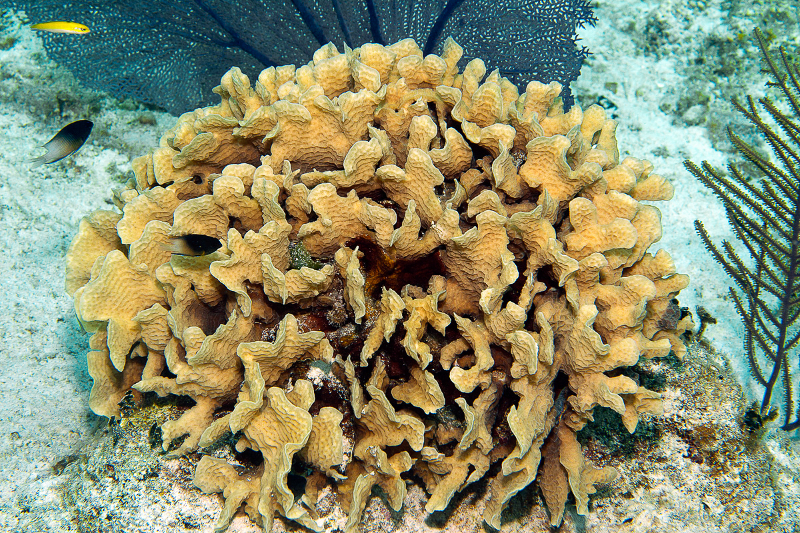 Yellow-spotted Scorpionfish (Sebastapistes cyanostigma) hiding among the branches of a Pocillopora coral. 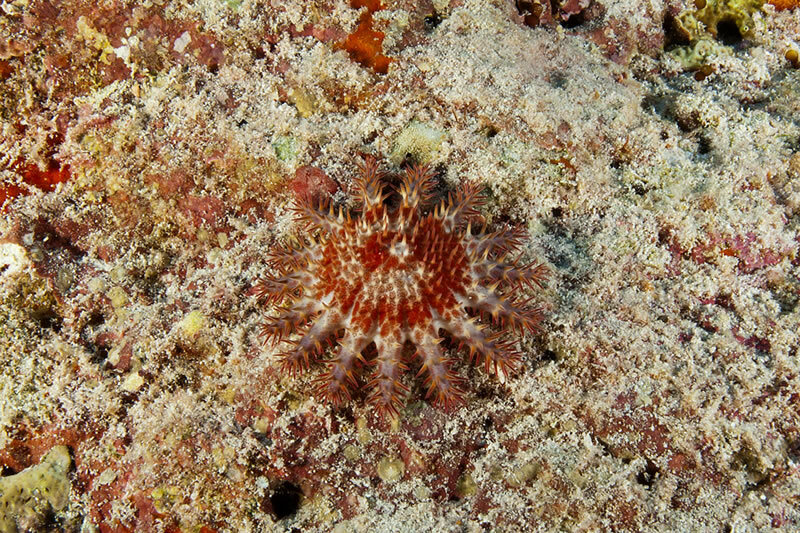 Granular Sea Star (Choriaster granulatus). 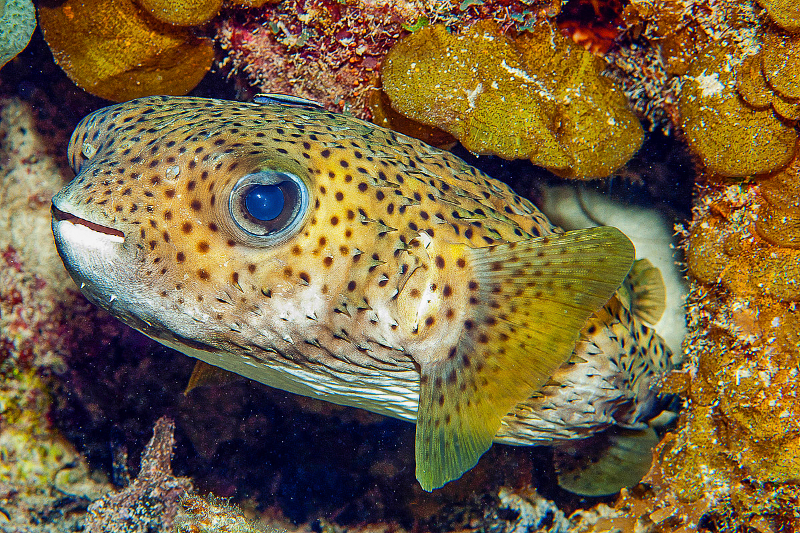 Guineafowl Puffer (Arothron meleagris) solid yellow form. 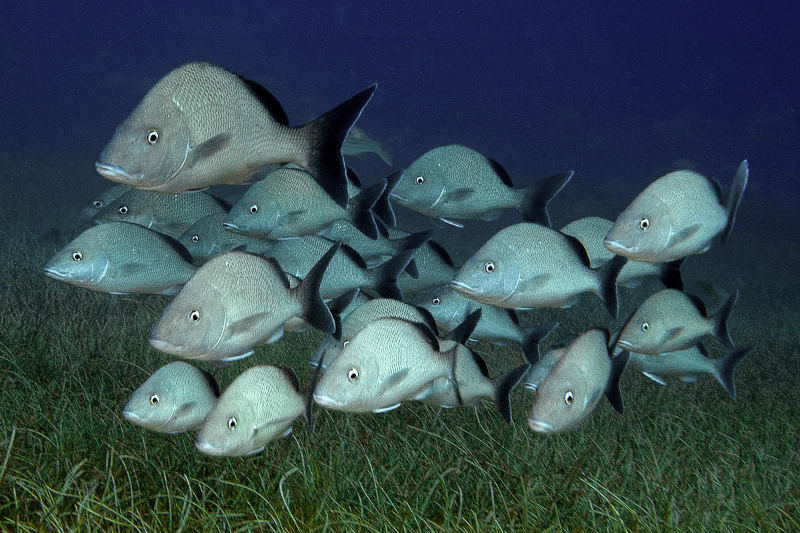 School of Longfin Spadefish (Platax teira) buzz by along a drop-off. 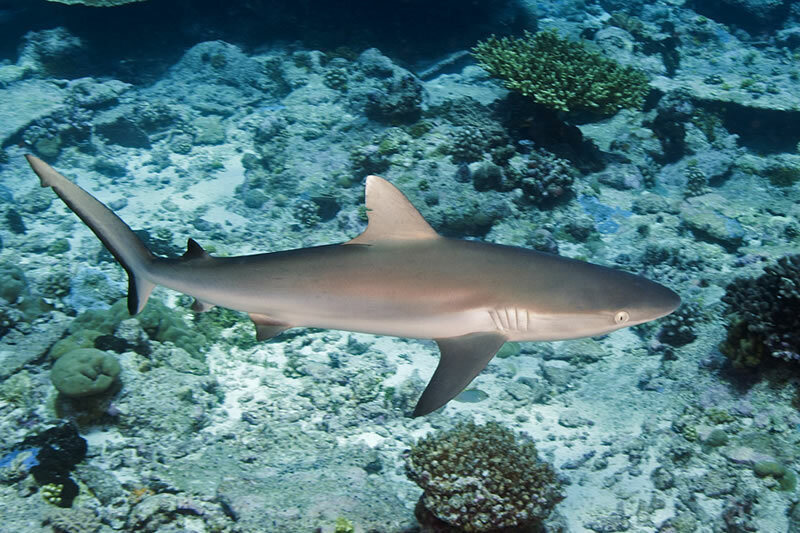 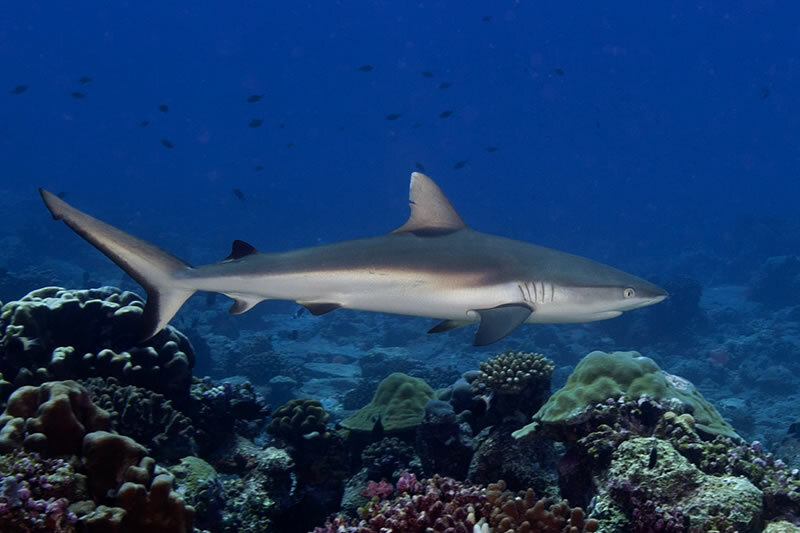 Blacktail Reef Shark (Carcharhinus wheeleri). 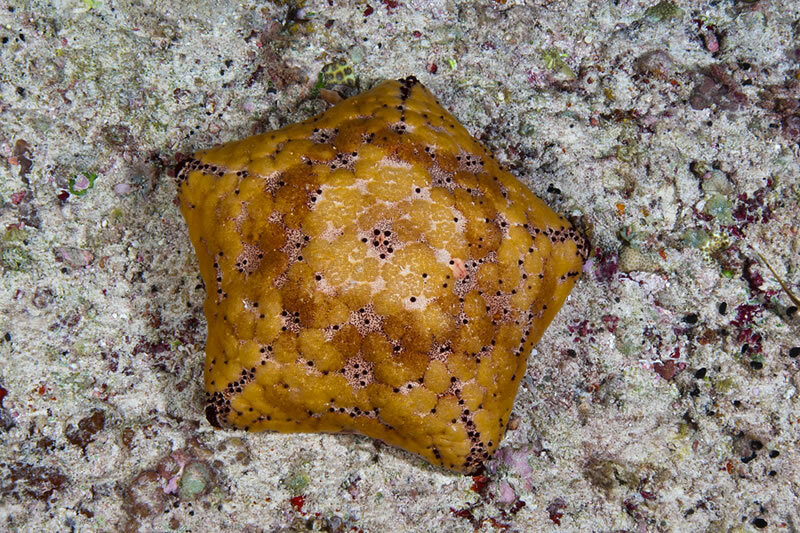 Cushion Stars (Culcita sp.) 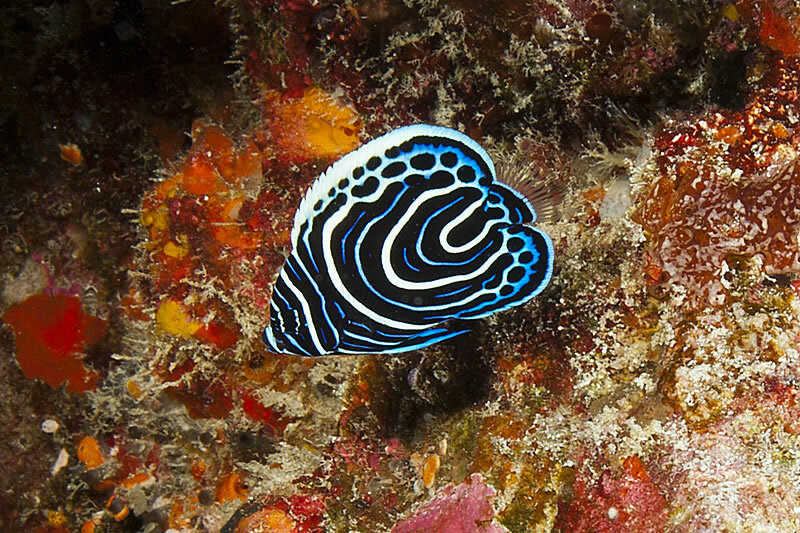 with an interesting tesselated and spotted pattern. 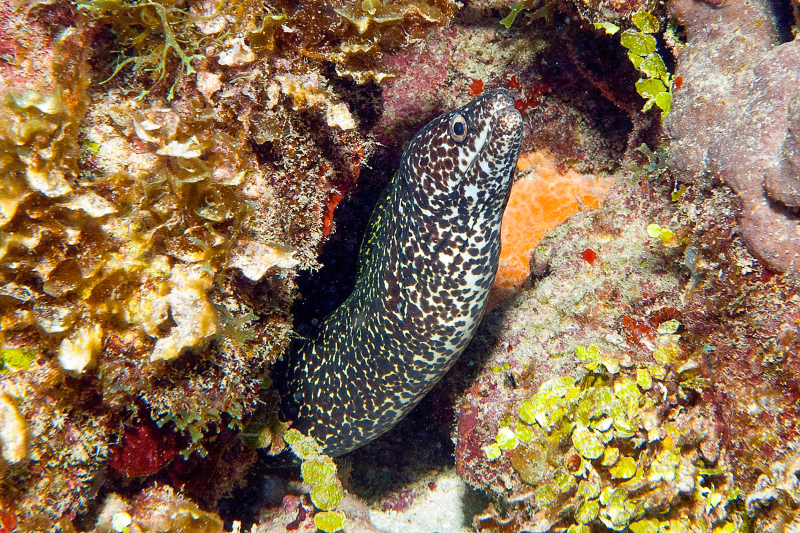 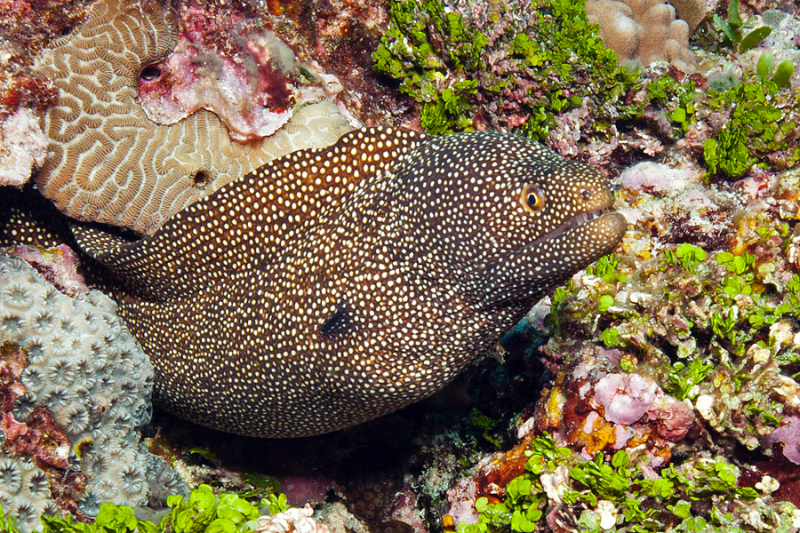 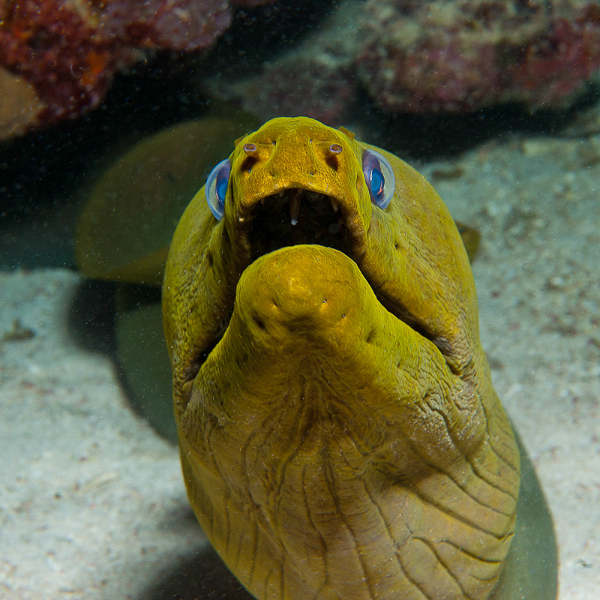 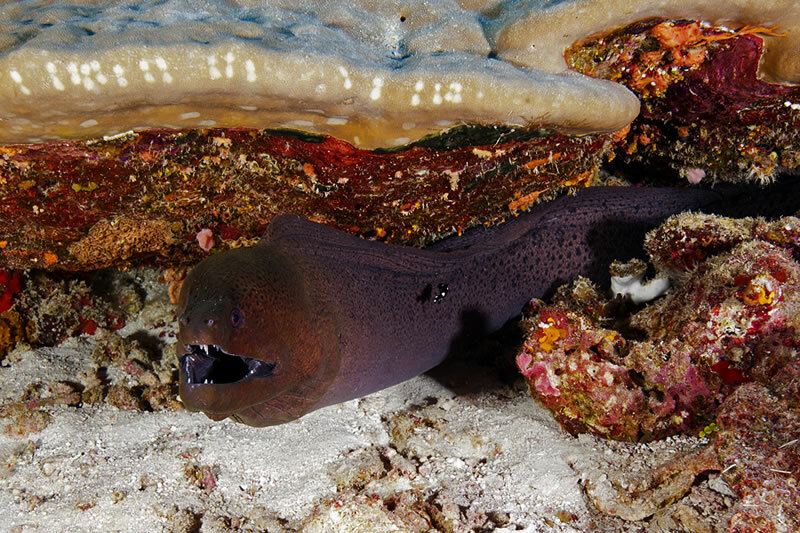 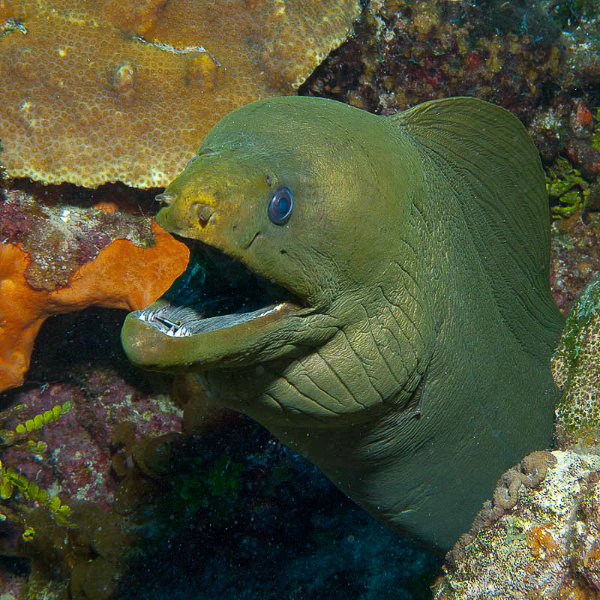 Giant Moray (Gymnothorax javanicus) is not shy about having its photo taken. 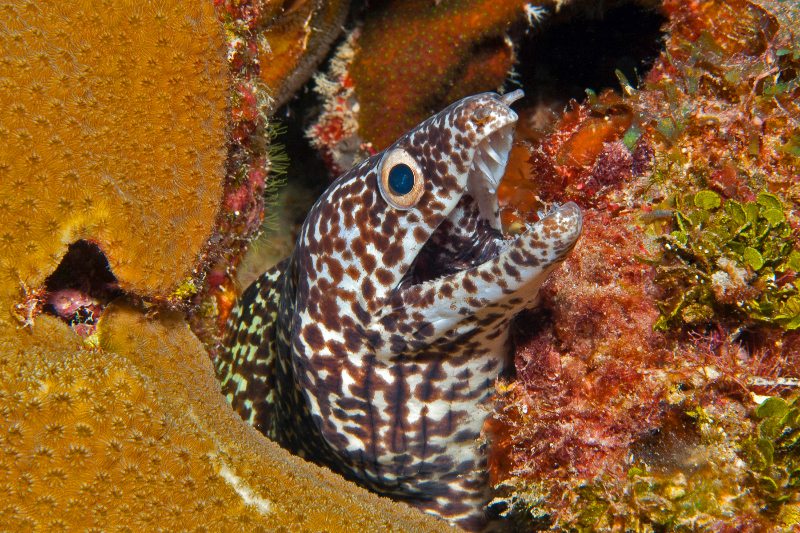 Anderson Mayfield interrupted by a Giant Moray (Gymnothorax javanicus) while sampling a Seriatopora coral. 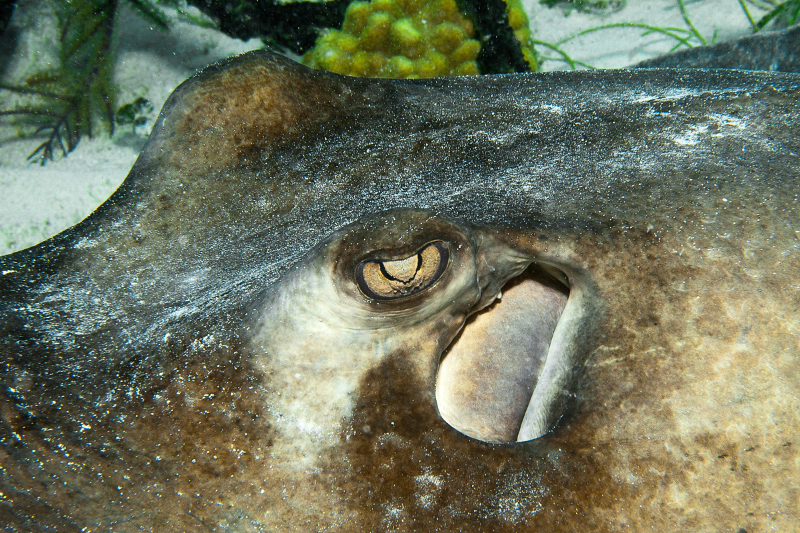 Small Tawny Nurse Shark (Nebrius ferrugineus) resting under an overhang. 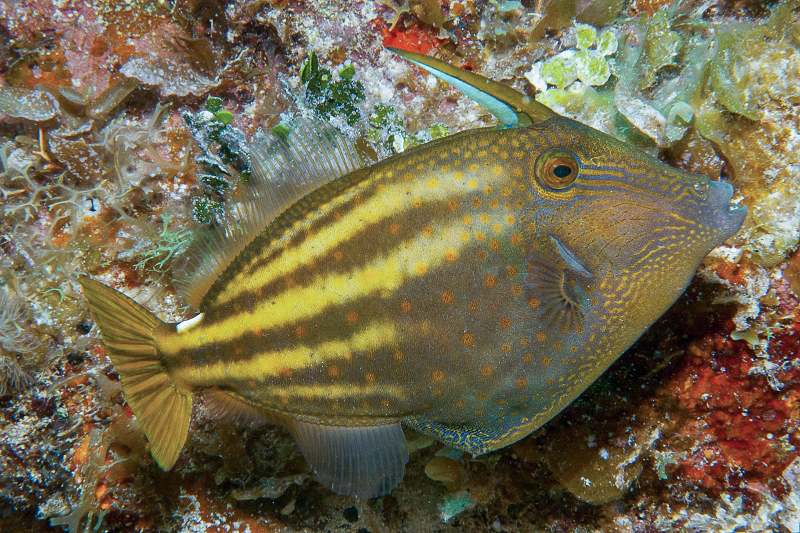 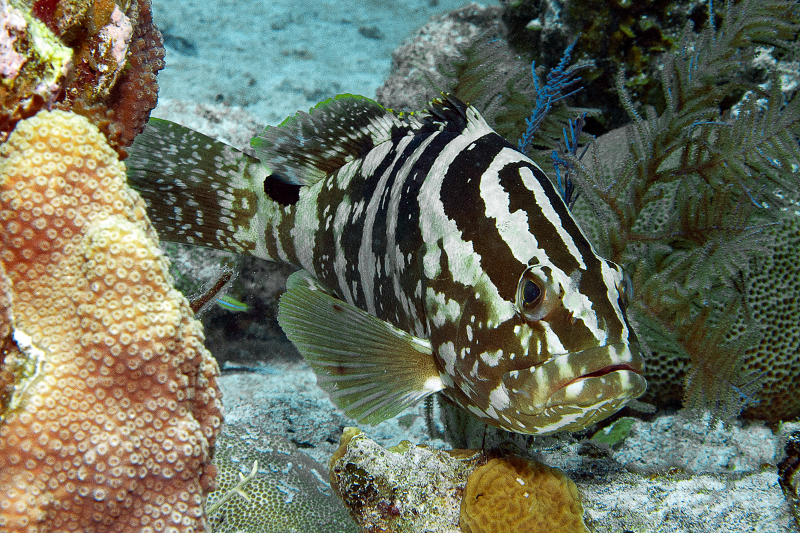 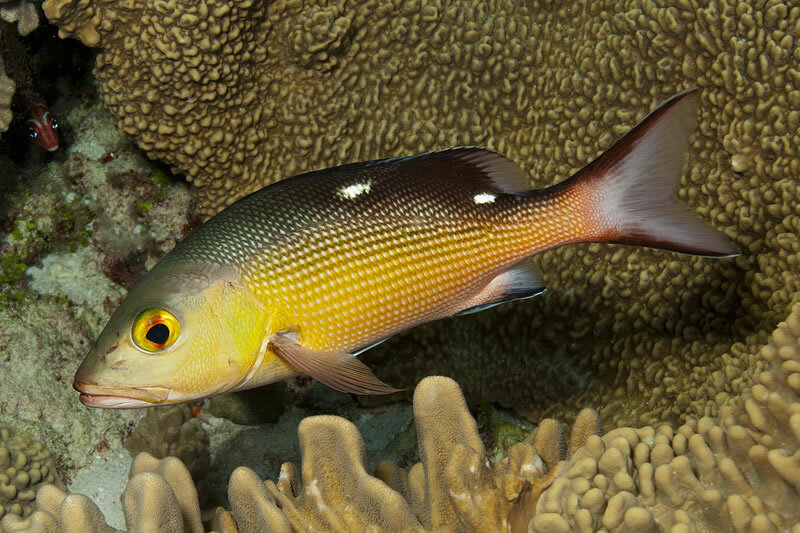 Striped Large-eye Bream (Gnathodentex aureolineatus). 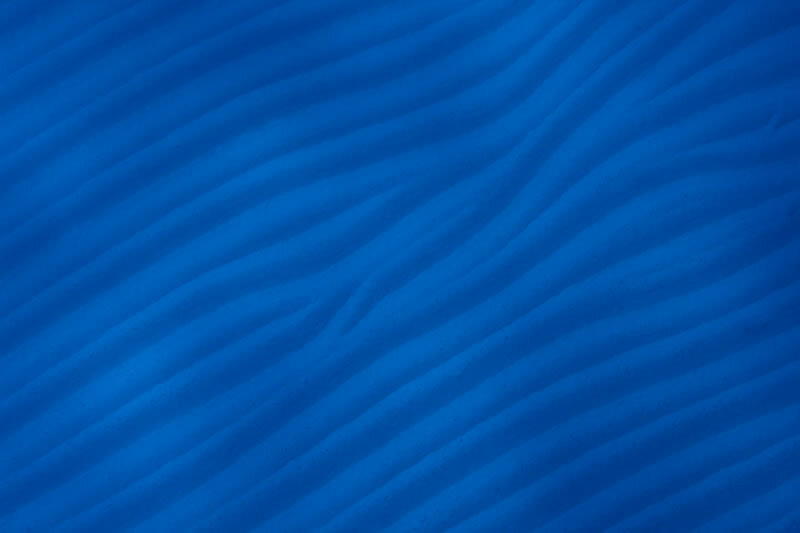 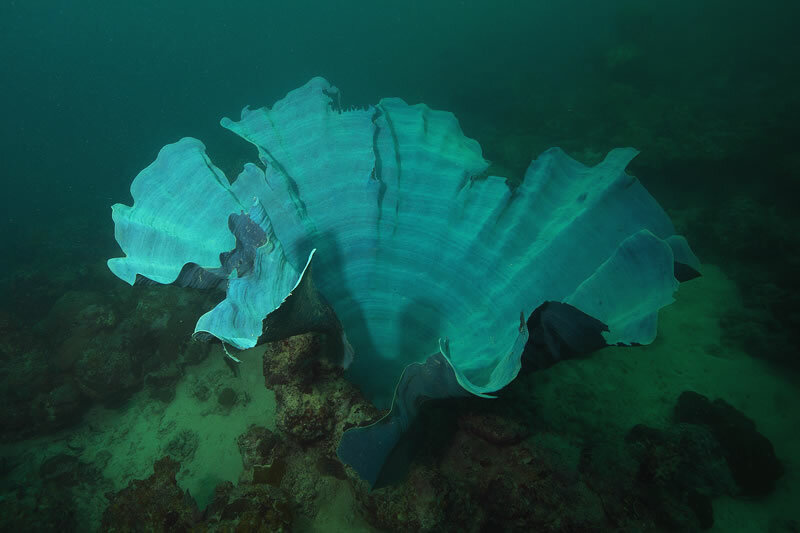 Fluted Giant Clam (Tridacna squammosa) with electric blue striped mantle. 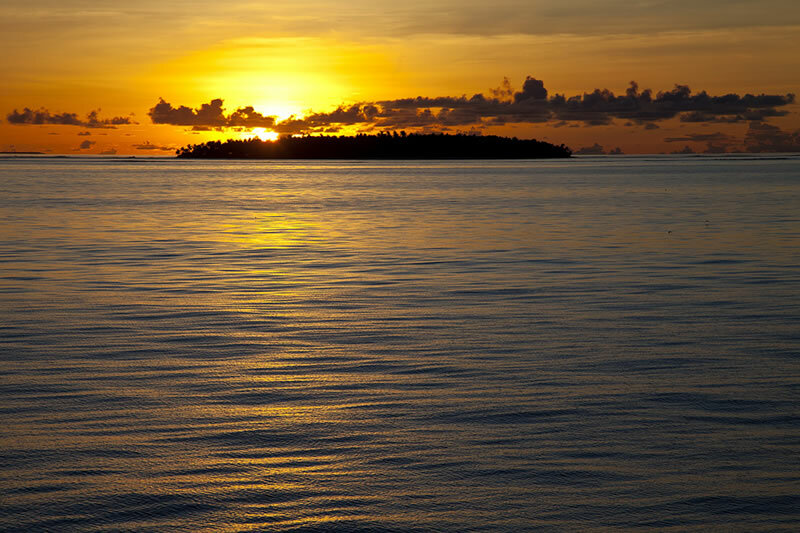 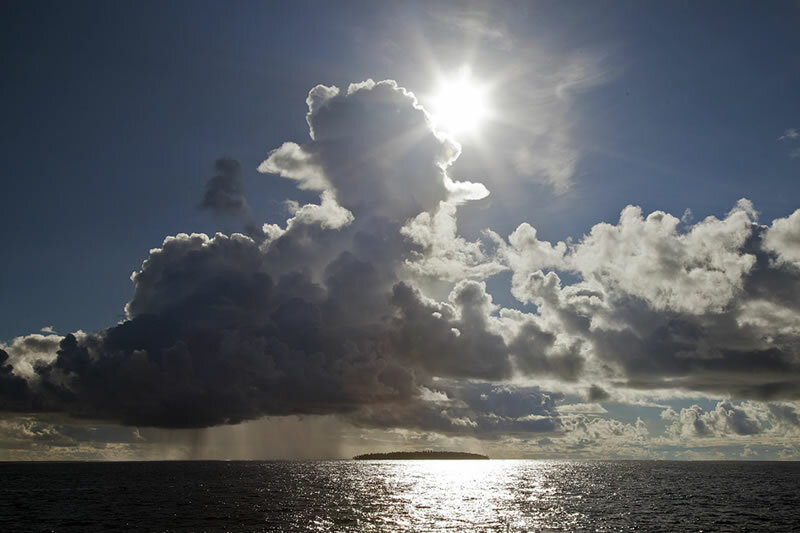 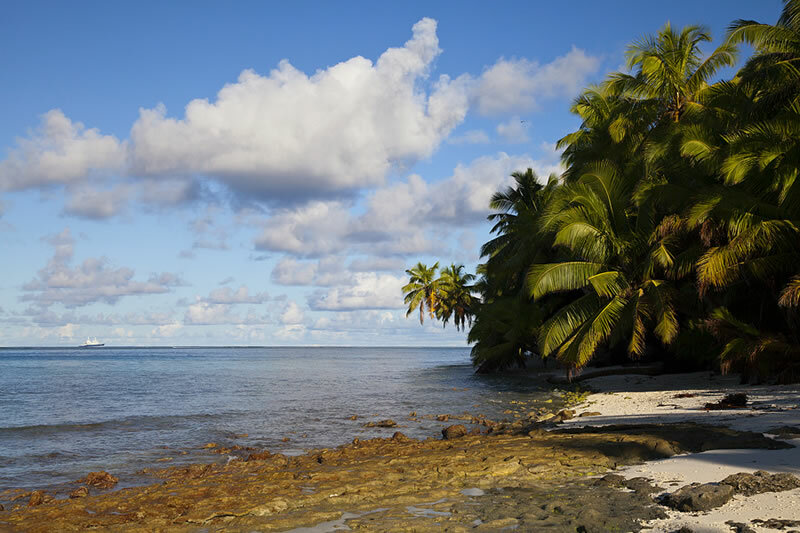 Panoramic sunset over the Three Brothers Islands on the western edge of the Great Chagos Bank. 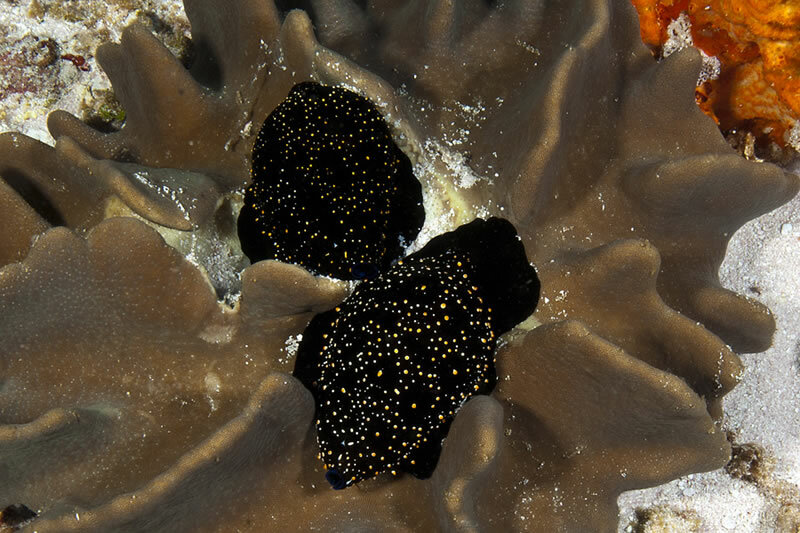 Black-spotted Egg Cowrie (Calpurnus verrucosus) on Lobophytum leather coral. 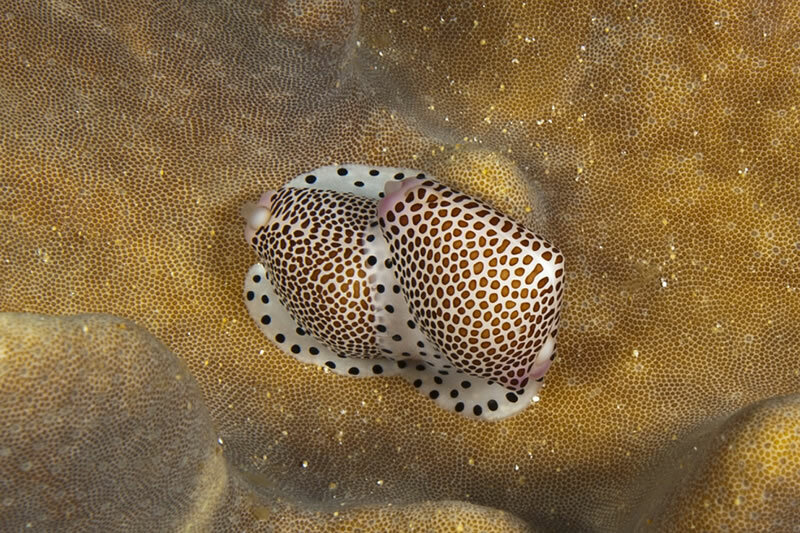 Black-spotted Egg Cowrie (Calpurnus verrucosus). 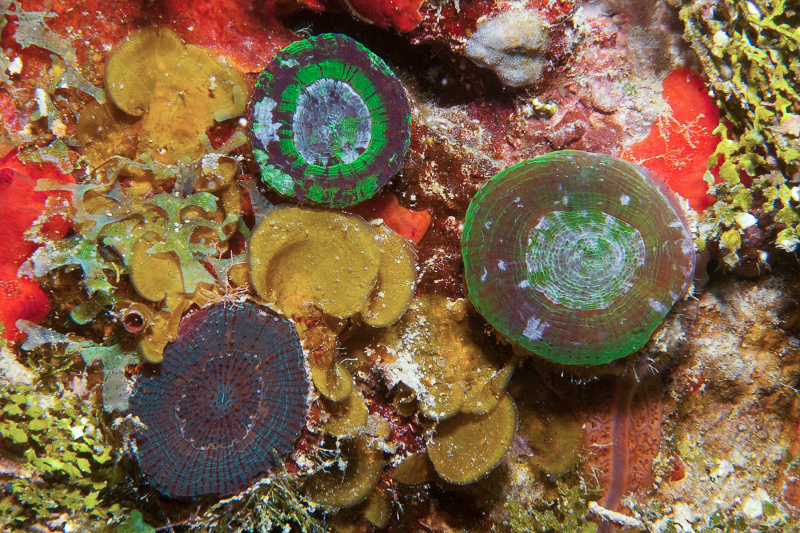 Ceiling of an overhanging ledge is a dazzling coloful display of sponges, tunicates, bryozoans and cup corals. 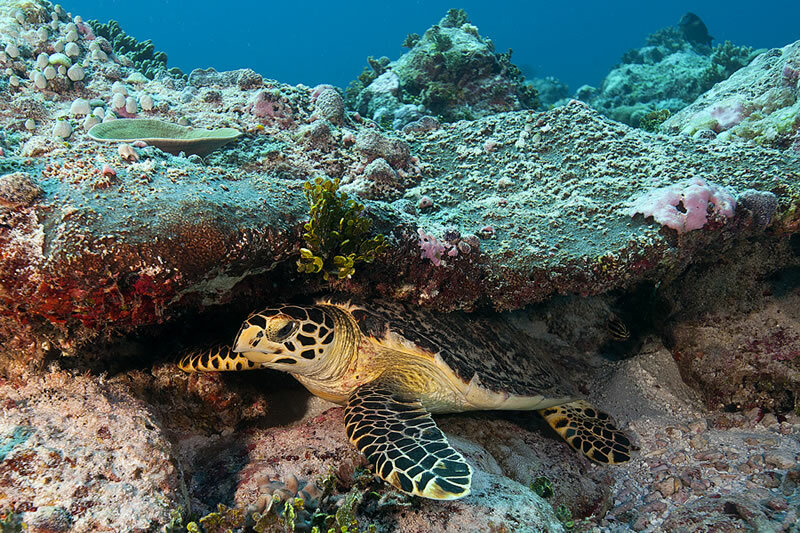 Hawksbill Turtle (Eretmochelys imbricata) sleeping under a ledge during a morning dive. 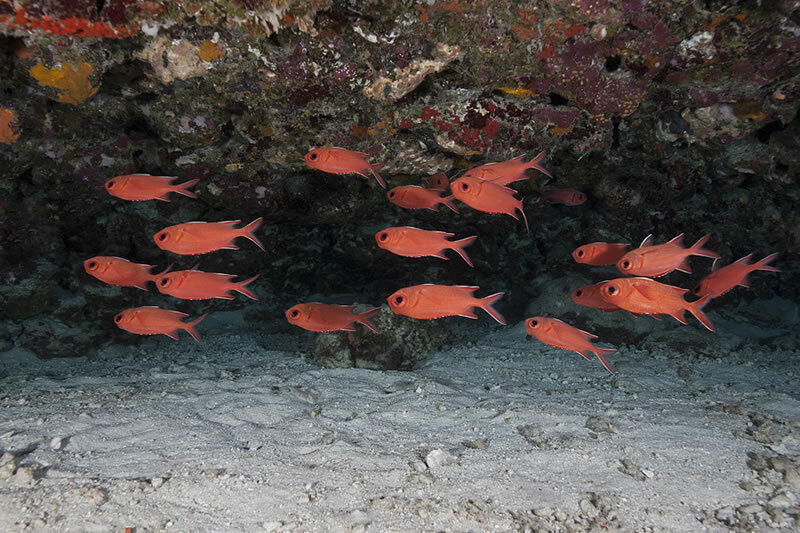 School of Whitetip Soldierfish (Myripristis vittata) orient themselves to the roof of an overhanging ledge. 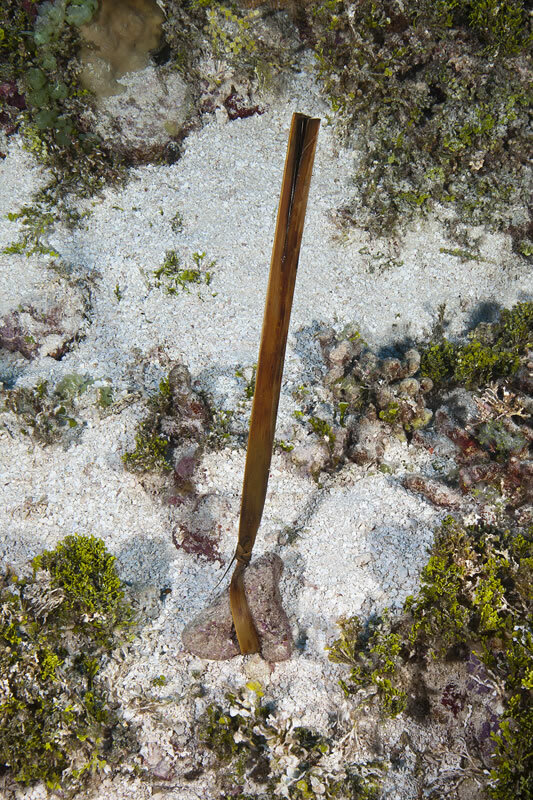 With a lead-core transect line and a PVC meter stick, Kristin Stolberg surveys corals on a colorful section of a shallow reef under glassy calm seas. 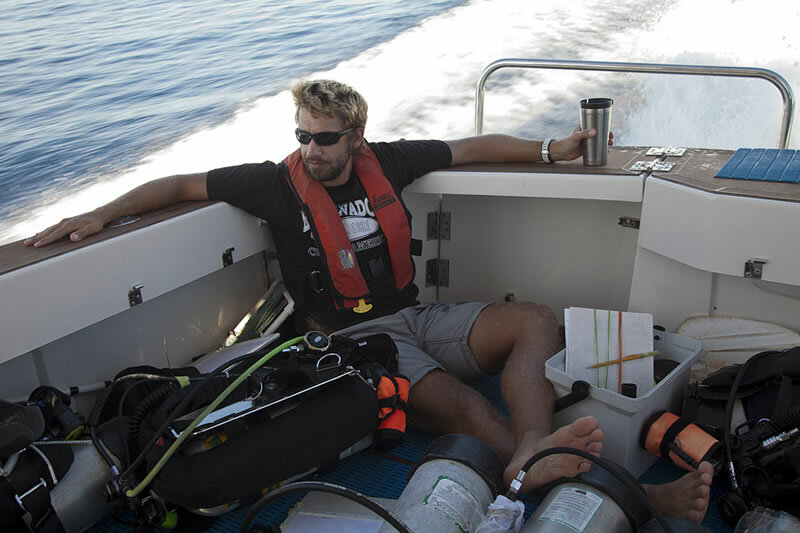 Anderson Mayfield wakes up with a cup of coffee during a long transit out to our first dive of the day. 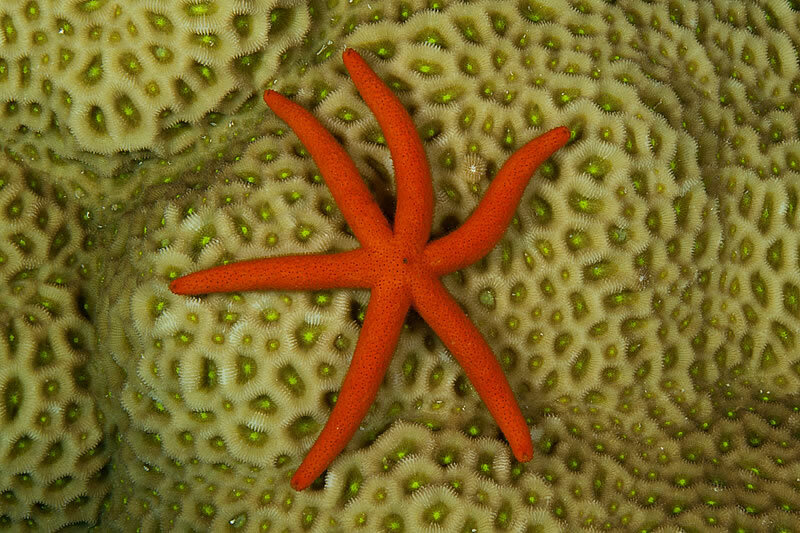 Tiny juvenile Crown-ot-thorns Sea Star (Acanthaster planci). 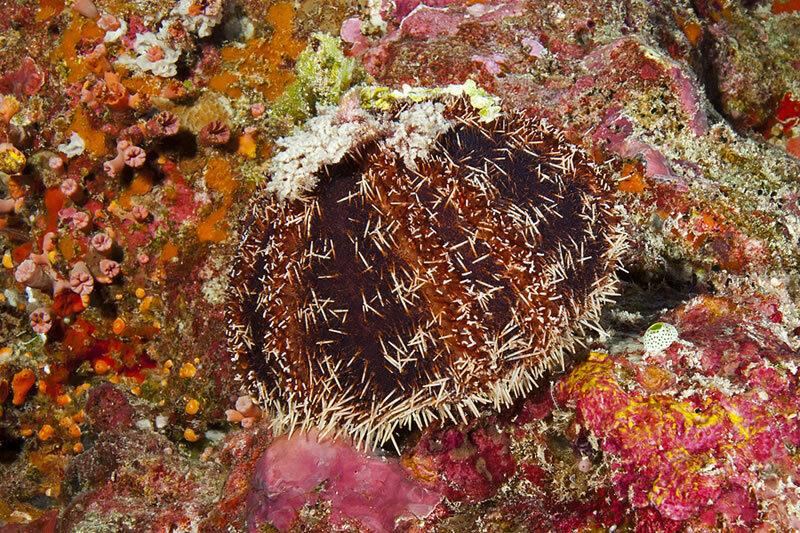 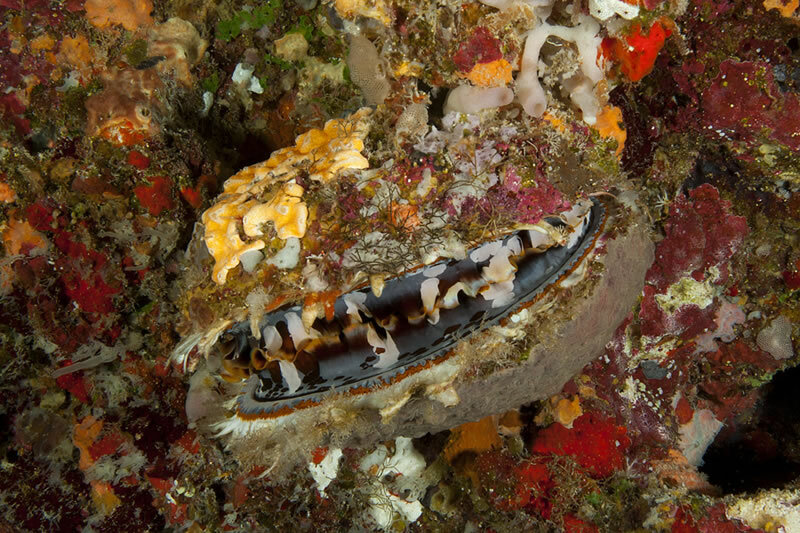 Variable Thorny Oyster (Spondylus varians) which like to attach to ledge overhangs, have a colorful mantle lined with hundreds of eye spots and a shell often overgrown with other organisms. Foliose plates of Echinopora plate coral cascade down the reef slope. 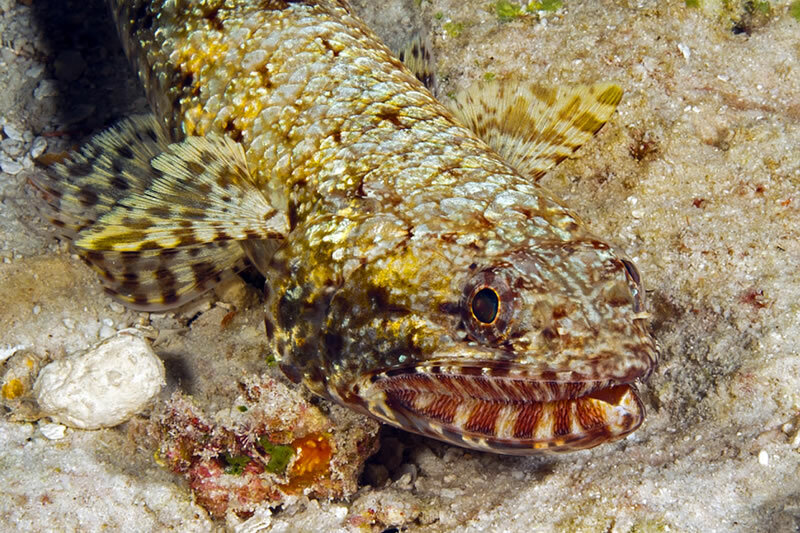 A distinctive feature of the Slender Lizardfish (Saurida gracilis) is the lined pattern along the jaws which displays the teeth even when the mouth is closed. 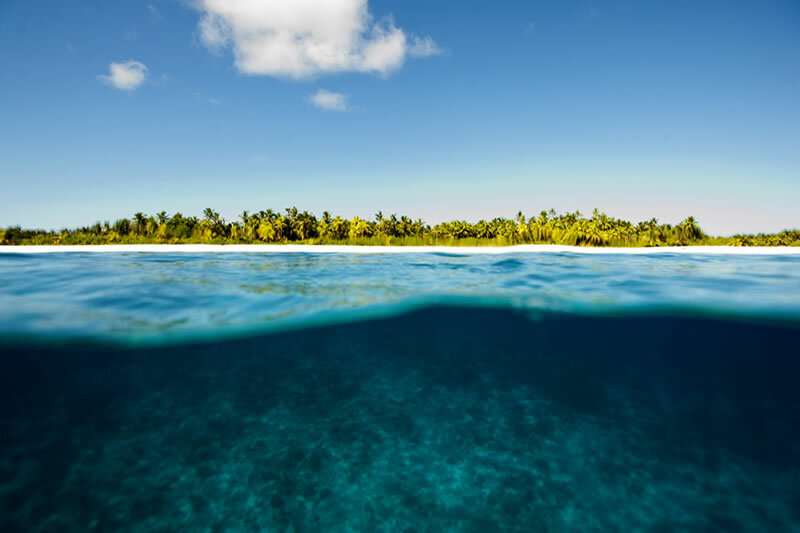 View above and below the water line at the end of a morning survey dive off South Brother Island along the western edge of the Great Chagos Bank. 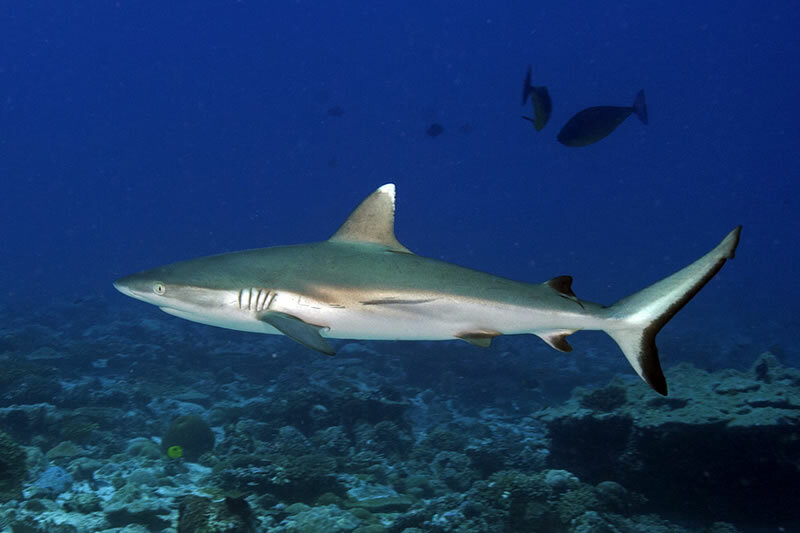 Blacktail Reef Shark (Carcharhinus wheeleri) considered by some scientists to be the same as the Grey Reef Shark (Carcharhinus amblyrhynchos) but has a white-tipped dorsal fin (among other differences). 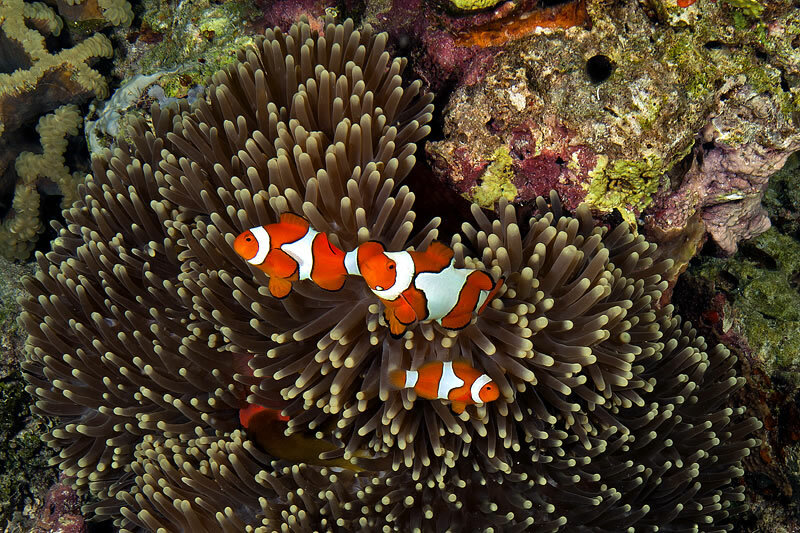 Cluster of 13 Magnificent Anemones (Heteractis magnifica) with only a single pair of anemonefish claiming the lot. 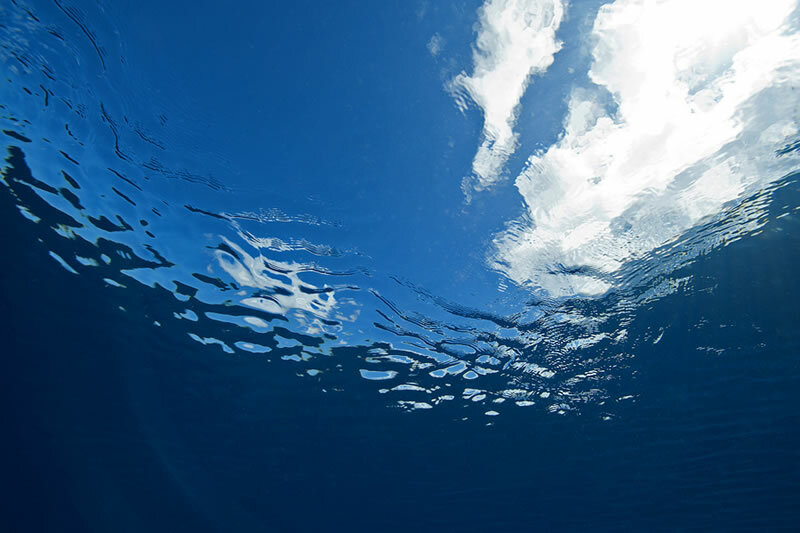 Looking up at the clouds through the glassy calm surface of the water during a 15 ft. safety stop at the end of a survey dive. 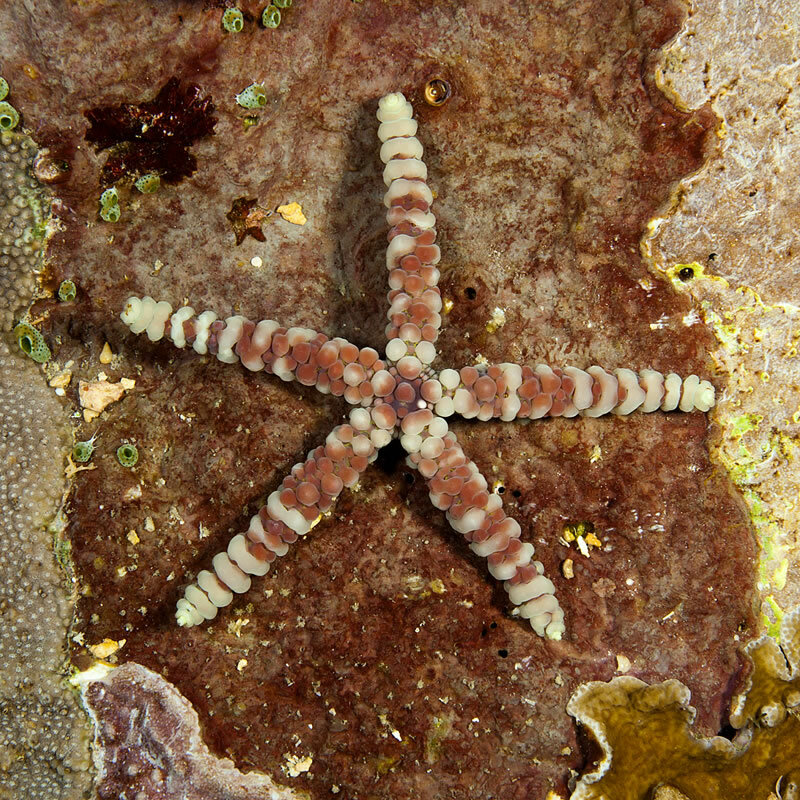 Noduled Sea Star (Fromia nodosa). 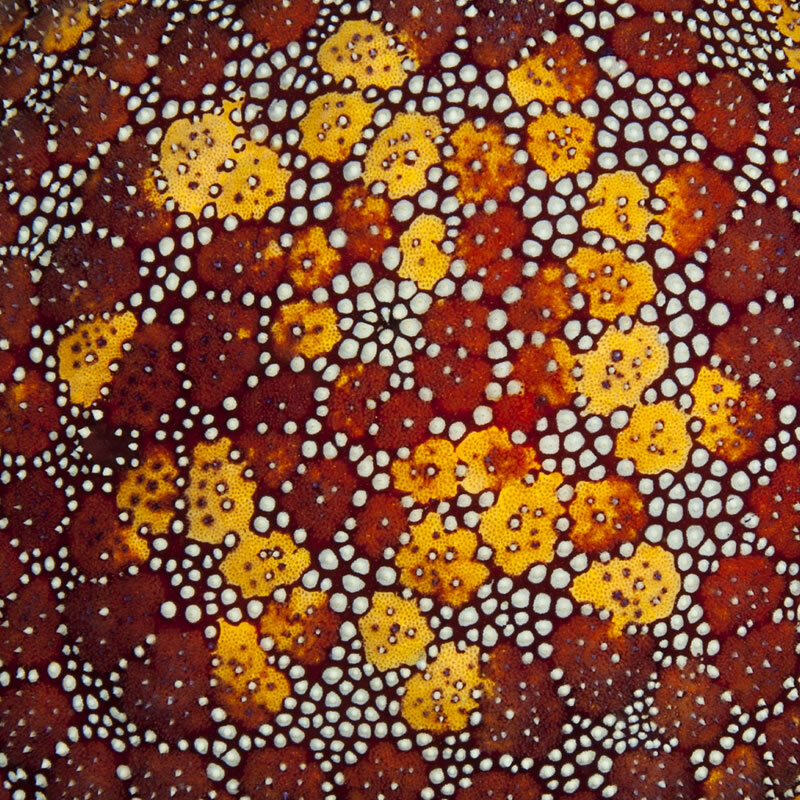 Polarized school of Golden Sweeper (Parapriacanthus ransonneti). 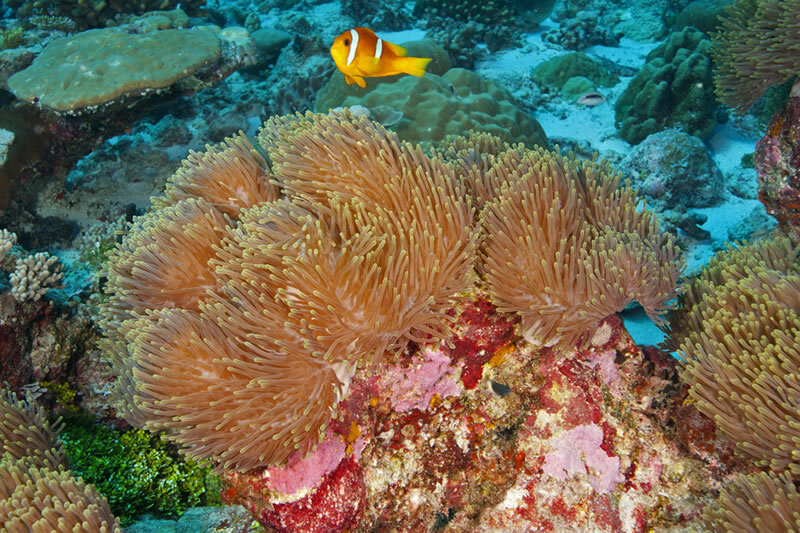 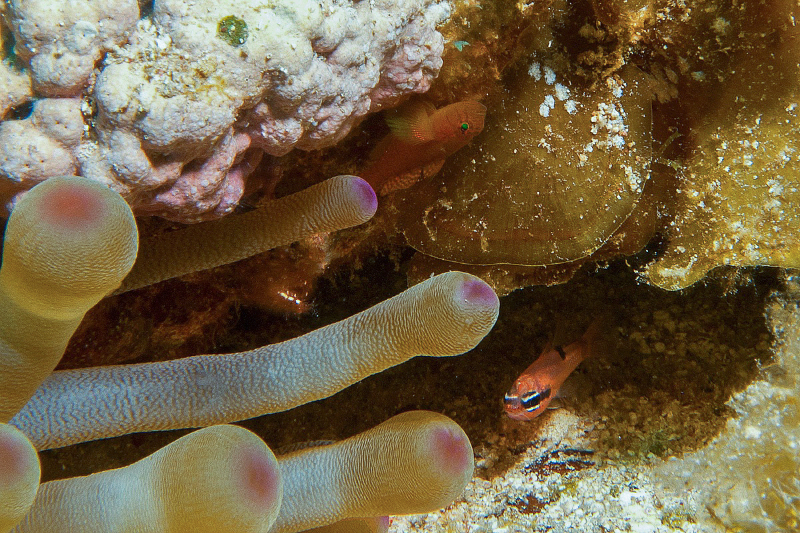 Two-band Anemonefish (Amphiprion bicinctus) swims among the various anemones in this cluster. 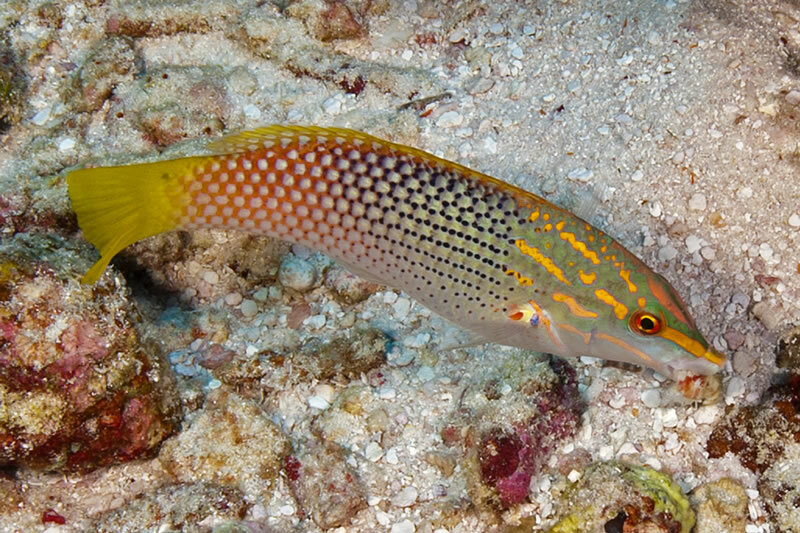 Checkerboard wrasse (Halichoeres hortulanus) eating a small crab it just pulled from the rubble. 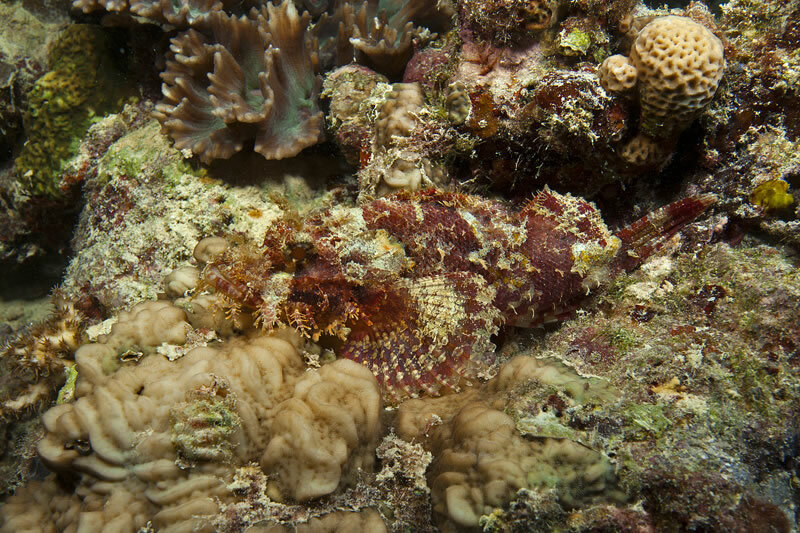 Devil Scorpionfish (Scorpaenopsis diabolus) blends in amazingly well with the pink Crustose Coraline Algae. 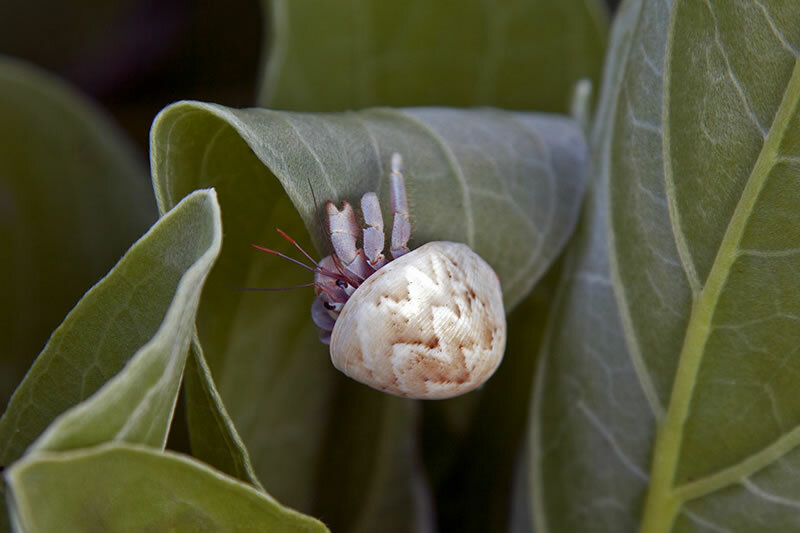 Giant Spider Conch (Lambis truncata) stares out from within its shell. 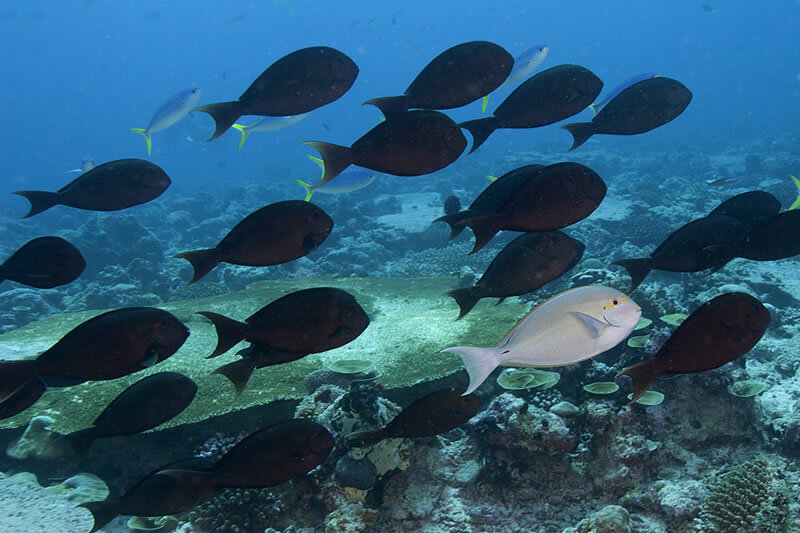 School of Yellowmask Surgeonfish (Acanthurus mata) with one pale individual which turned dark a moment after this photo. 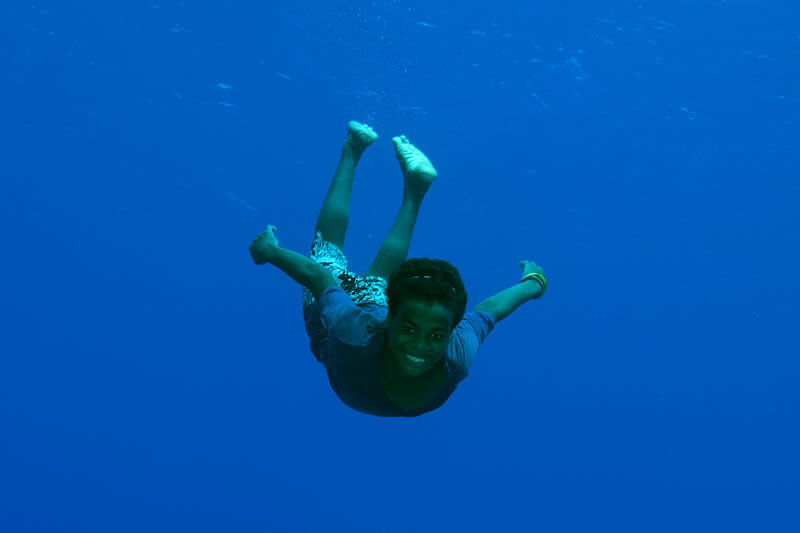 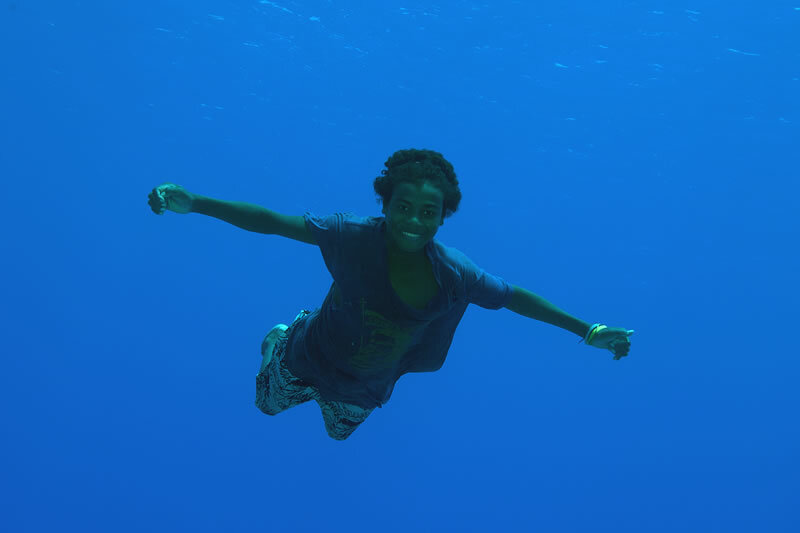 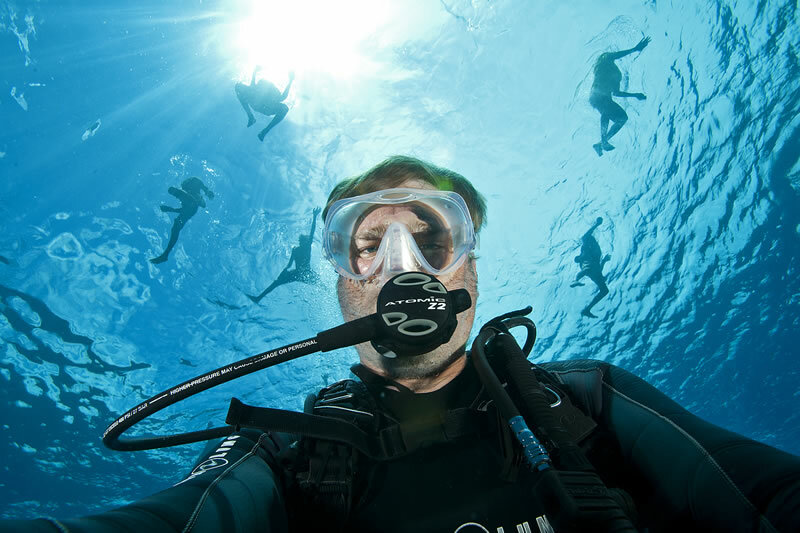 Anderson Mayfield during a safety stop at the end of a dive under the ceiling of a glassy calm sea. 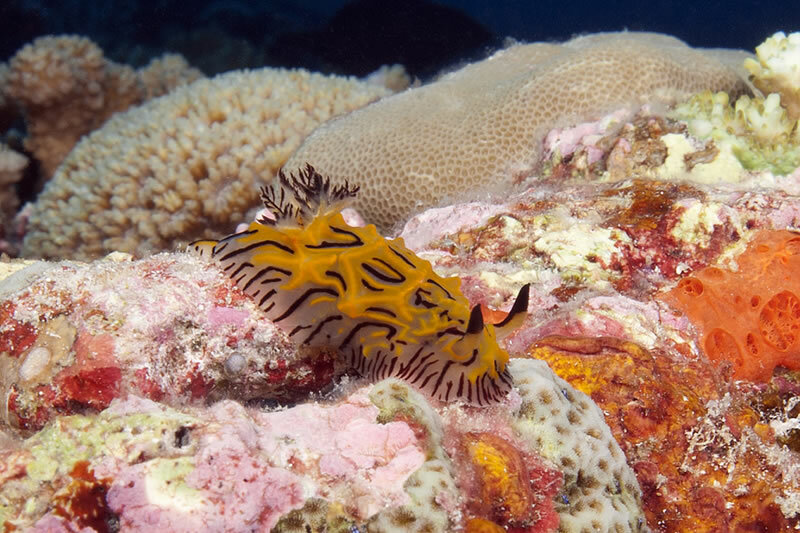 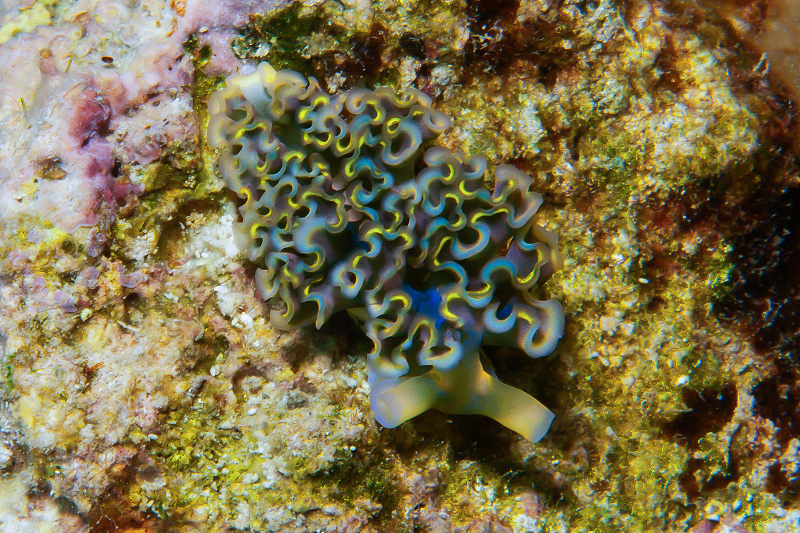 The tiny Willey's Halgerda nudibranch (Halgerda willeyi) are regularly seen in the Chagos Archipelago. 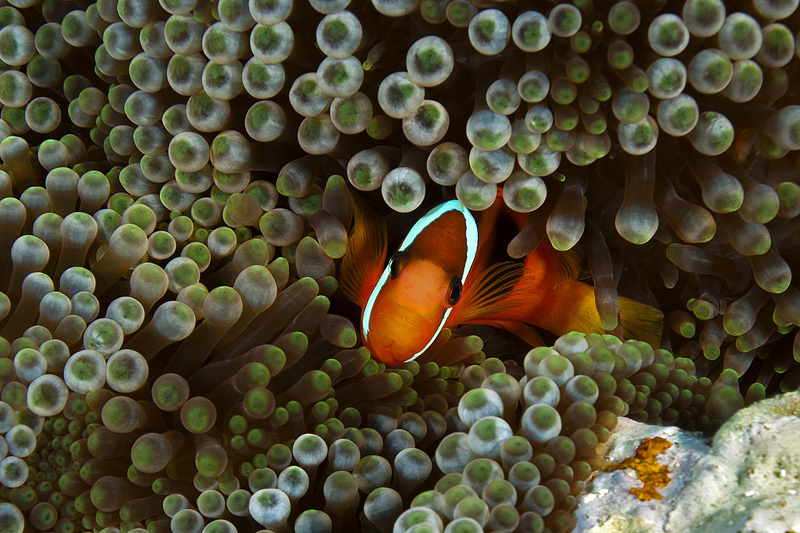 Two-band Anemonefish (Amphiprion bicinctus) caught for a split second staring at its reflection in the camera's dome port. 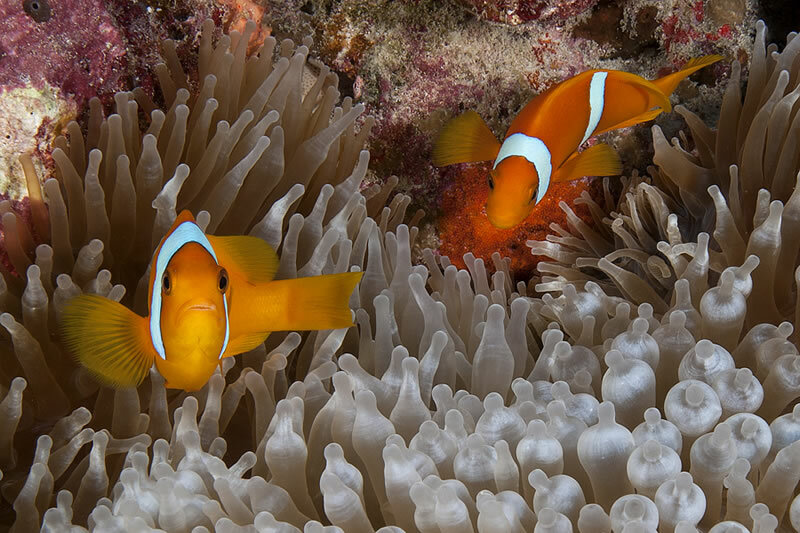 Two-band Anemonefish (Amphiprion bicinctus) in an Adhesive Anemone (Cryptodendrum adhaesivum). 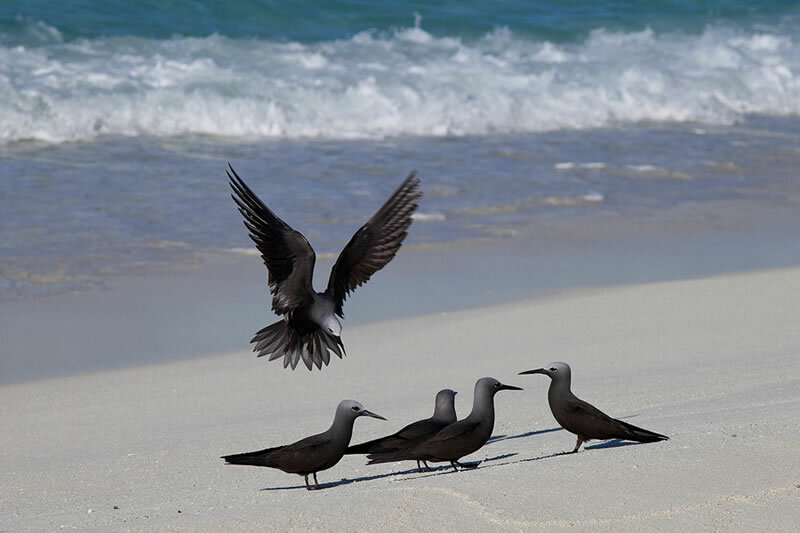 A group of several Lesser Noddies (Anous tenuirostris) are joined by another. 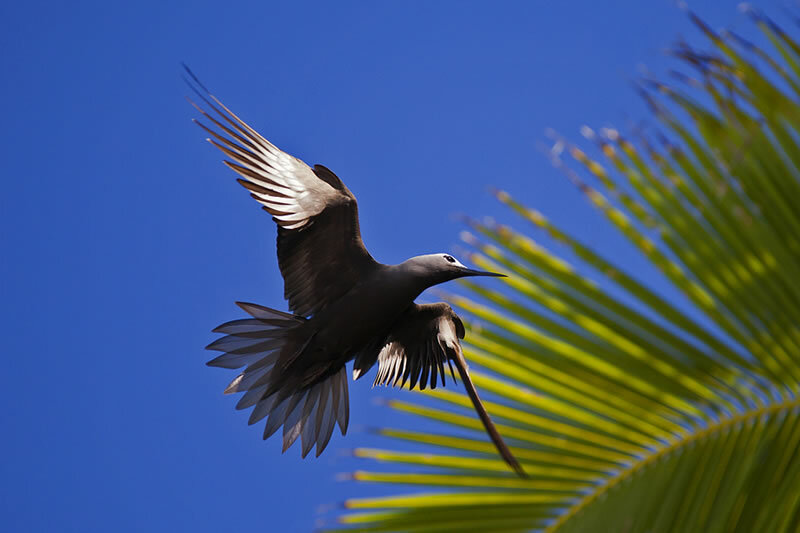 A Lesser Noddy (Anous tenuirostris) caught mid-flap while returning to its nesting area. 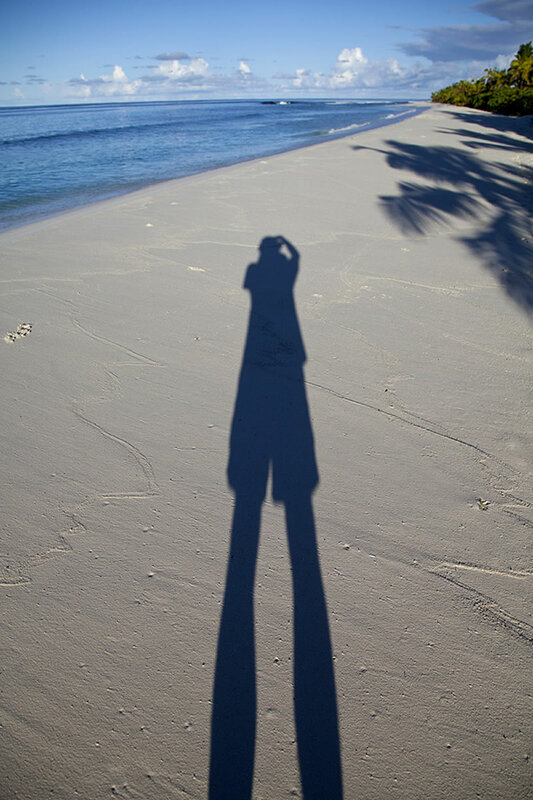 A shadow selfie islands style. 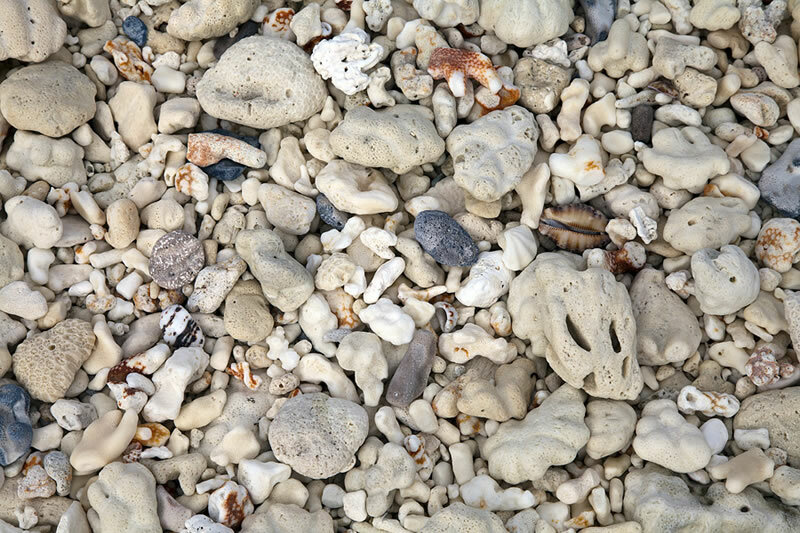 Area of the beach covered by shell hash and tumbled pieces of coral skeleton. 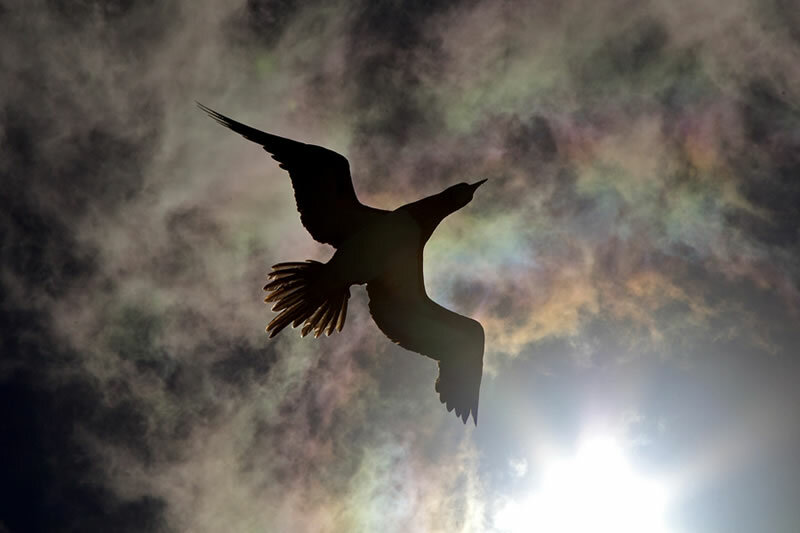 Brown Booby (Sula leucogaster) silhouette as it flies overhead and into the sun. 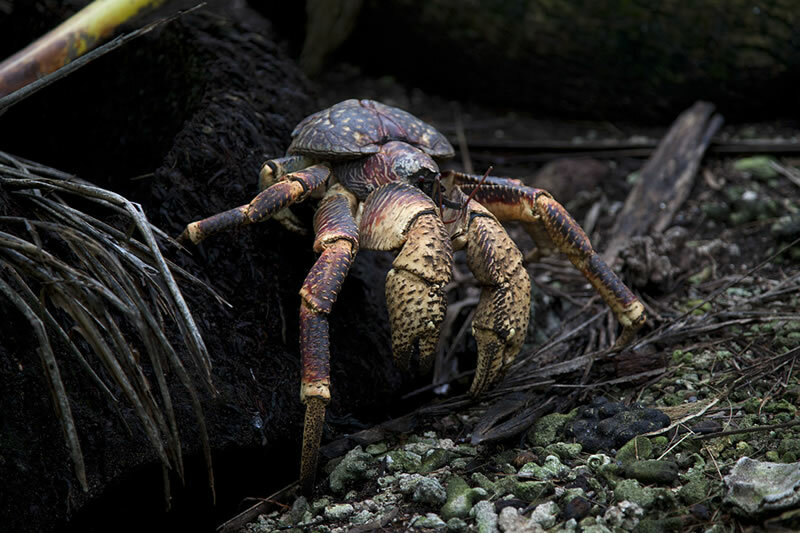 Coconut Crab (Birgus latro) near its burrow among coconut palm roots. 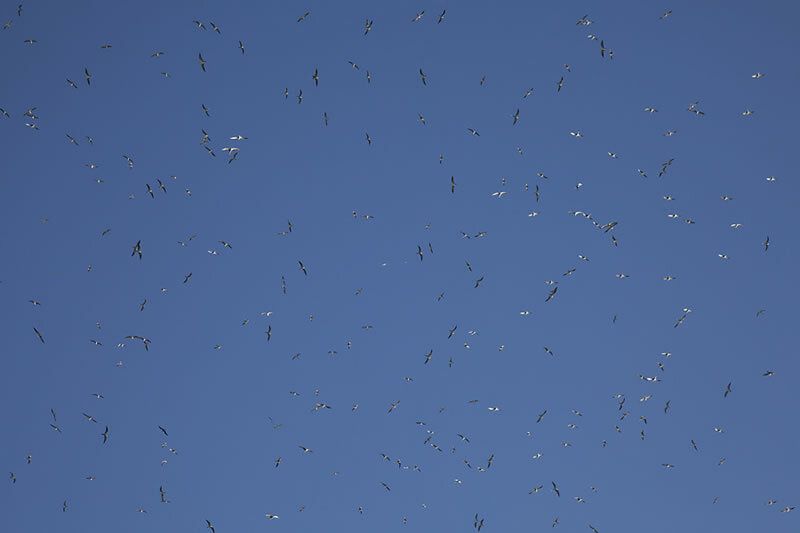 Dense cluster of boobies and frigatebirds soaring in an azure blue sky made quite the racket. 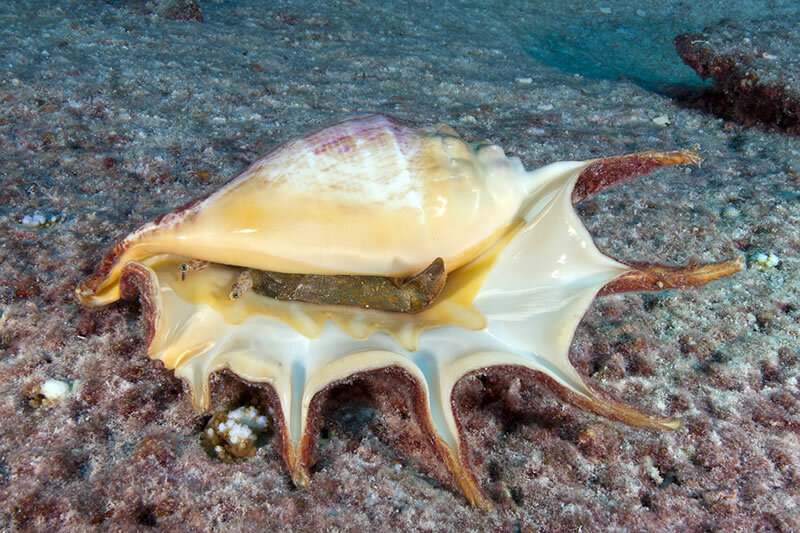 Gathering of snails seems like it was an opportunity for many of them to find a mate. 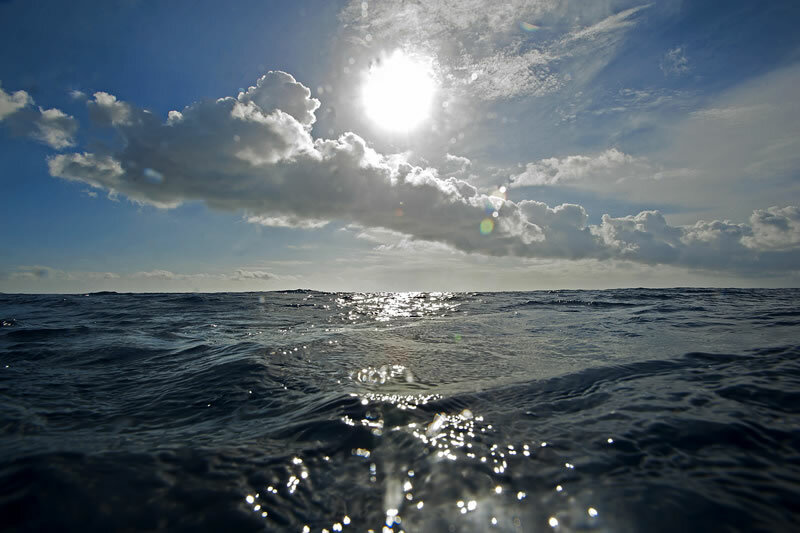 Good time not to be on shore as a rain storm rolls through. 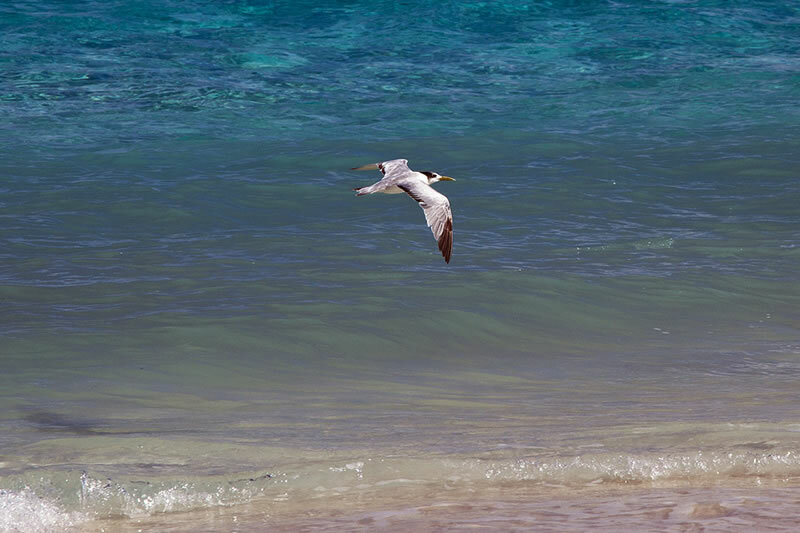 Great Crested Tern (Thalasseus bergii) hunting along the breaking waves. 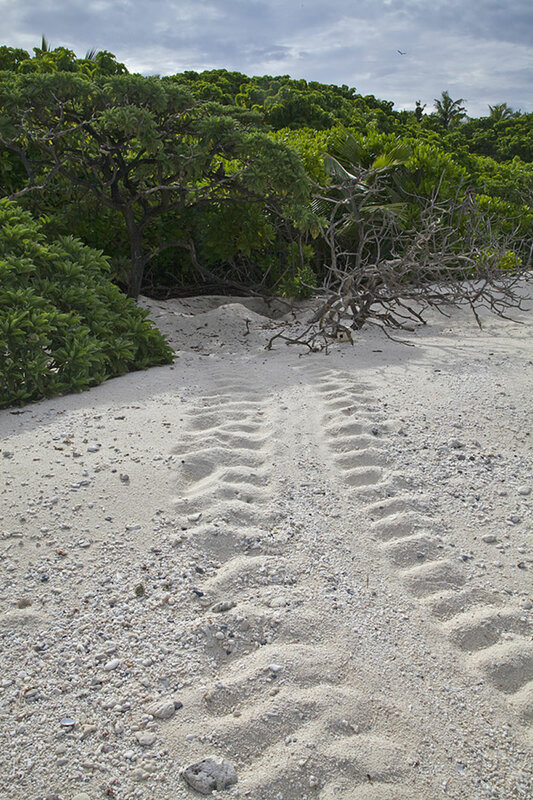 Green Sea Turtle (Chelonia mydas) tracks to the nest at the treeline. 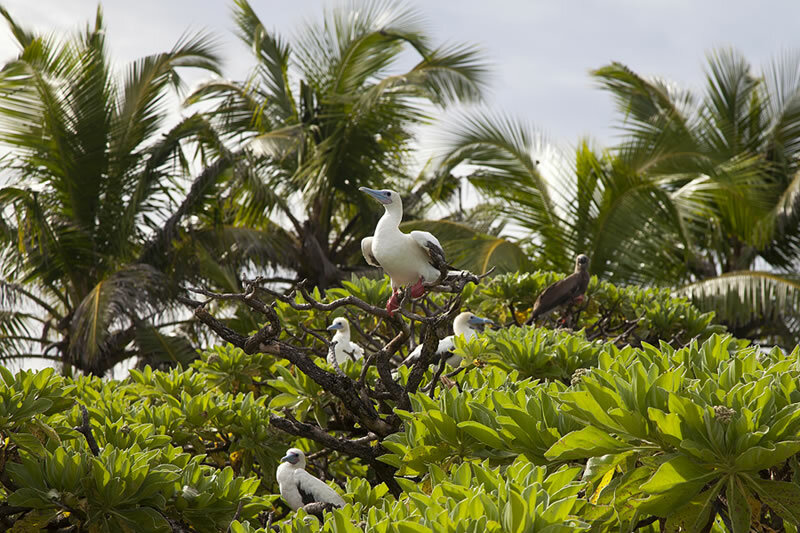 Group of Red-footed Boobies (Sula sula) in a small bare tree. 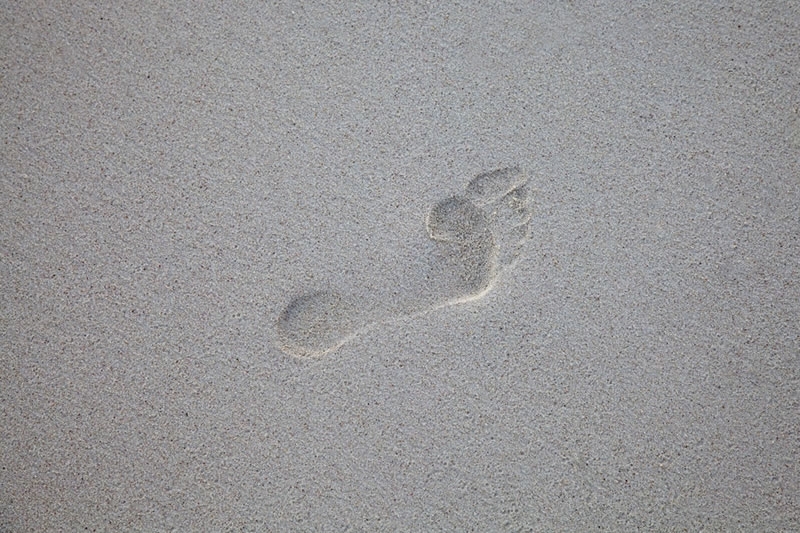 Not Robinson Crusoe but a footprint on a pristine section of the beach. 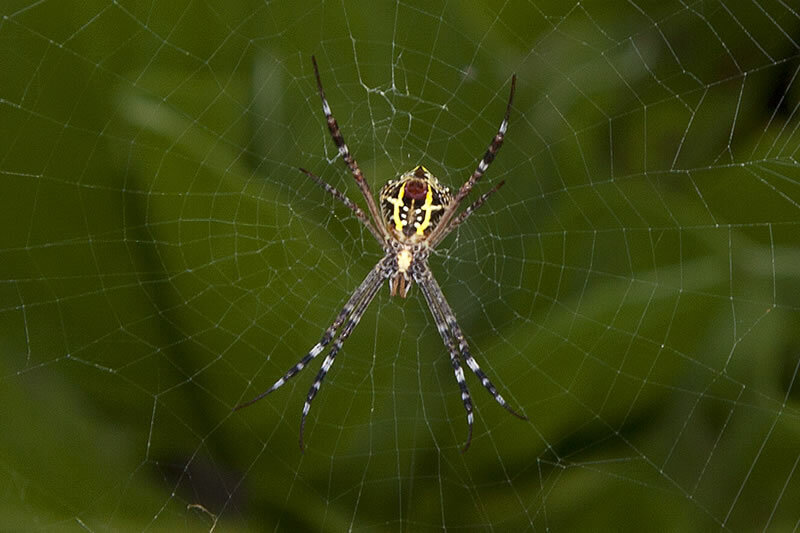 Orb weaver spider (Argiope sp.) 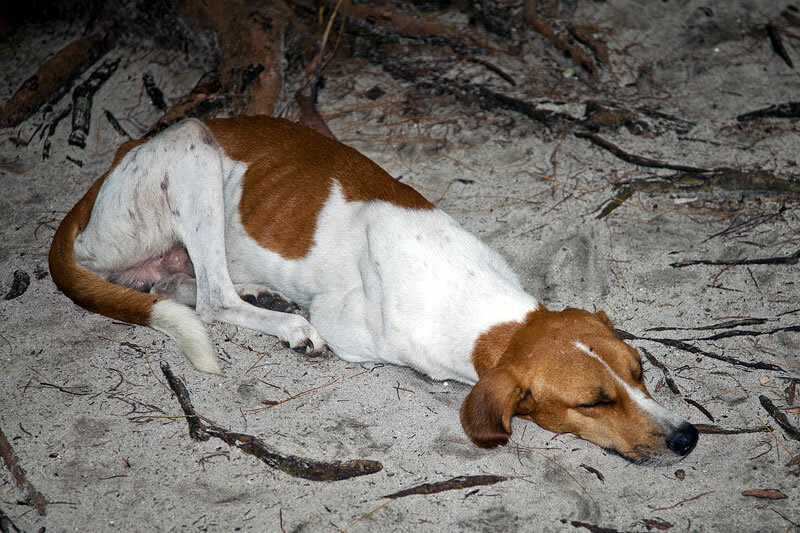 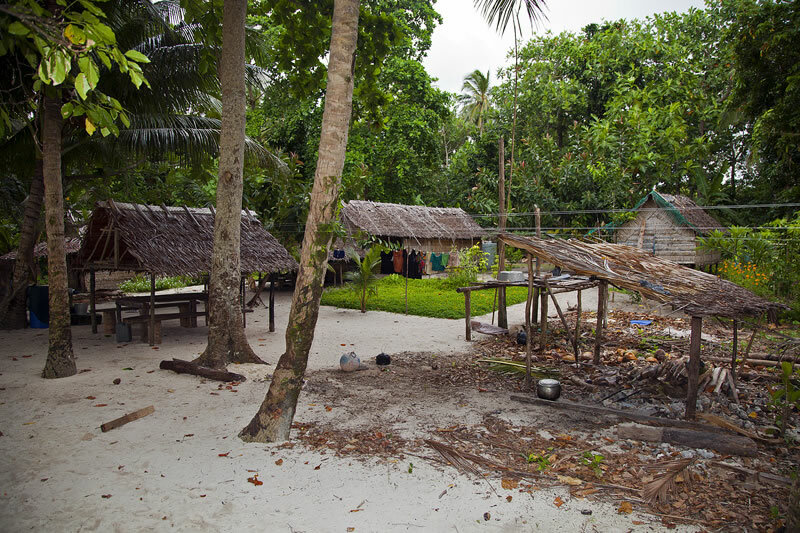 in the vegetation along the beach. 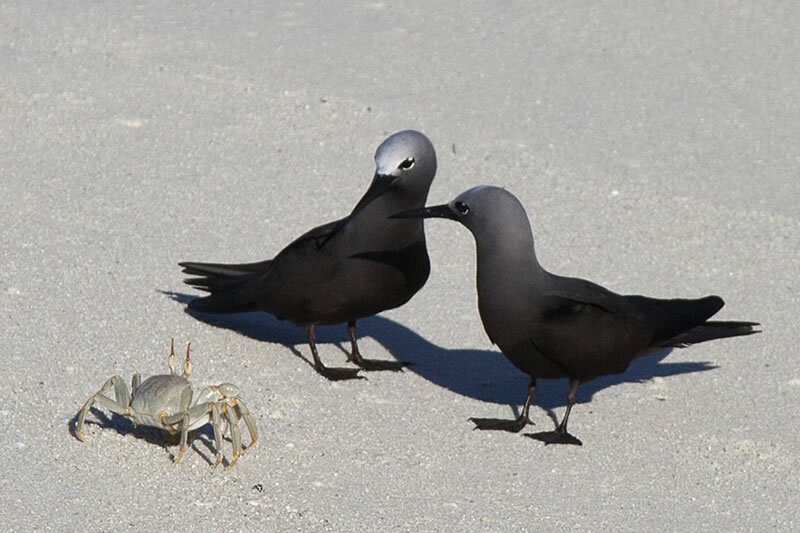 Pair of Lesser Noddies (Anous tenuirostris) and a Horn-eyed Ghost Crab (Ocypode ceratopthalma) have a face-off. 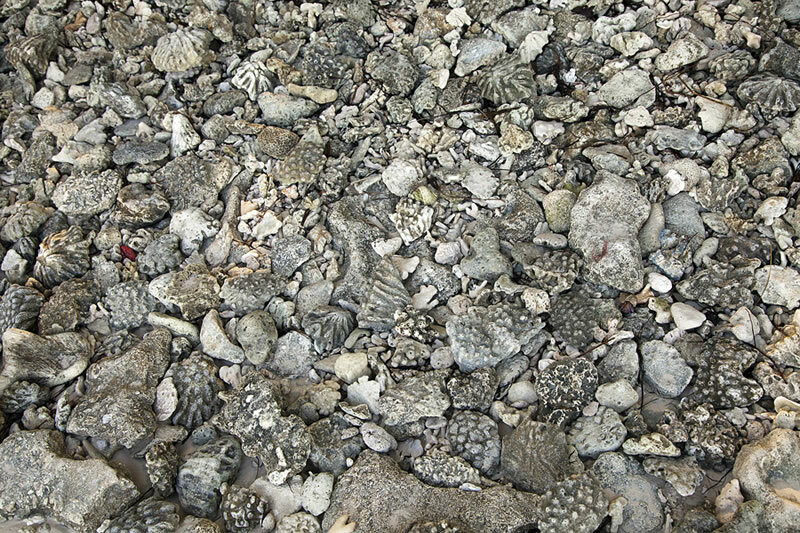 Pavement of coral rubble along the beach on Middle Brother. 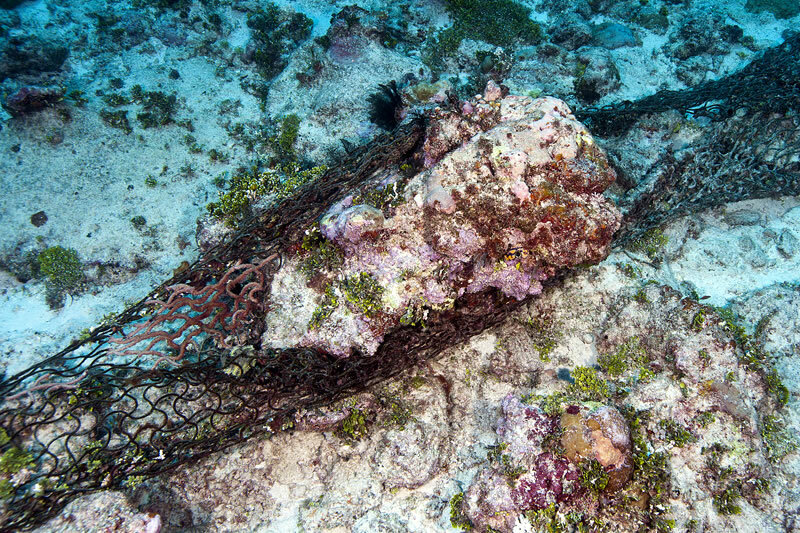 Plastic fishing net float buoy buried in the beach sand. 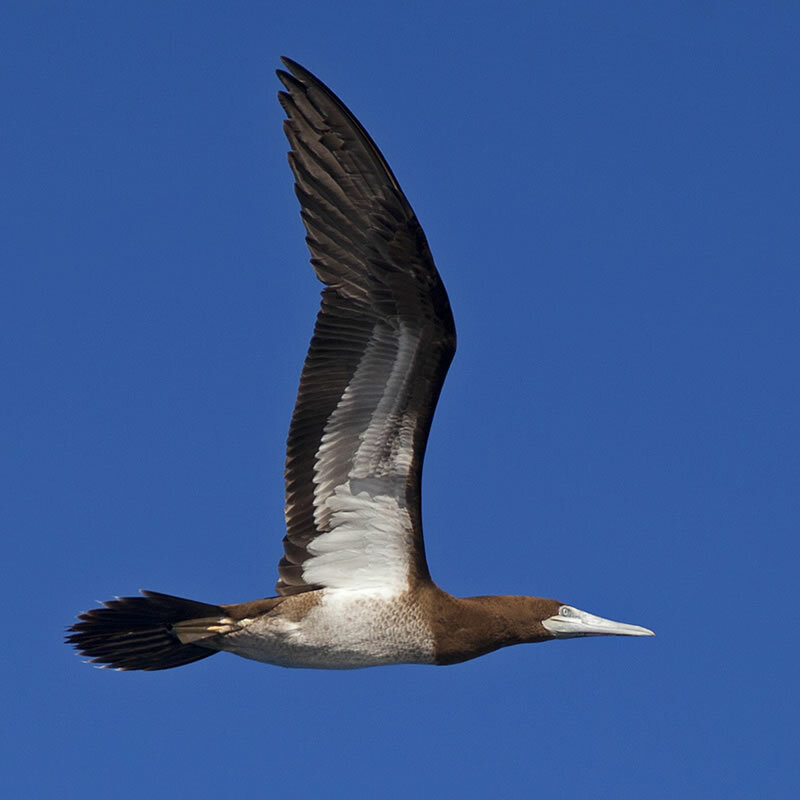 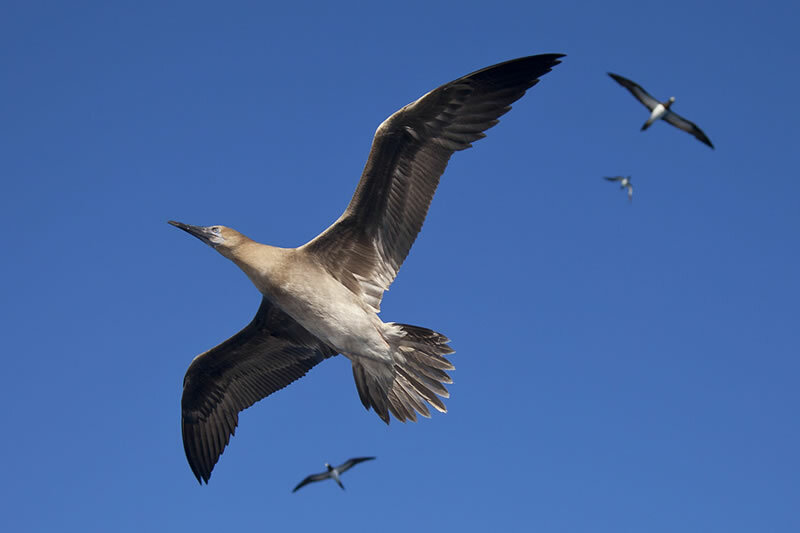 Profile of Brown Booby (Sula leucogaster) as it flies by the dive boat. 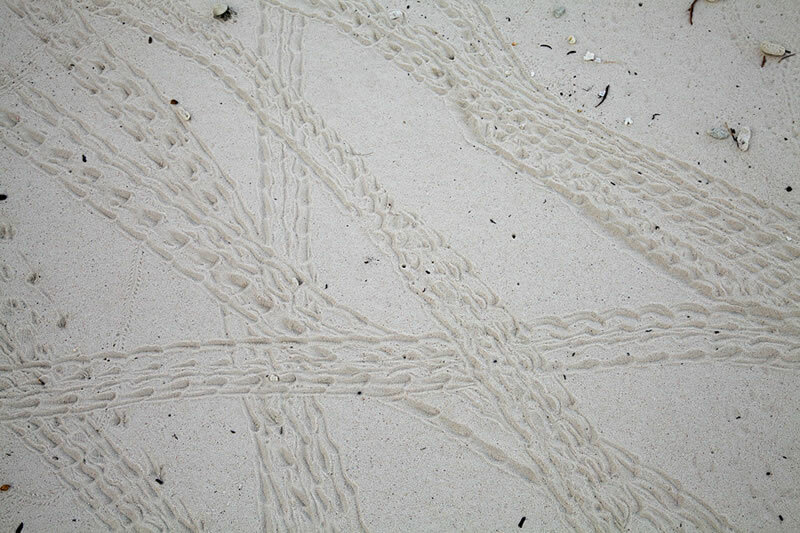 Raceway of overlapping tracks from Strawberry Hermit Crabs (Coenobita perlatus). 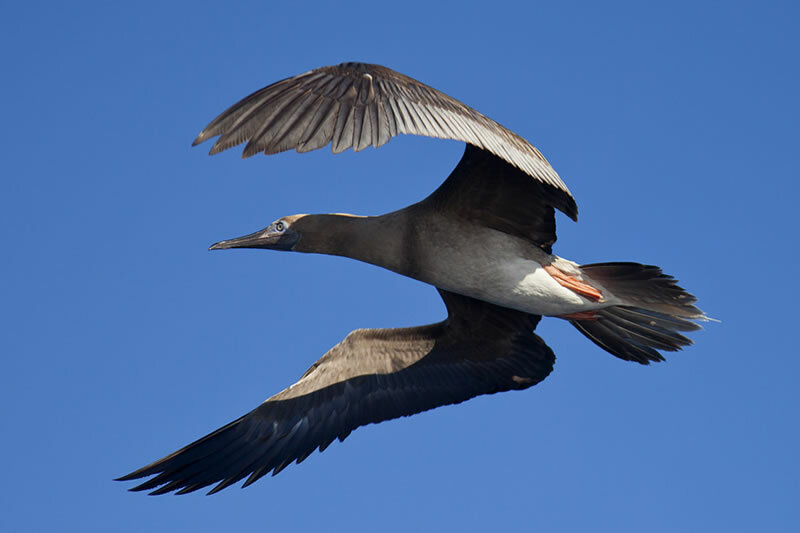 Red-footed Boobies (Sula sula) heads off to sea. 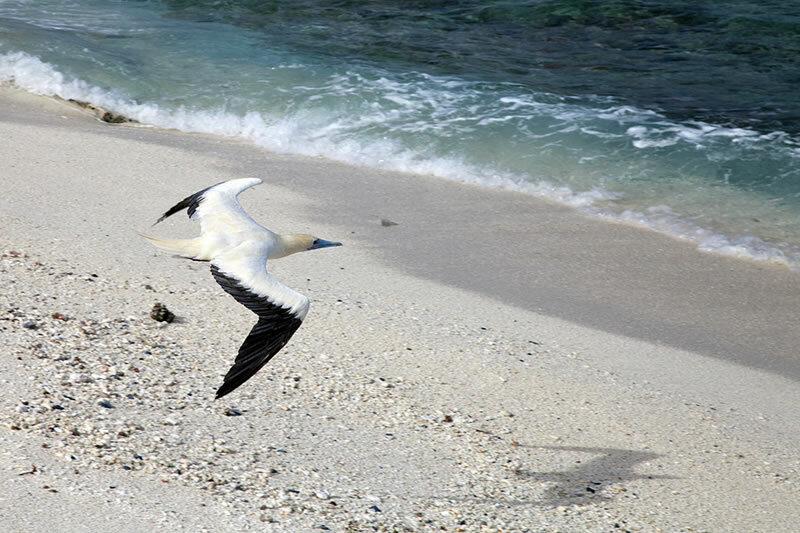 Red-footed Booby (Sula sula) caught mid-flap while flying by. 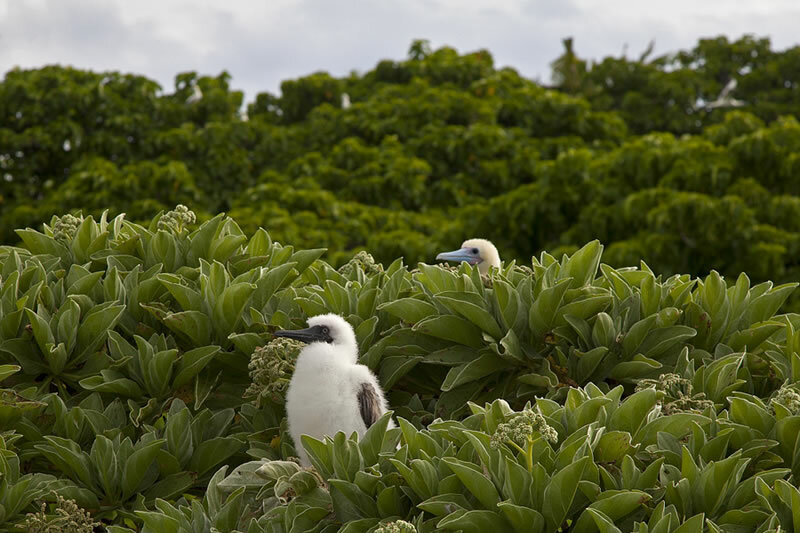 Red-footed Booby (Sula sula) chick near fledging size. 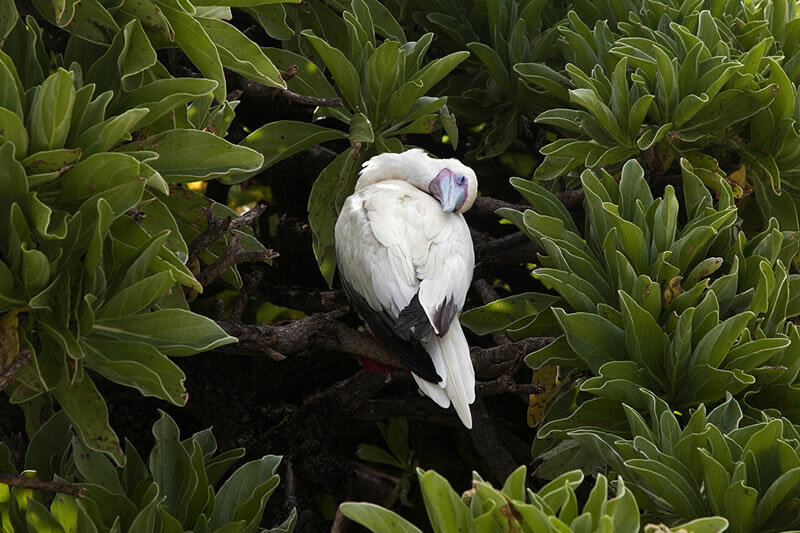 Red-footed Booby (Sula sula) sleeping soundly. 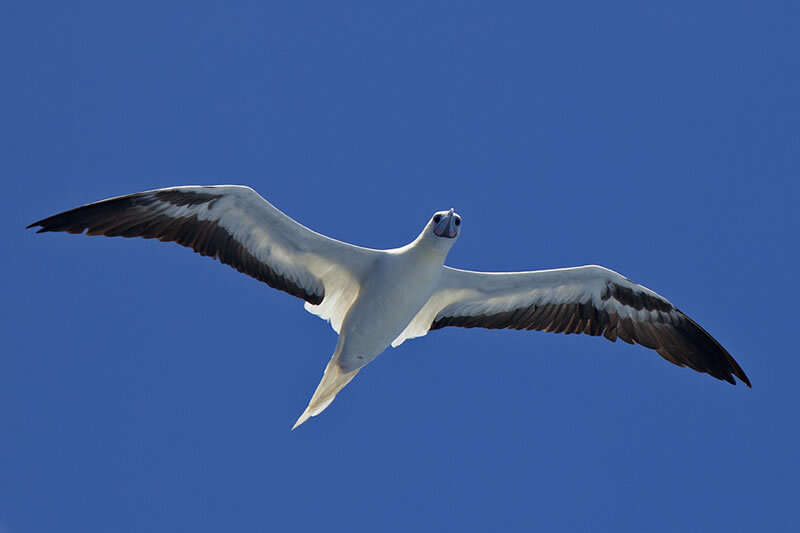 Red-footed Booby (Sula sula) soaring by on a thermal updraft. 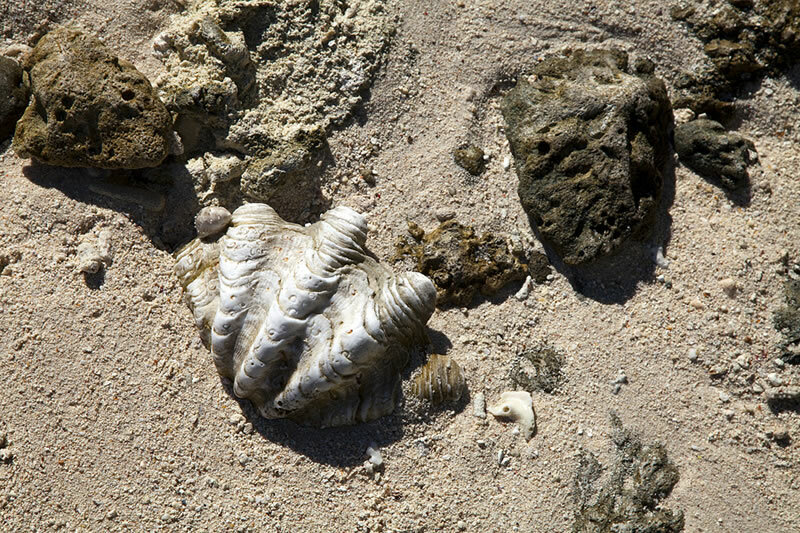 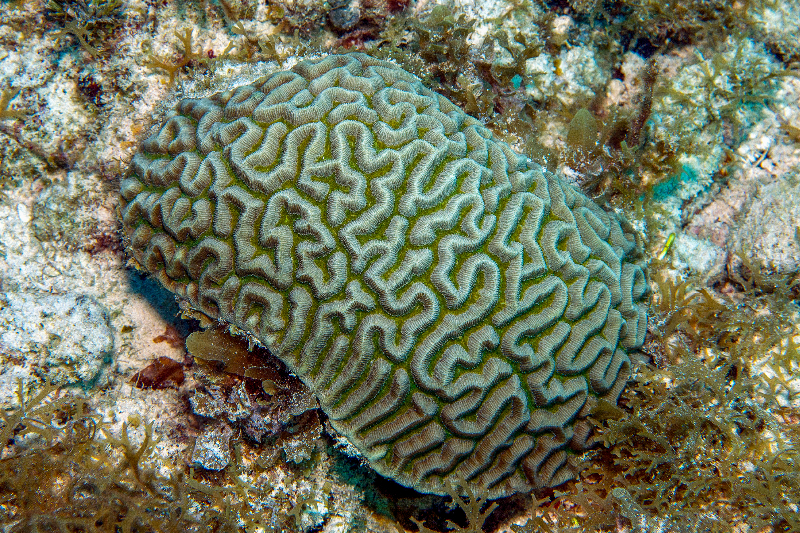 Shell of a giant clam (likely Tridacna squammosa) spotted among the coral rubble. 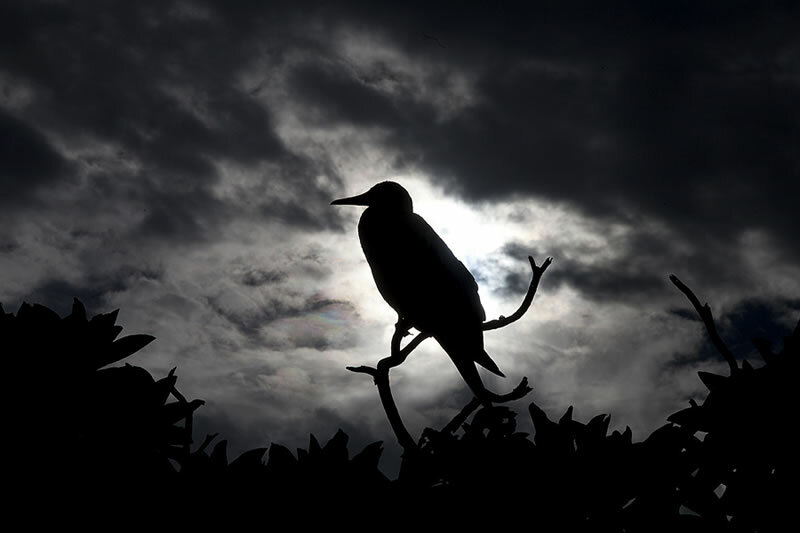 Silhouette of a Red-footed Booby (Sula sula) as the storm clouds roll in. 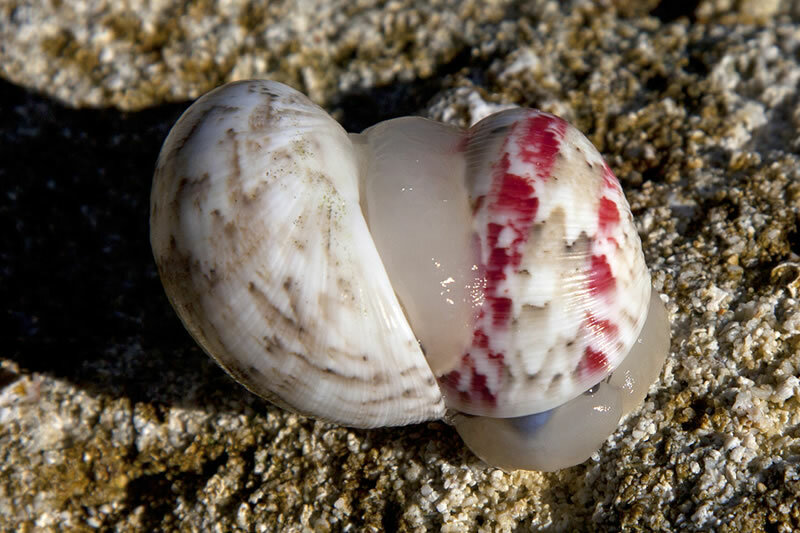 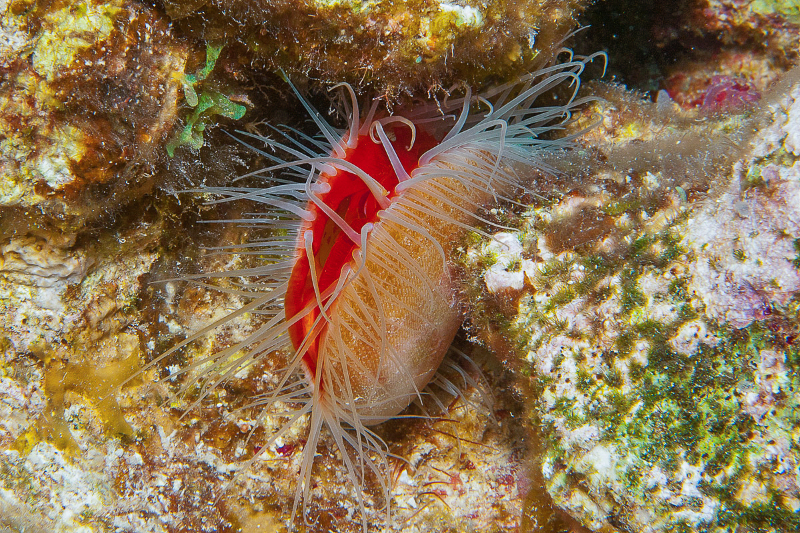 Small hermit--possibly a young Strawberry Hermit (Coenobita perlatus)--inhabiting one of the snail shells. 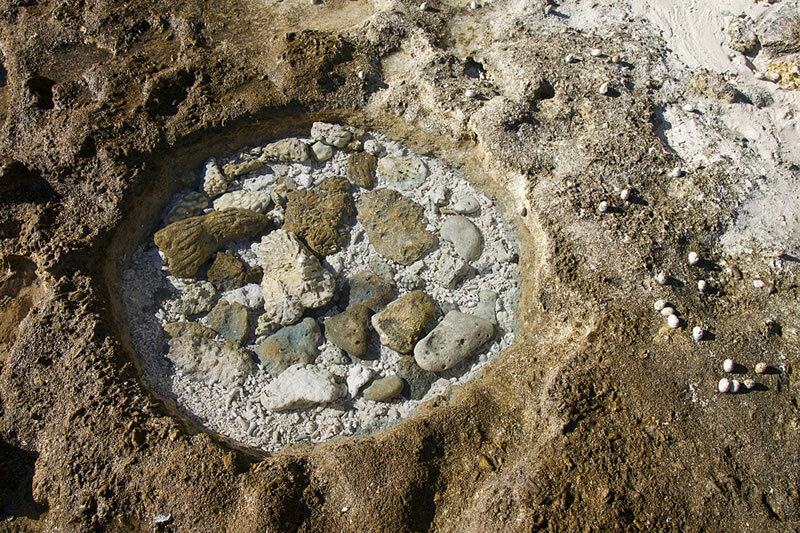 Small round tidepool in a rocky section of the beach likely caused by the rootball of a coconut palm tree. 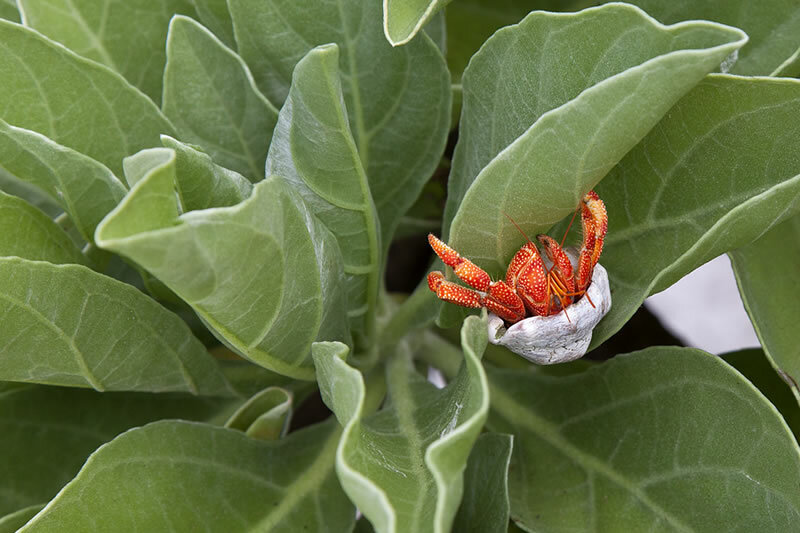 Small Strawberry Hermit Crab (Coenobita perlatus) climbs among the fushy foliage. 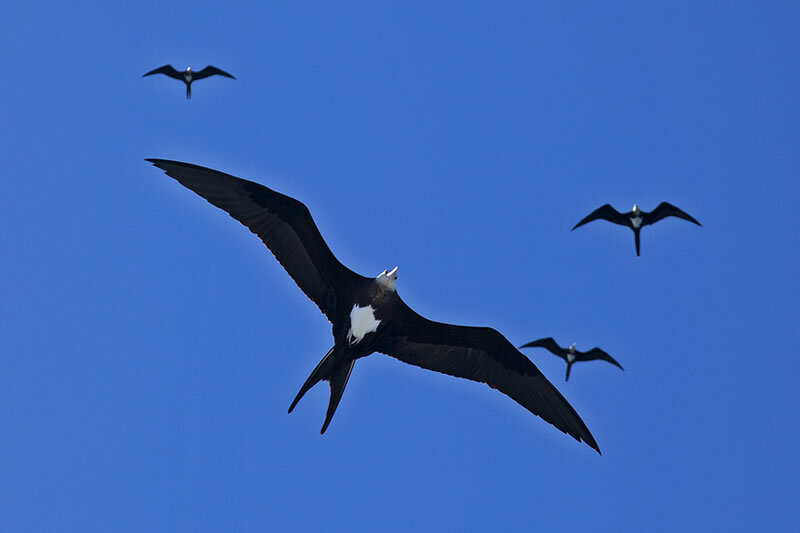 Squadron of female Greater Frigatebirds (Fregata minor). 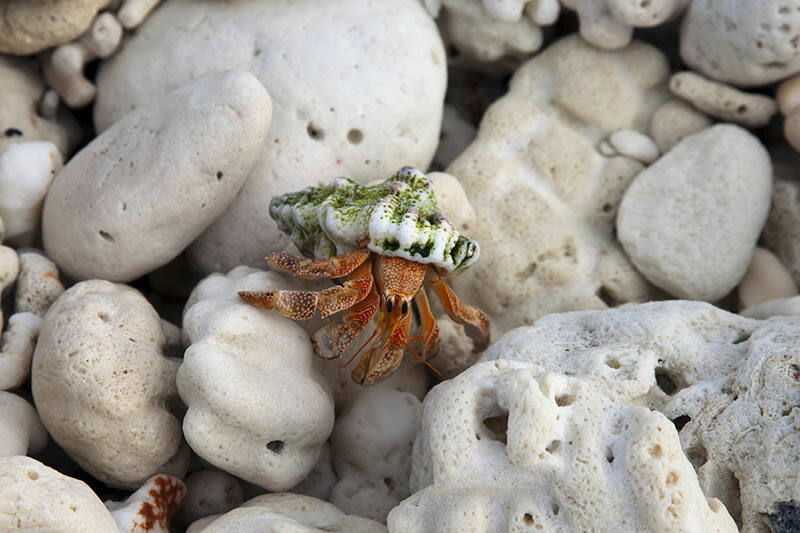 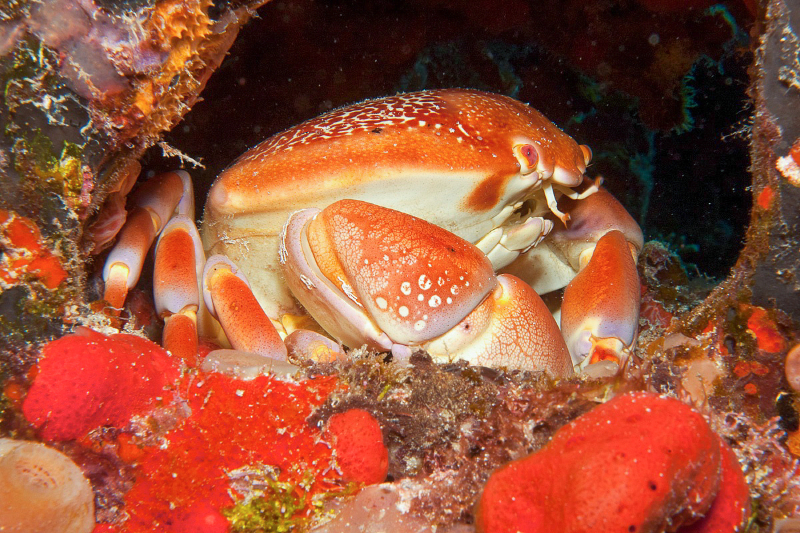 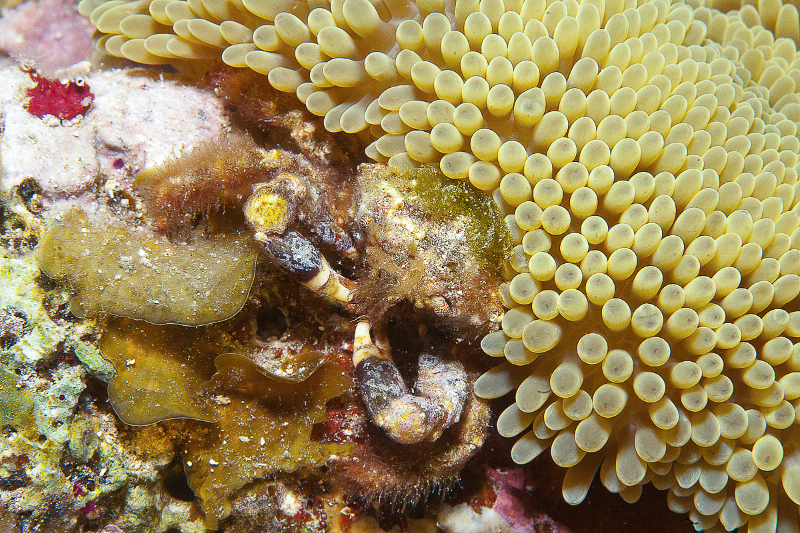 Strawberry Hermit Crab (Coenobita perlatus) scrambles over coral rubble. 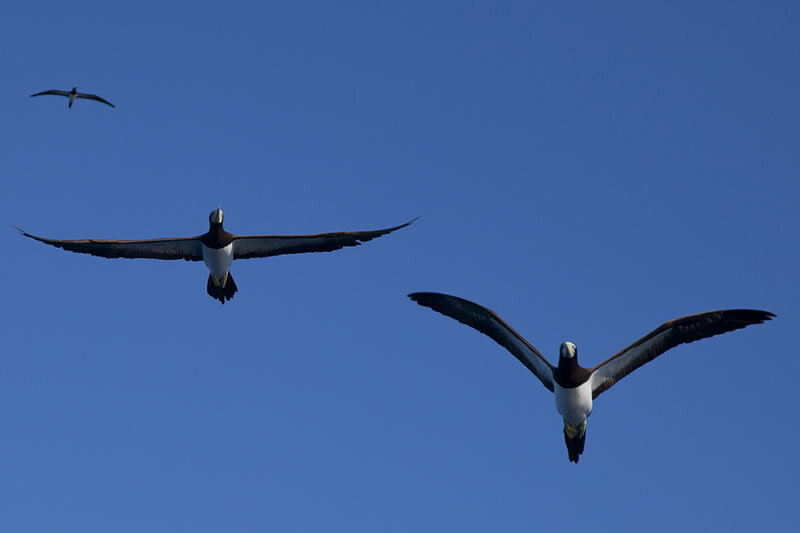 Trio of Brown Boobies (Sula leucogaster). 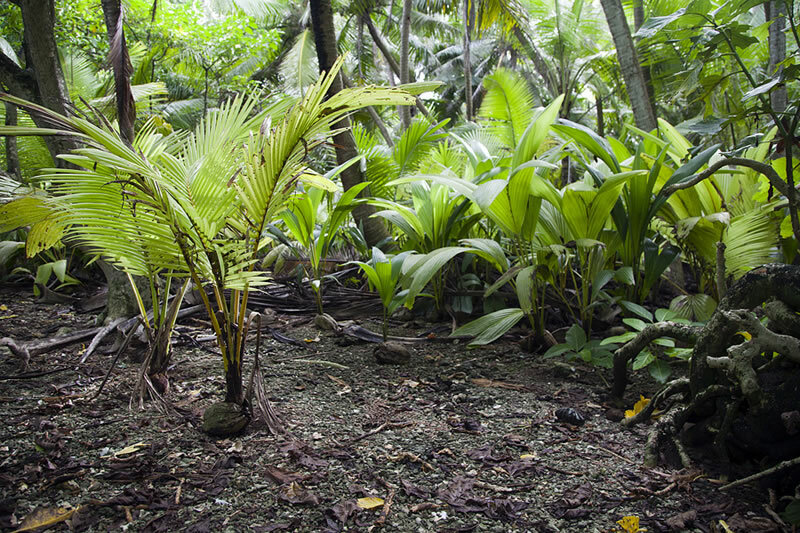 Understory of the coconut palm canopy showing dense thicket of sprouted coconuts. 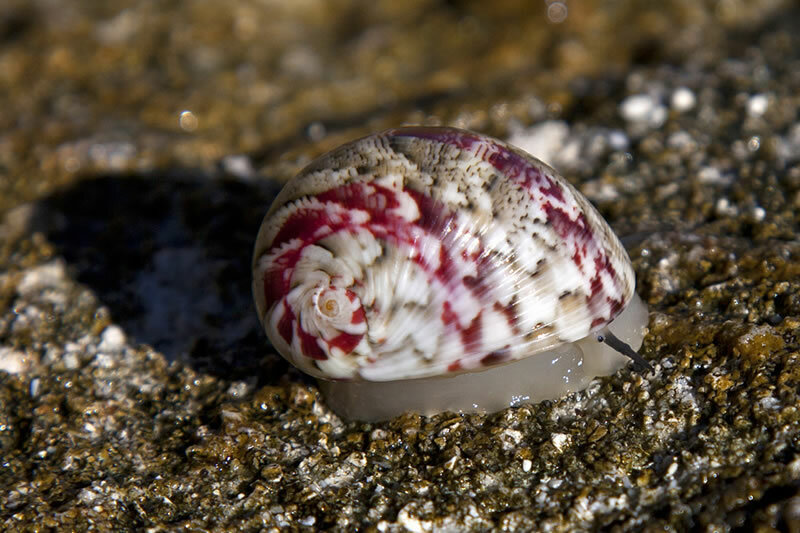 Very decorated snail slowly traversing the rocky shore at the water's edge. 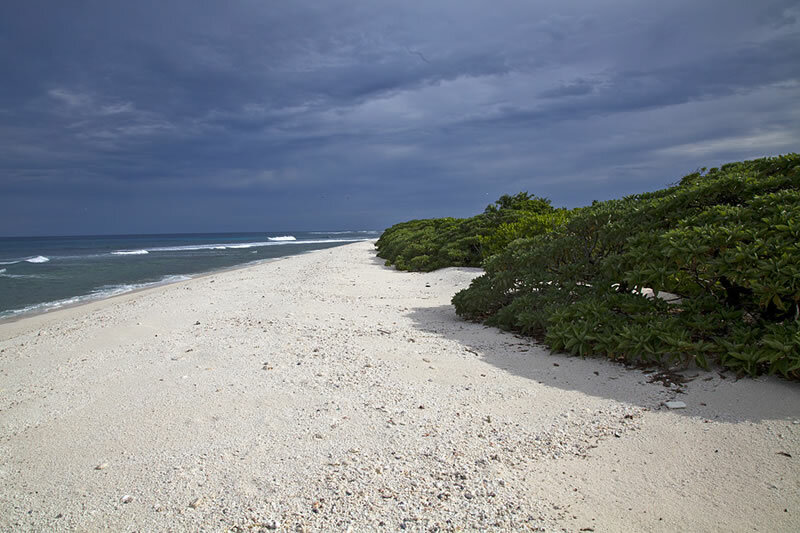 View along the beach on Danger Island. 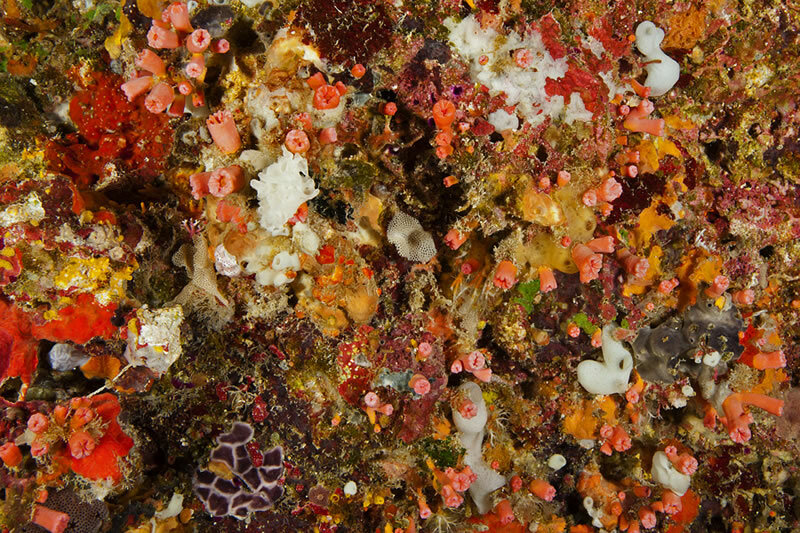 View of a rocky section of the beach with many tide pools on Middle Brother. 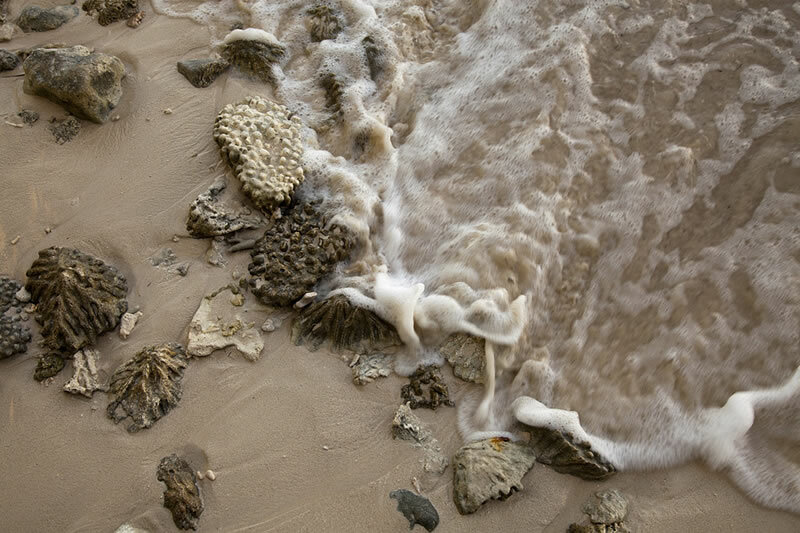 Waves breaking among the coral rubble tossed up on the beach along Middle Brother. 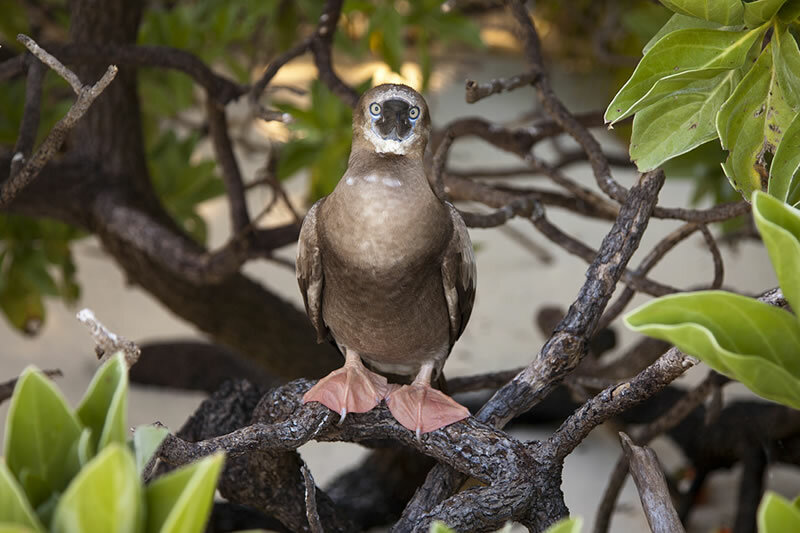 Young Red-footed Booby (Sula sula) stares back inquisitively at the camera. 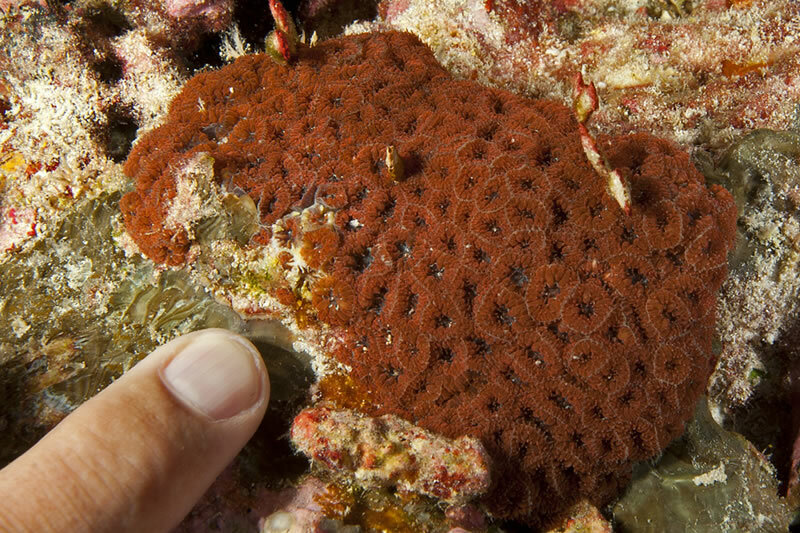 Small colony of Blastomussa merletti coral (with finger for scale) looking like a cluster of zoanthids. 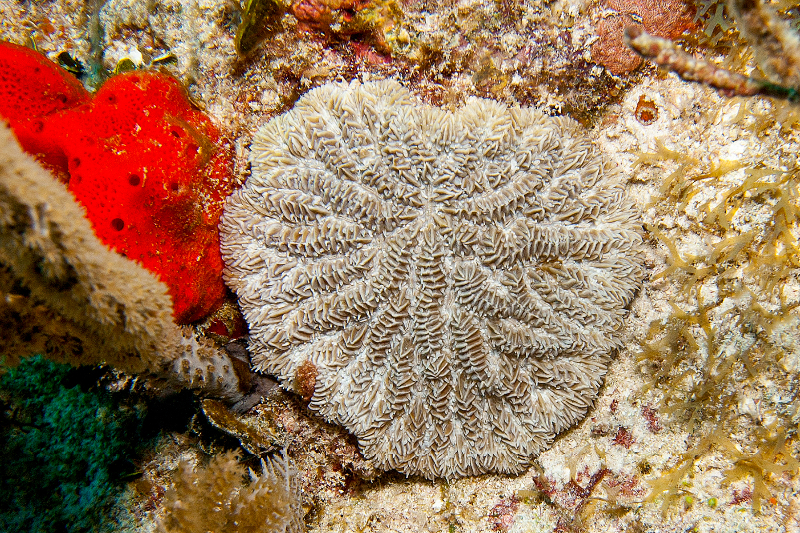 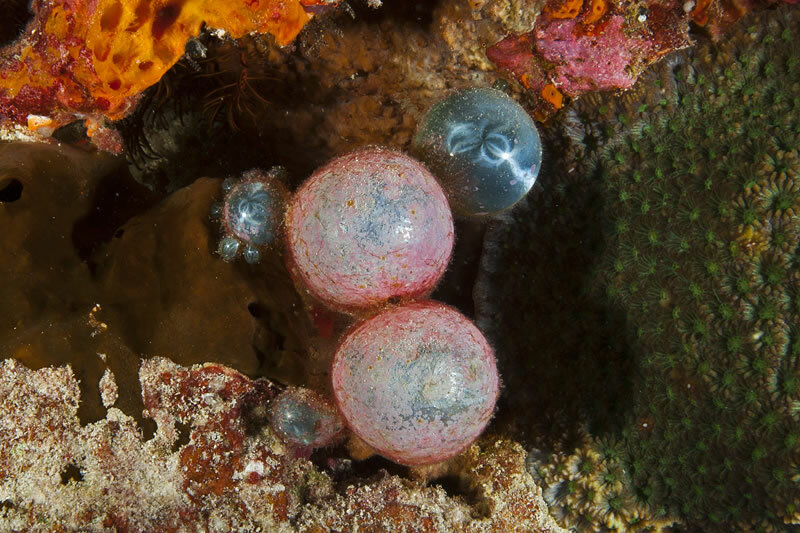 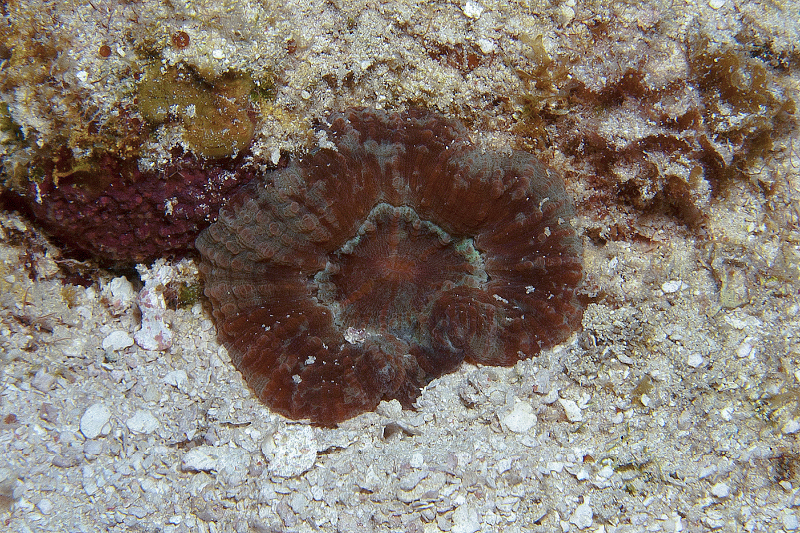 This was a new genus of corals not seen before on the Global Reef Expedition. 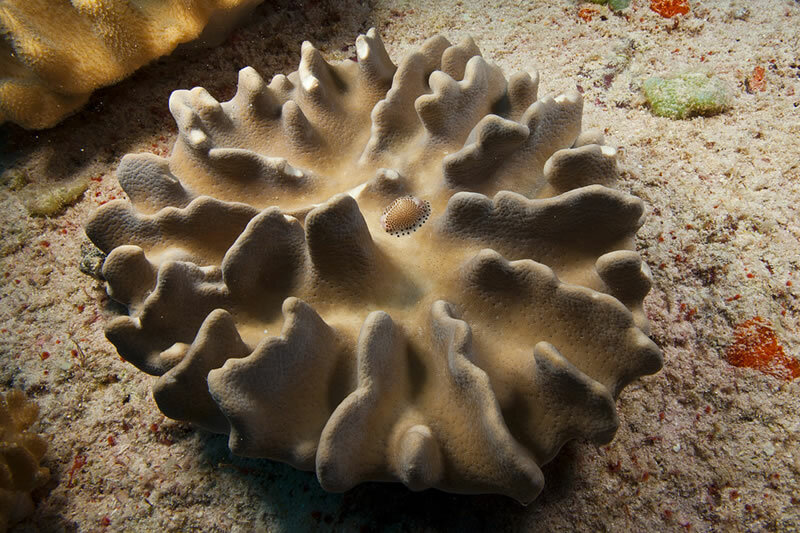 Shortly after spotting a pair of Common Egg Cowries (Ovula ovum) feeding on leather coral we continued to search other leather corals for more cowries. 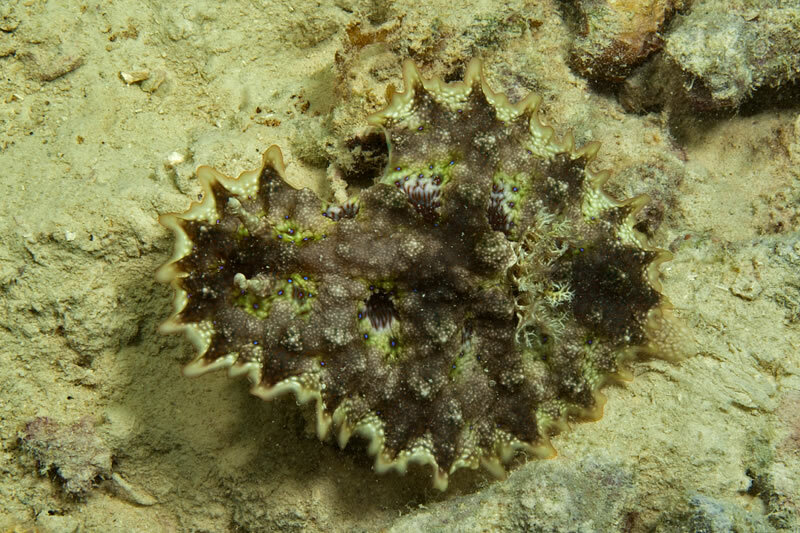 Soon we happened upon a pair of Black-spotted Egg Cowries (Calpurnus verrucosus) which took the opportunity of encountering each other to reproduce. 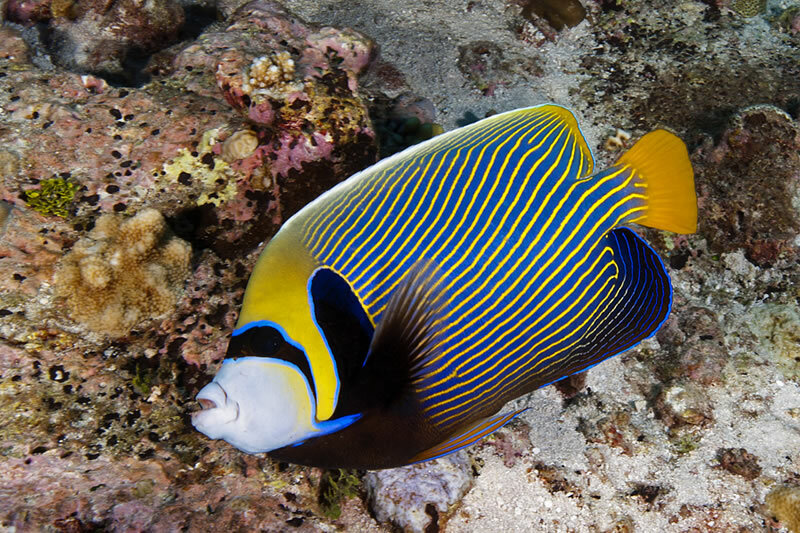 Juvenile Emperor Angelfish (Pomacanthus imperator). 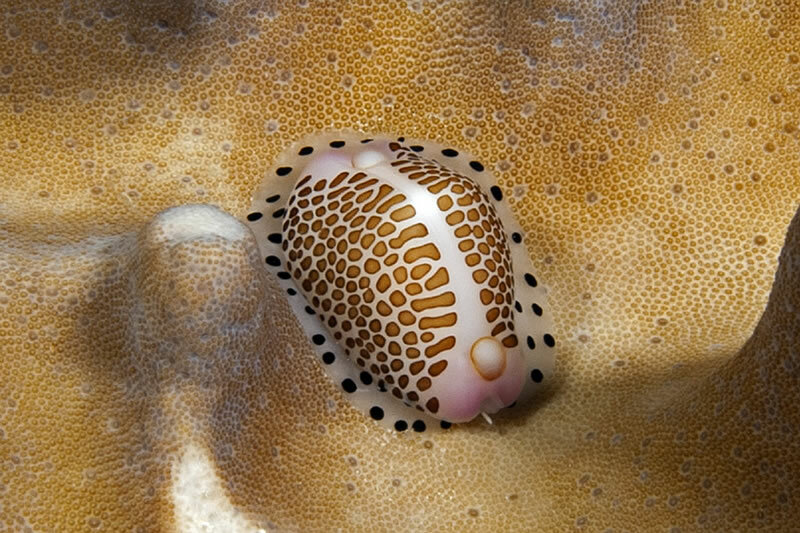 Pair of Common Egg Cowries (Ovula ovum) showing black patterned mantle while feeding upon a leather coral. 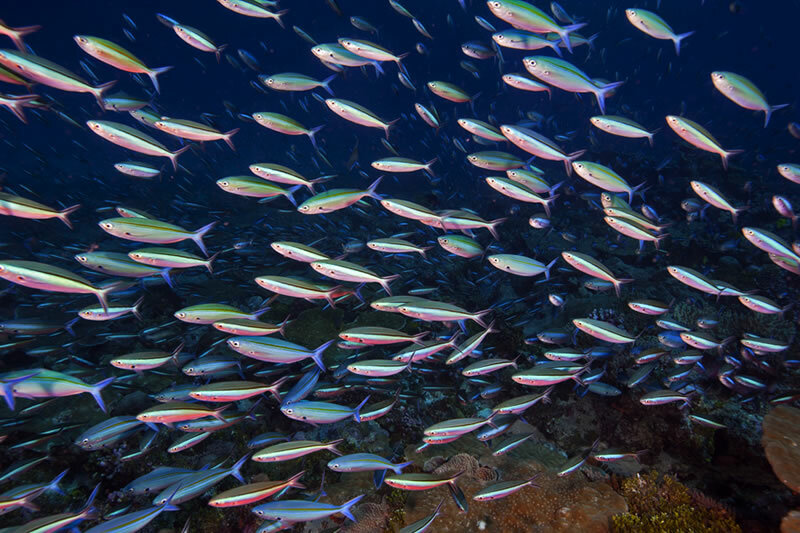 Small school of Rainbow Runners (Elagatis bipinnulatus) that buzzed us on our safety stop at the end of the dive. 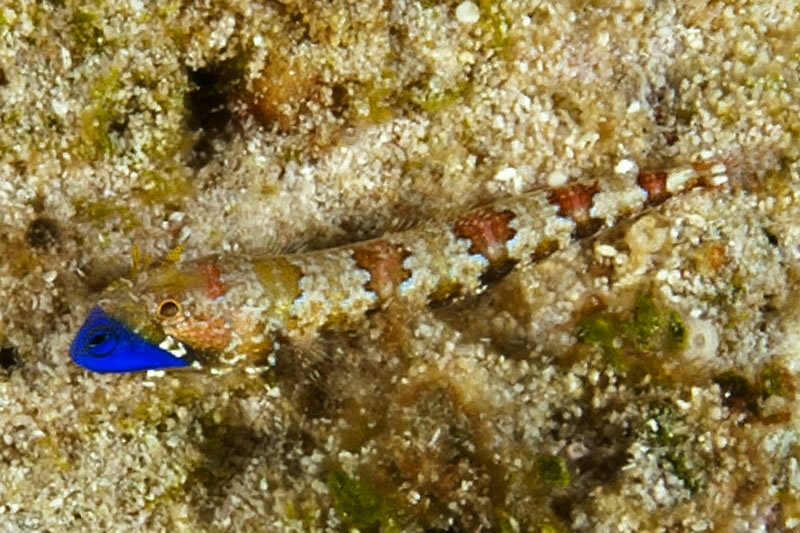 Tiny (finger size) Redmarbled Lizardfish (Synodus rubromarmoratus) snapped up an even tinier blue damselfish. 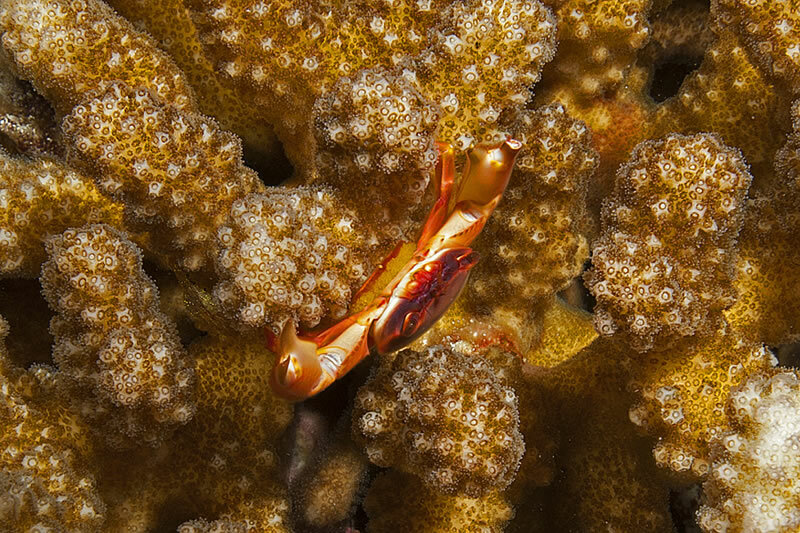 Yellow Dot Guard Crab (Trapezia lutea) in branching Pocillopora coral exposing a clutch of eggs under her abdominal flap. 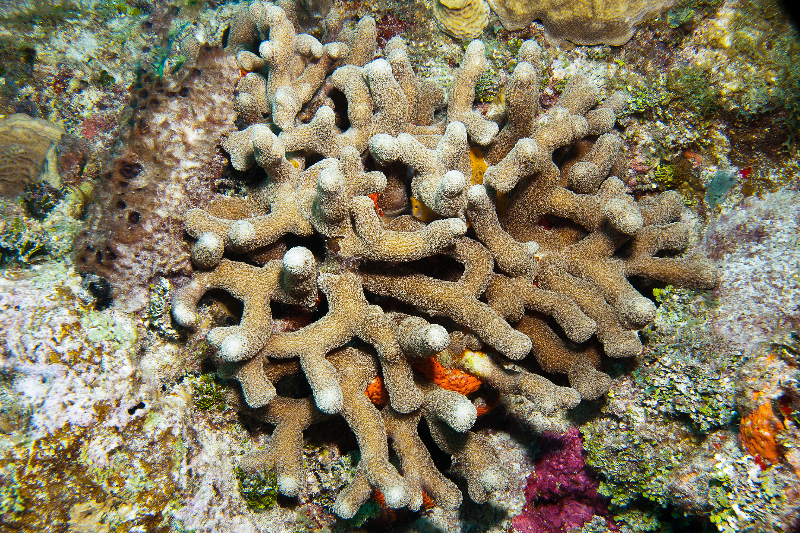 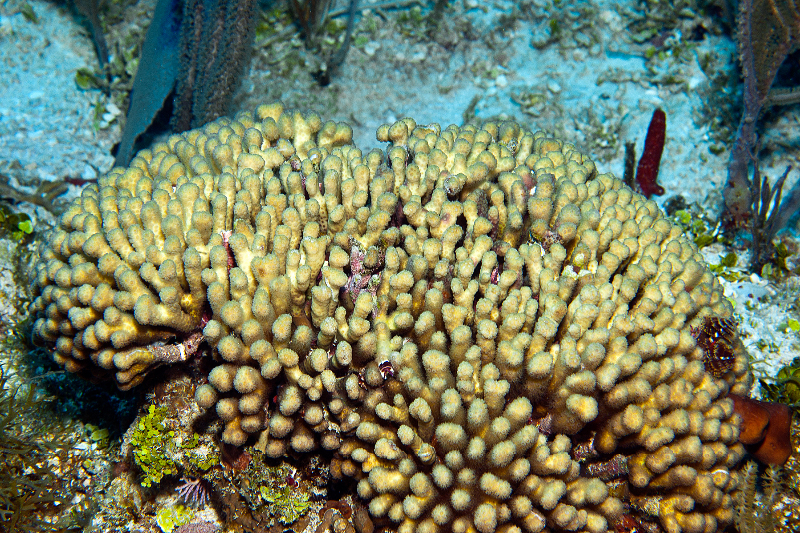 Branching Acropora sp. 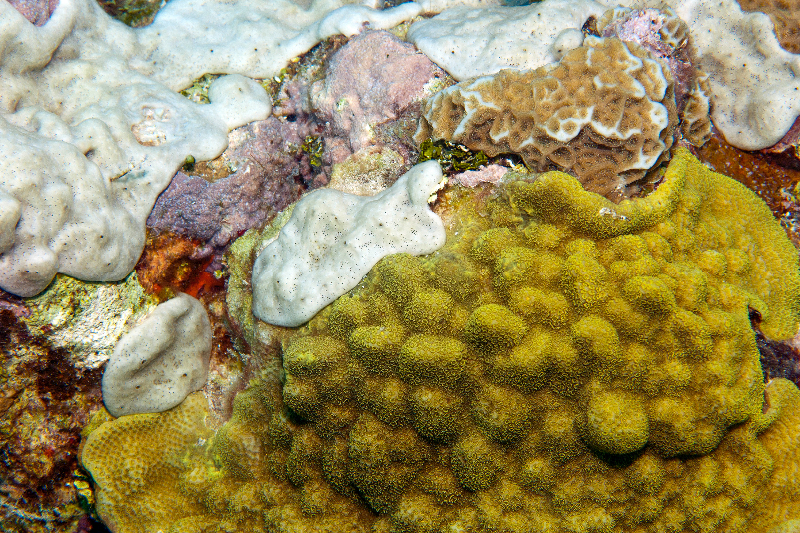 coral showing evidence of a lot of damage from fish bites. 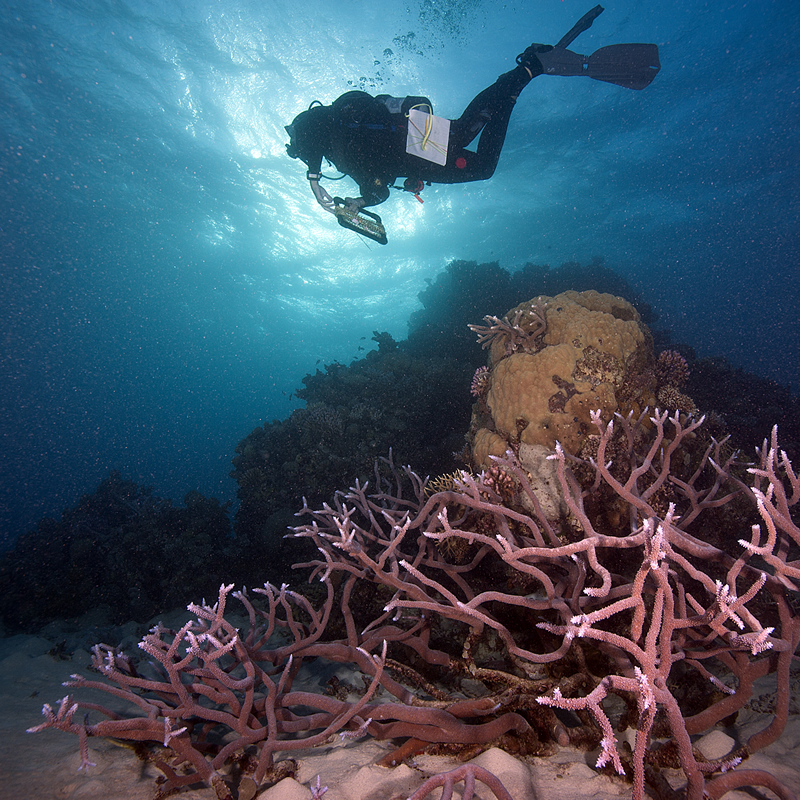 Anderson Mayfield photographing a pale branch of the Cauliflower coral, Pocillopora verrucosa, that he is about to take a small sample from for later analysis which may lead to an answer as to why this portion of the colony had lost their algal symbionts and bleached. 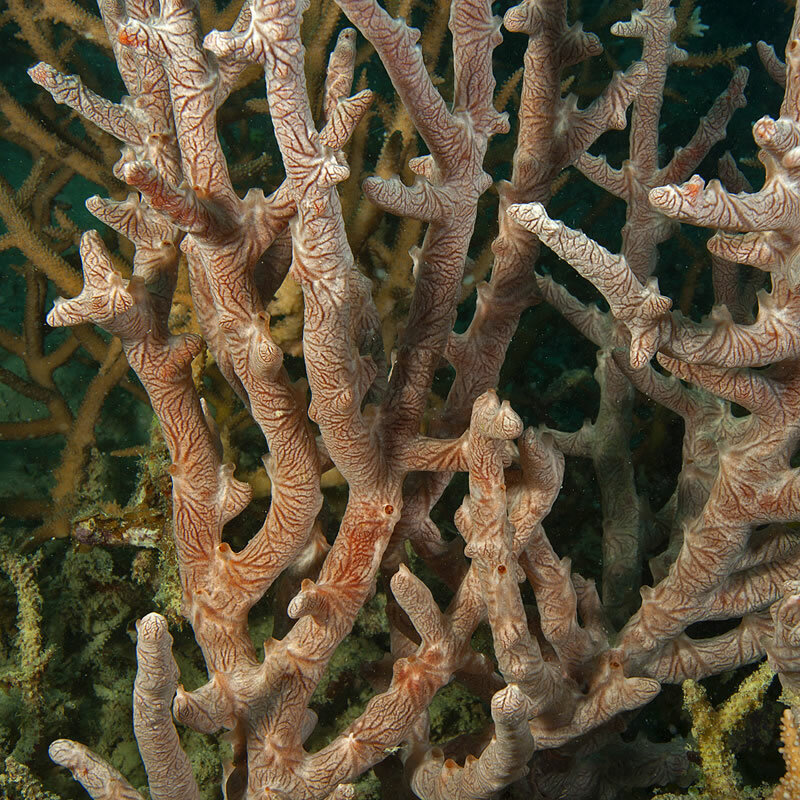 Detail of organgish pink gorginian sea fan showing tiny orange polyps scattered along the network of branches. 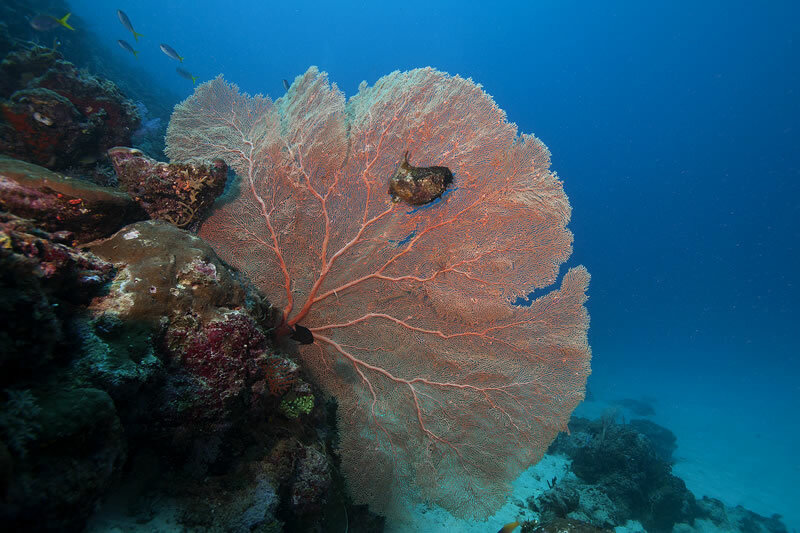 Large organgish pink gorgonian sea fans show this are is subject to high currents. 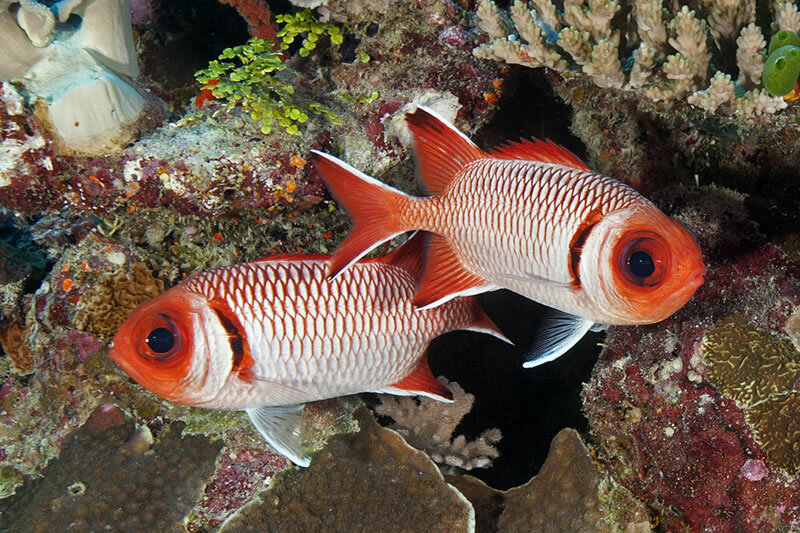 Pair of Splendid Soldierfish (Myripristis botche) displaying large eyes and bold colors and markings. 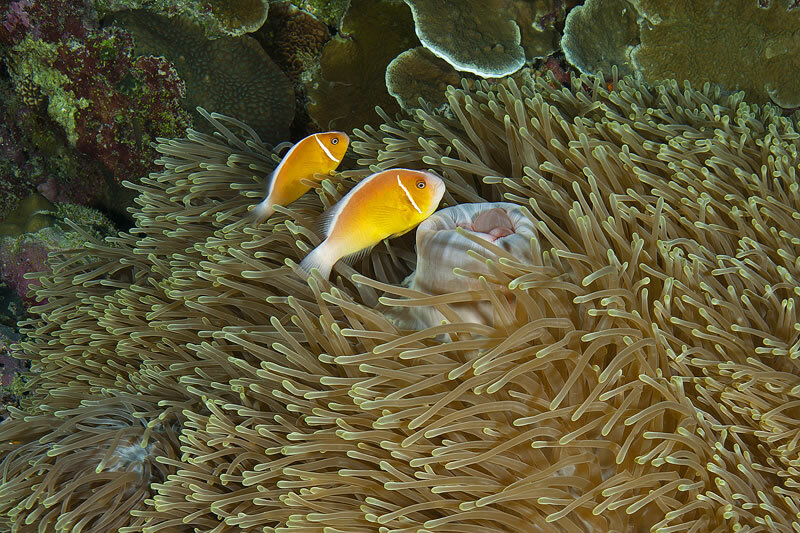 Pair of Two-banded Anemonefish (Amphiprion bicinctus) in a Bubble-tip Anemone (Entacmaea quadricolor). 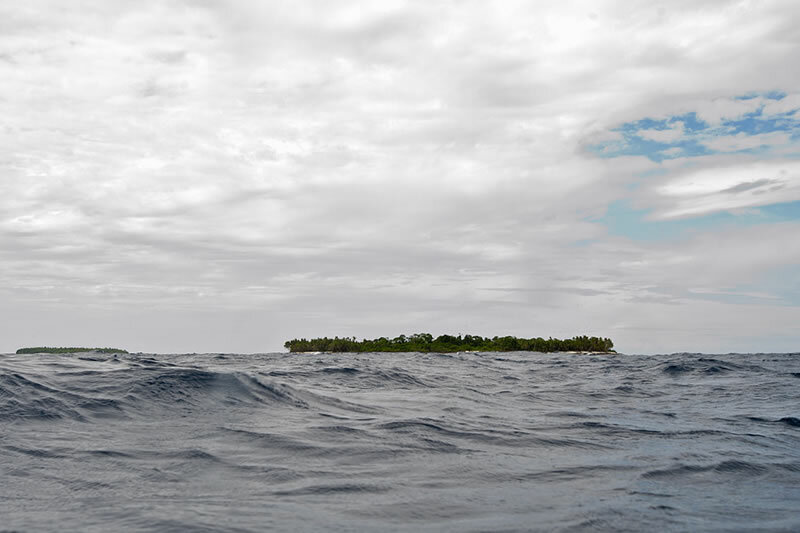 Water level view of Middle Brother Islands taken at the surface while waiting to be picked up by the dive boat. 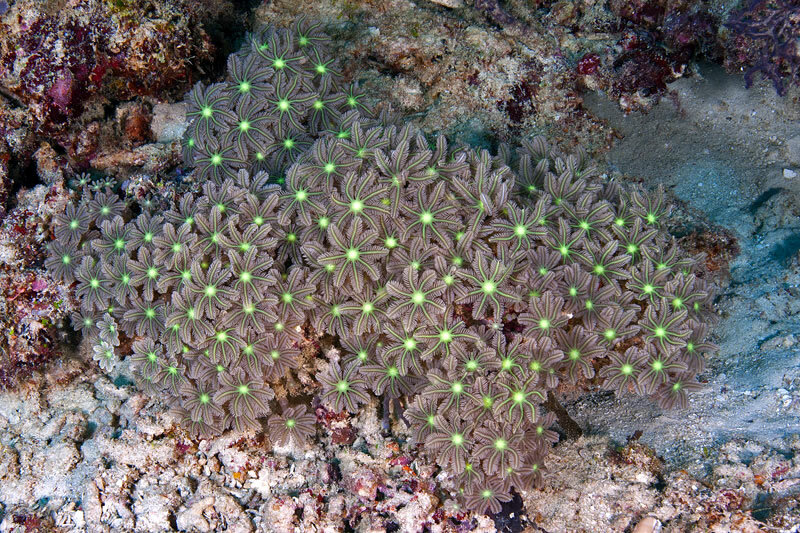 Bladelike plates of the Blue Coral (Heliopora coerulea) form a mazelike structure. 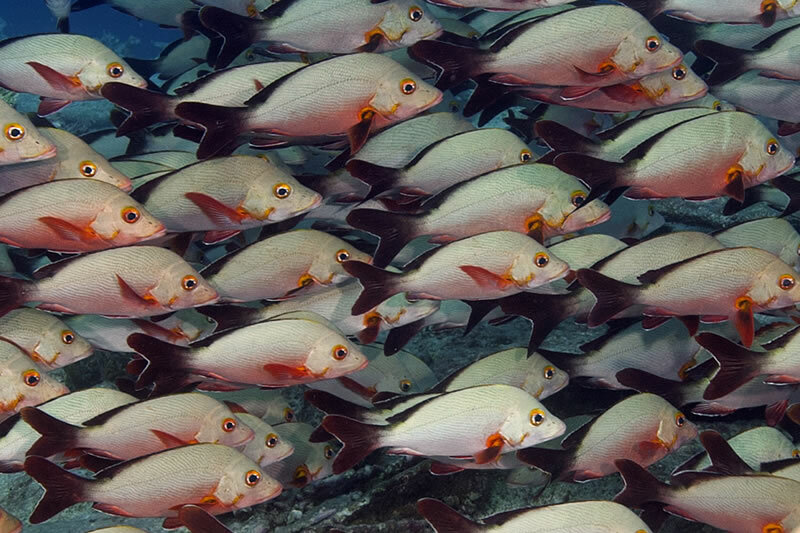 Detail of the school of Humpback Snapper (Lutjanus gibbus). 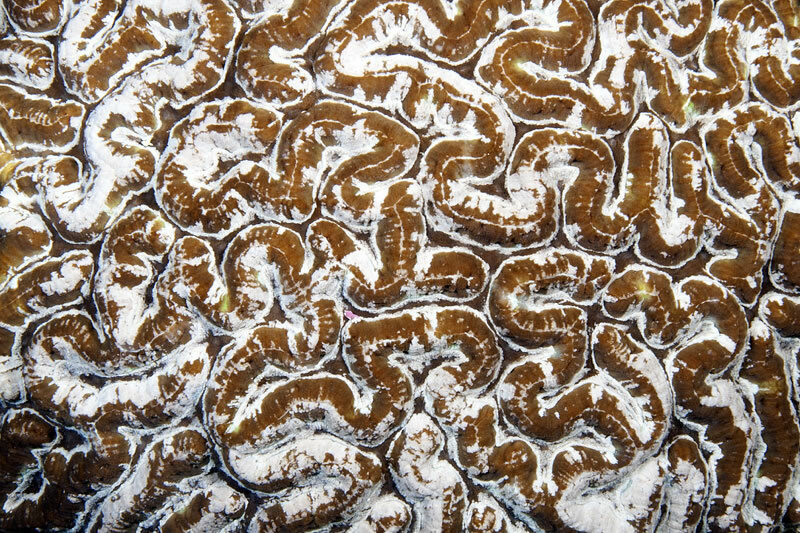 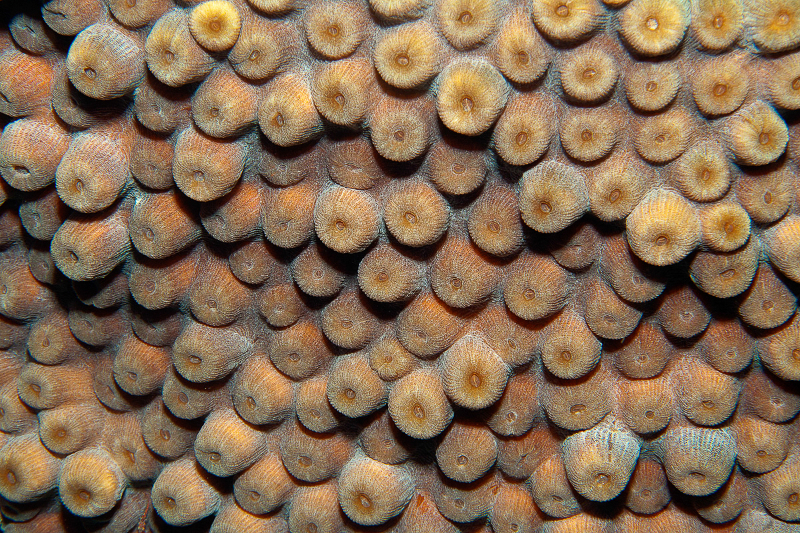 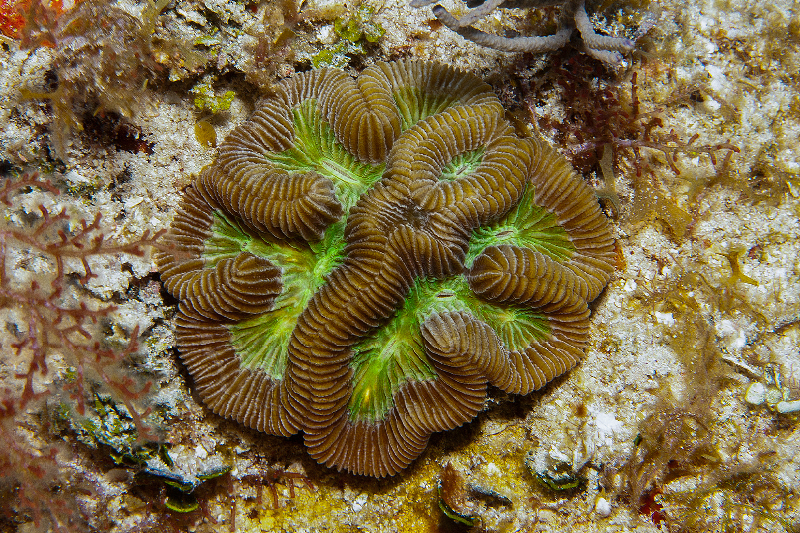 Foliose plates of Echinopora coral form a spiraled pattern when viewed from above. 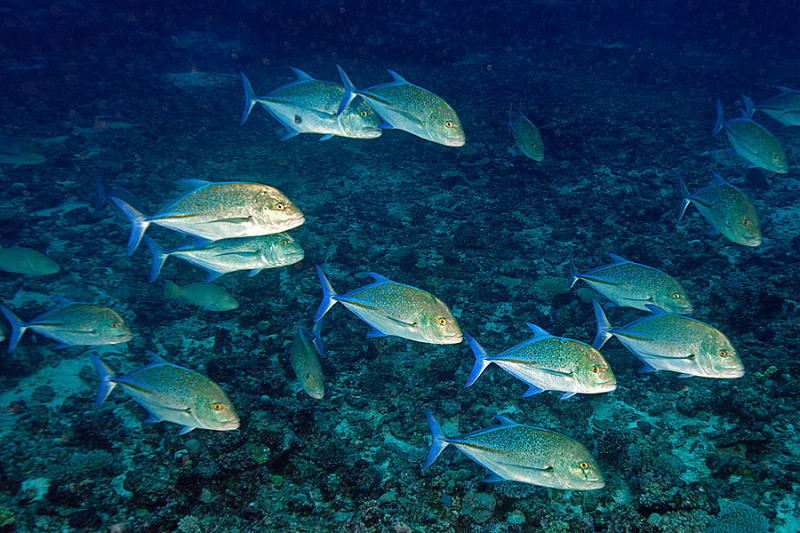 Large school of Humpback Snapper (Lutjanus gibbus) swim over large table acroporids along the edge of a drop-off. 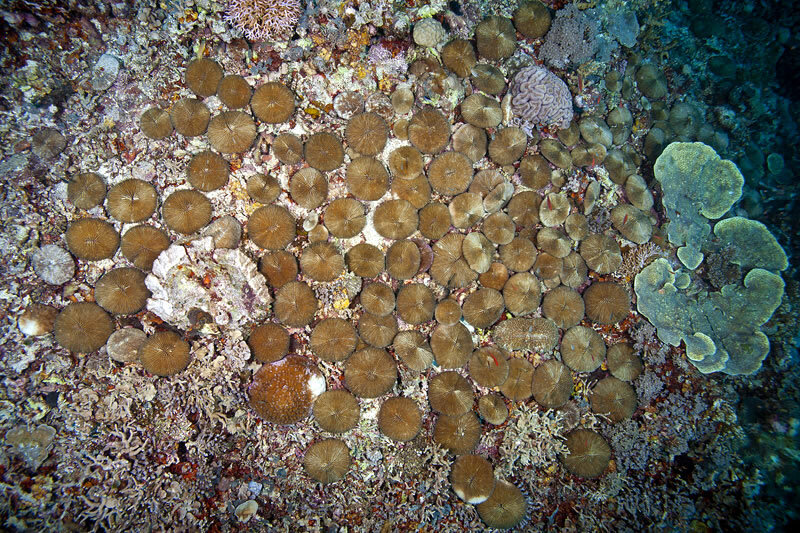 Large table acroporids and branching pocilloporids covered this site. 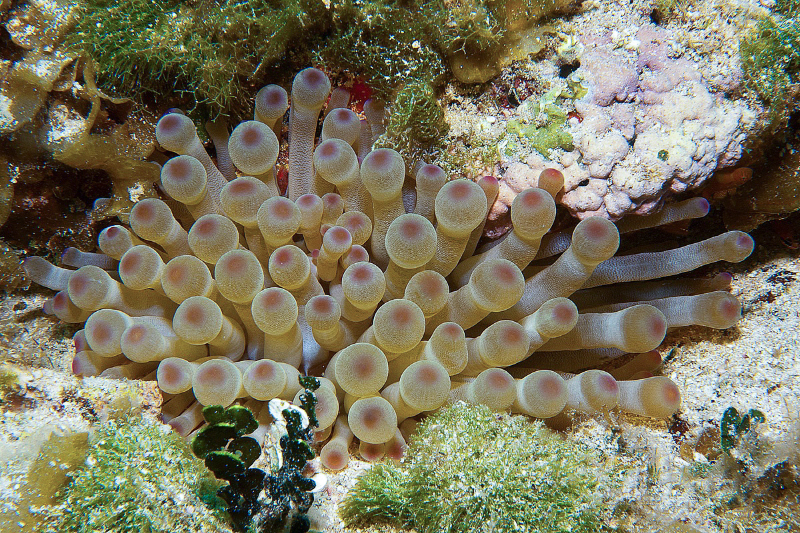 I found this Magnificent Sea Anemone (Heteractis magnifica) in its contracted state, balled-up with most of its tentacles tucked inside. 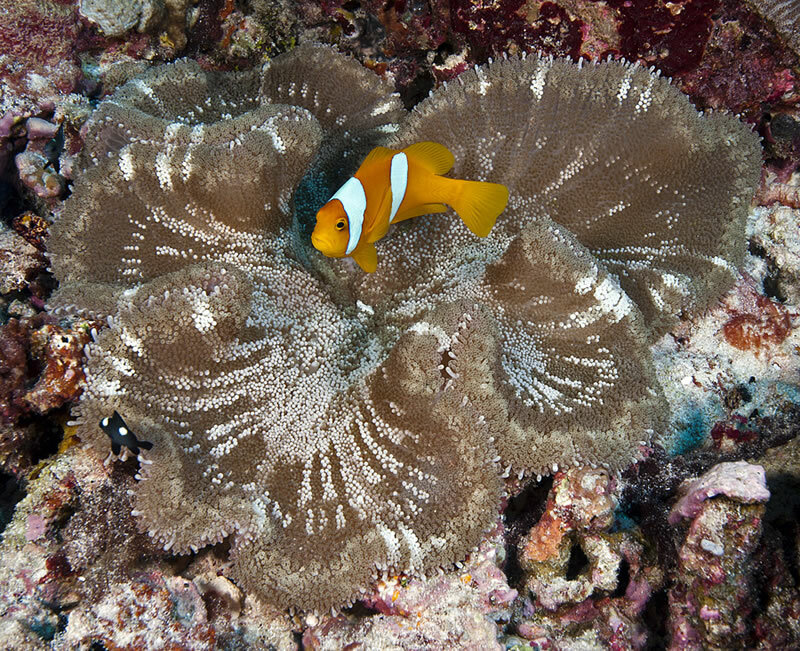 The larger Two-banded Anemonefish (Amphiprion bicinctus) moved away from the anemone every time I came close for a photo rather than tucking itself inside and hiding within the tentacles as usual. 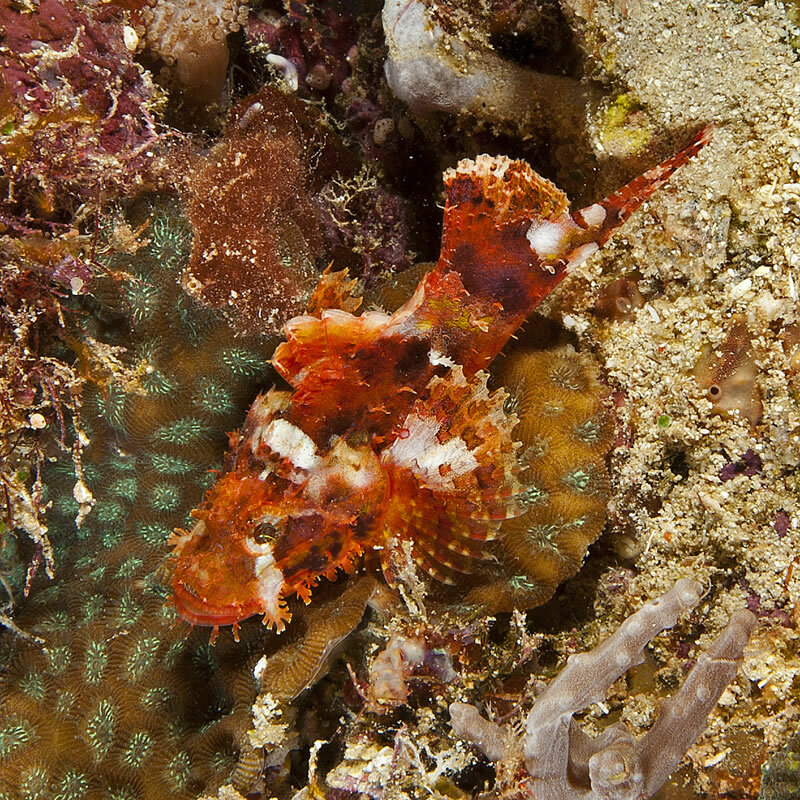 It took me 10 minutes and more than two dozen photos to get this but I did get a bonus of a pair of juveniles to add to the family photo. 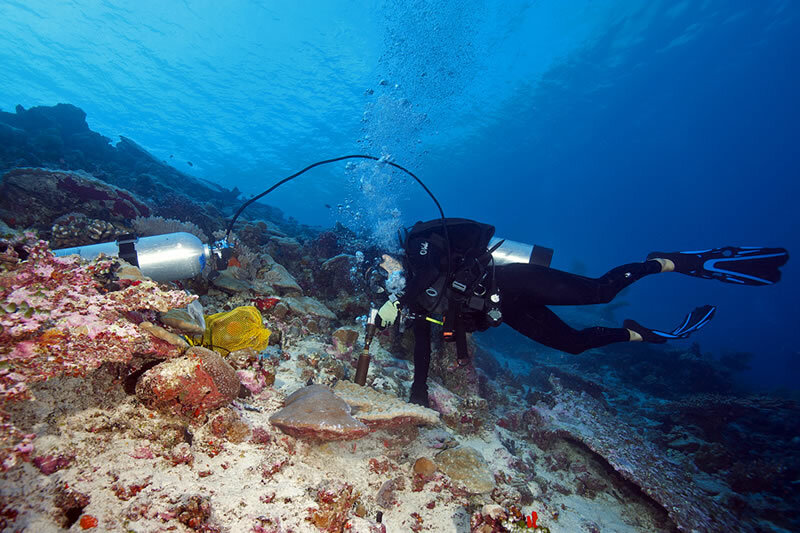 Lauren Valentino operates a pneumatic hand drill powered by a scuba tank to use a diamond tipped hole saw to extract sample corals from Porites lobata colonies. 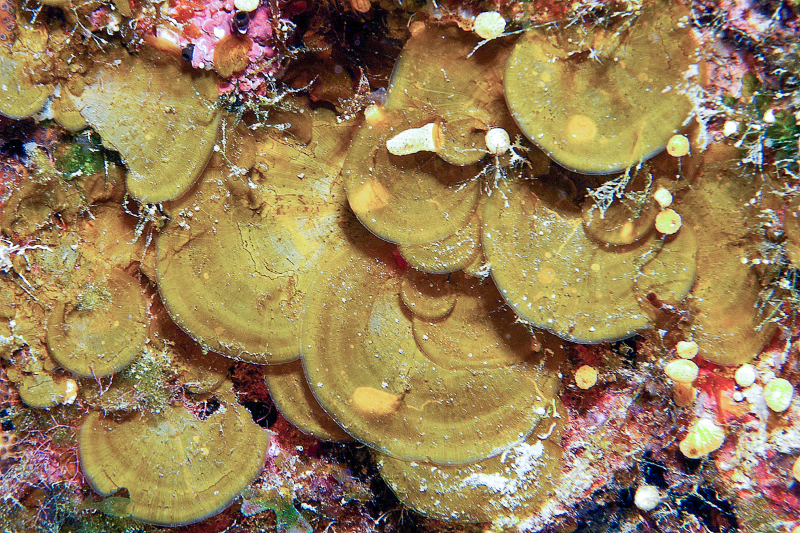 The cores are later sliced thinly and imaged with a CAT scanner to count the growth bands determining the growth rate of the colony. 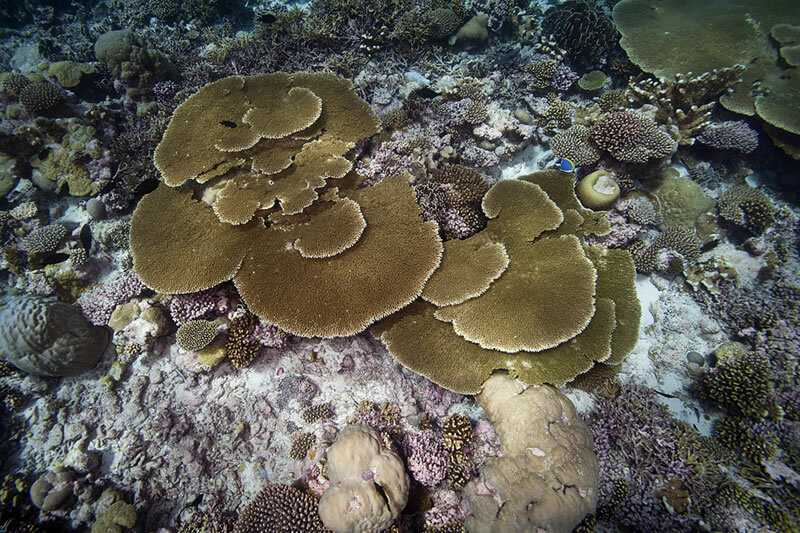 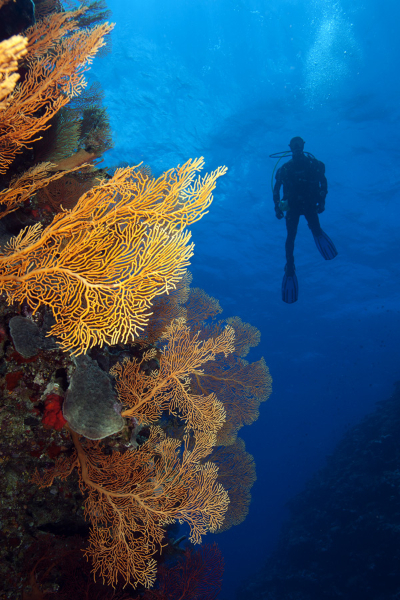 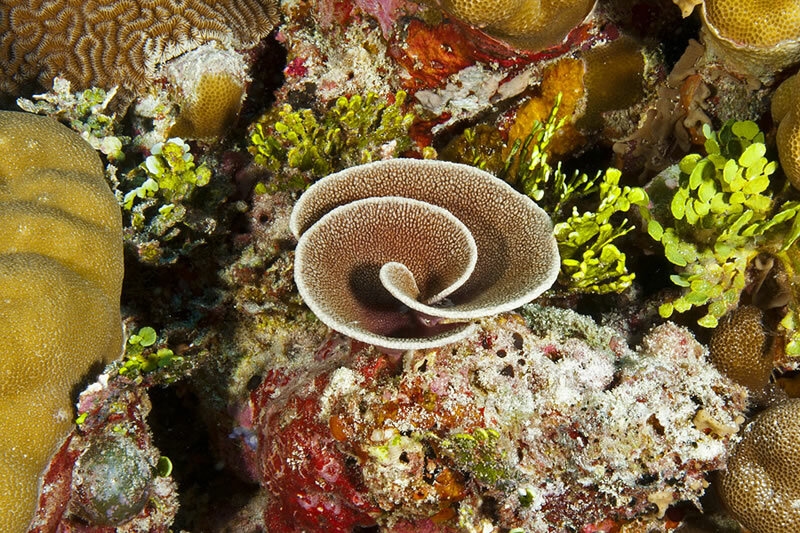 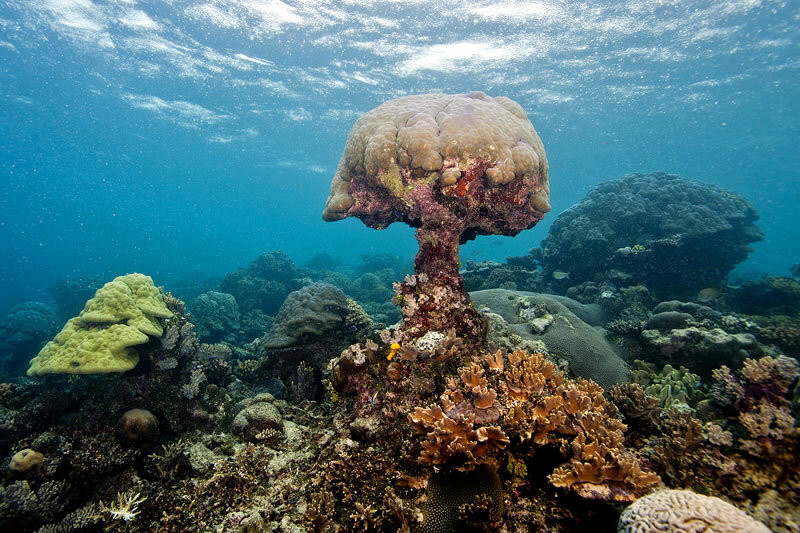 Camera in hand, Anderson Mayfield swims over a reef with high coral cover including branching corals and table acroporids. 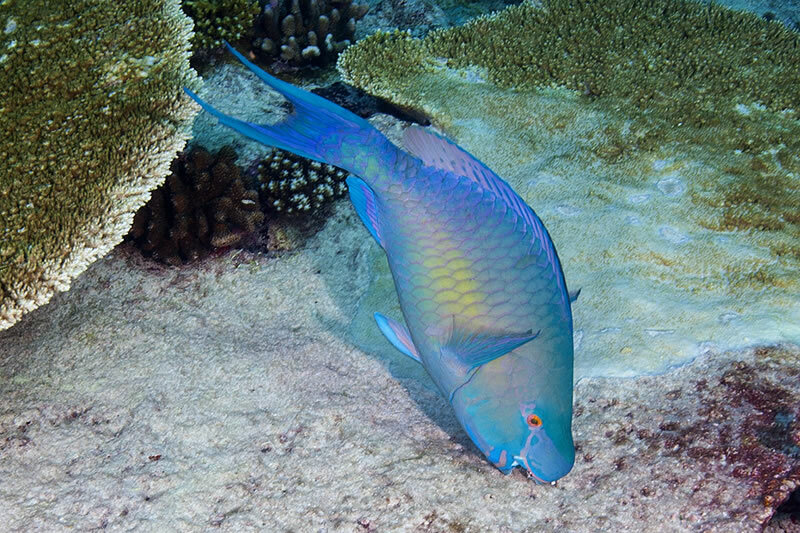 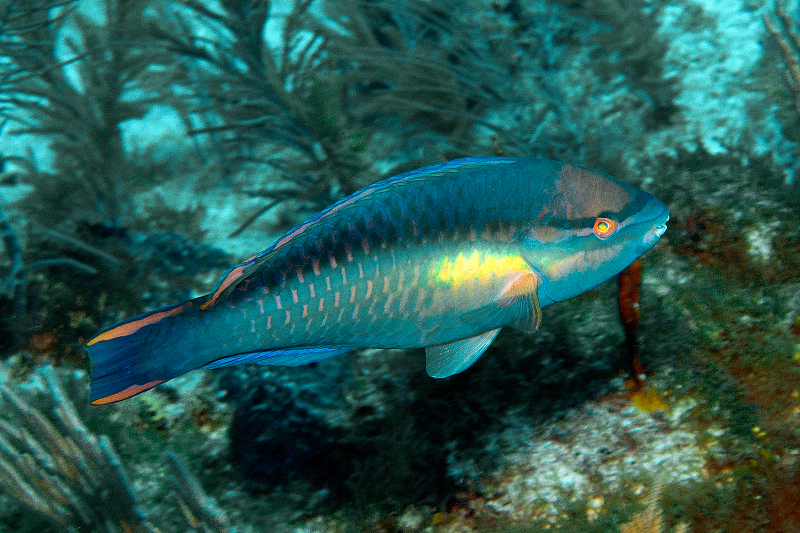 Large parrotfishes like this terminal phase Redlip Parrotfish (Scarus rubroviolaceus) can often be heard scraping dead sections of the reef to feed upon the turf algae and cyanobacteria growing there. 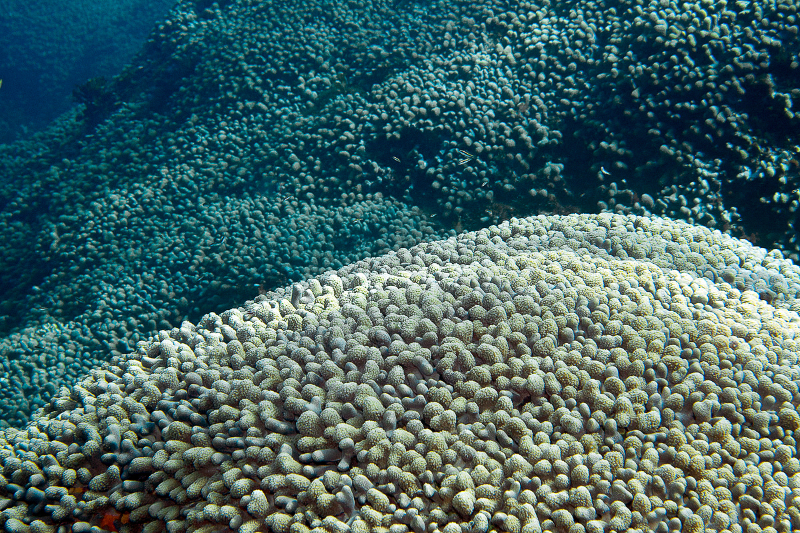 A reef slope covered with cascading foliose colonies of Echinopora coral. 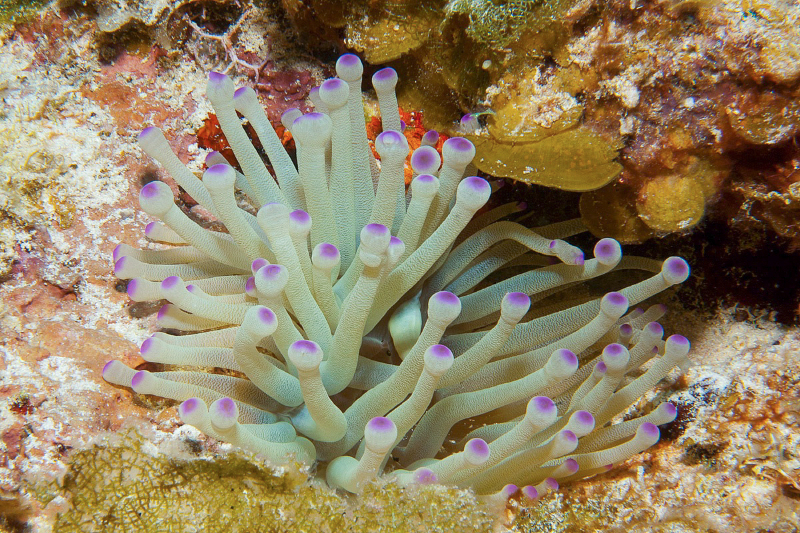 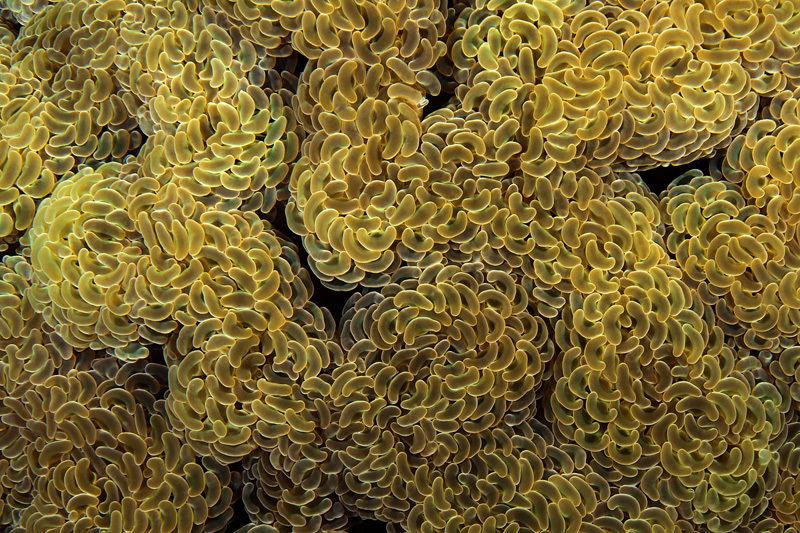 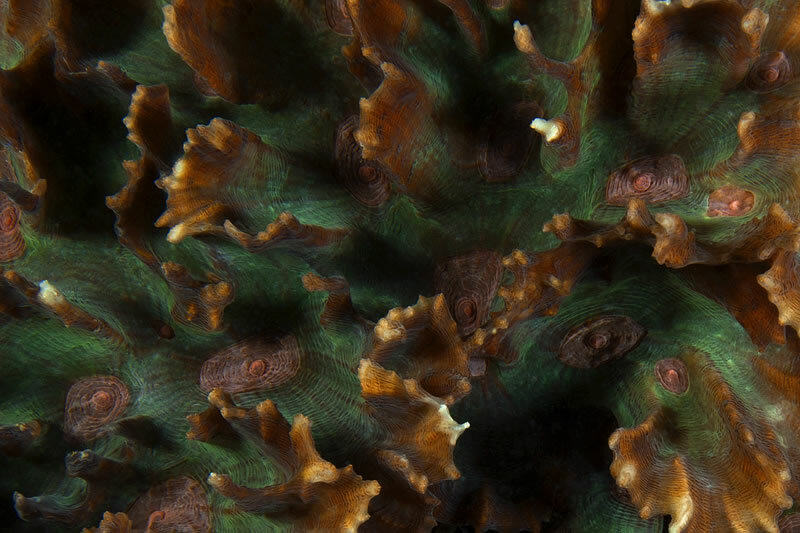 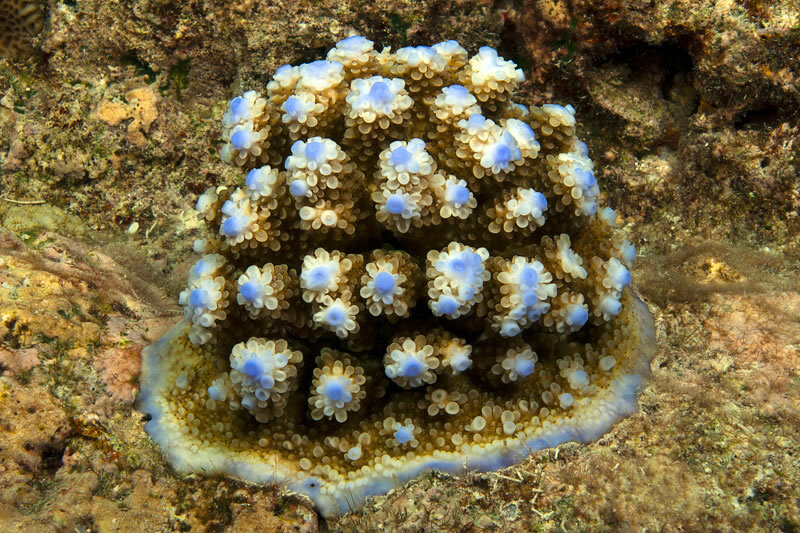 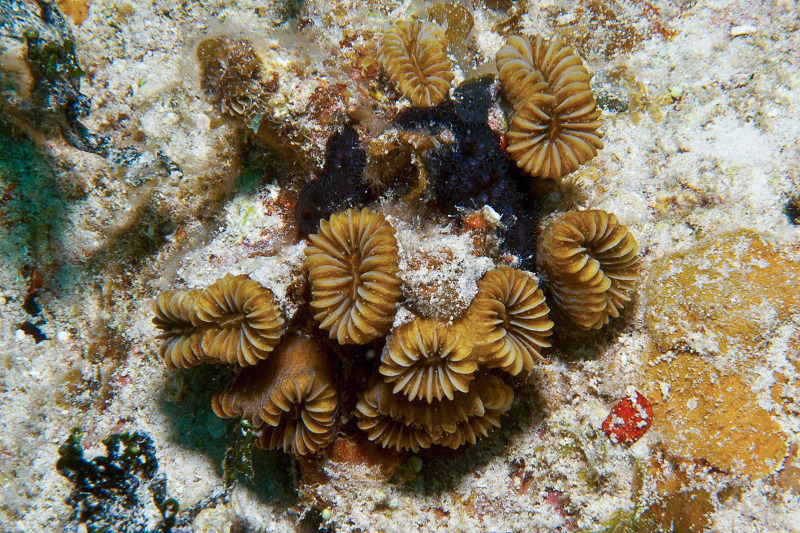 Blades of the Blue Coral (Heliopora coerulea) were packed so tightly that they covered virtually 100% of the reef. 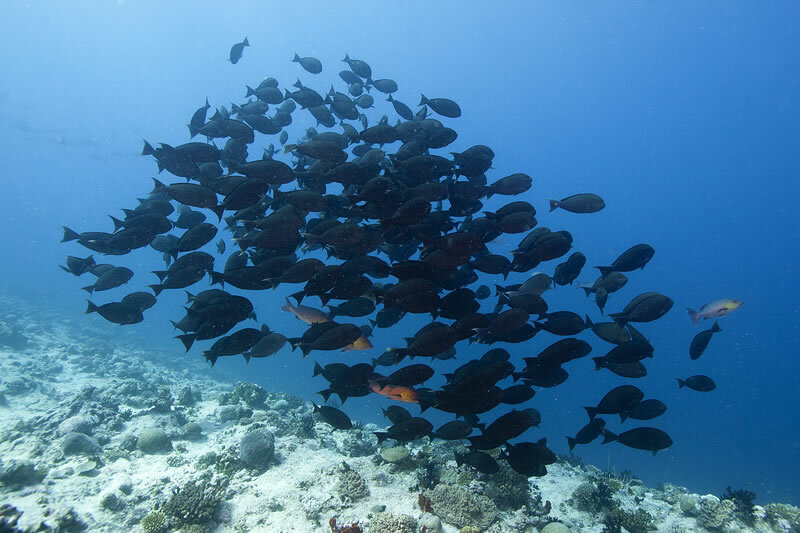 Large school of Yellowback Fusilier (Caesio xanthonota) that were visible from the surface. 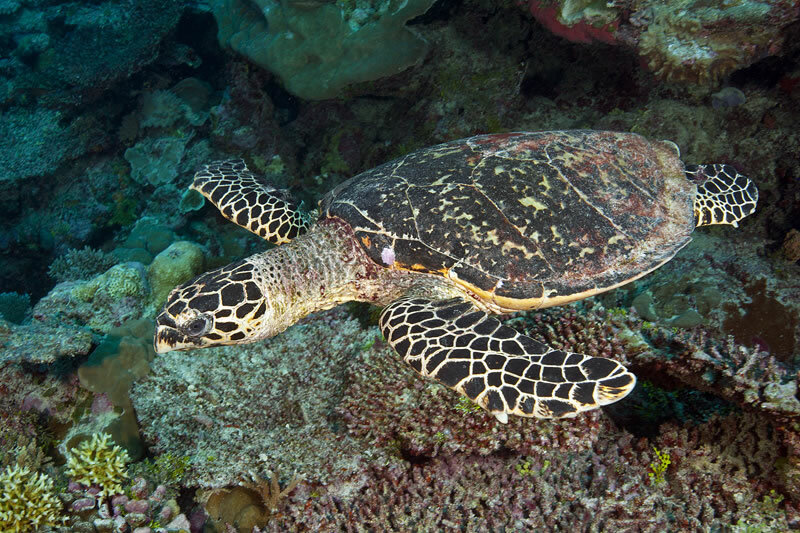 Samantha Clements looks on as a Green Sea Turtle (Chelonia mydas) swims nearby over a pavement of large acroporid table corals. 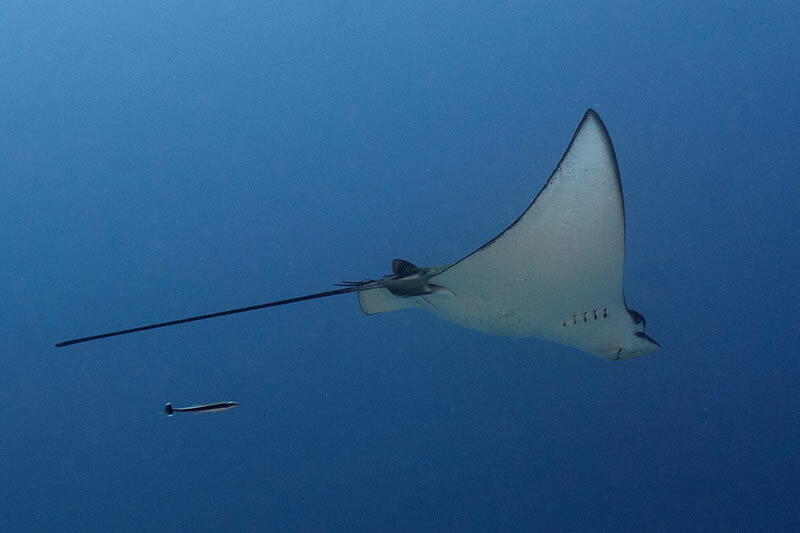 A Spotted Eagle Ray (Aetobatus narinari) is pursued by a small remora. 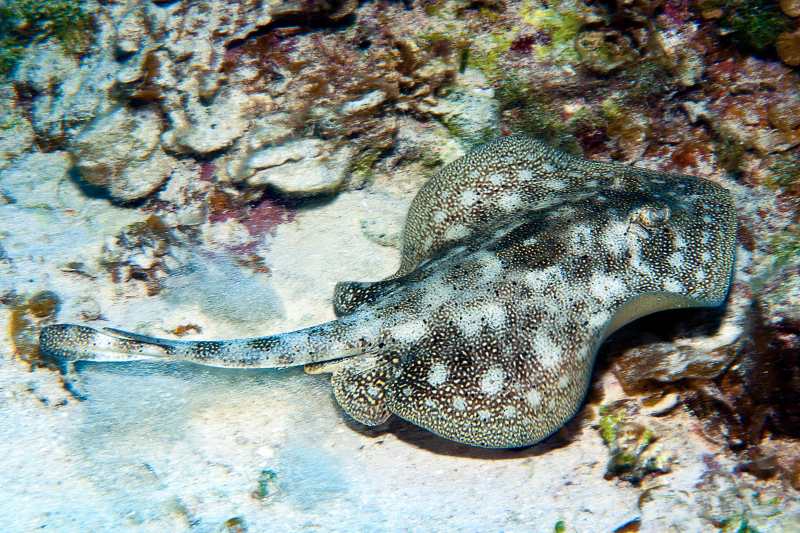 A relatively unspotted form of the Spotted Eagle Ray (likely Aetobatus narinari). 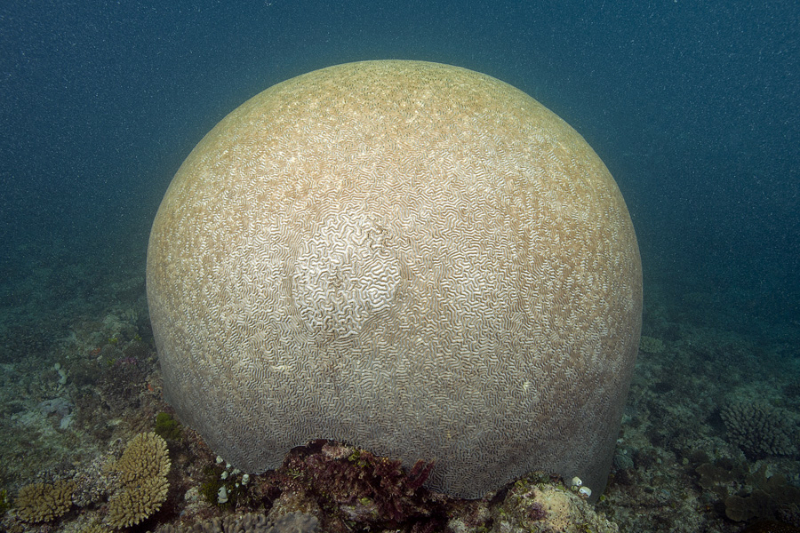 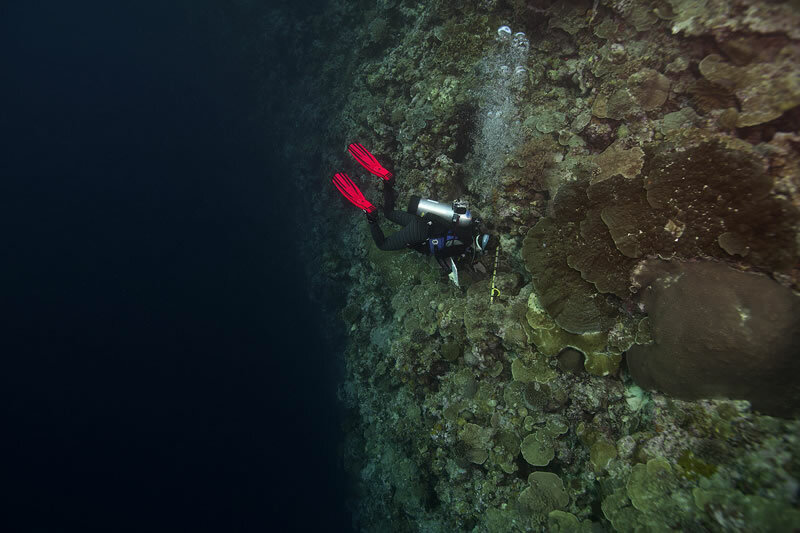 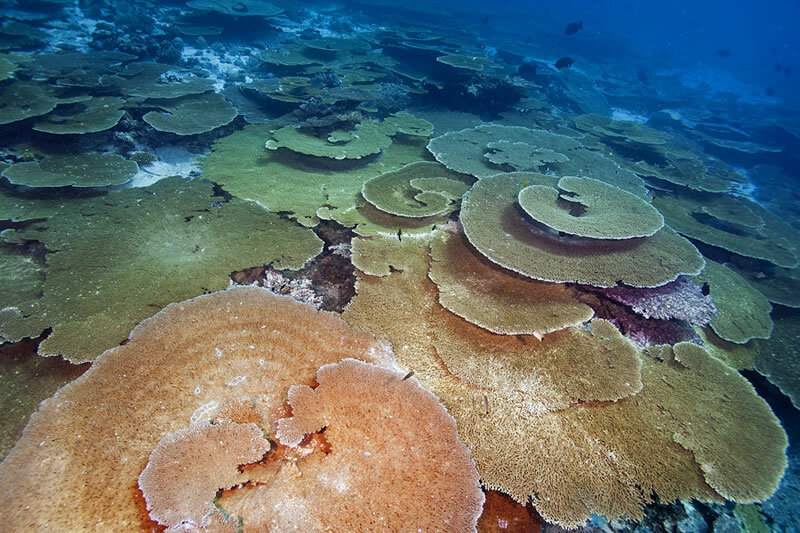 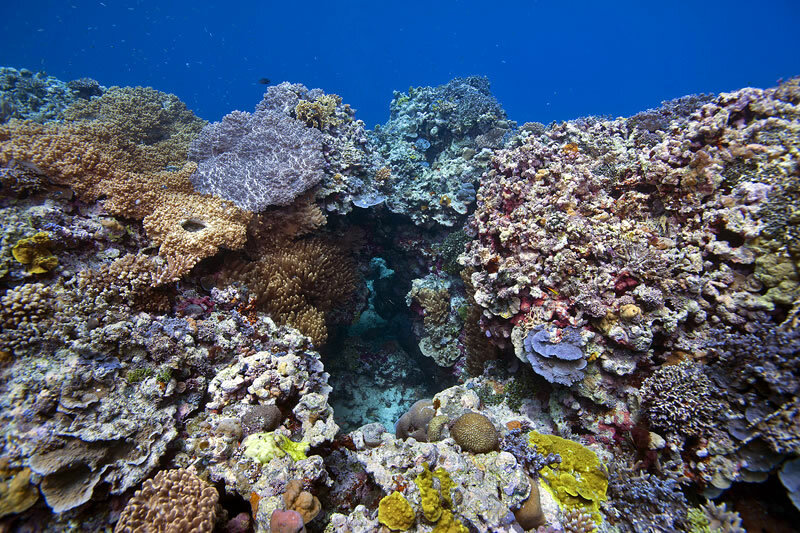 The backside of a reef flanked by a high current pass was home to an extended collection of large table acroporids each several meters in diameter. 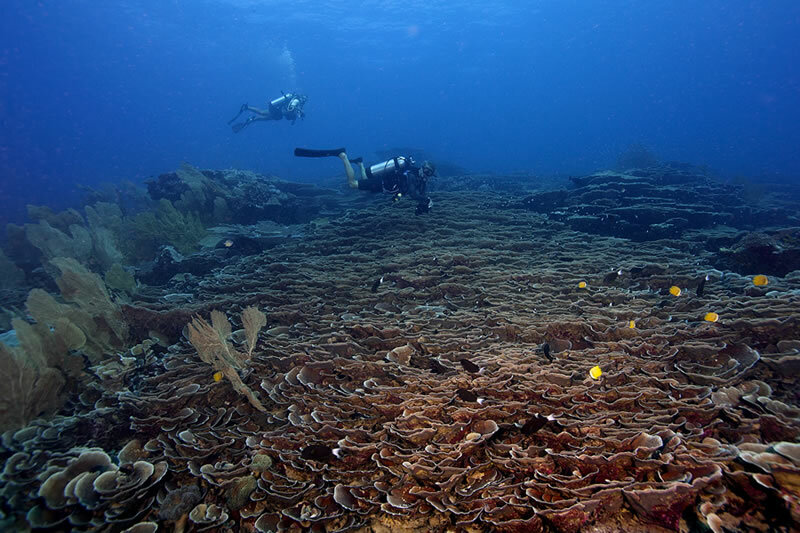 The largest expanse of Blue Coral (Heliopora coerulea) that any of the scientists had ever seen. 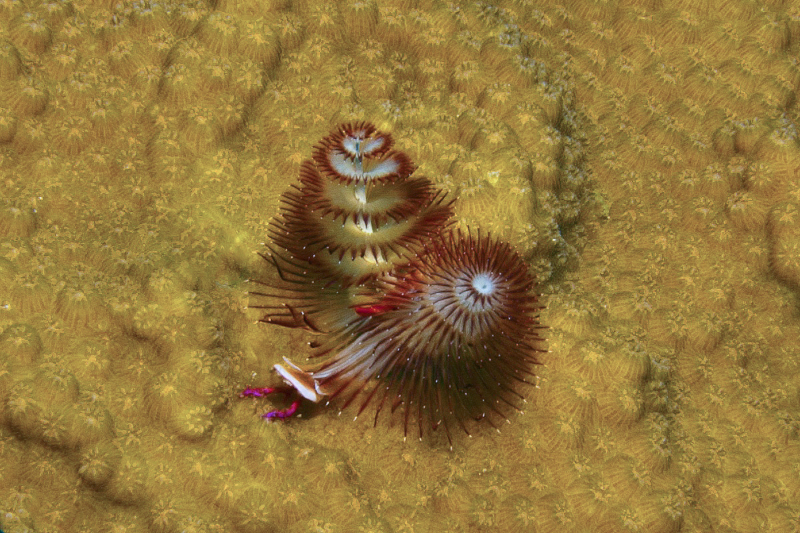 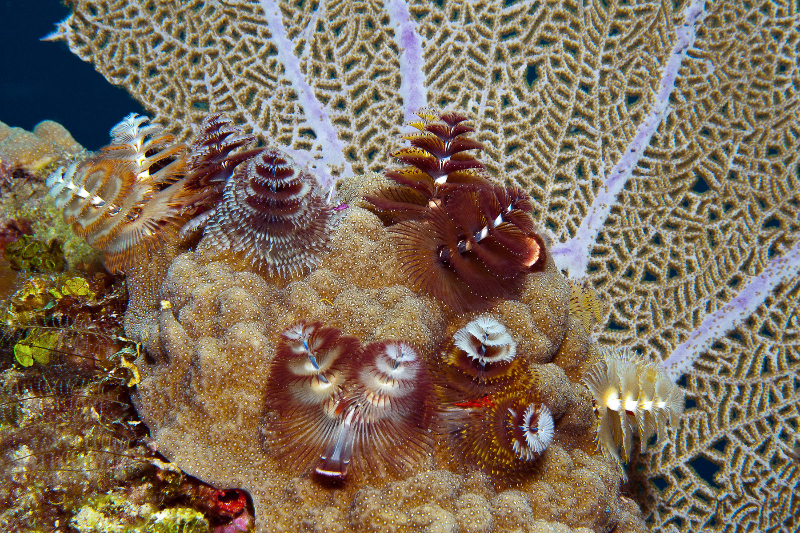 Christmas Tree Worm on Star Coral. 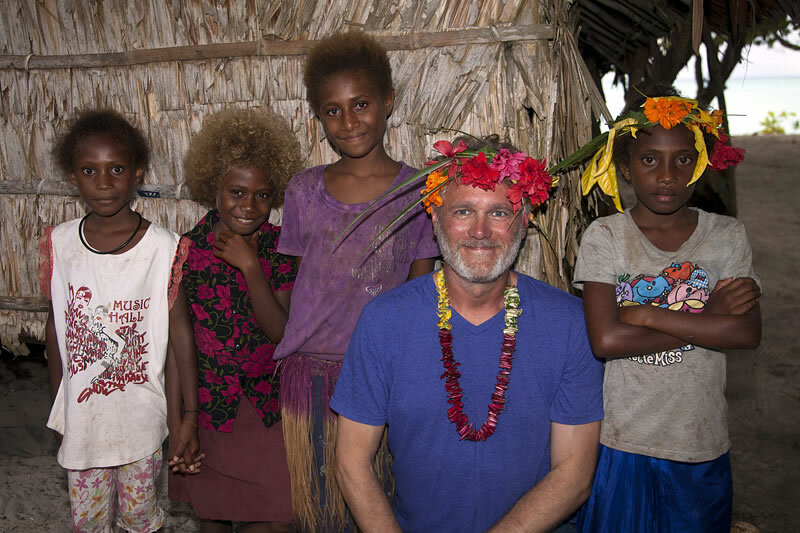 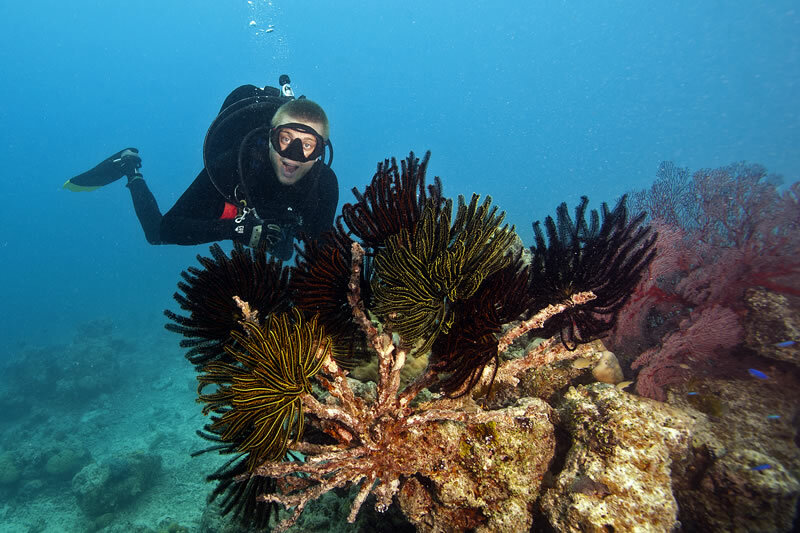 Graham Kolodziej mugs for a photo behind a cluster of feather stars. 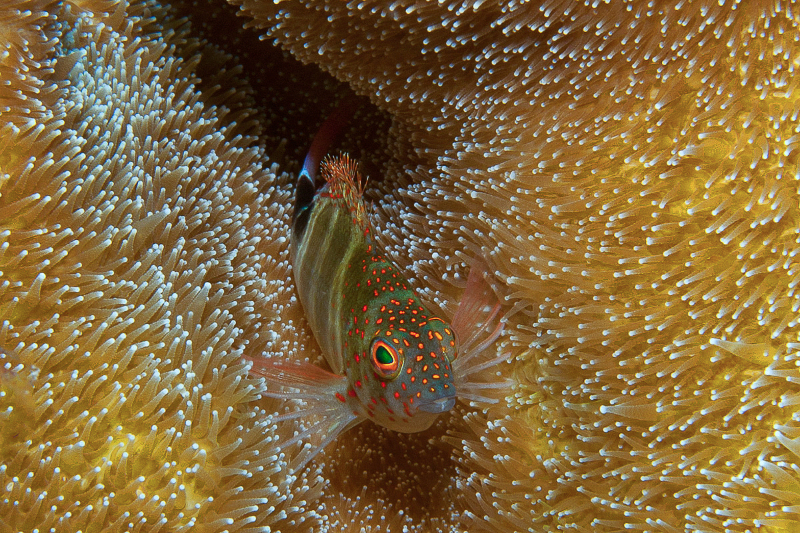 Cleaning Goby on Star Coral. 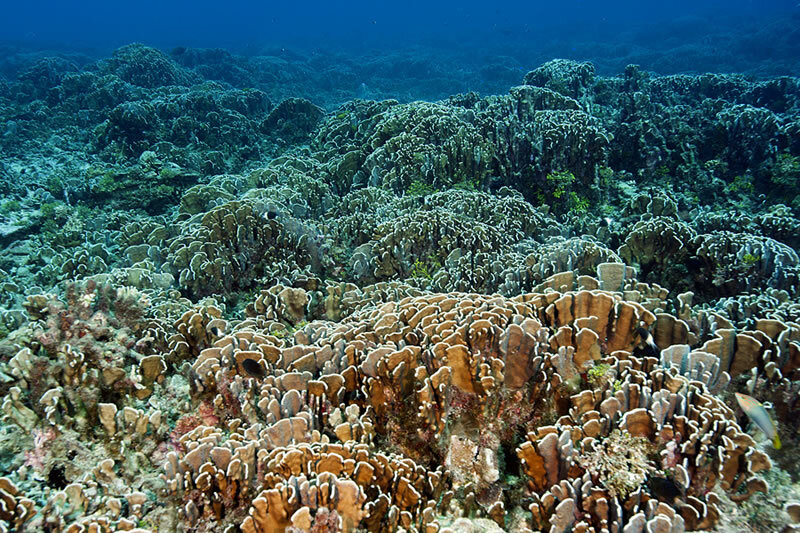 Coral reef at 2-4 meters depth. 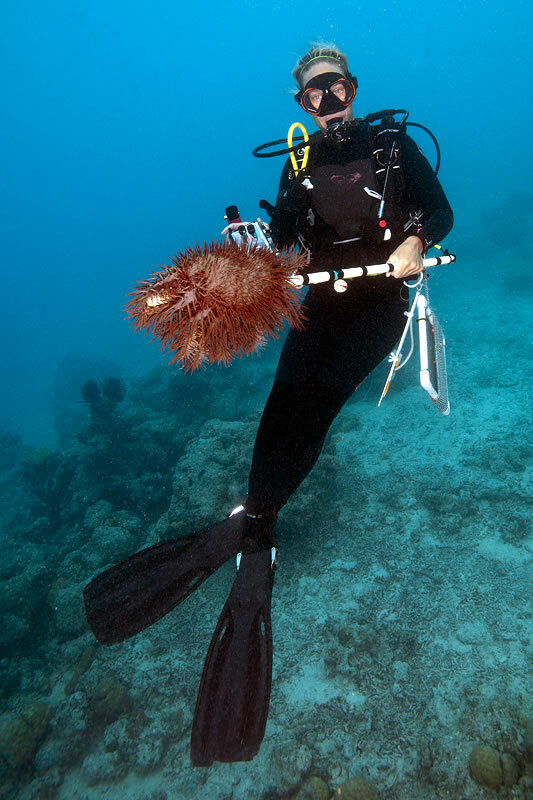 Mermaid-like Grace Frank collects a Crown-of-thorns Seastar. 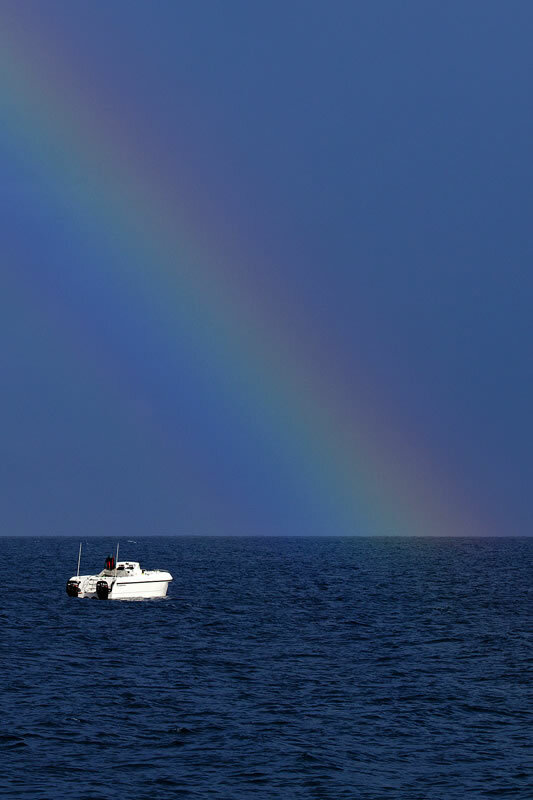 A beautiful way to start the day - a rainbow greets the groundtruthing team. 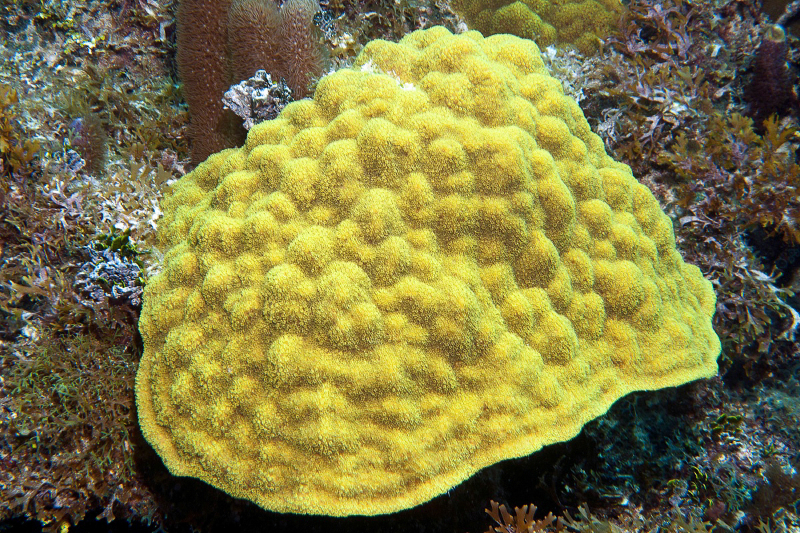 Mounding Porites mix with digitate Porites and branching Acropora colonies. 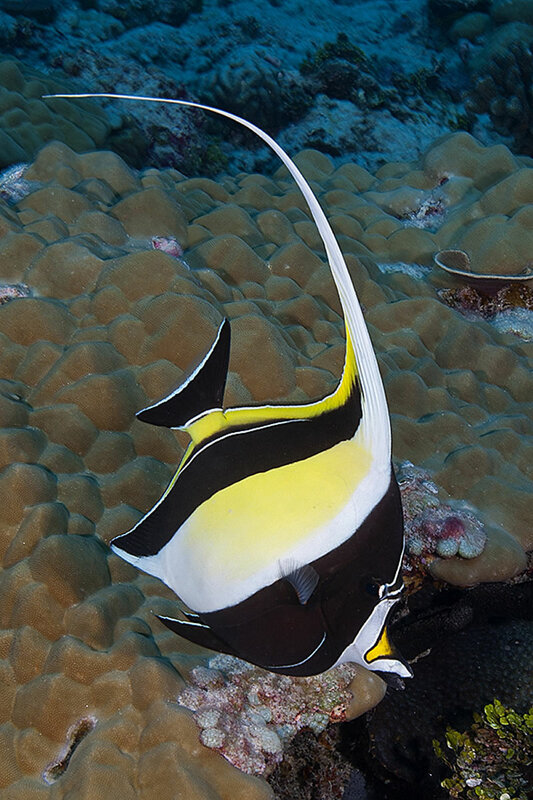 School of pennant bannerfish (Heniochus chrysostomus). 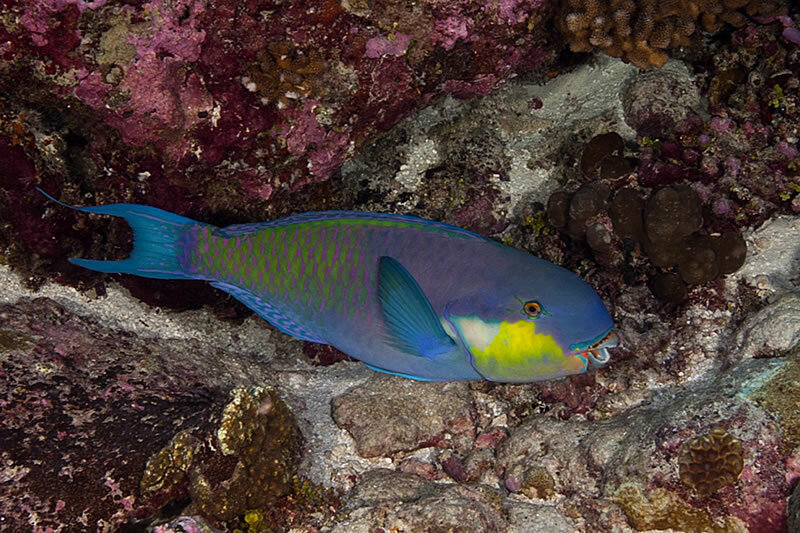 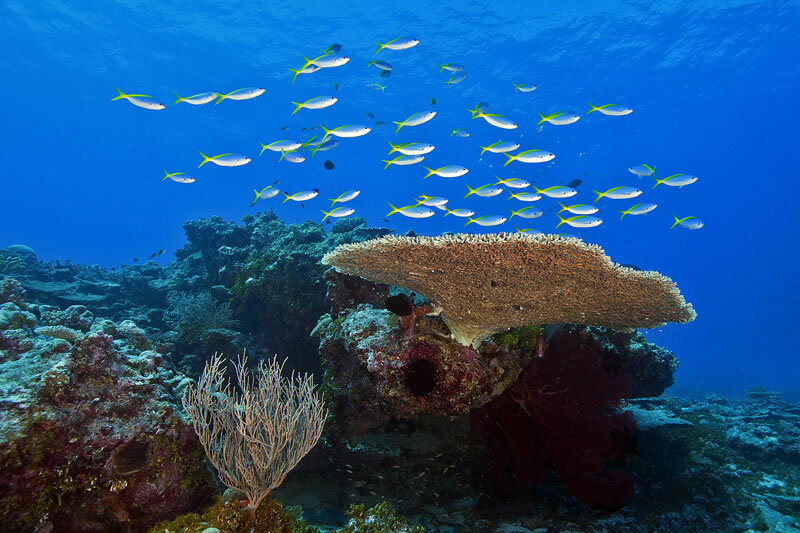 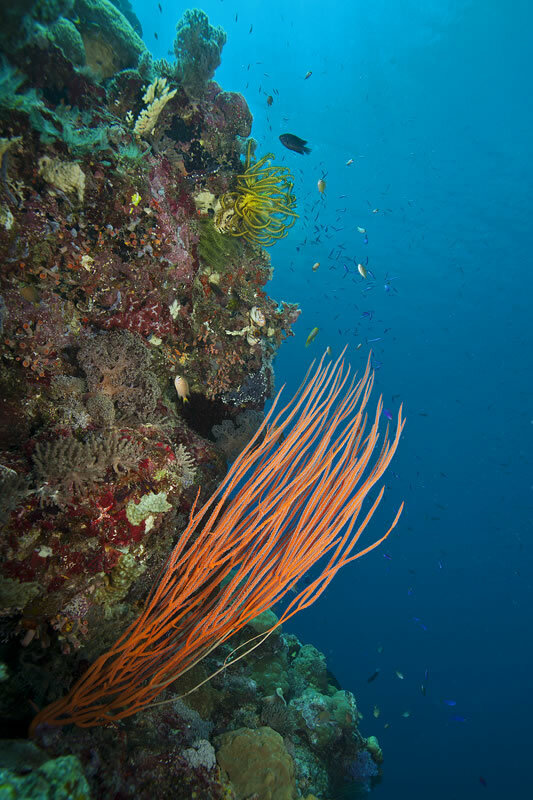 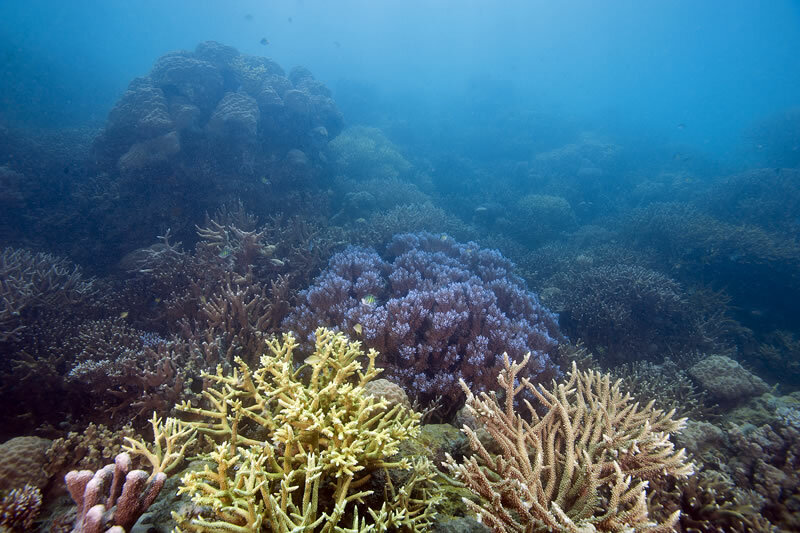 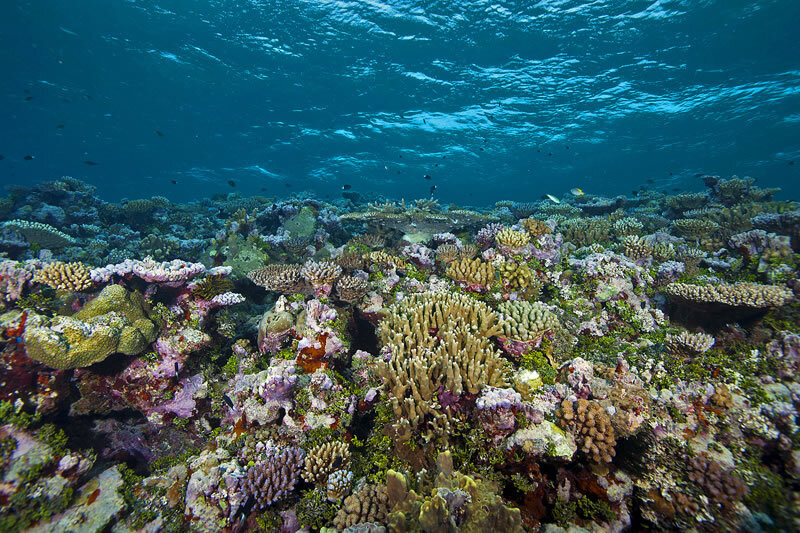 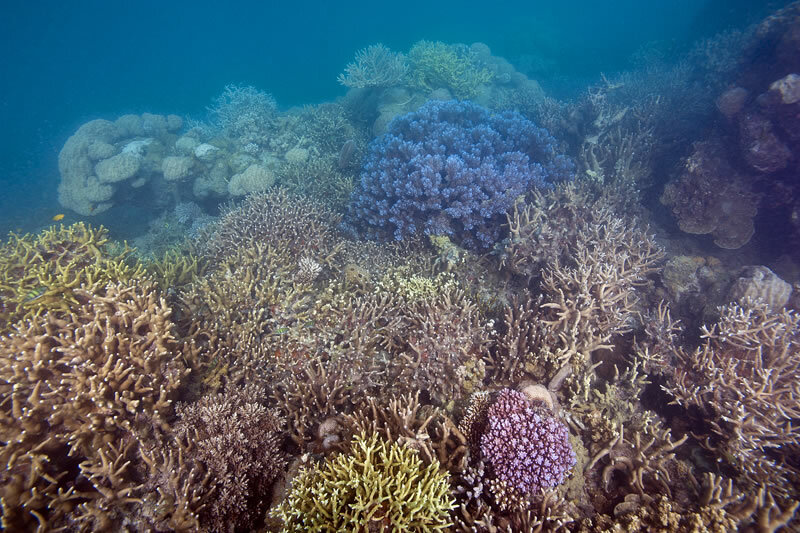 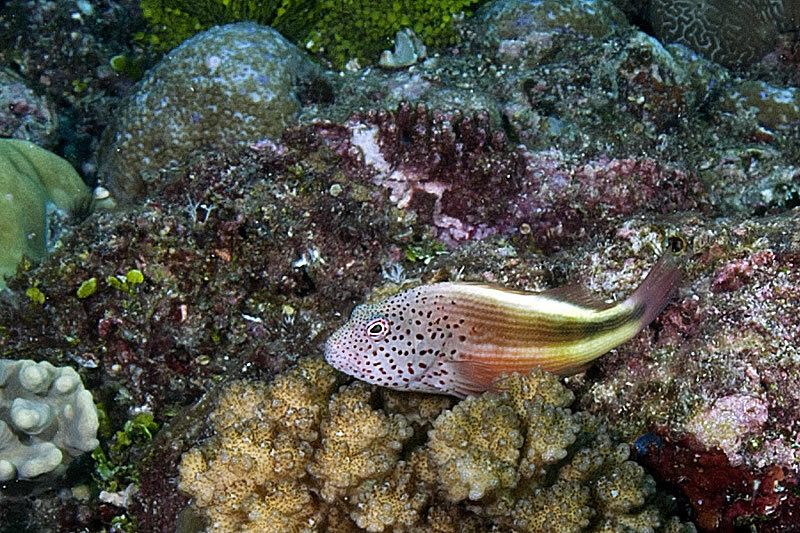 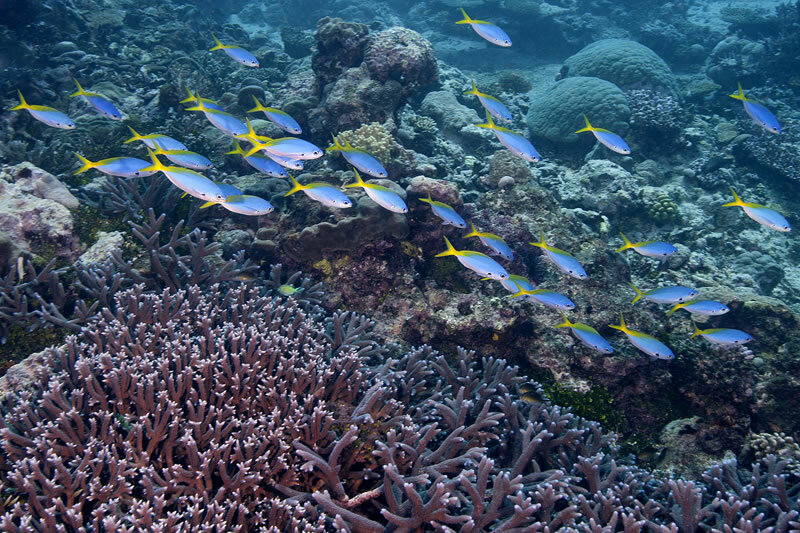 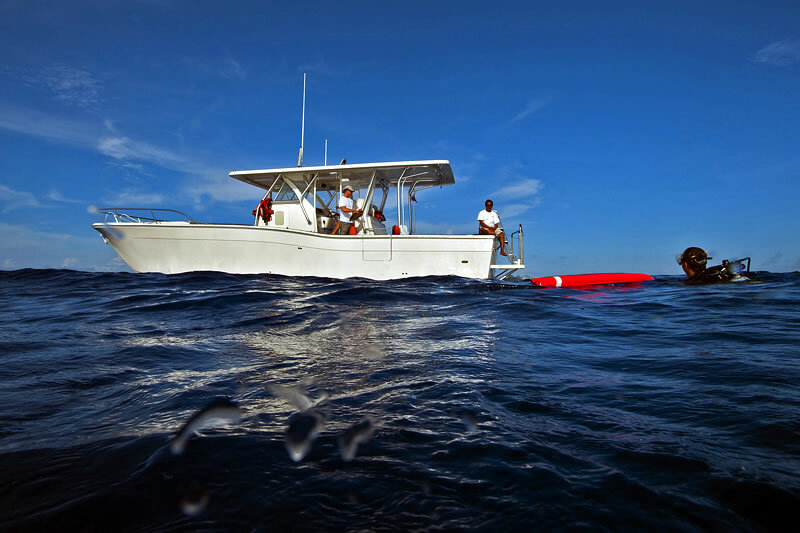 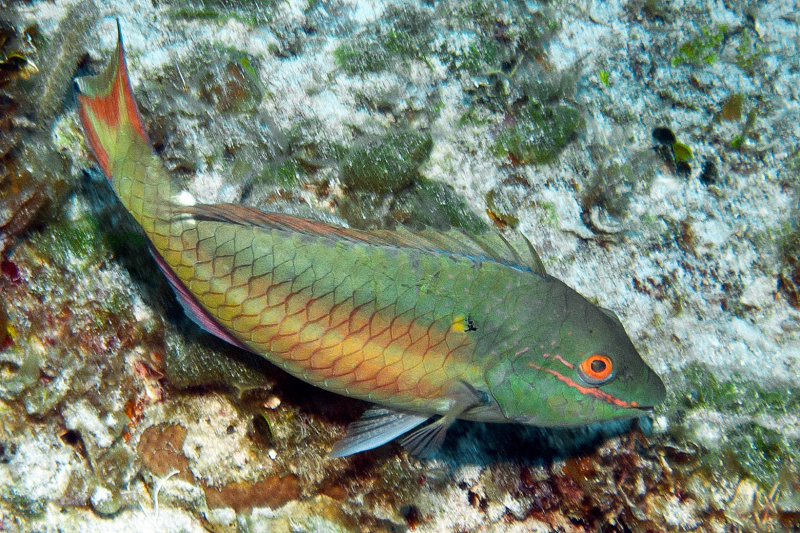 While the reef at 20m was relatively baren with extremely poor visibility a riot of color awaited us in the shallows. 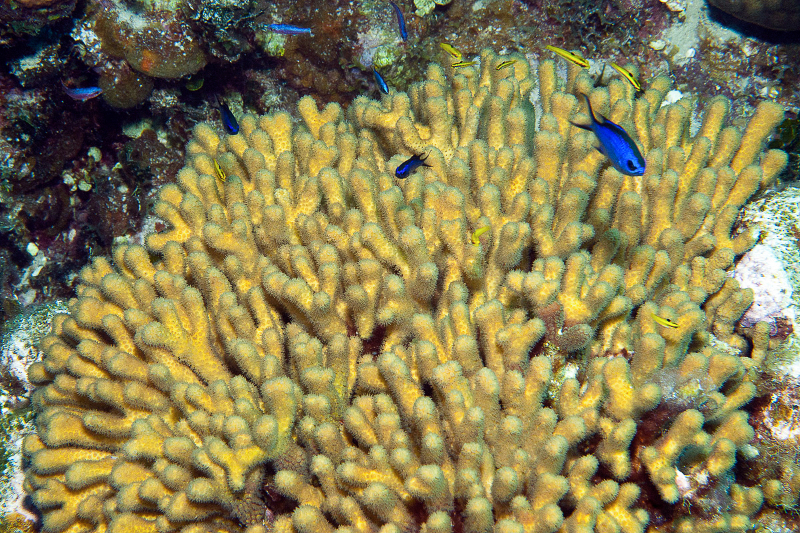 Yellow pencil coral with Blue Chromis and juvenile Bluehead. 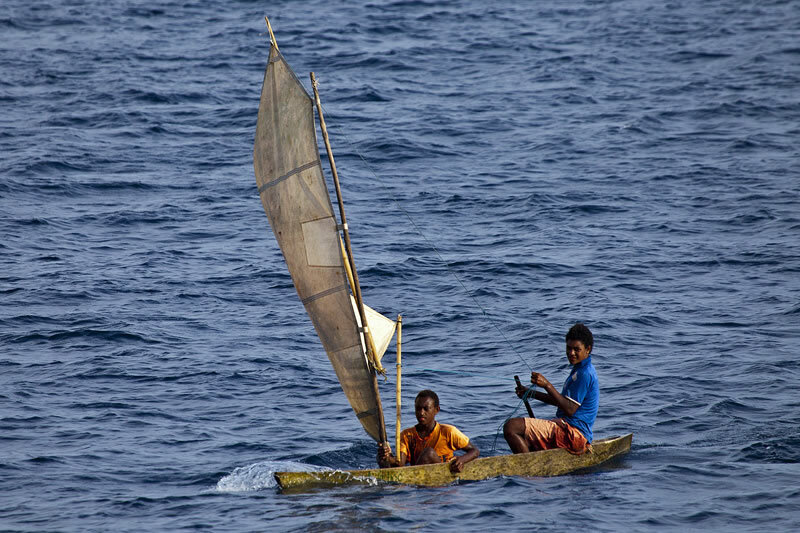 Young men enjoying a canoe ride in the windy conditions. 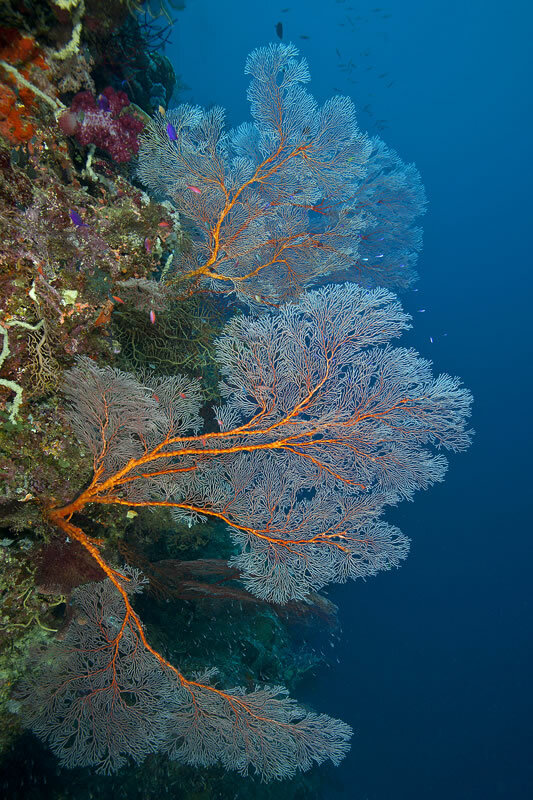 Despite the murky conditions a multi-hued coral garden of Acropora corals brings color to the dive. 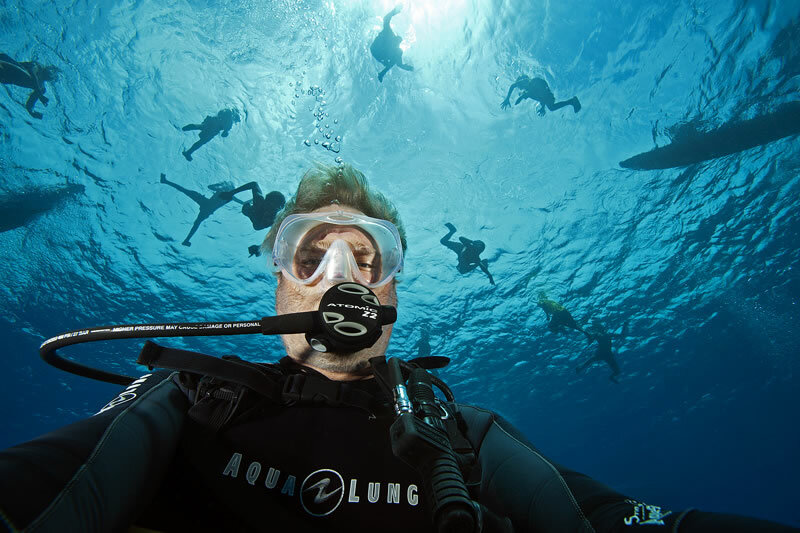 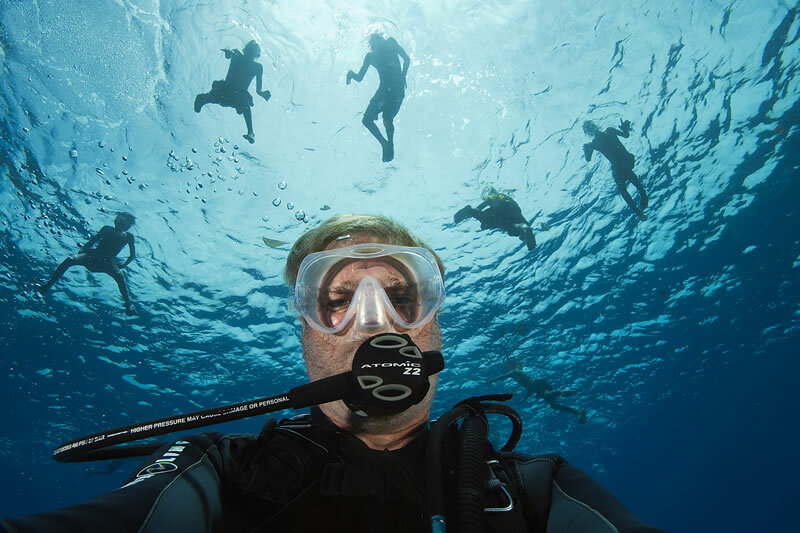 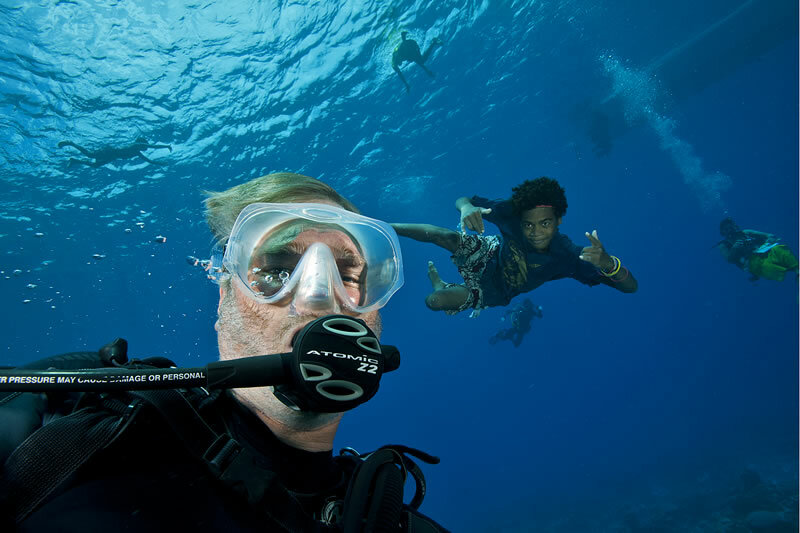 Have you ever taken a scuba selfie? 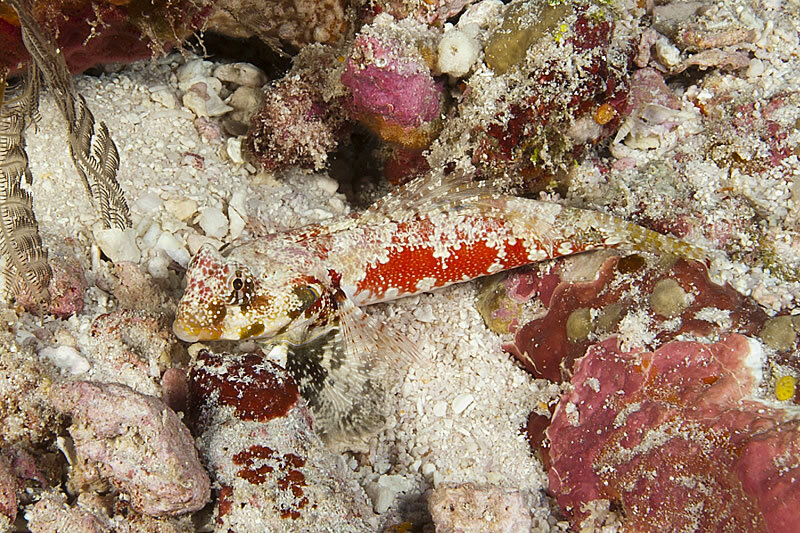 Here is a good one from Ken Marks. 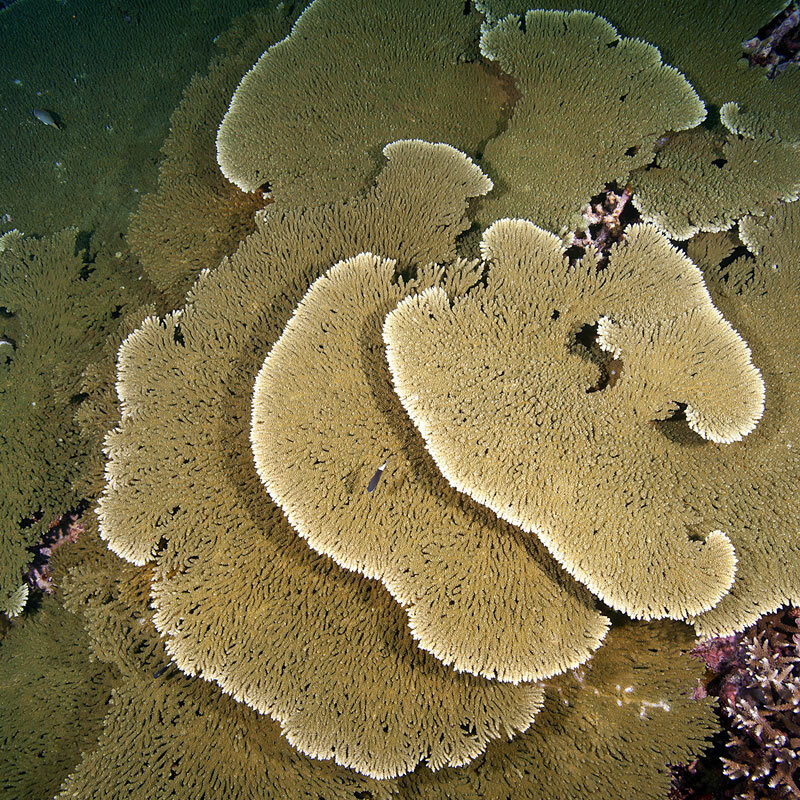 Reaching up to near the surface a grove of Porites lobata mounds mix with the branching Acroporas. 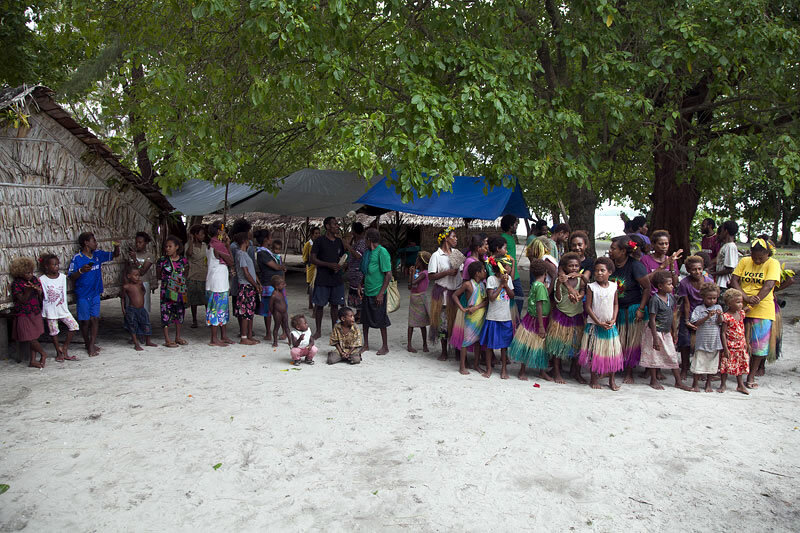 The scientists enjoy a visit with the local kids. 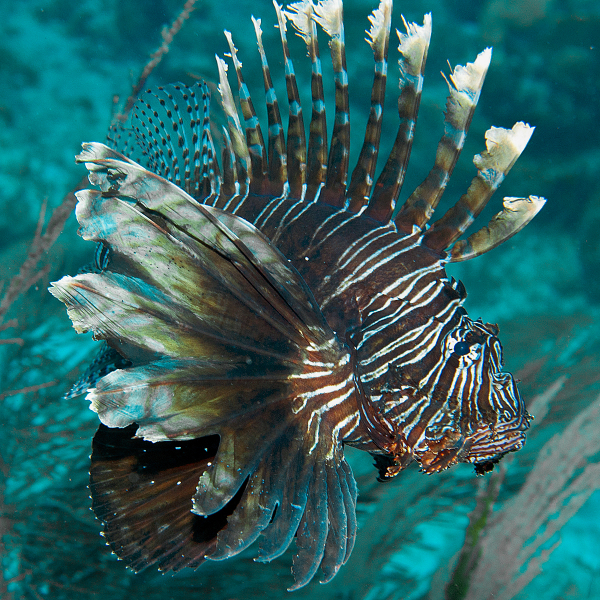 Juvenile lionfish (Pterois volitans) seem to grow into their pectoral fins like puppies grow into their ears. 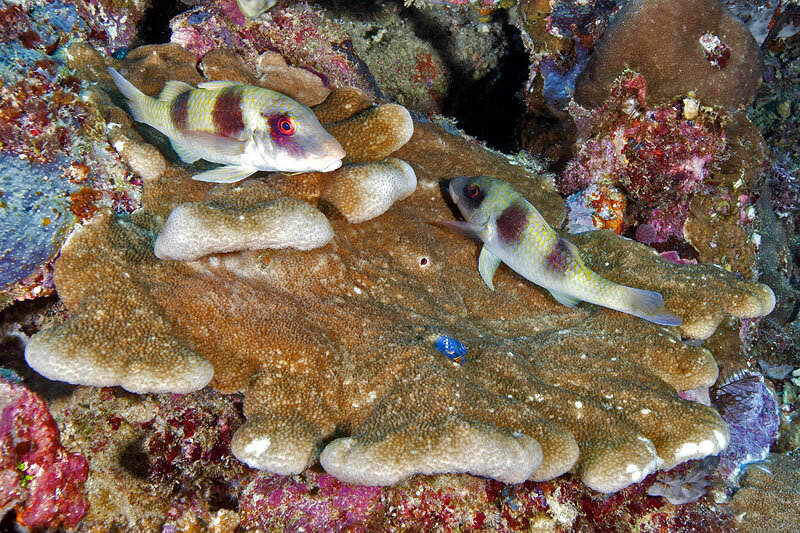 Bicolor Damselfish and juvenile Blueheadswim behind Thin Leaf Lettuce Coral. 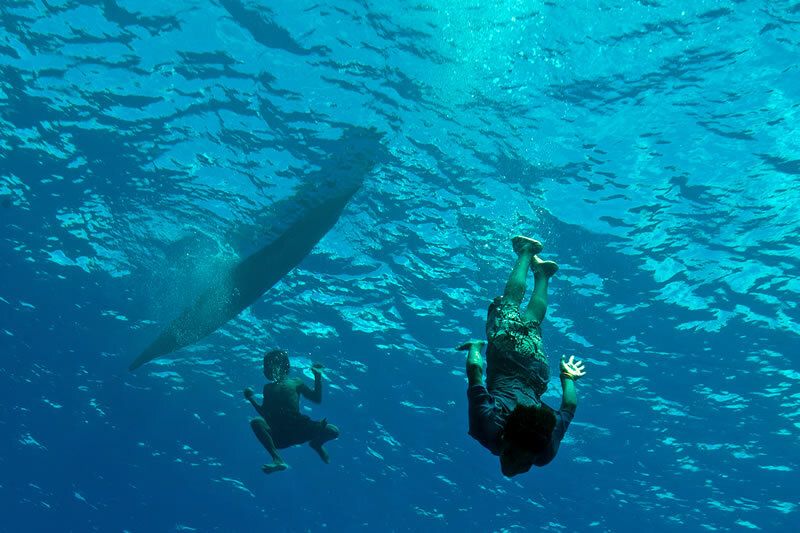 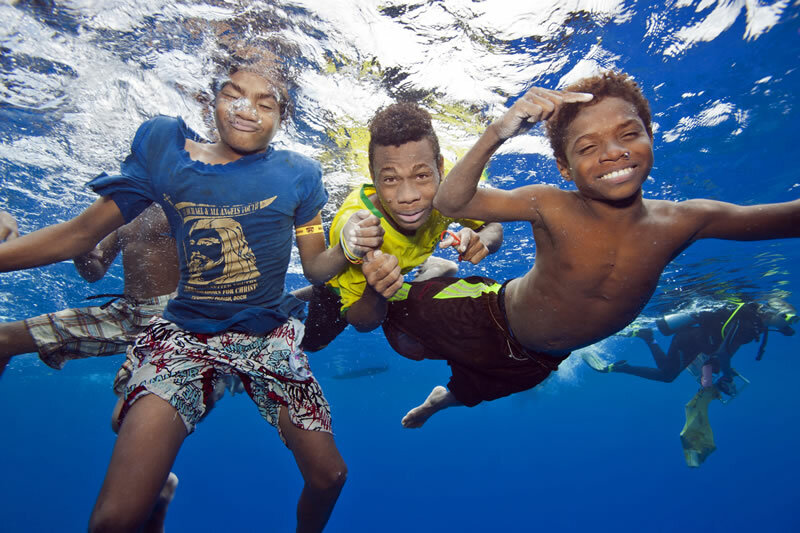 The scientists had some local children visit them while on their dive. 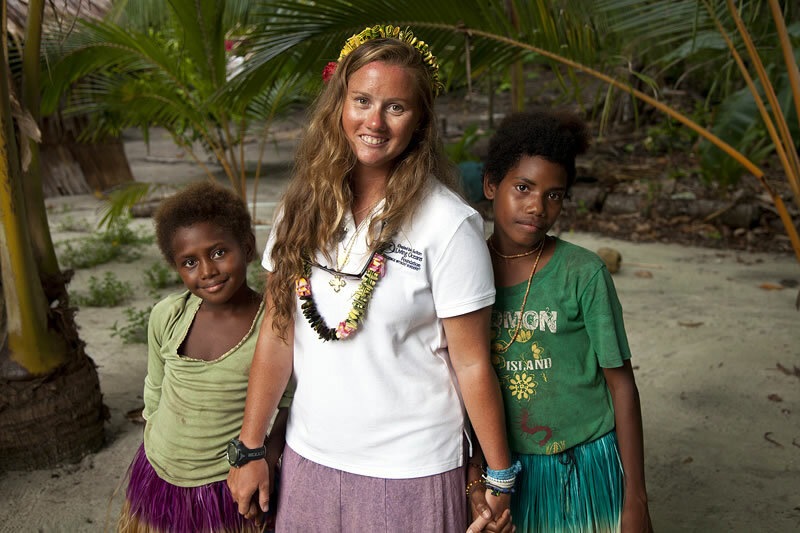 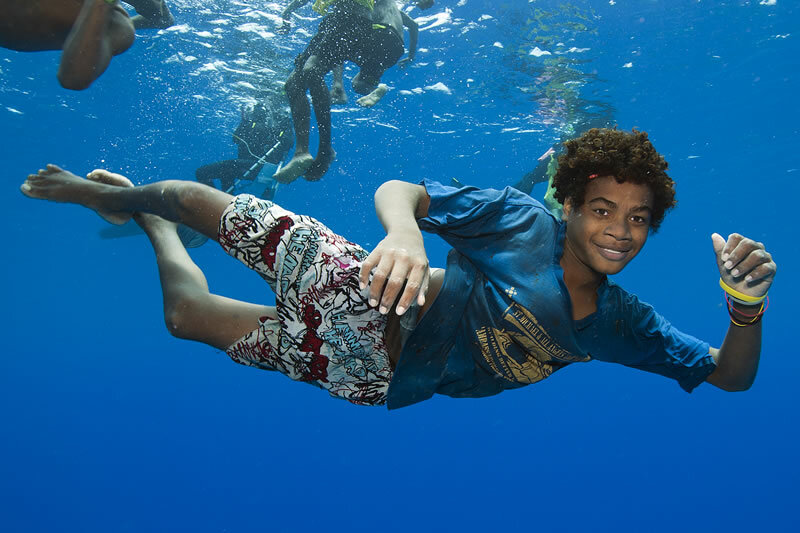 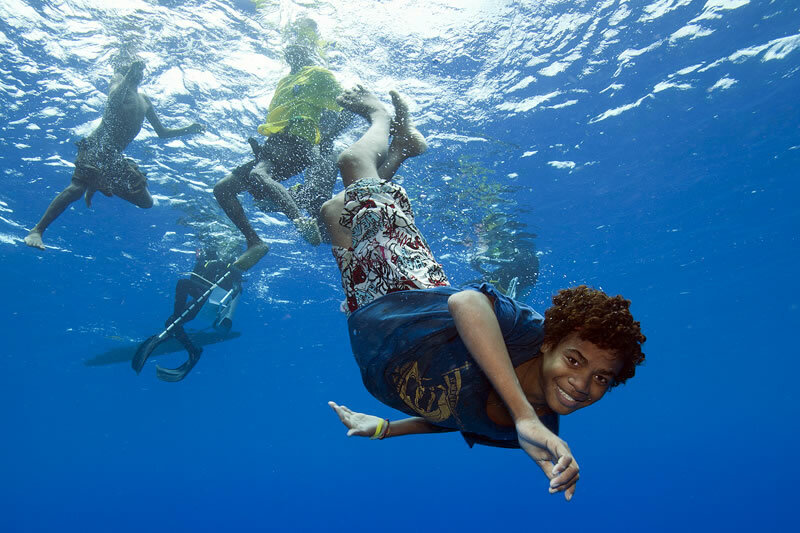 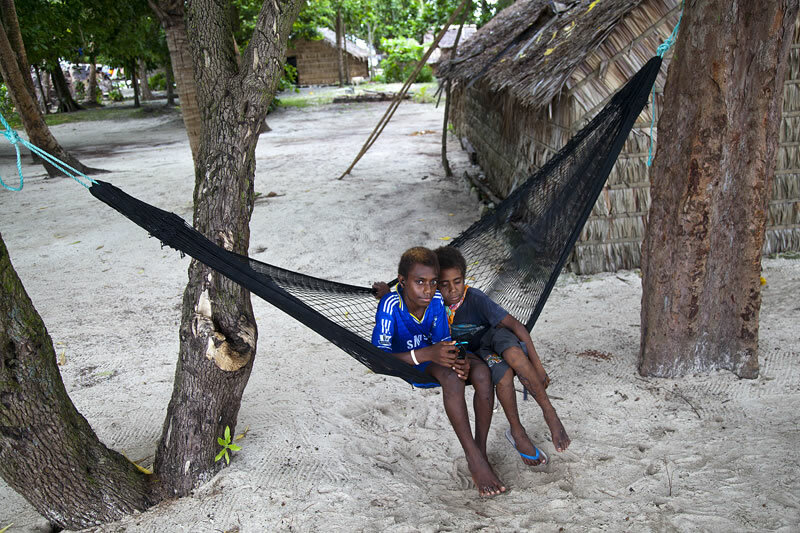 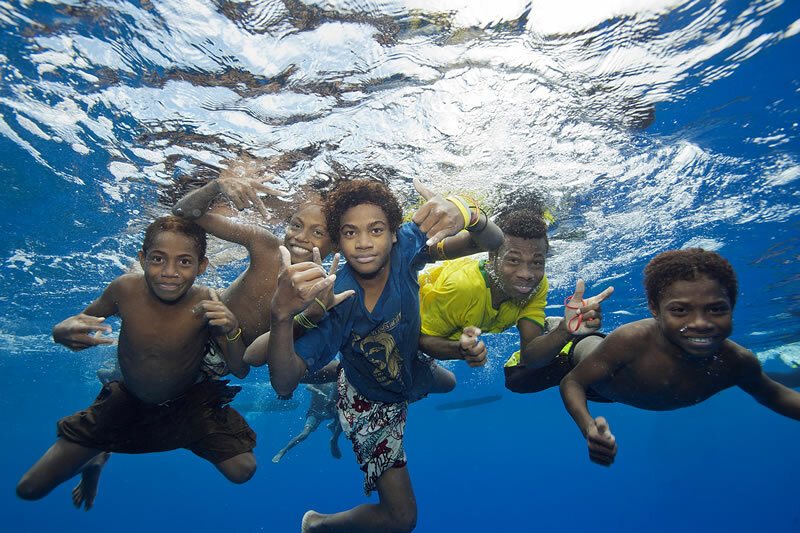 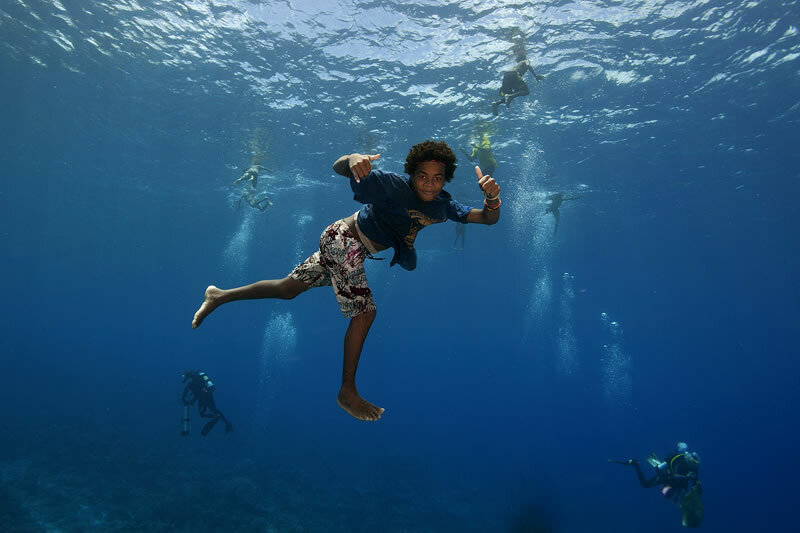 Local children free-diving to have their photos taken by scientists who are scuba diving. 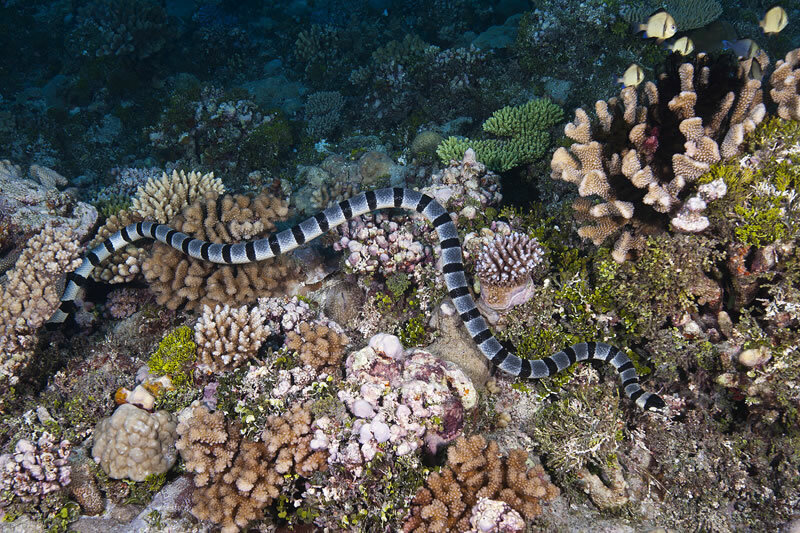 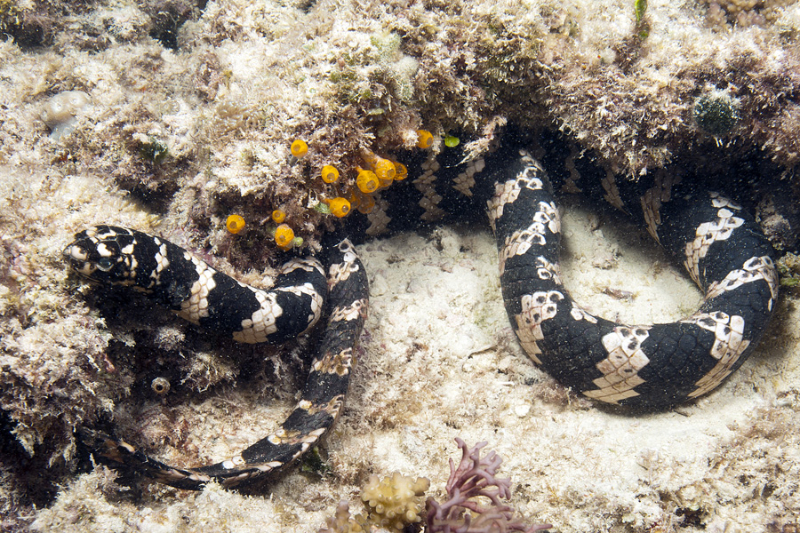 Black and white sea krait (Laticauda columbrina). 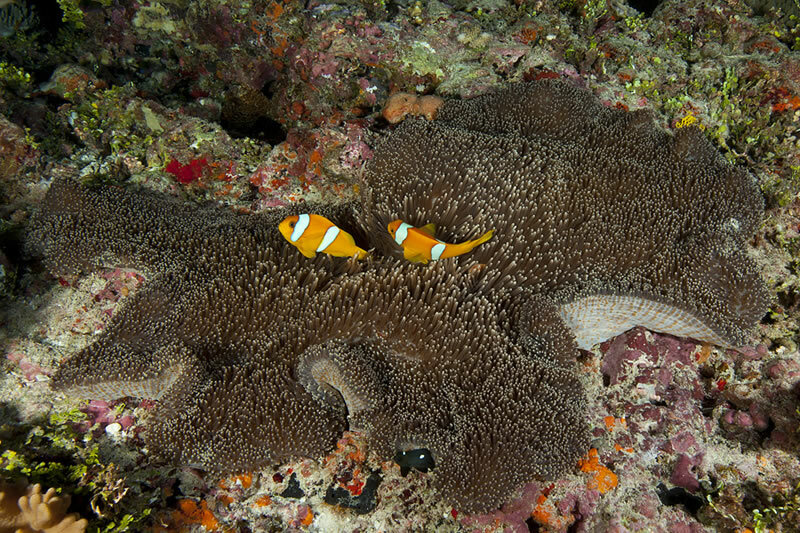 Adhesive anemone (Cryptodendrum adhaesivum) with threespot damselfish (Dascyllus trimaculatus) swimming around. 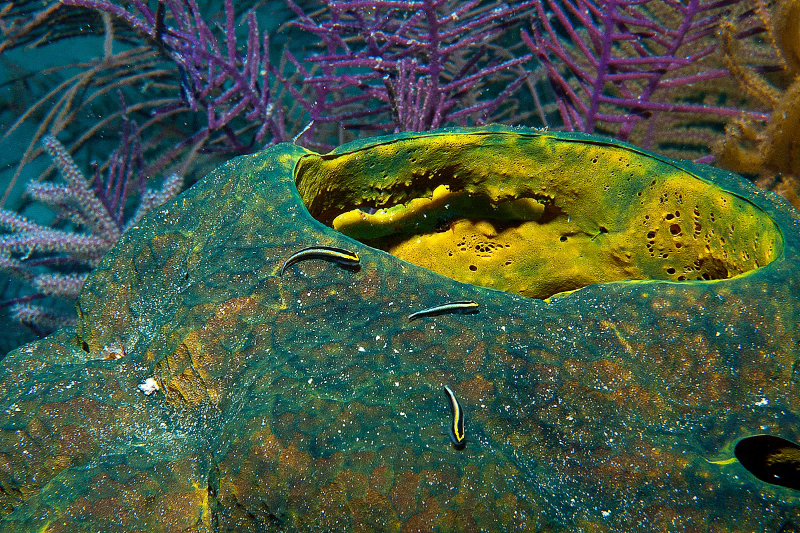 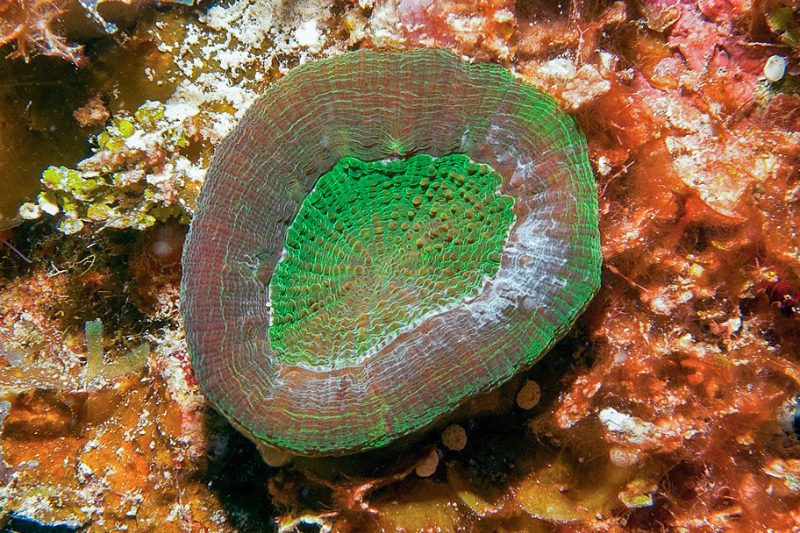 Barrel Sponge with Cleaning Goby. 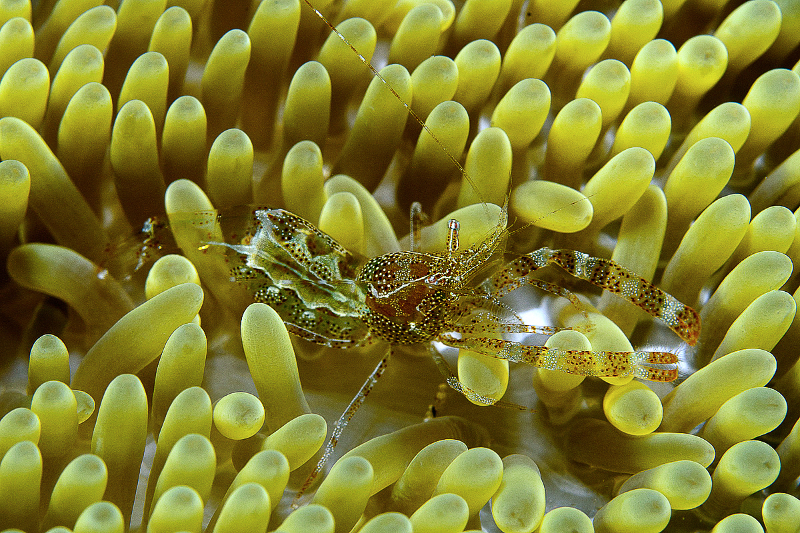 Rough Box Crab hides between Sun Anemone and Encrusting Fan-Leaf Algae. 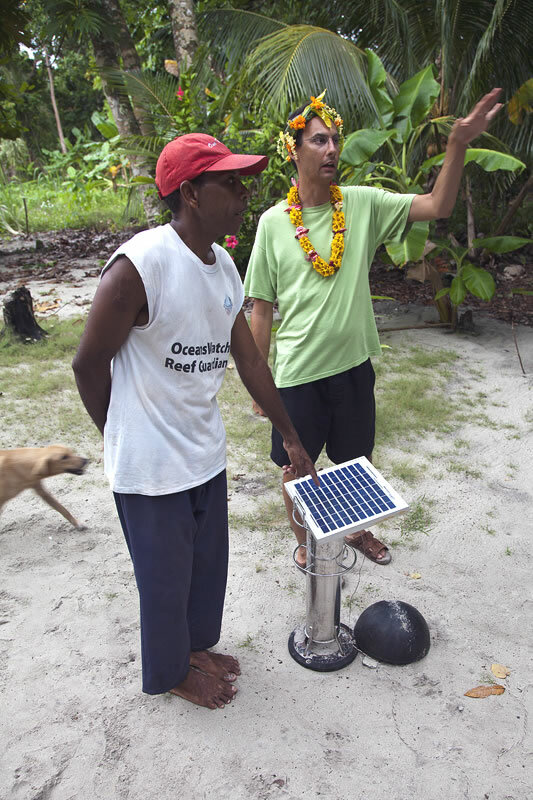 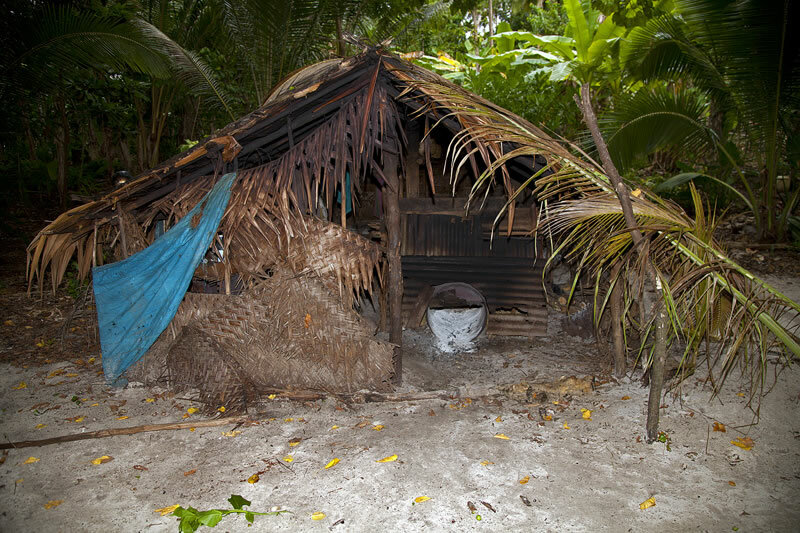 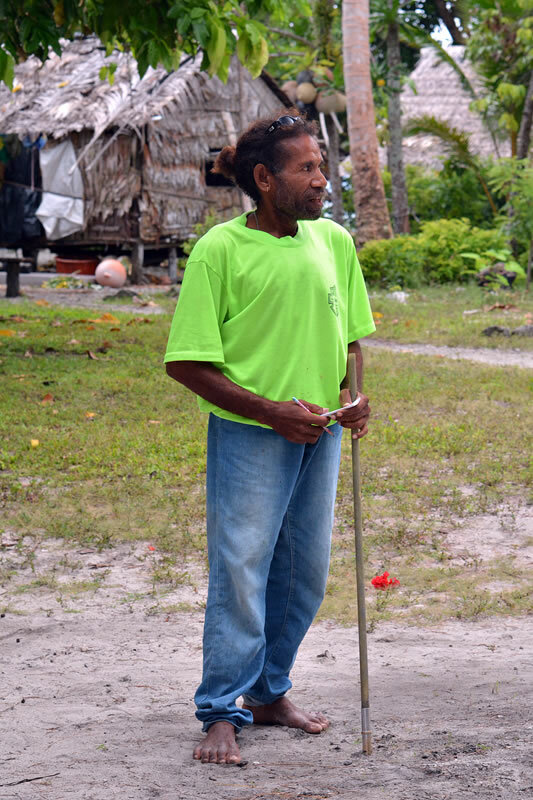 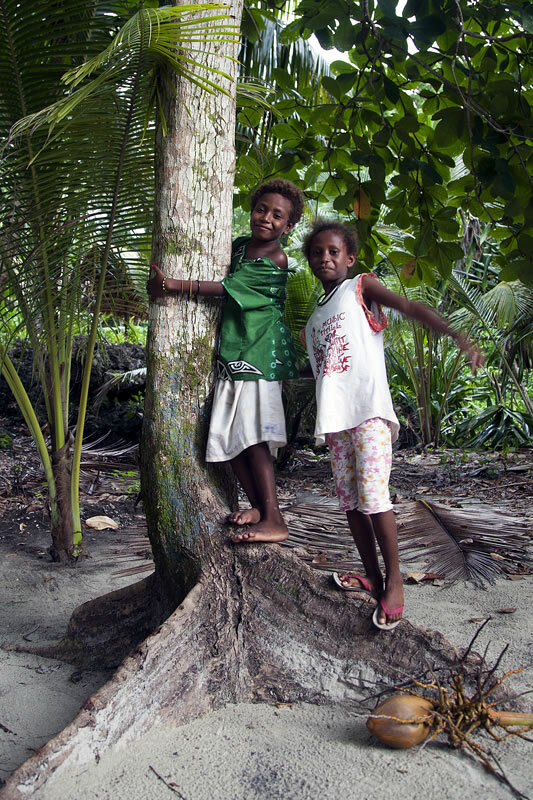 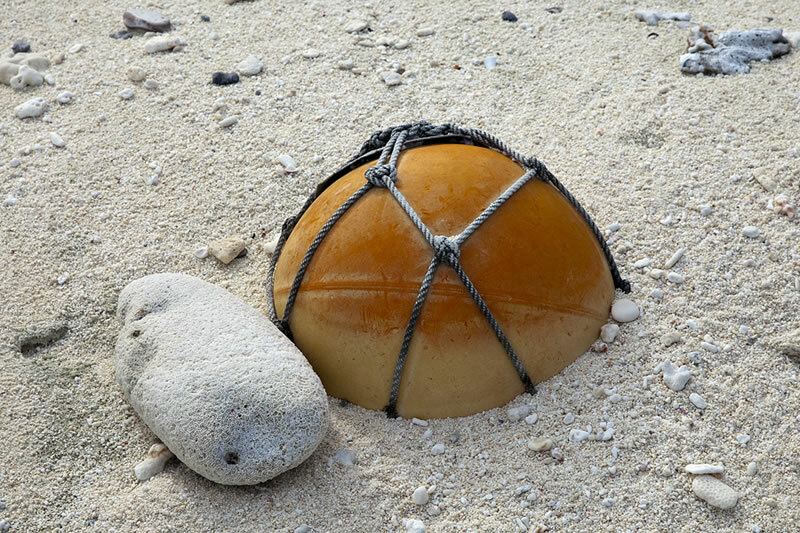 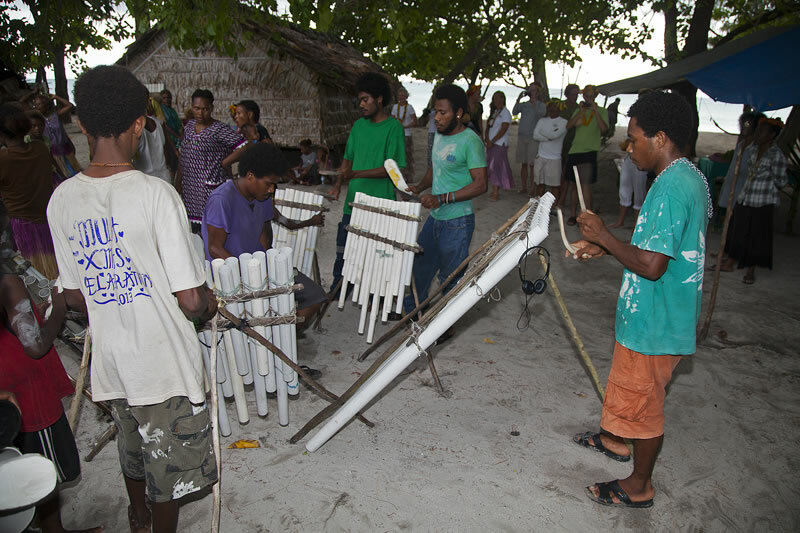 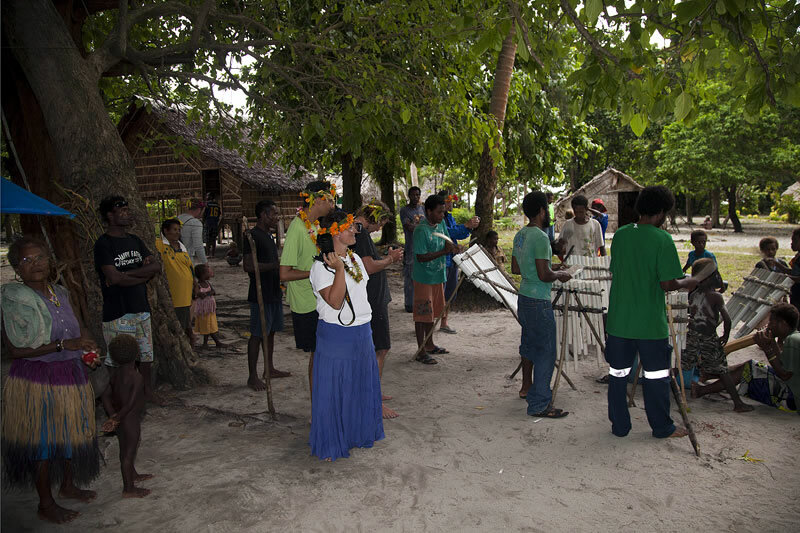 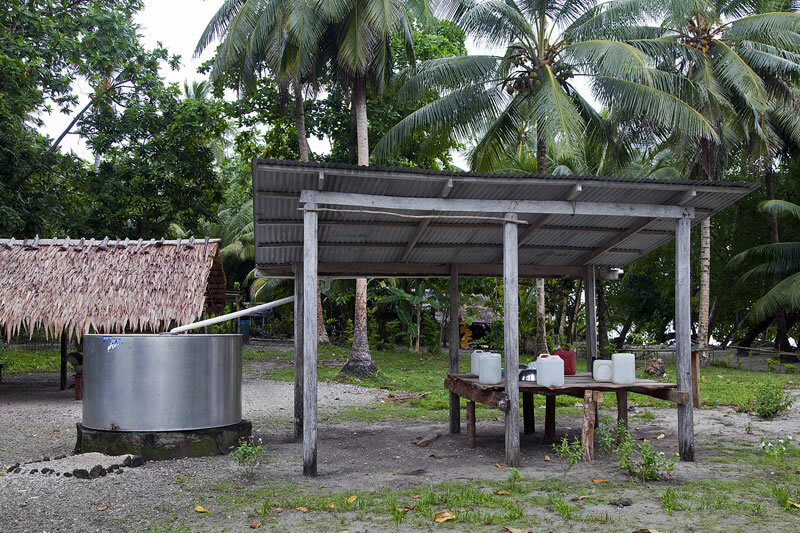 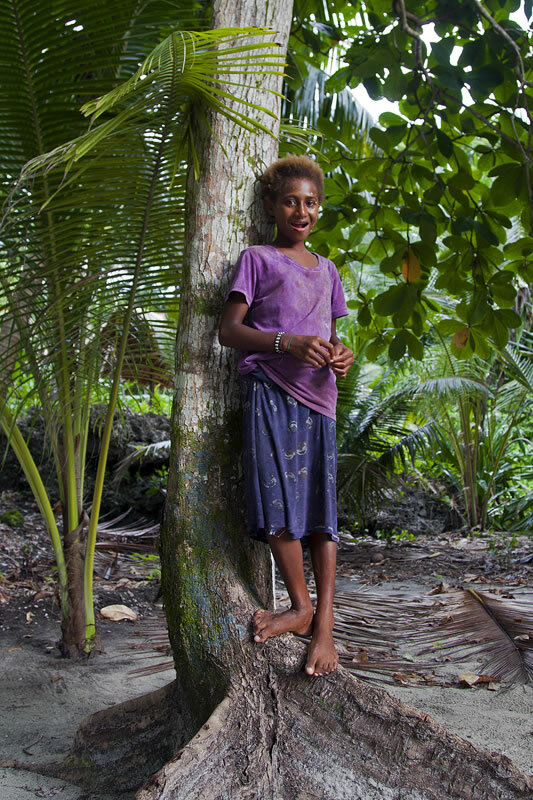 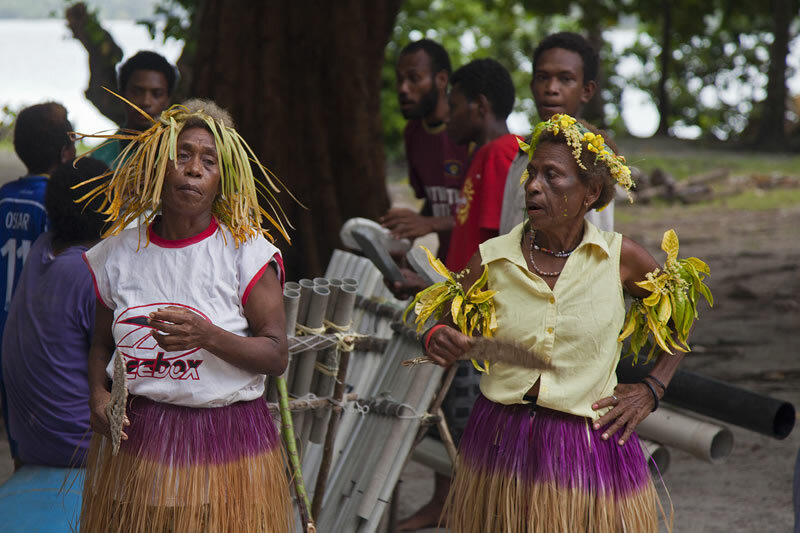 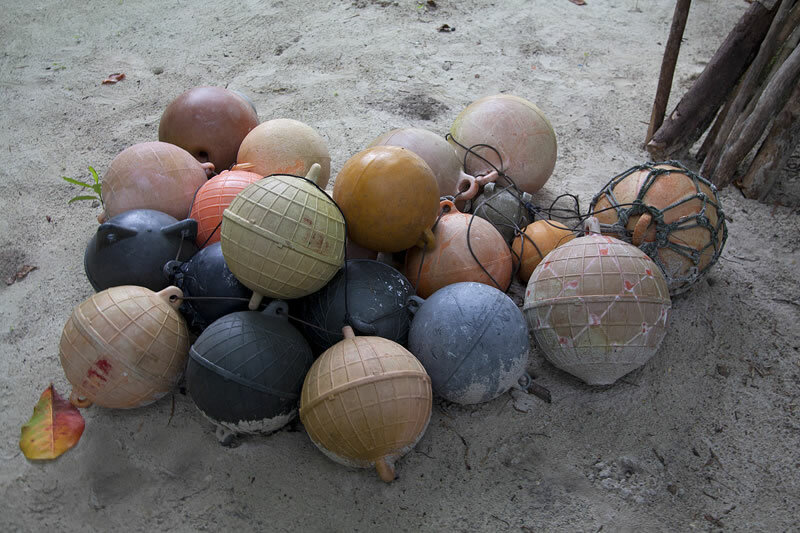 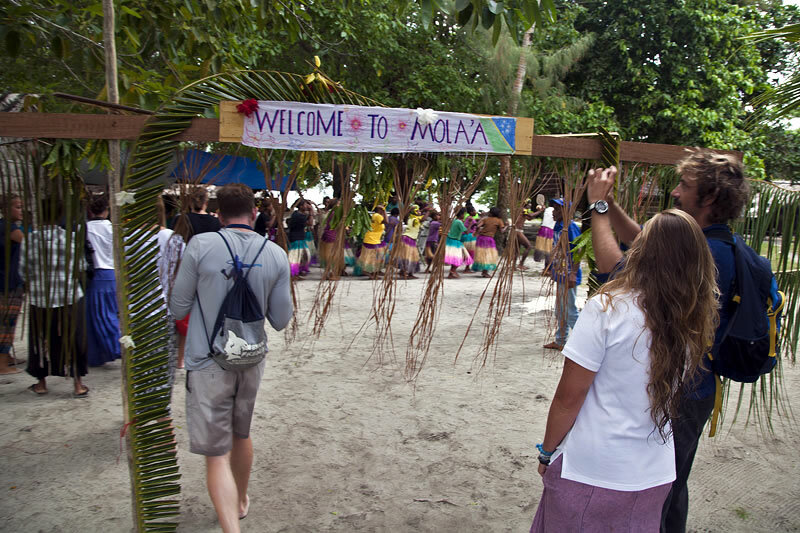 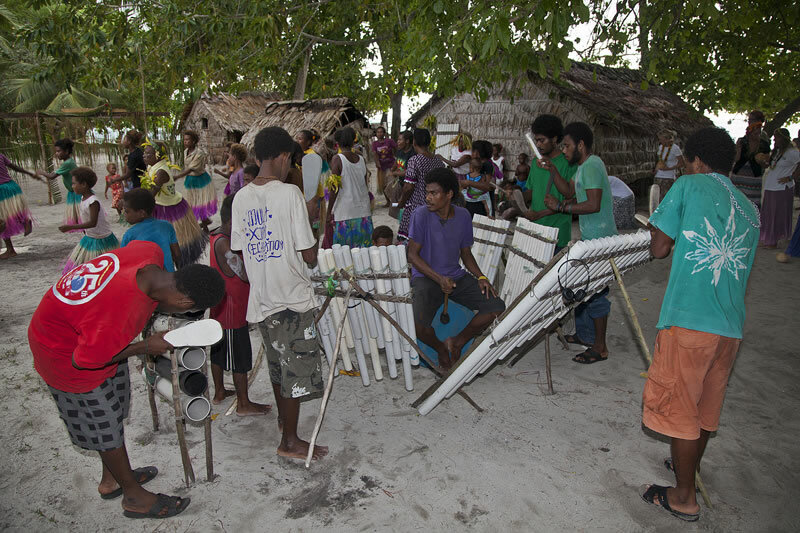 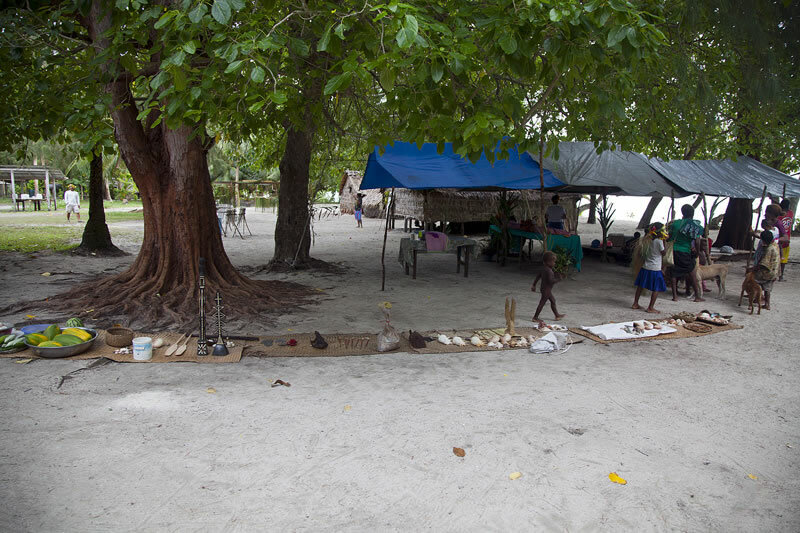 Traditional fishing weight used to sink handlines – made of palm fronds tied around a rock. 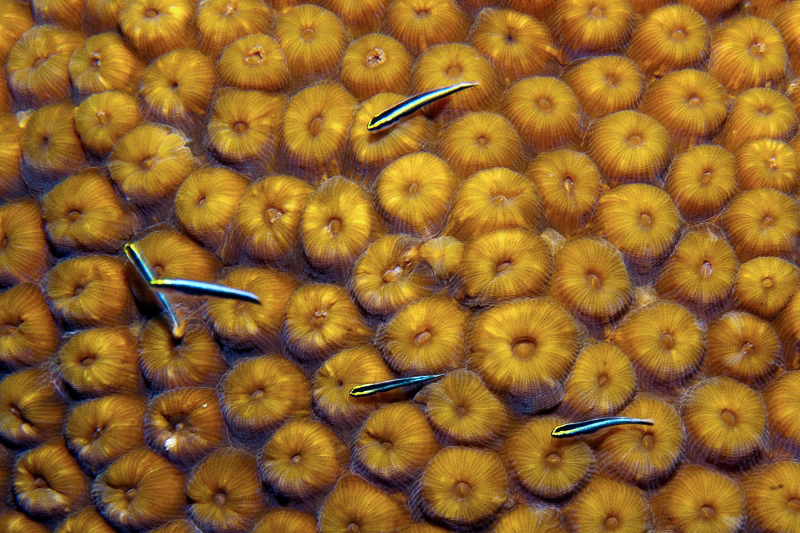 School of blue and yellow fusiliers (Caesio teres) swimming over the top of a plating coral. 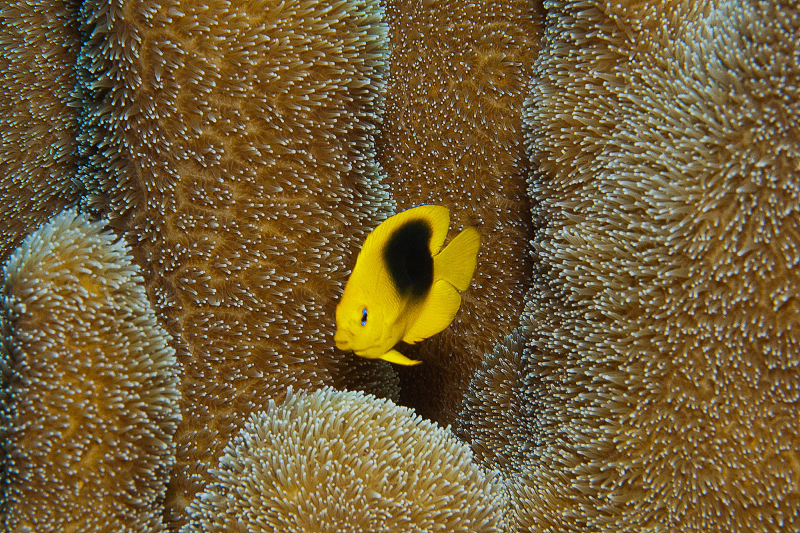 Juvenile Threespot Damselfish swimming in Pillar Coral. 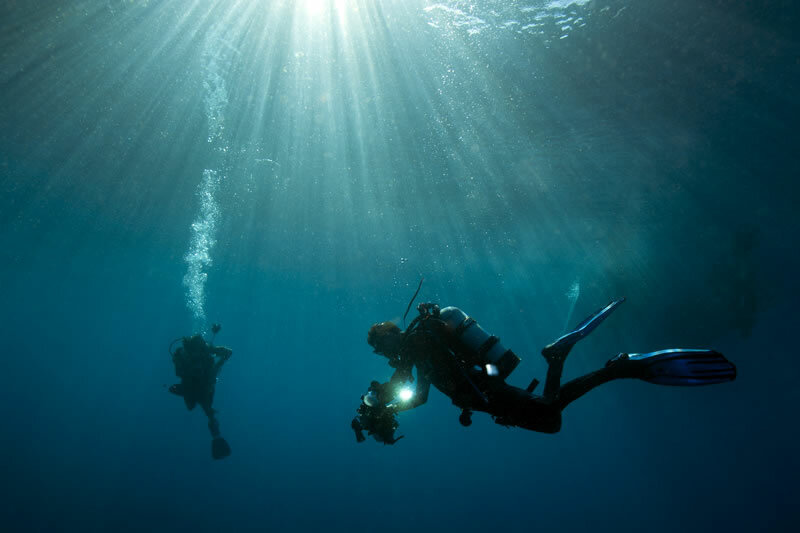 Scientists surfacing from a dive. 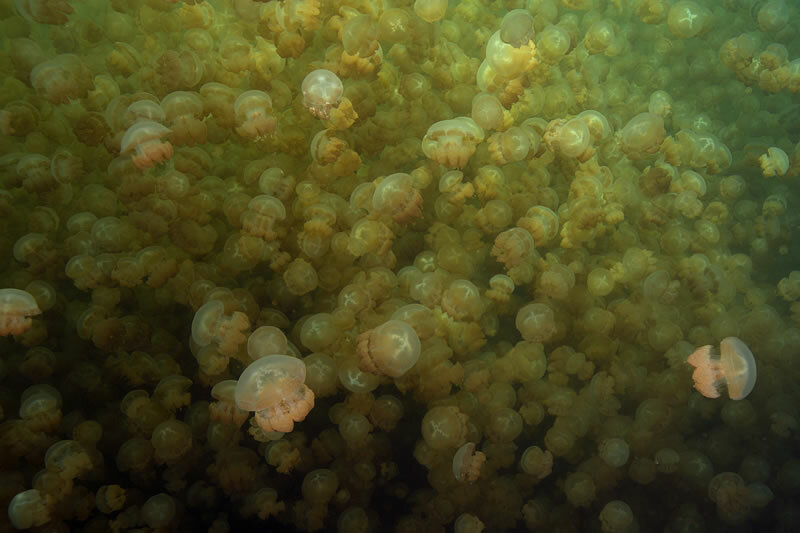 We just surfaced from a dive to see this beautiful view. 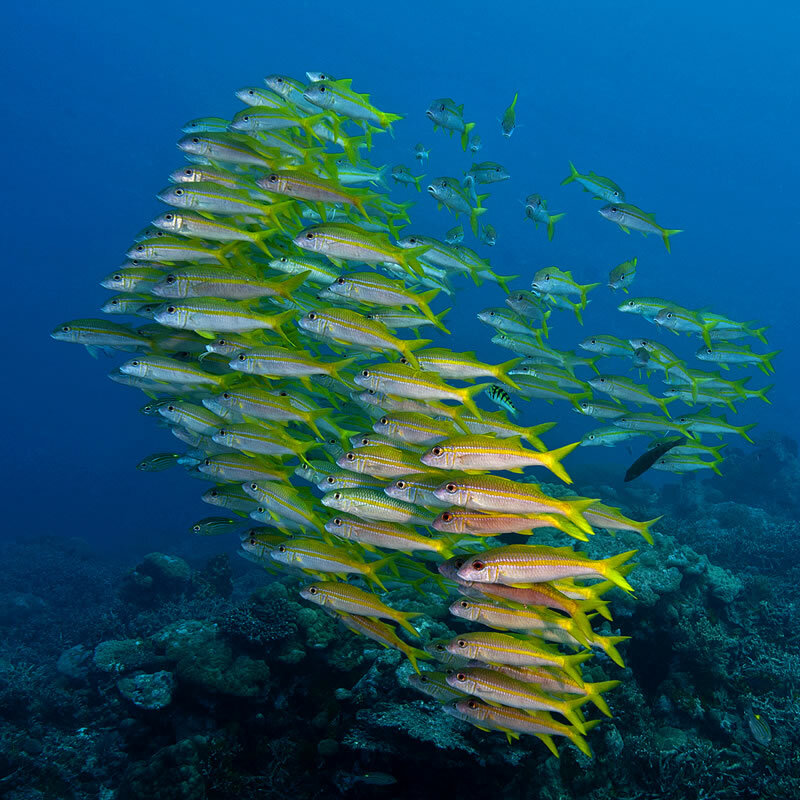 School of blue and yellow fusiliers (Caesio teres). 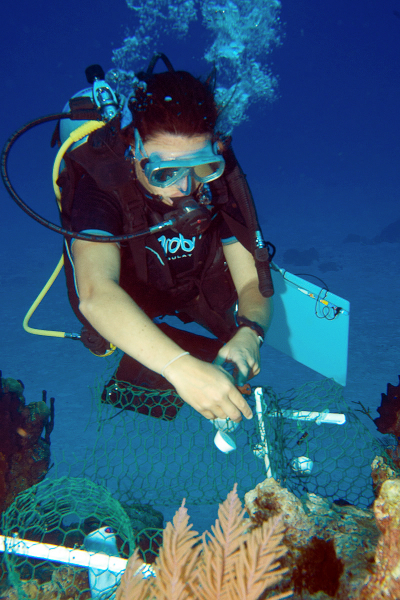 Dr. Sonia Bejarano conducts a scientific survey. 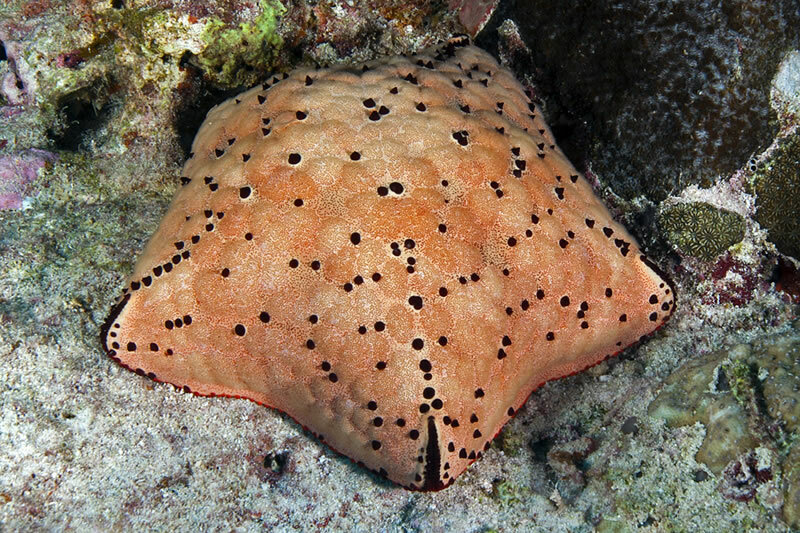 Here is a close-up photo of a cushion star. 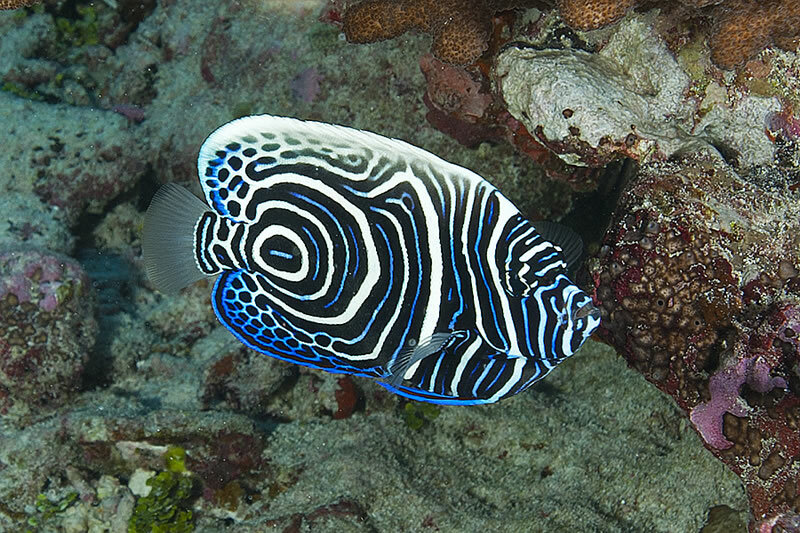 Giant Sweetlips (Plectorhinchus albovittatus) makes a close pass out of curiosity. 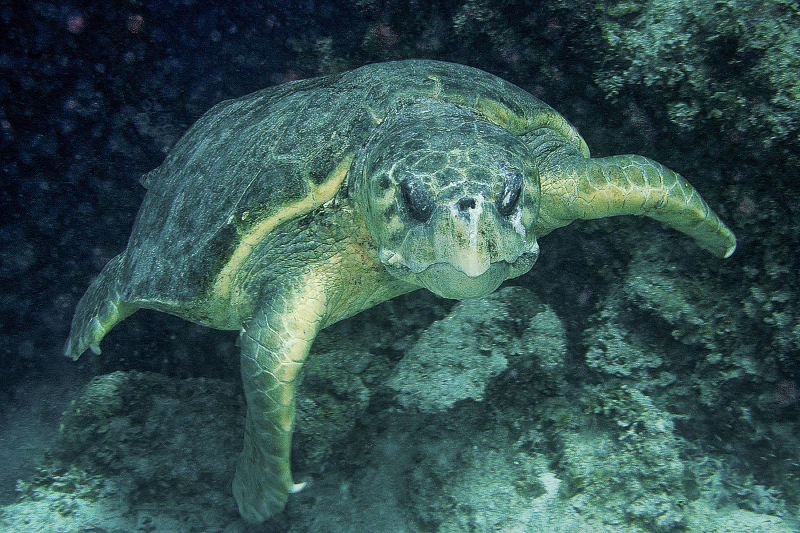 Green sea turtle (Chelonia mydas) cruising by the divers today near Vanikoro Island. 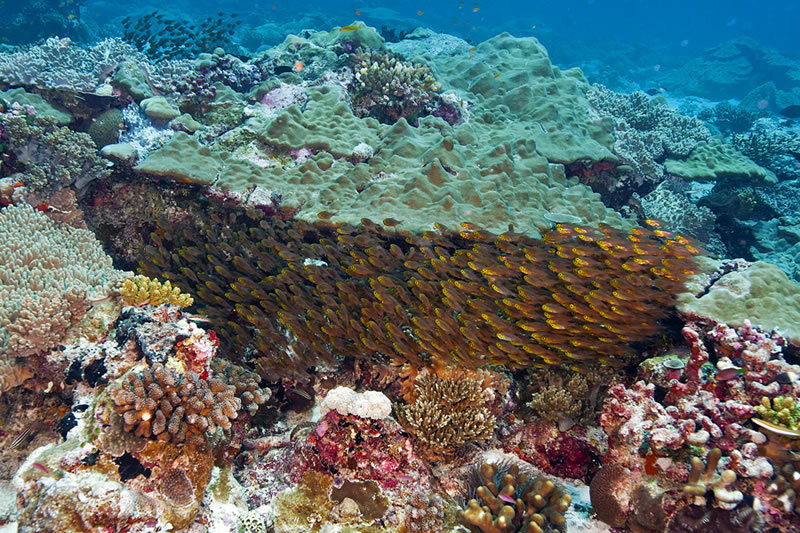 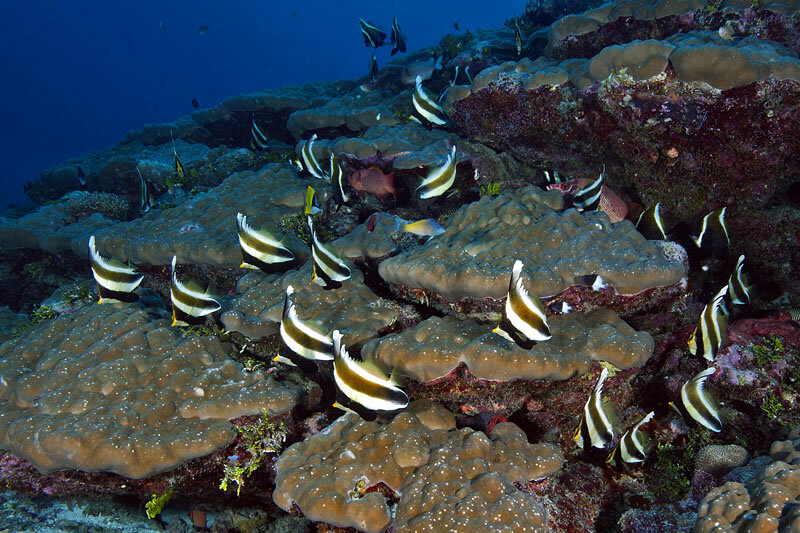 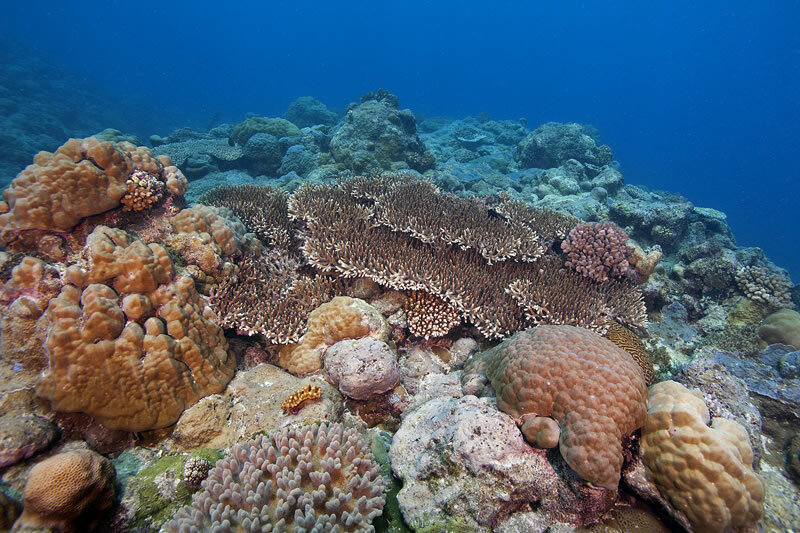 Mounding Porites and short-branched tabular Acropora corals cover the reef along a sloping dropoff. 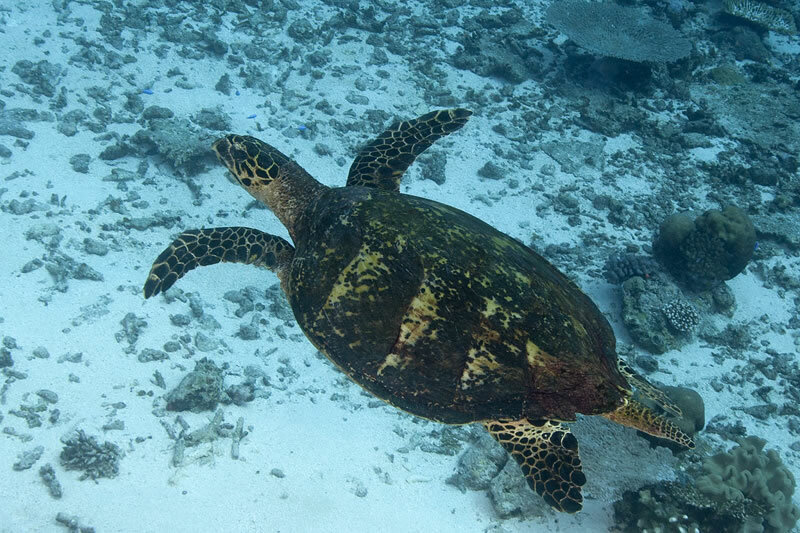 On one of our dives, a hawksbill sea turtle (Eretmochelys imbricata) swam by us today. 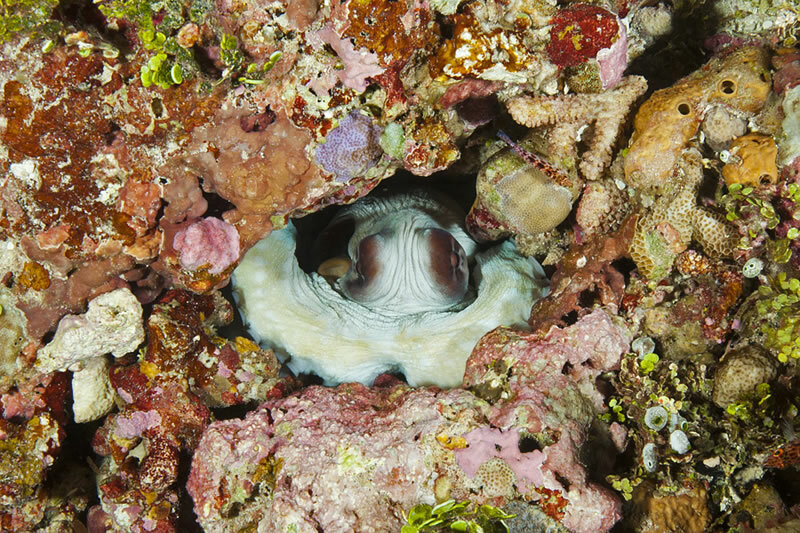 Day Octopus (Octopus cyanea) emerges from a hiding hole between corals. 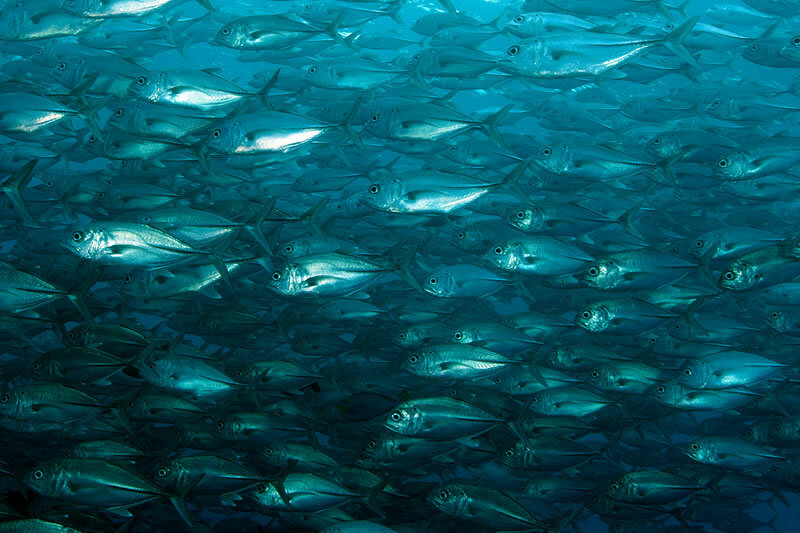 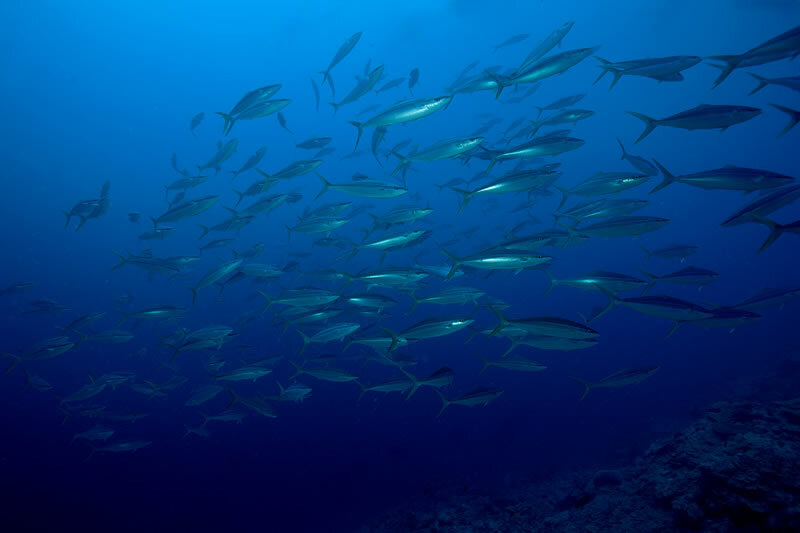 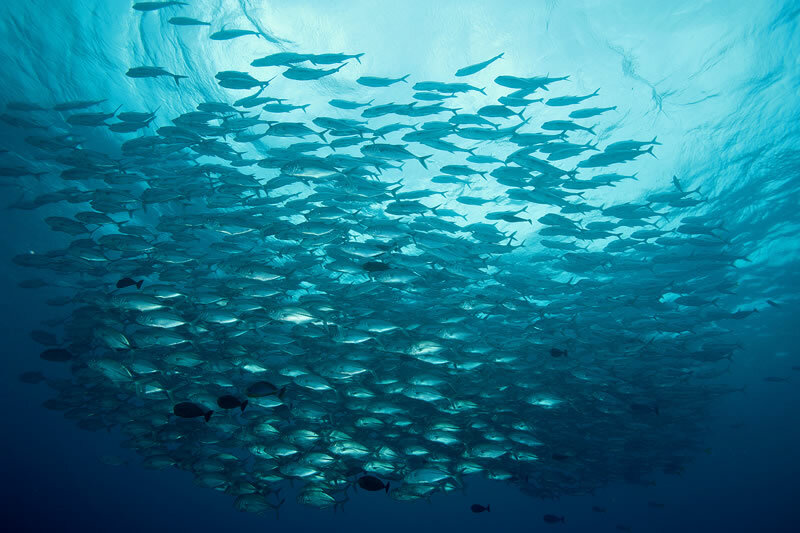 School of bigeye trevally (Caranx sexfasciatus). 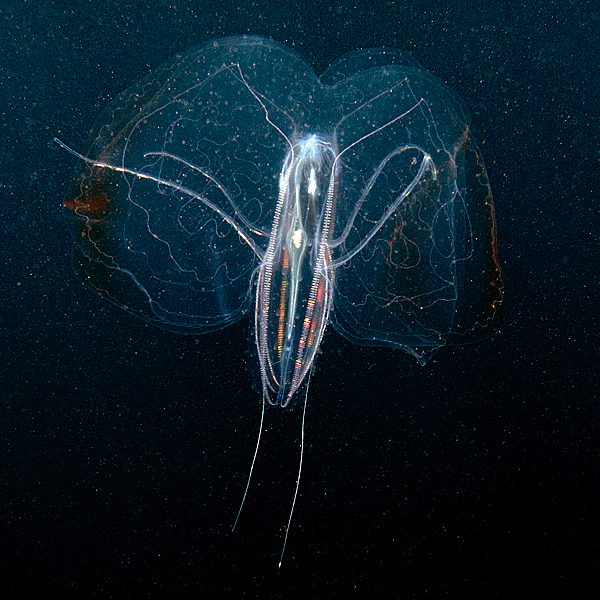 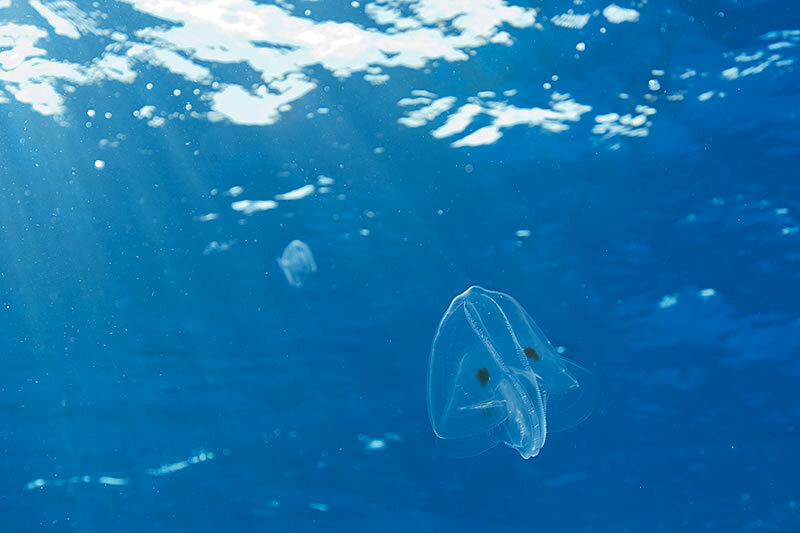 Ctenophore comb jelly swimming below the rain dappled surface. 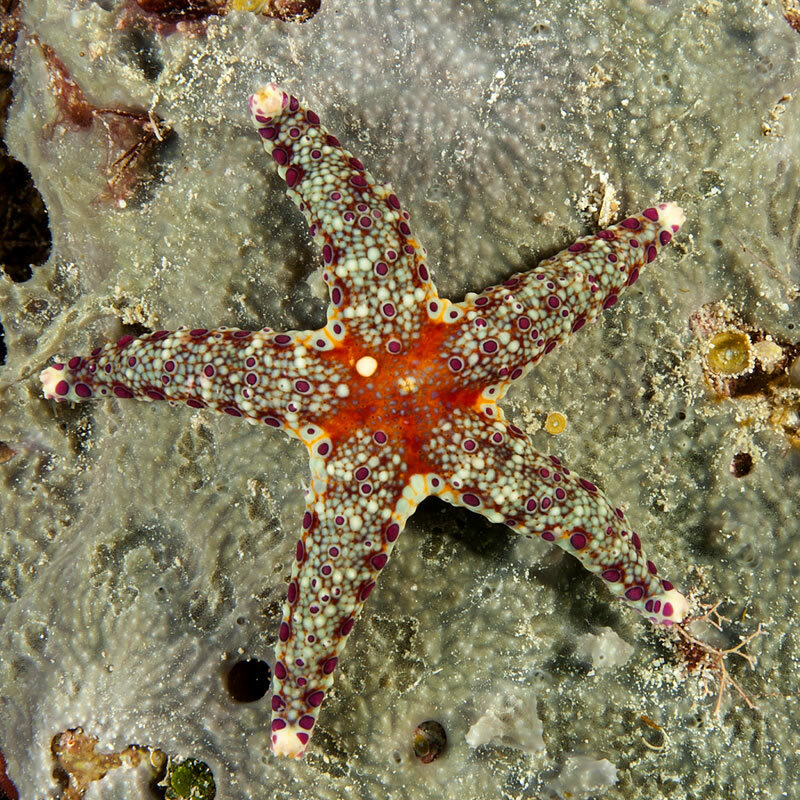 Luzon Sea Star (Echinaster luzonicus) on Goniastrea sp. 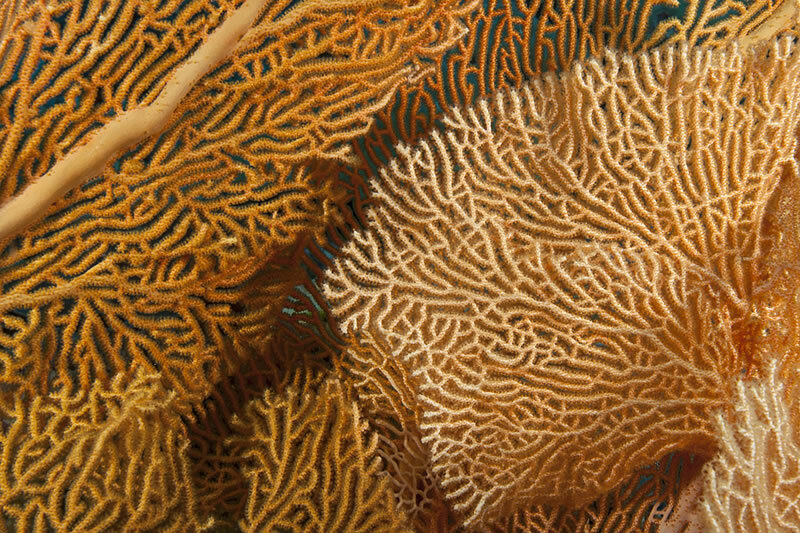 coral. 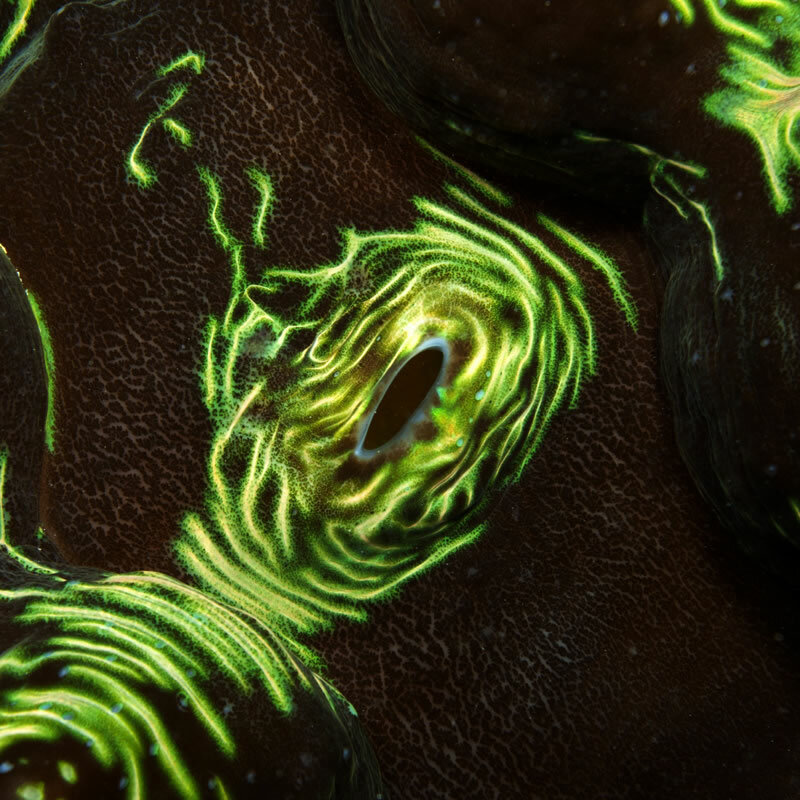 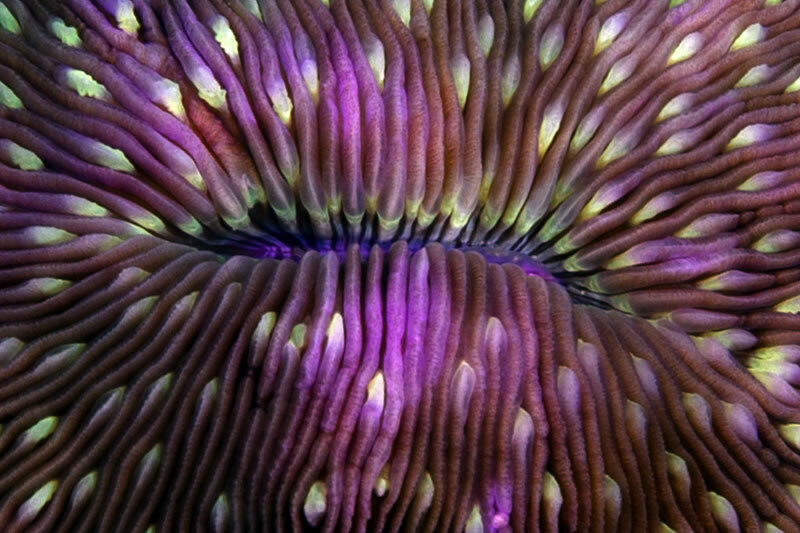 Fungia fungites mushroom coral abstract detail. 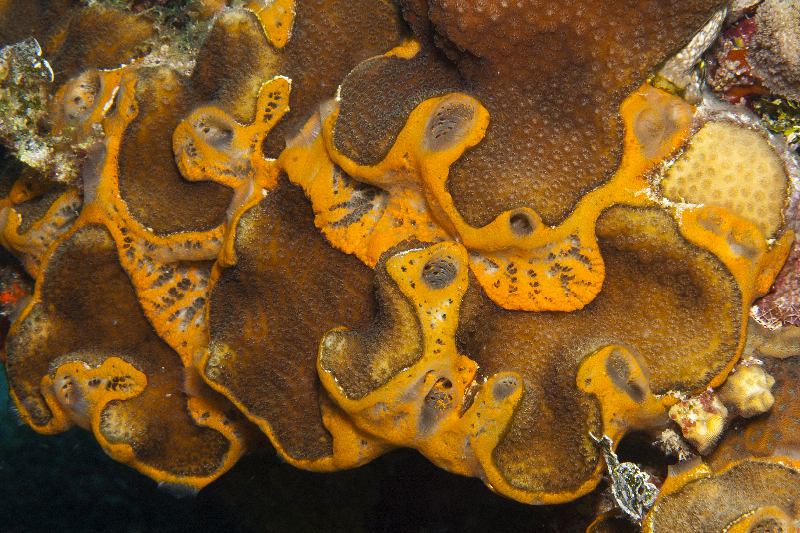 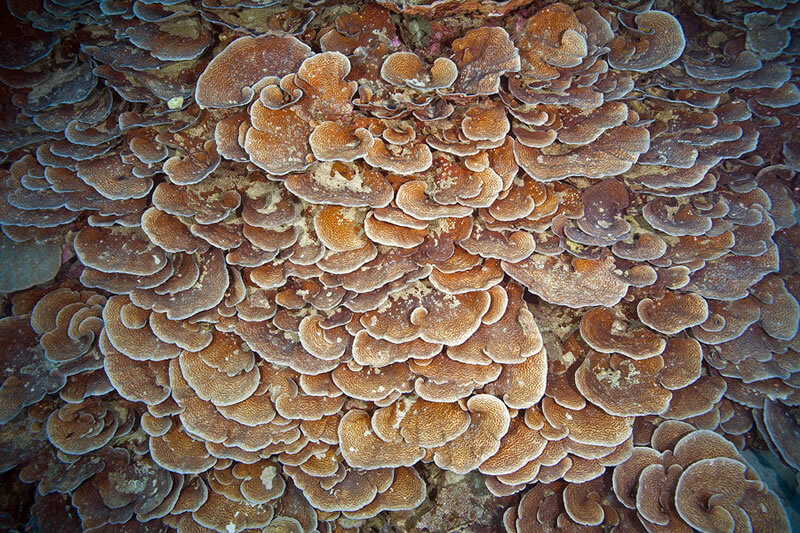 Chinese Lettuce Coral (Mycedium elephantotus). 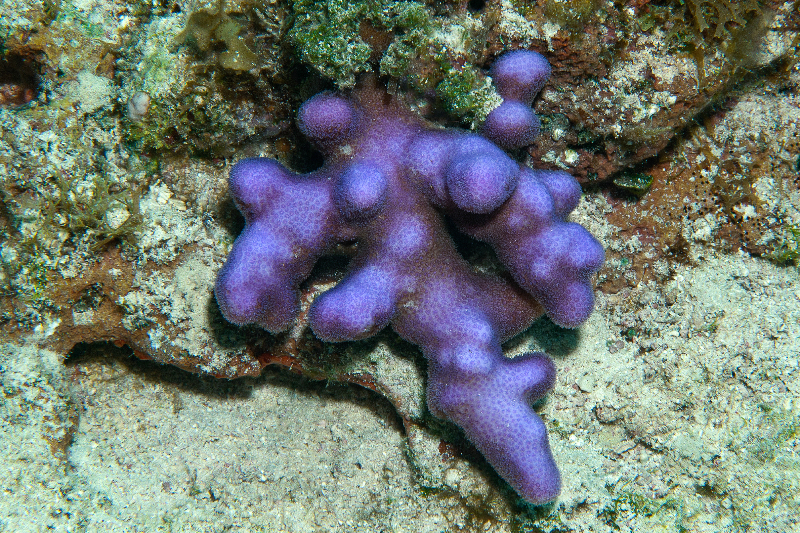 Acropora digitifera with bright blue apical polyps and base where active growth is taking place. 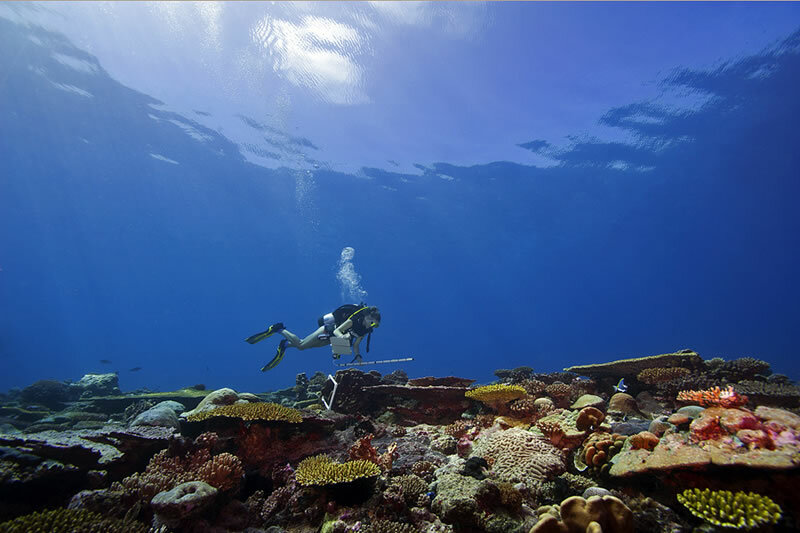 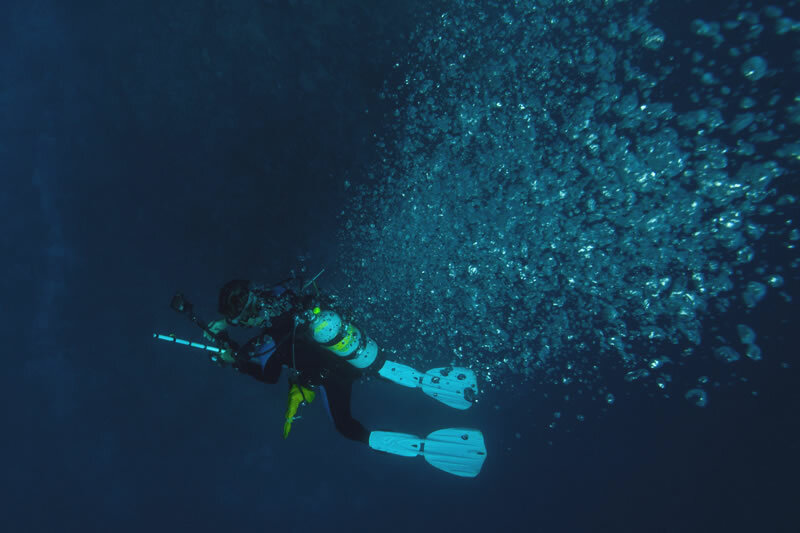 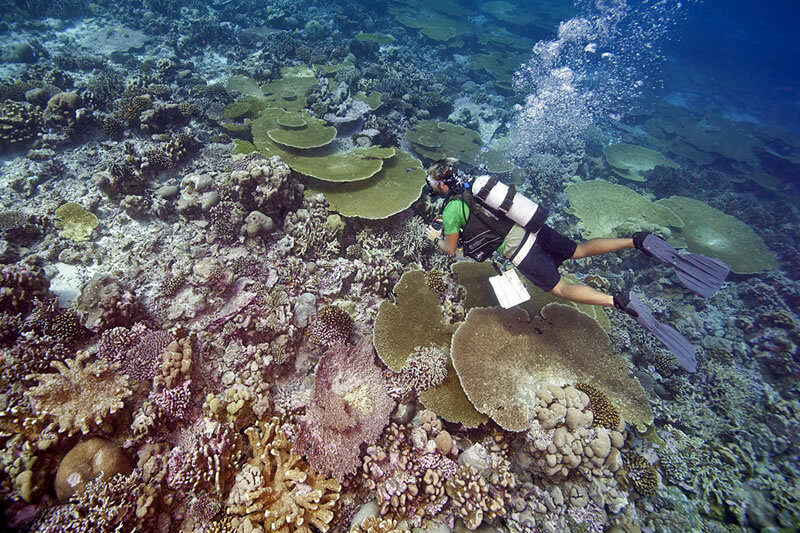 Chief Scientist Andy Bruckner descents to the reef in a shower of bubbles. 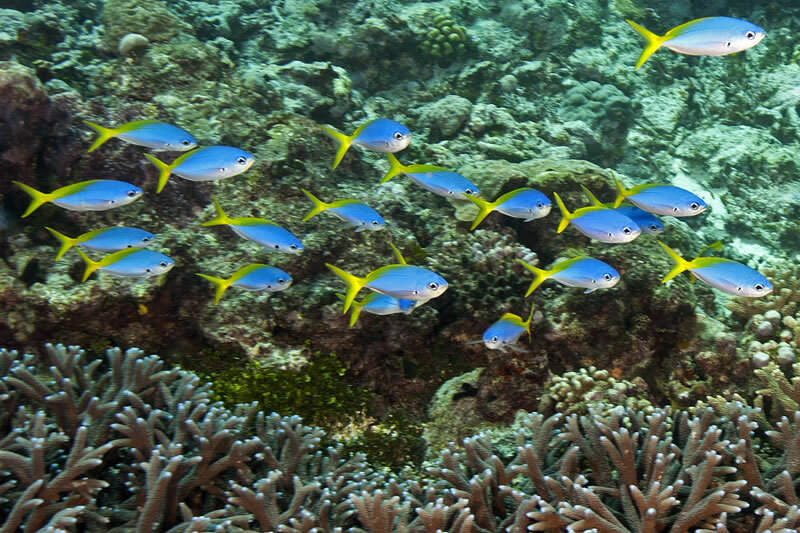 School of Rainbow Runners (Elagatis bipinnulatus) buzz by the reef. 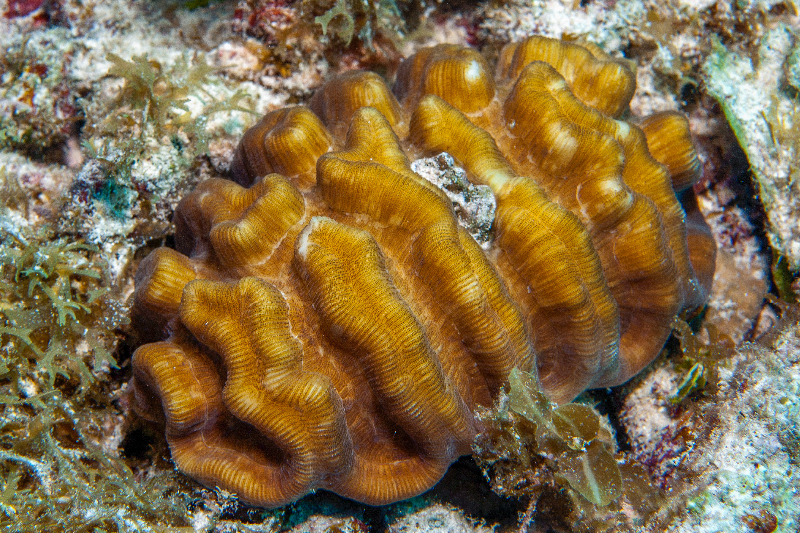 Smooth Giant Clam (Tridacna derasa). 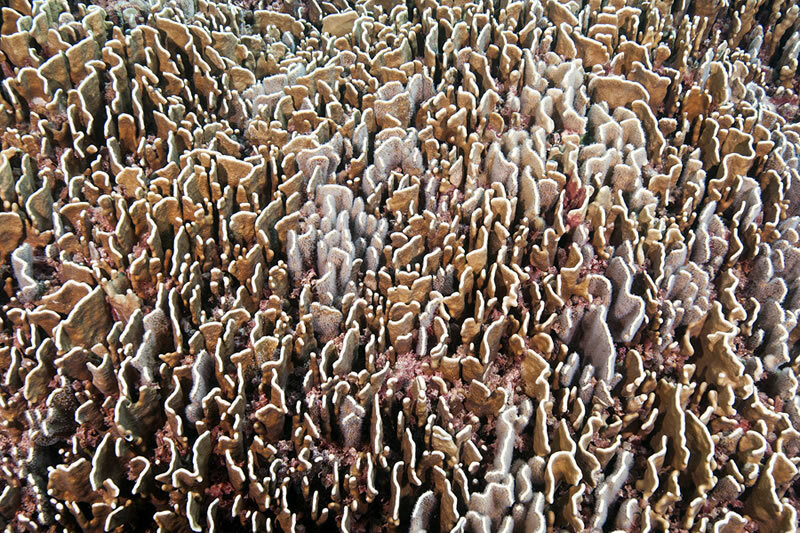 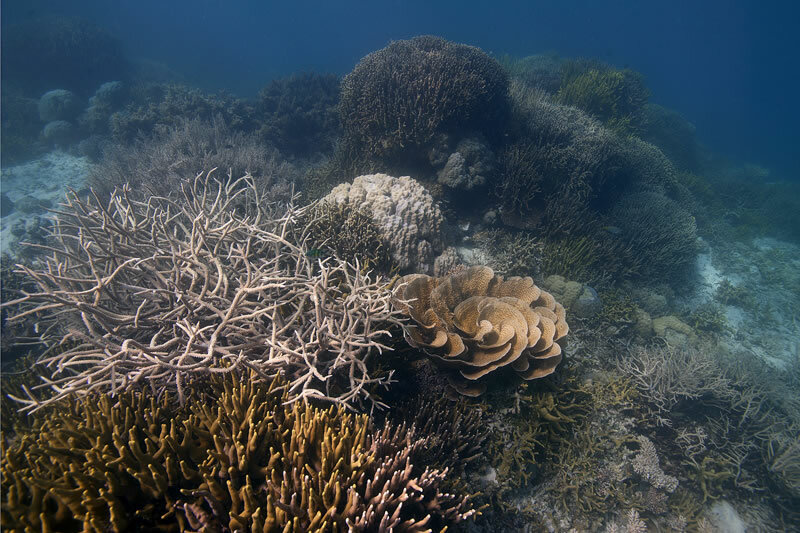 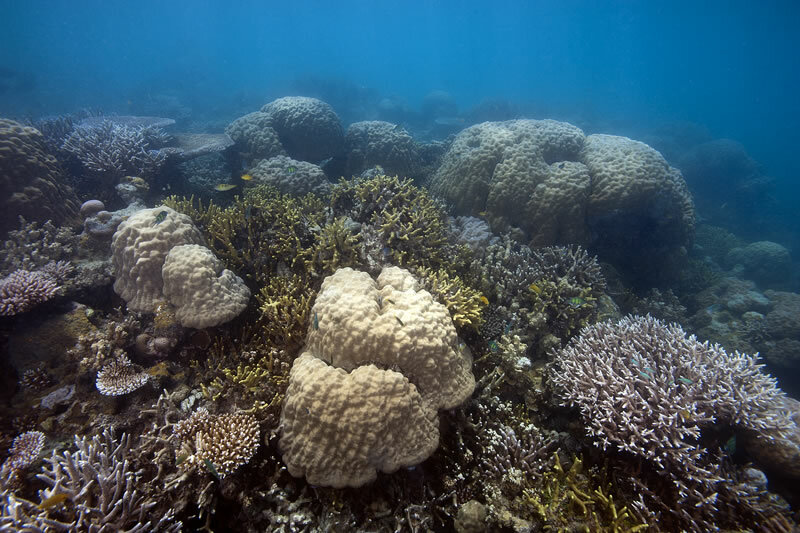 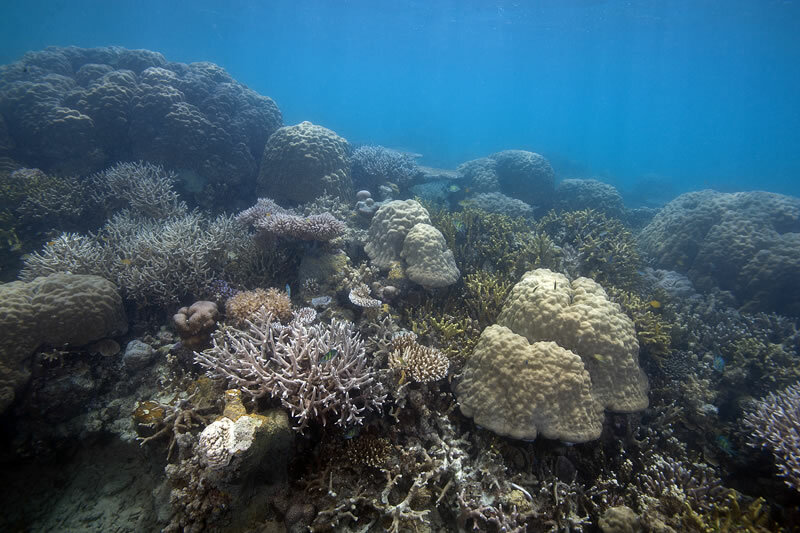 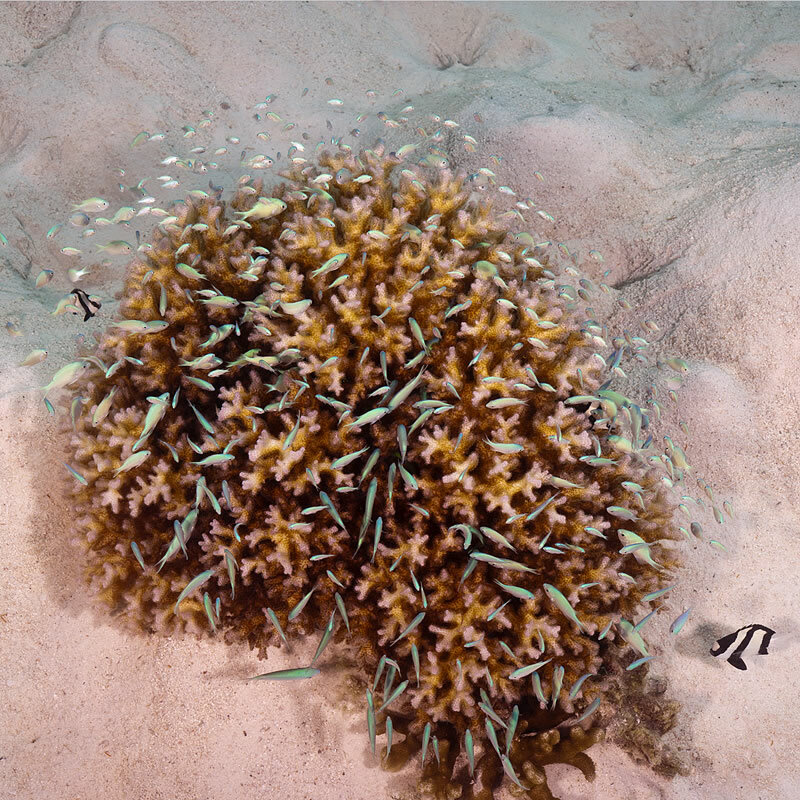 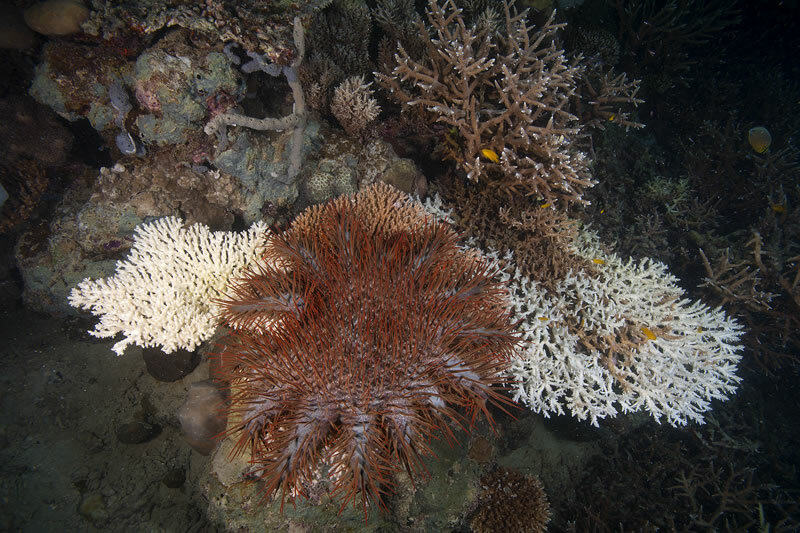 Shallow reef composed of thickets of brancing Acropora, digitate Porites, and leafy scrolls of Turbinaria corals. 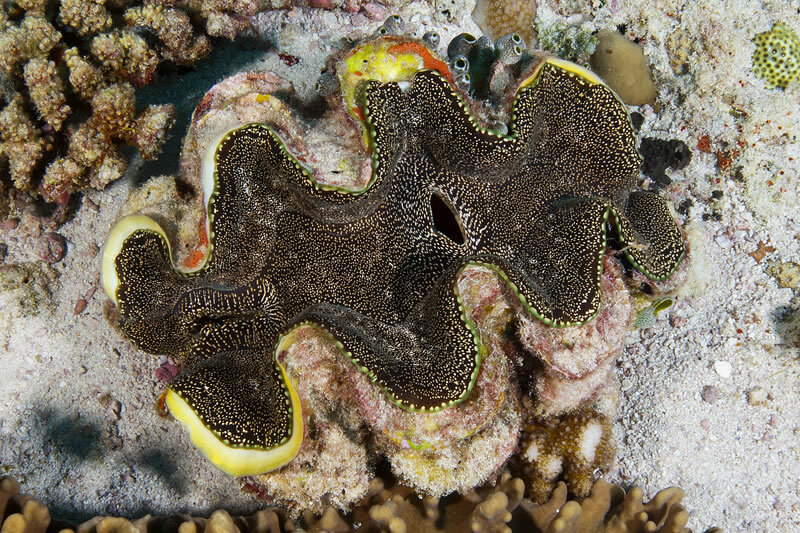 Large Crown of Thorns seastar (Acanthaster planci) eating table acroporid corals. 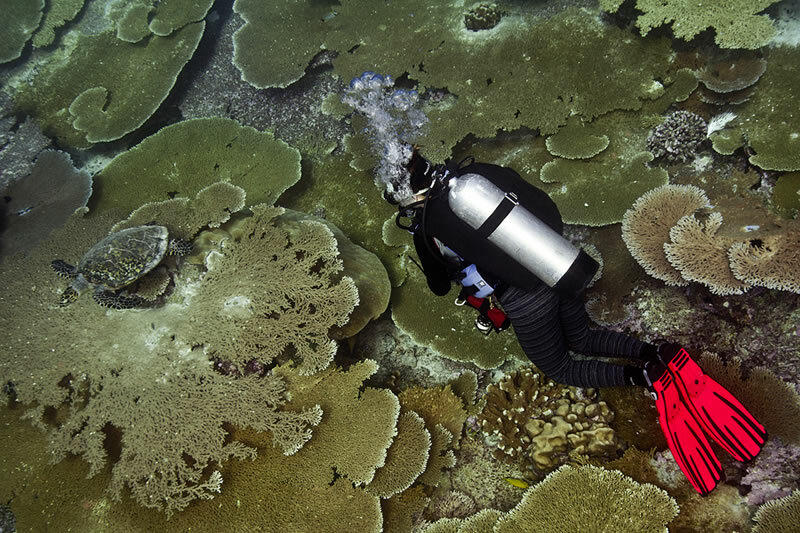 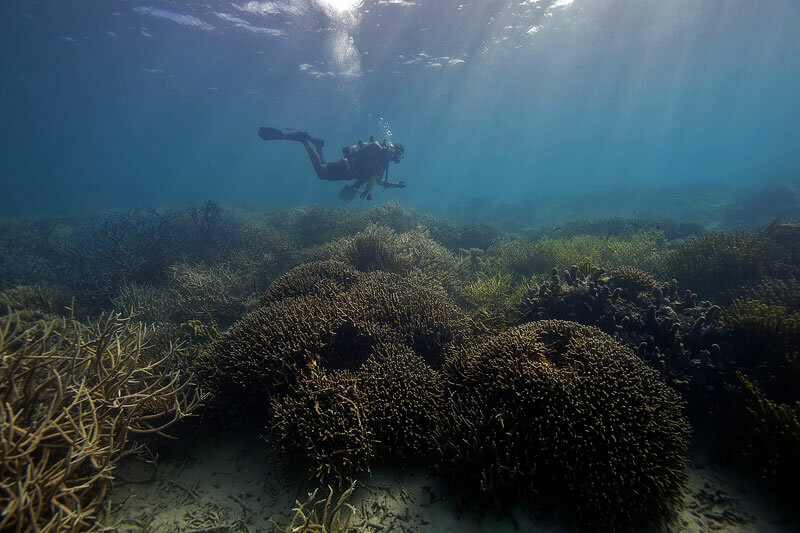 Anderson Mayfield swims the shallows over mounds of digitate Porites corals and thickets of Acropora. 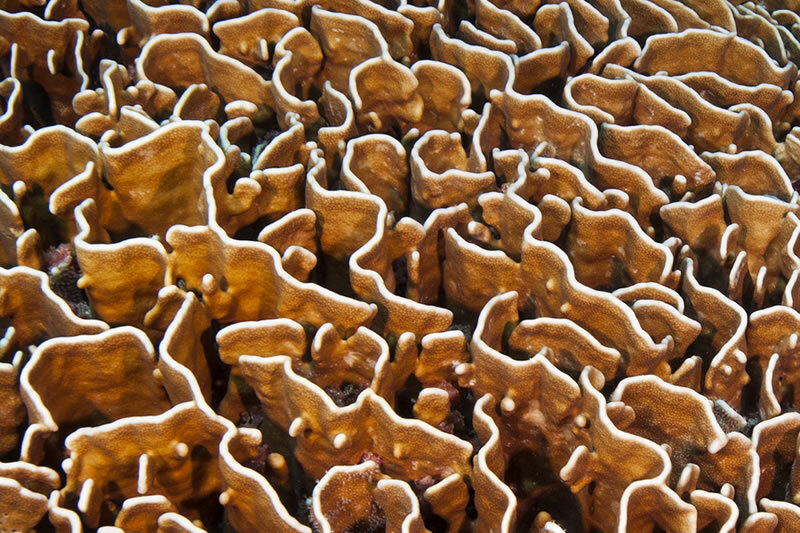 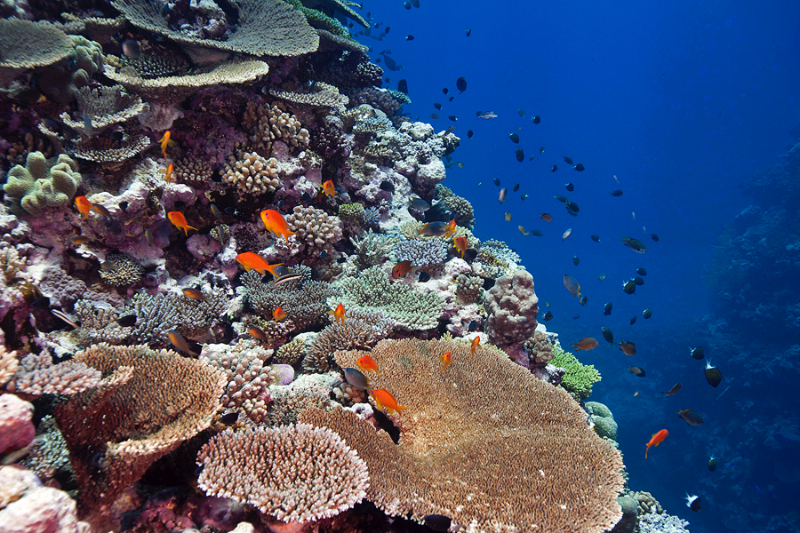 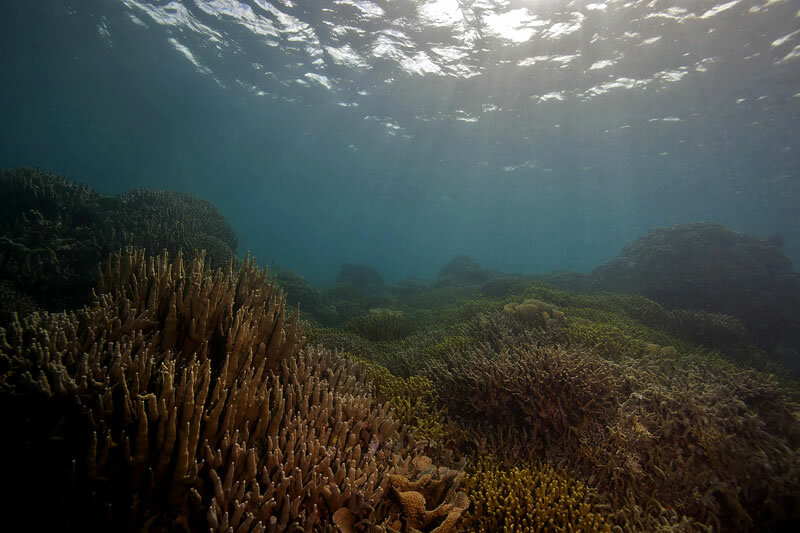 Waves of sunlight cast through the shallows of a reef covered in Porites and Acropora corals. 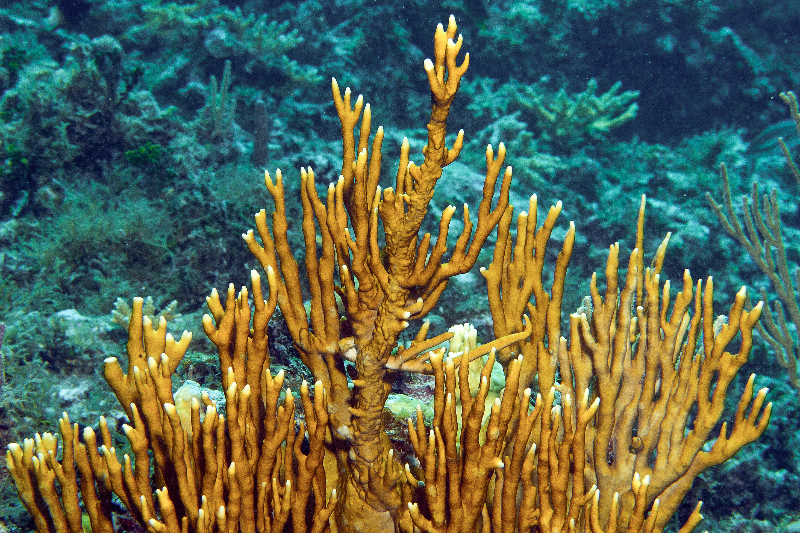 Red encrusting sponge covers the dead branches of an Acropora coral thicket. 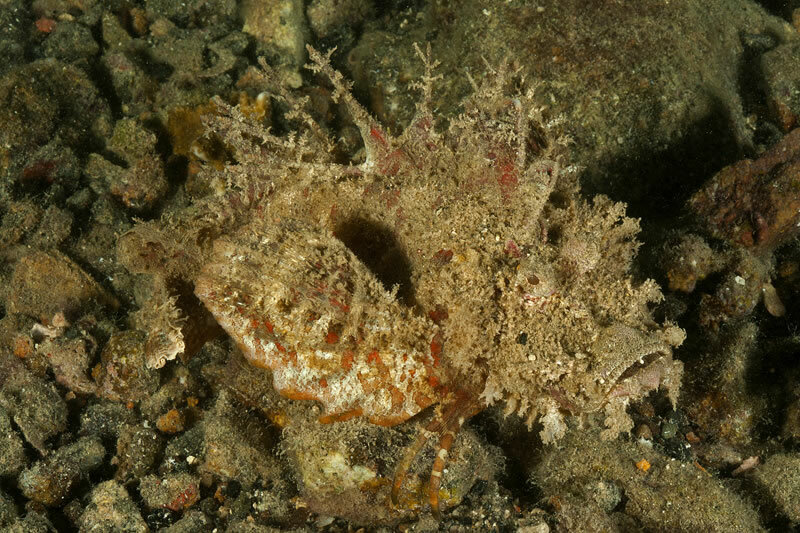 Papuan Scorpionfish (Scorpaenopsis papuensis) is a master of camouflage. 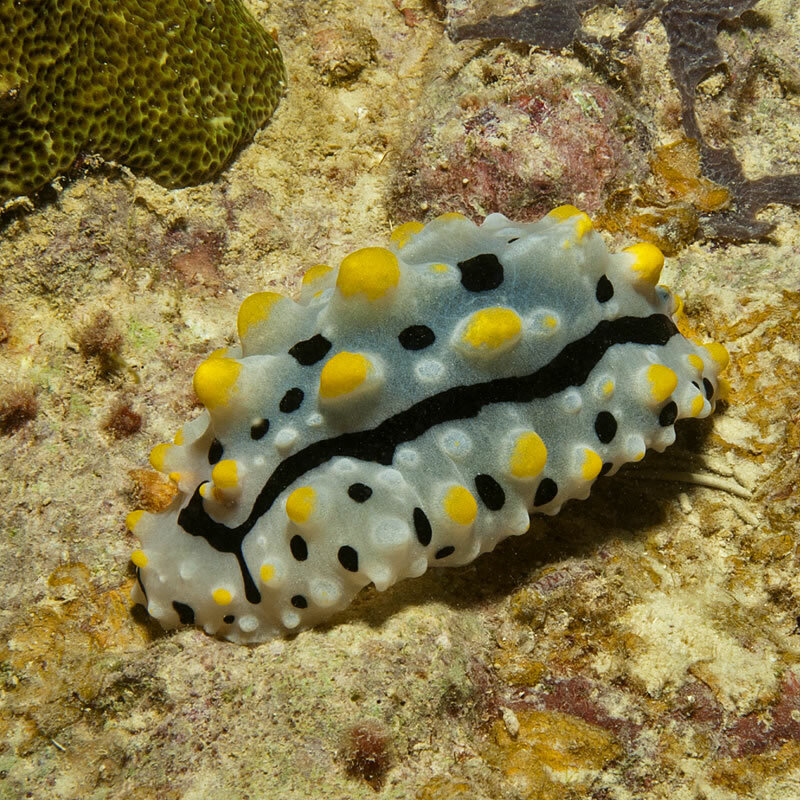 Swollen Phyllidia nudibranch (Phyllidia varicosa). 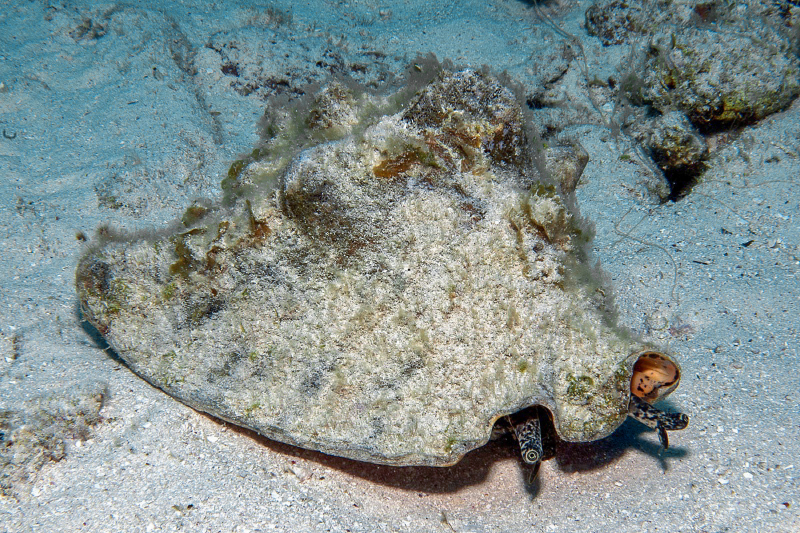 Large Feathertail Stingray (Pastinachus stephan) resting in the sand. 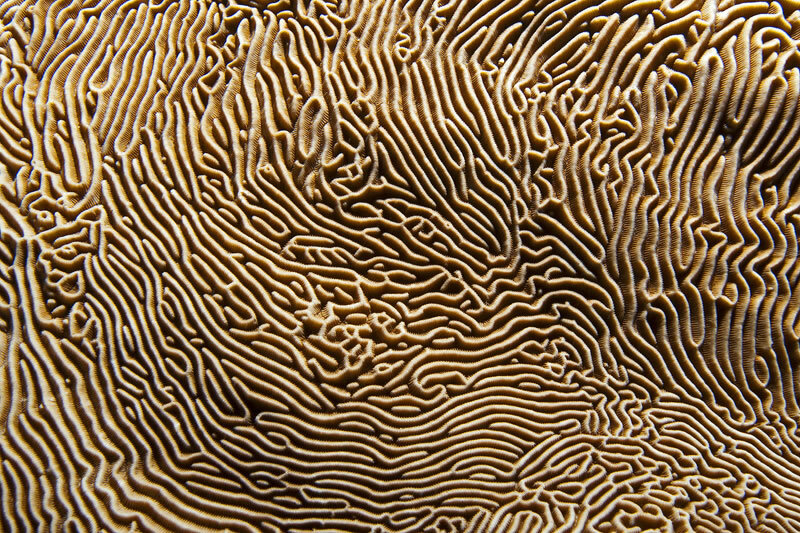 Textural detail of the surface of Pachyseris speciosa coral. 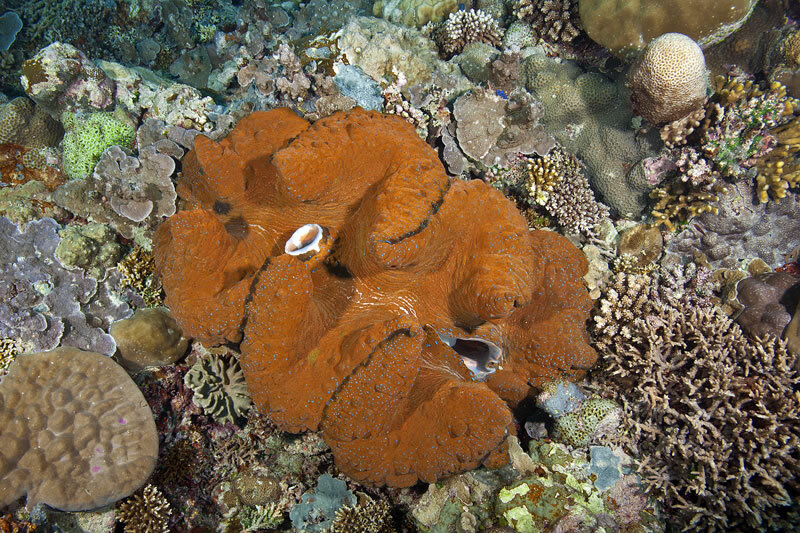 Very large giant clam (Tridacna gigas) nearly a meter long with a firey orange mantle. Family of pink anemonefish (Amphiprion perideraion) living in anemone. 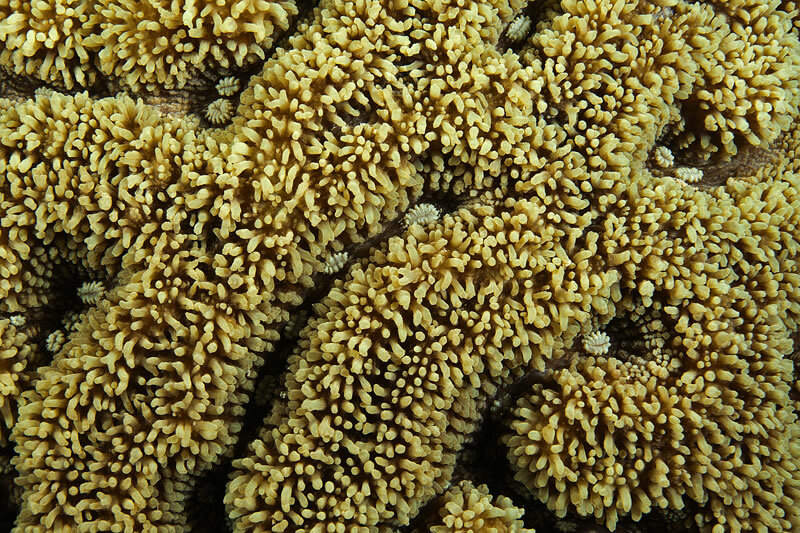 Each one of these corals is an individual coral polyp known as fungid coral. 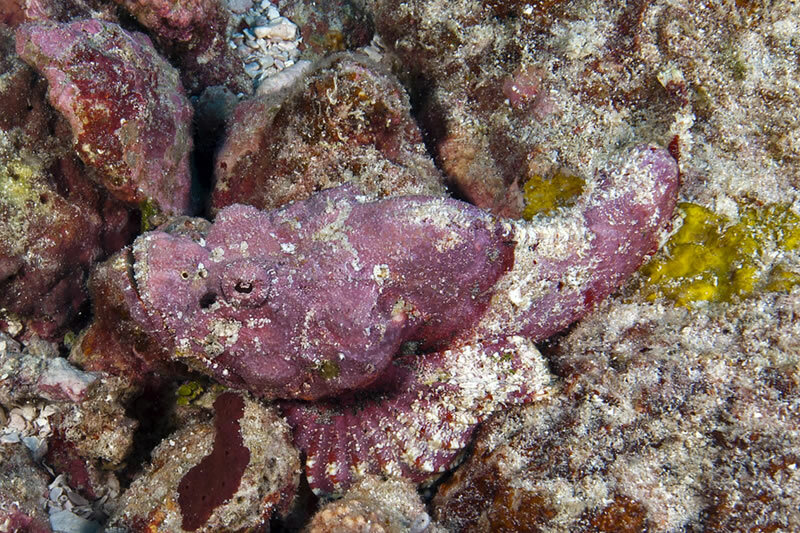 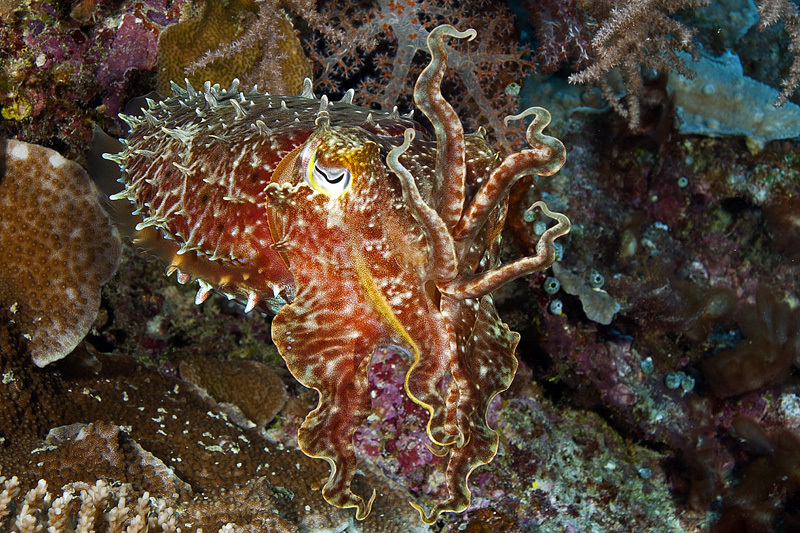 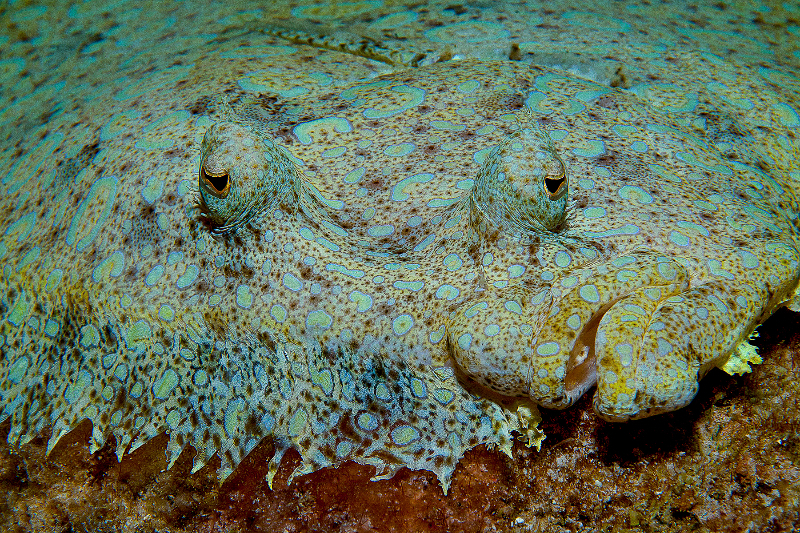 Day octopus (Octopus cyanea) changes its colors to try and camouflage with the background. 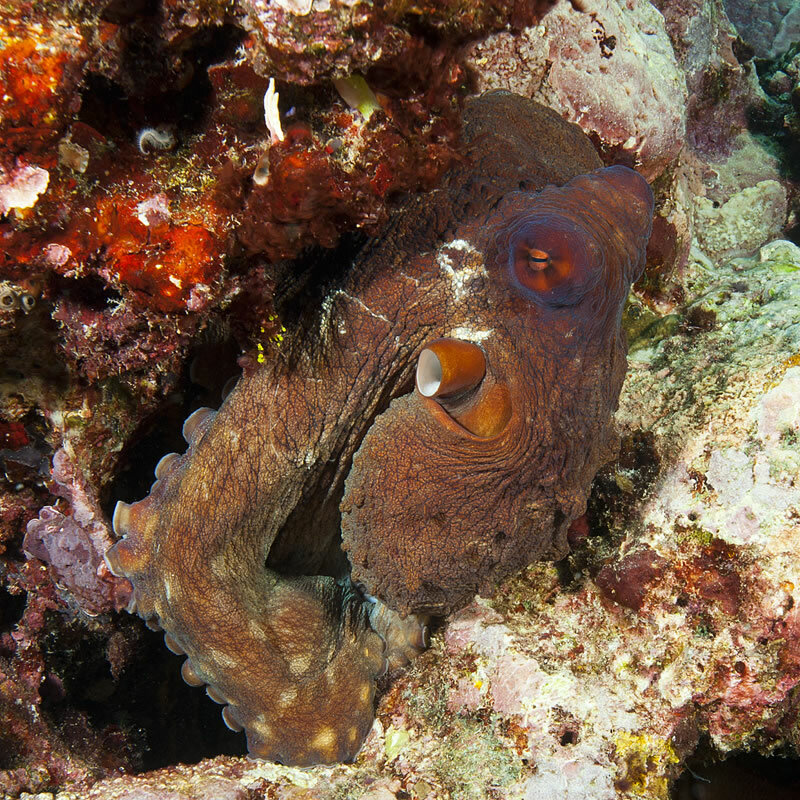 Day octopus (Octopus cyanea) crawling around the reef. 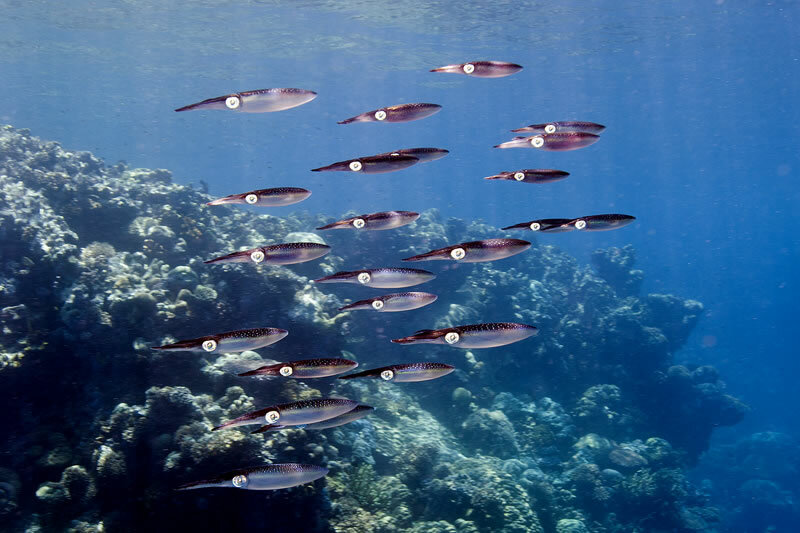 Shoal of bigfin reef squid (Sepioteuthis lessoniana). 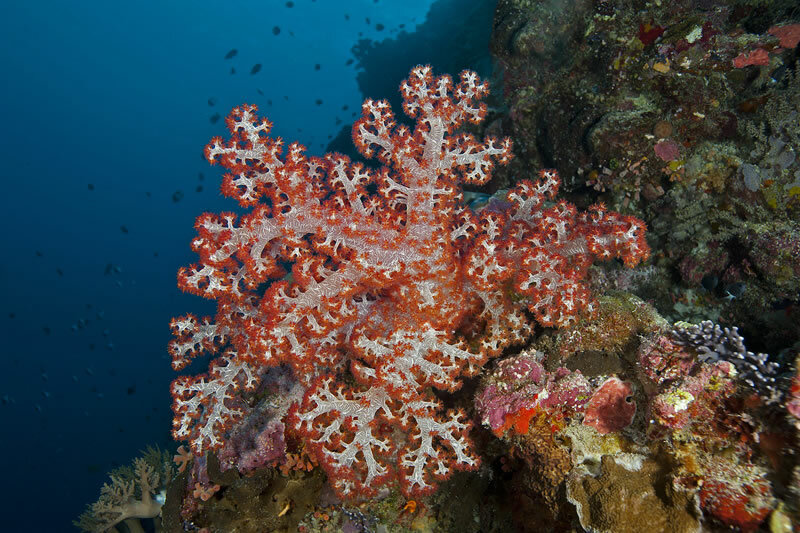 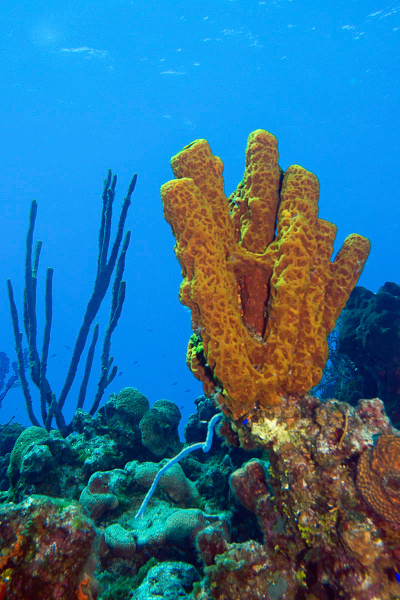 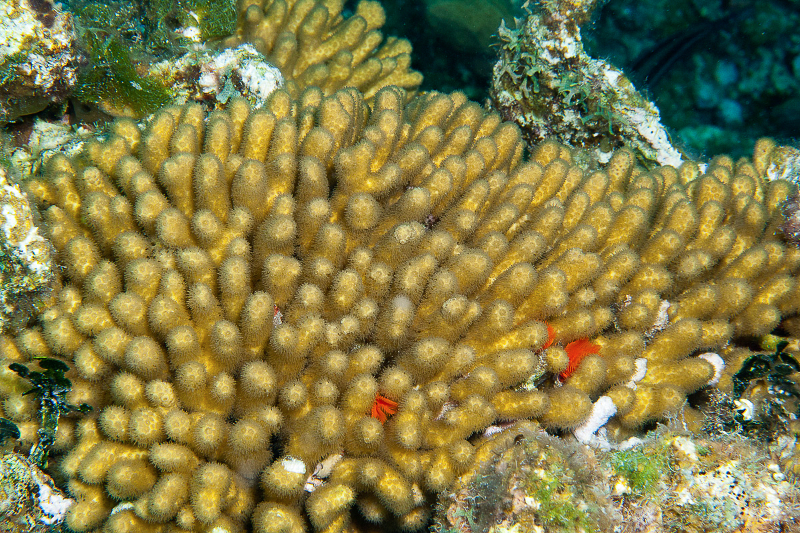 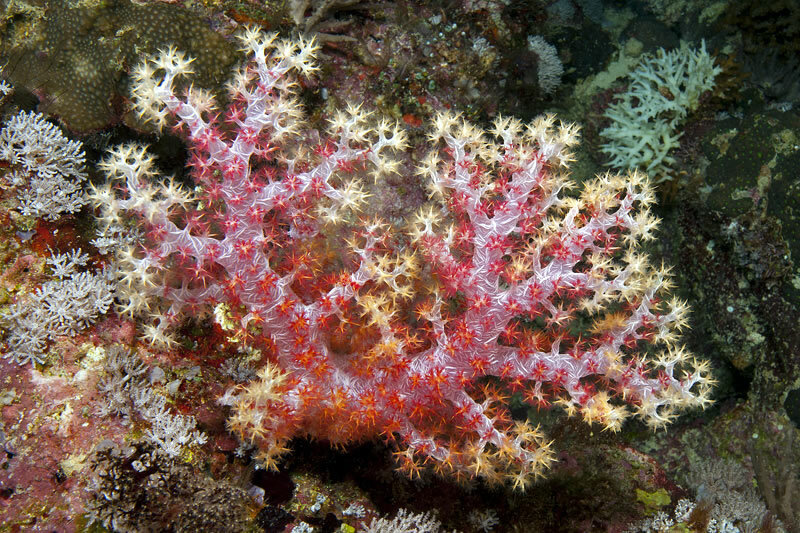 Sea whips (red) are a type of soft coral. 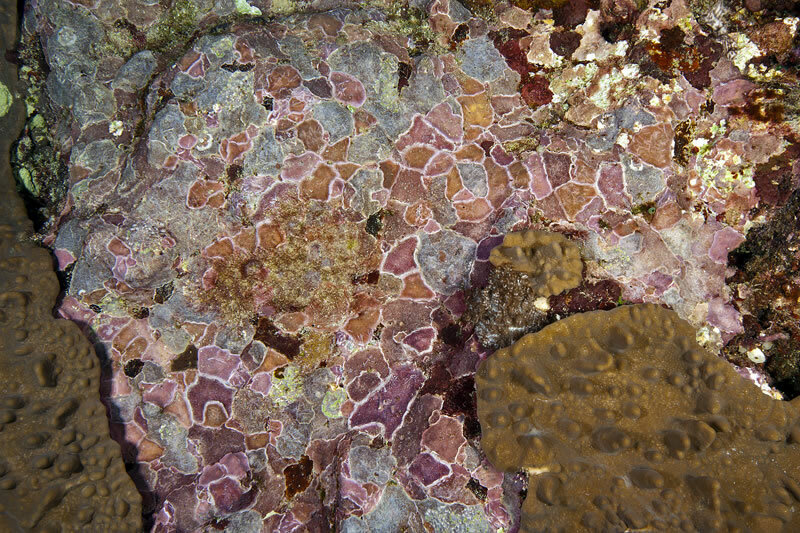 Mosaic of Crustose Coralline Algae (CCA). 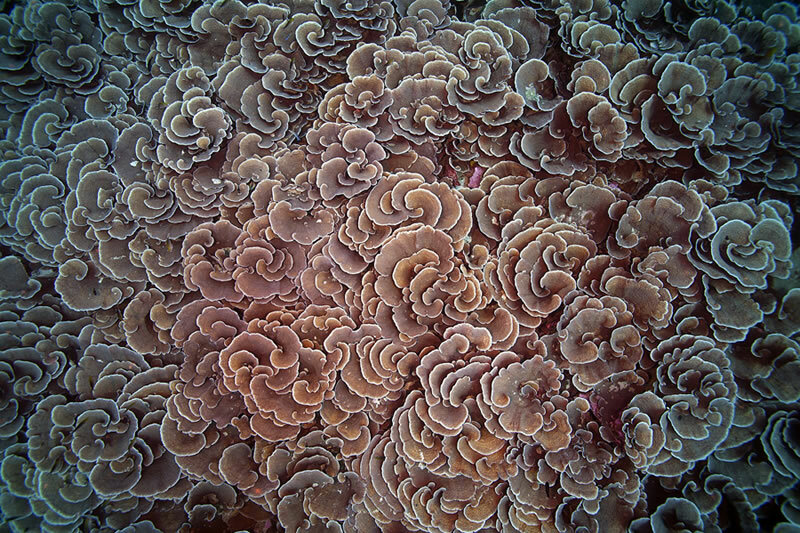 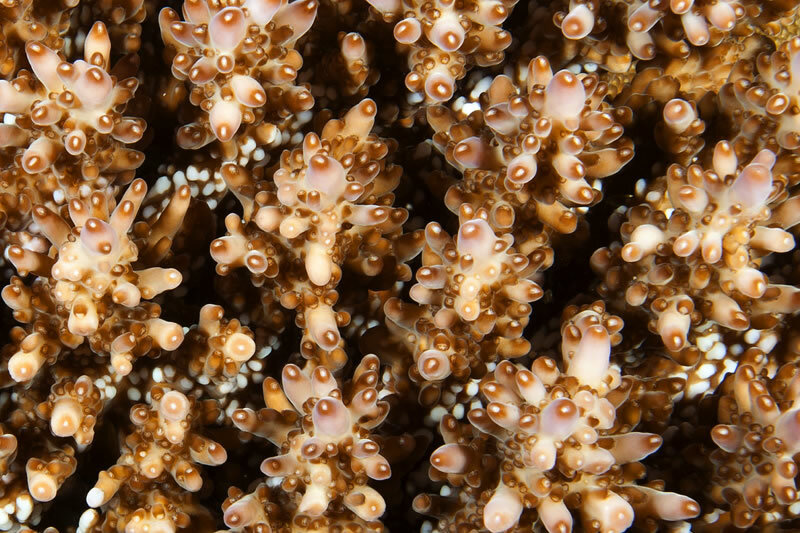 Close-up photo of a soft coral colony. 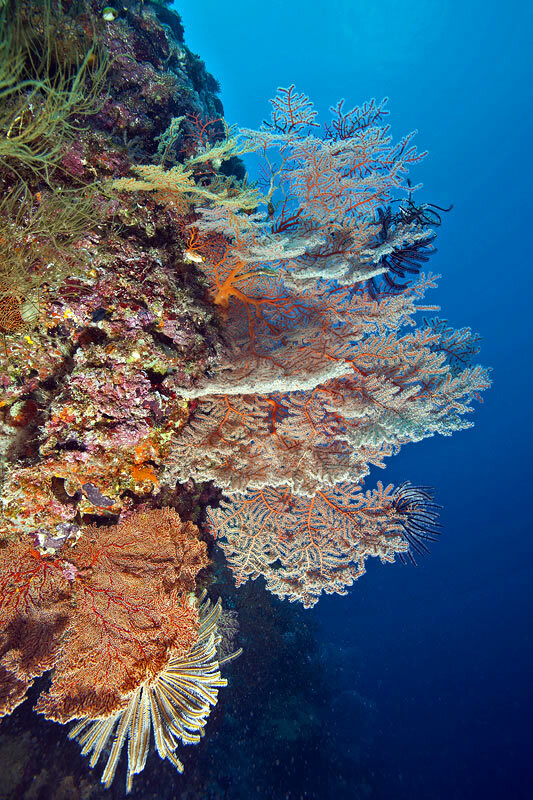 Garden of gorgonians, soft corals, and crinoids. 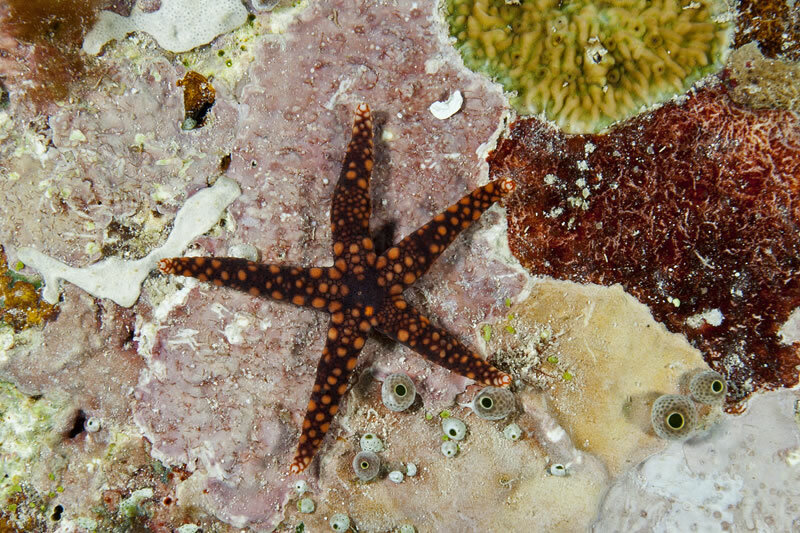 Warty sea stars (Echinaster callosus) are named after the large round bumps that cover their arms. 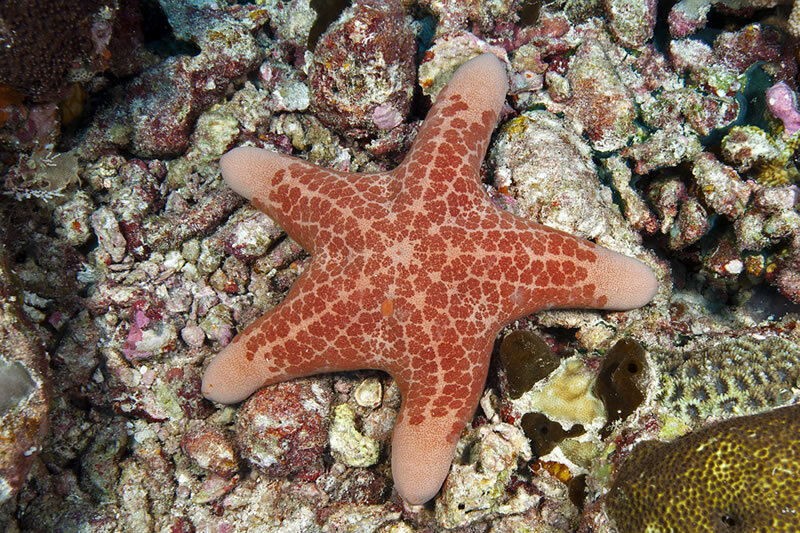 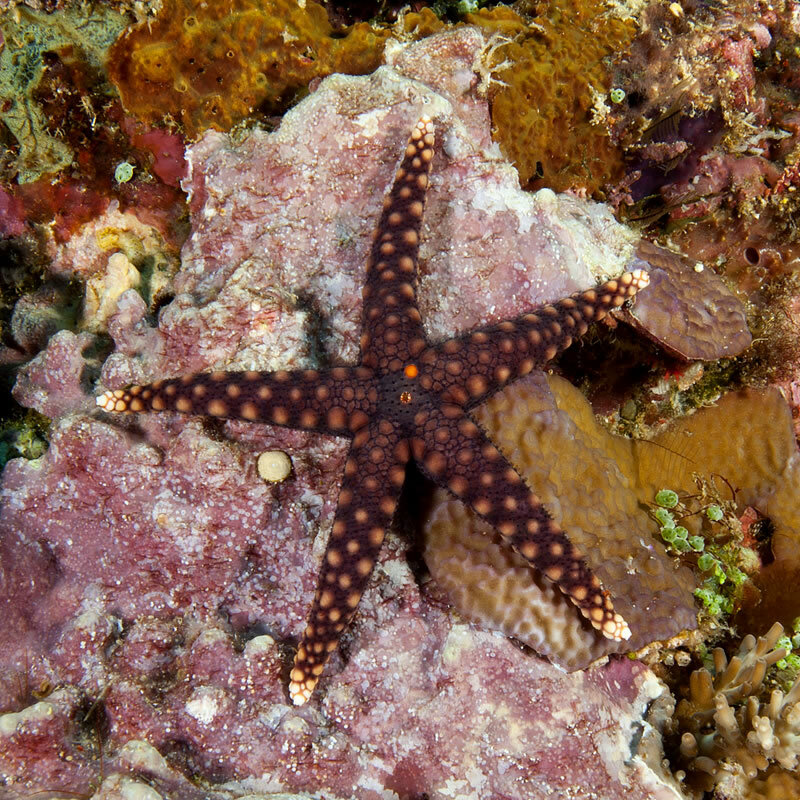 Warty sea star (Echinaster callosus). 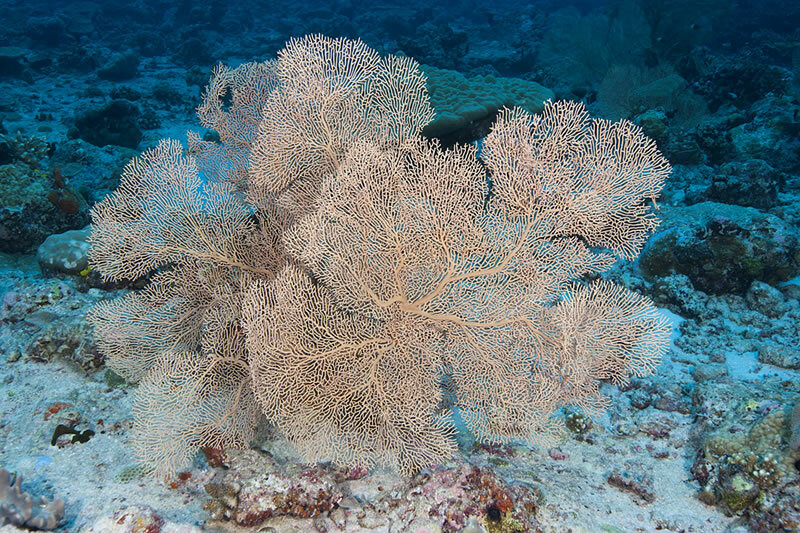 Gorgonian sea fan with winged oyster. 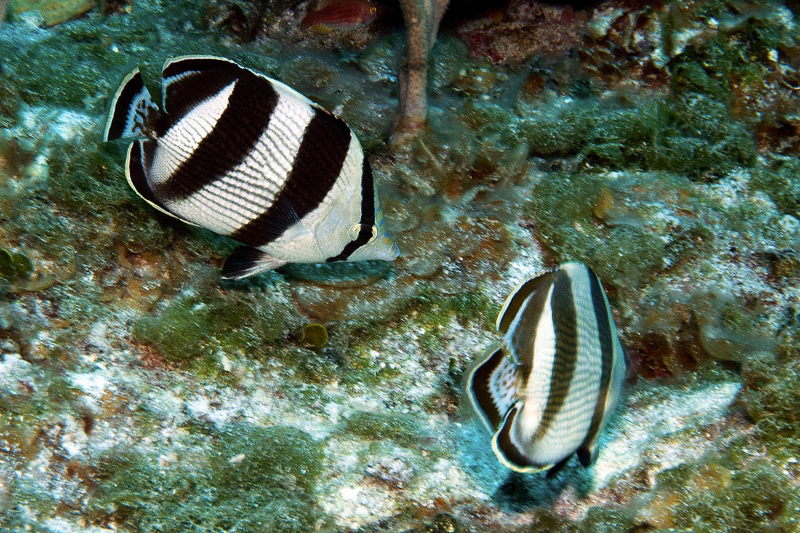 Zebra dartfish (Ptereleotris zebra) aggregating on bottom. 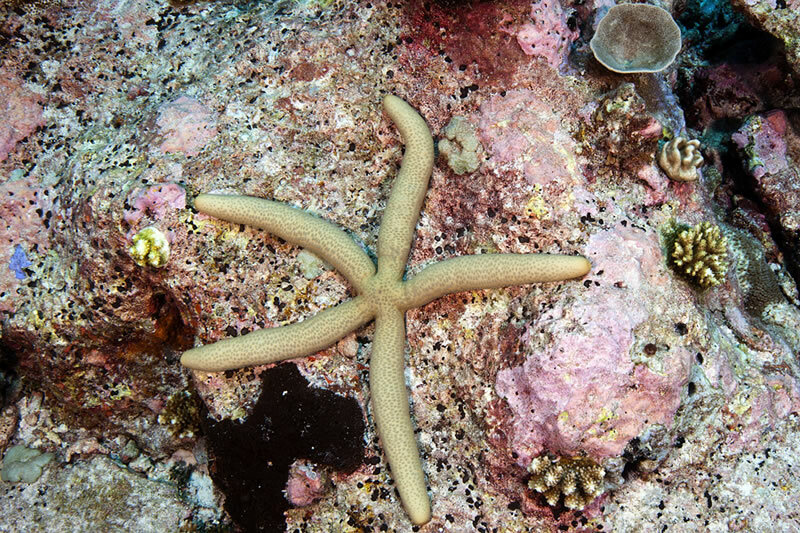 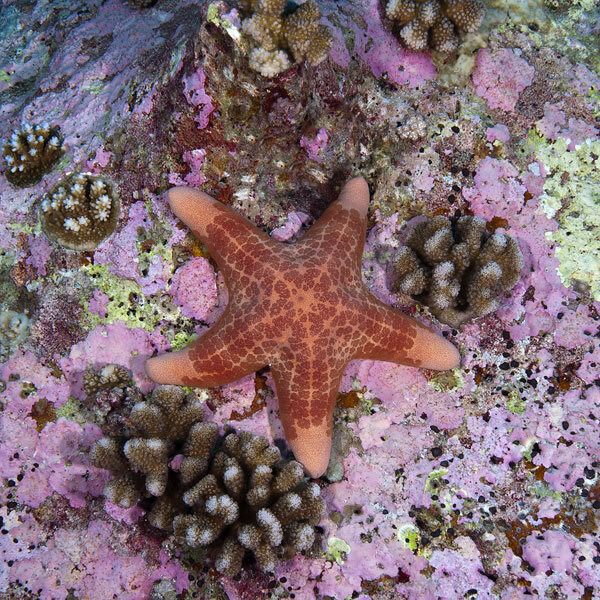 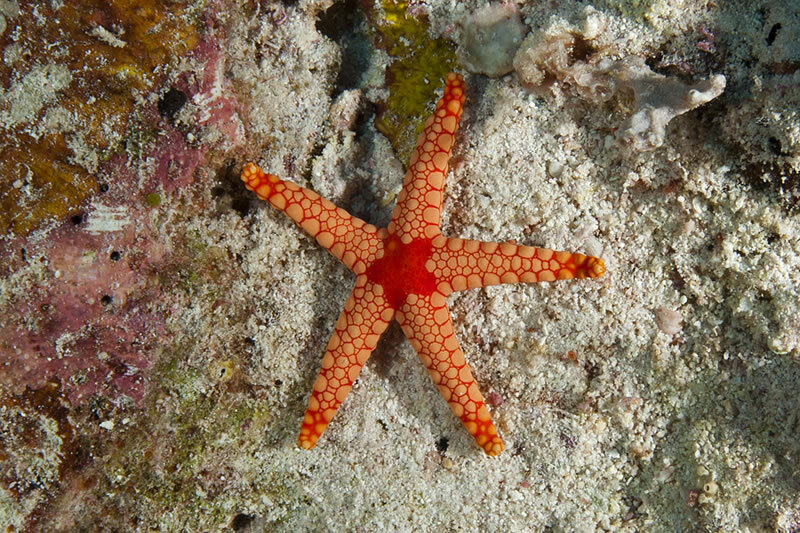 Cuming’s sea star (Neoferdina cumingi). 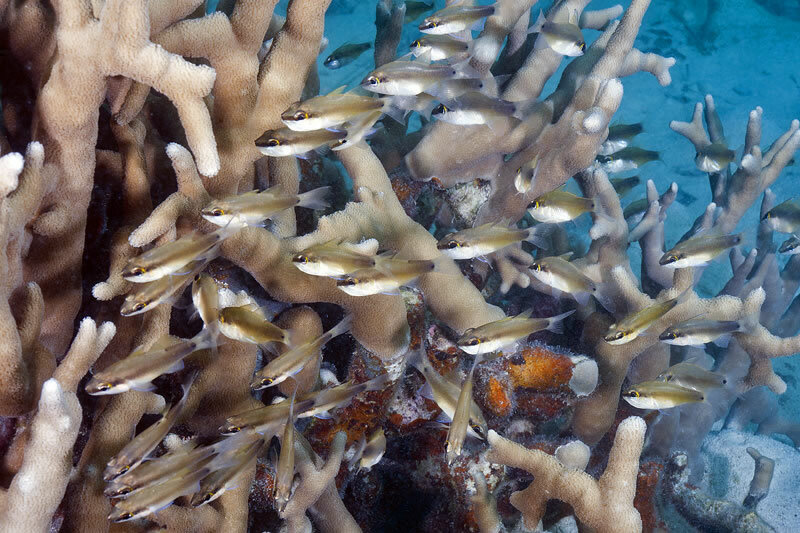 Black-axil chromis (Chromis atripectoralis) and reticulated dascyllus hanging out above coral thicket. 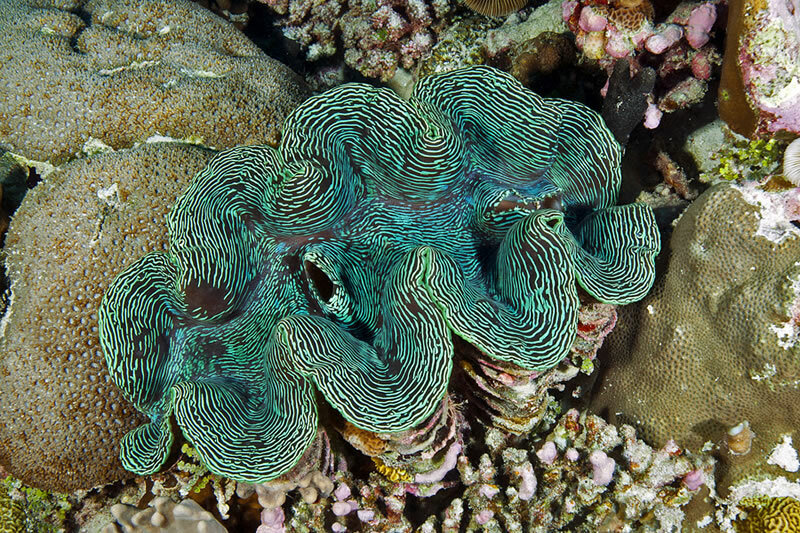 A beautiful close-up view of the mantle (tissue) of a giant clam. 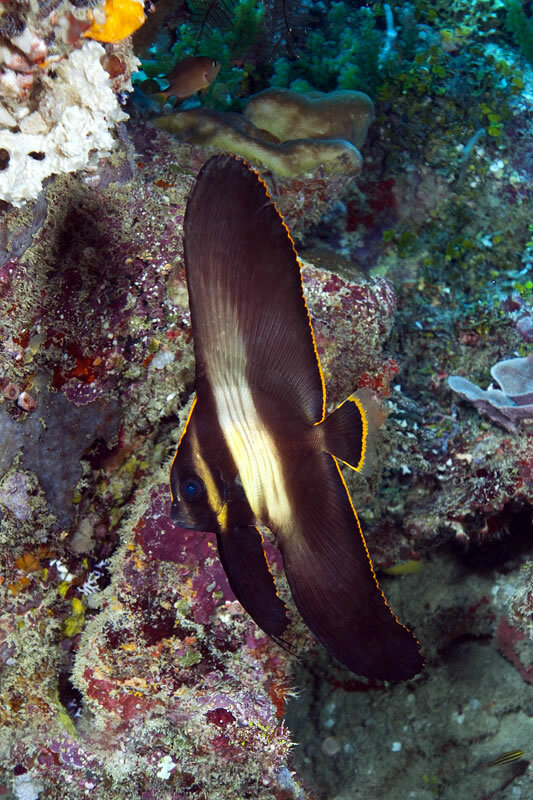 Junvenile pinnate spadefish (Platax pinnatus). 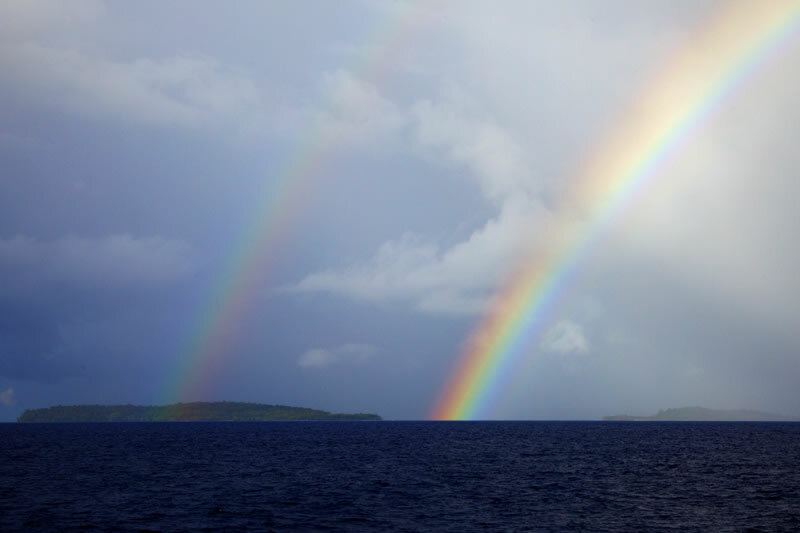 It was a good start to our day waking up to a double rainbow near Malakobi Island. 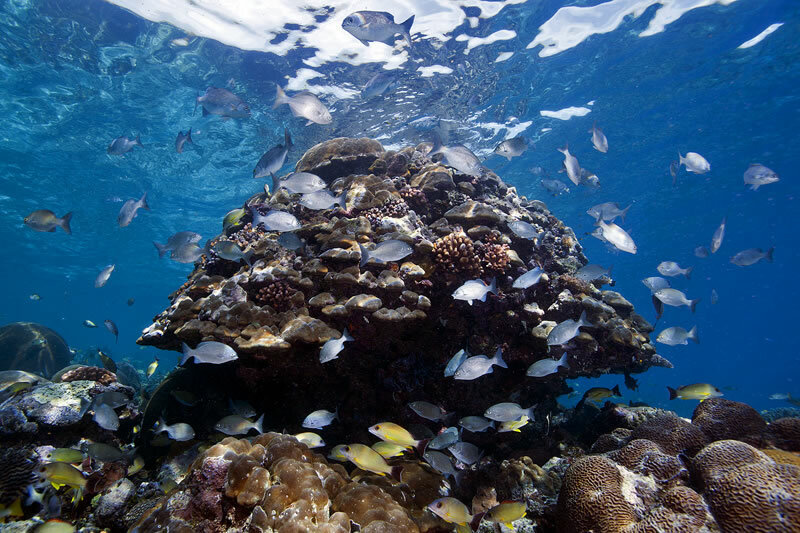 Chubs and snapper swimming around a coral bommie. 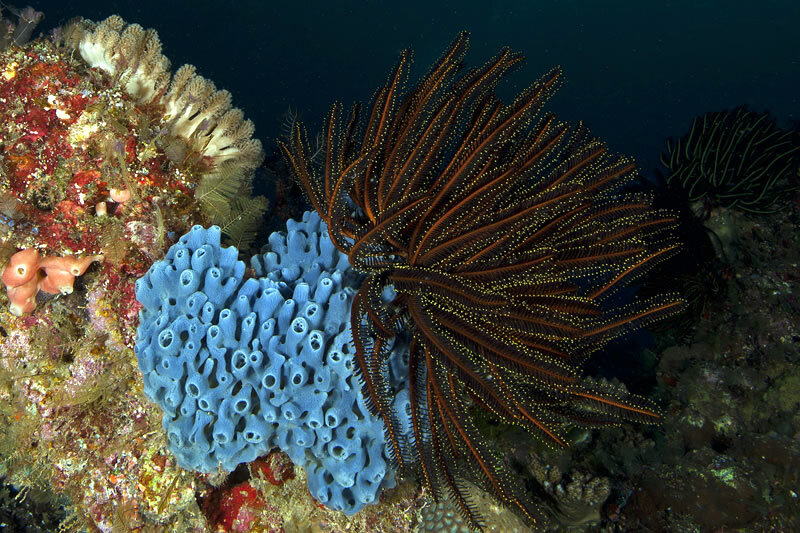 Feather star resting on top of a blue sponge. 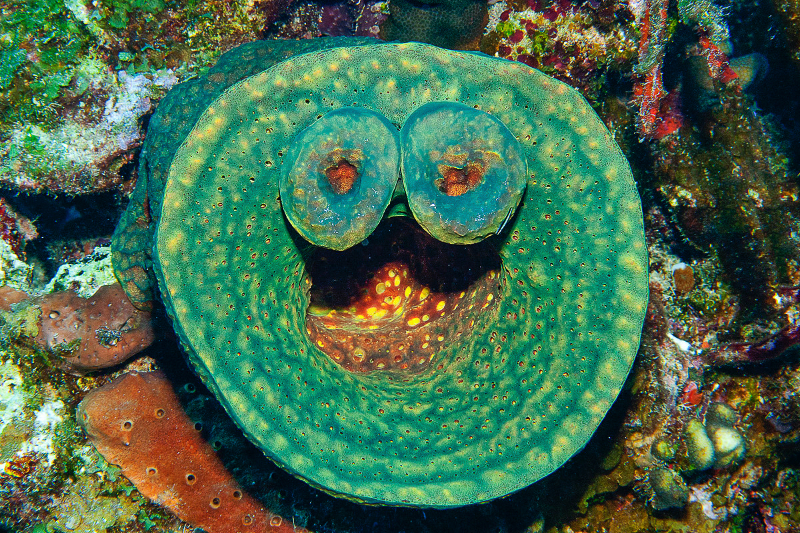 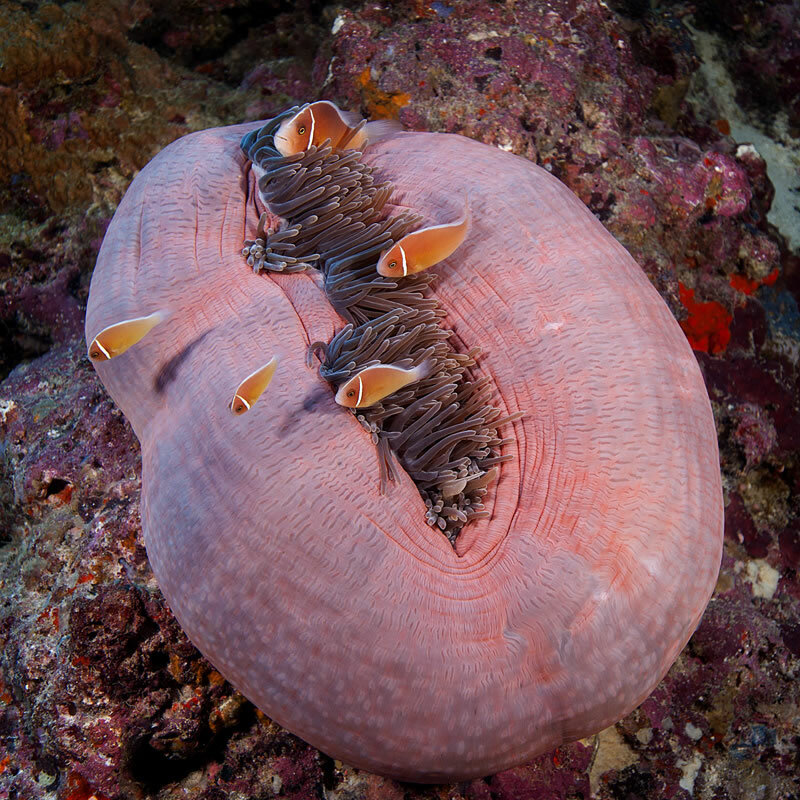 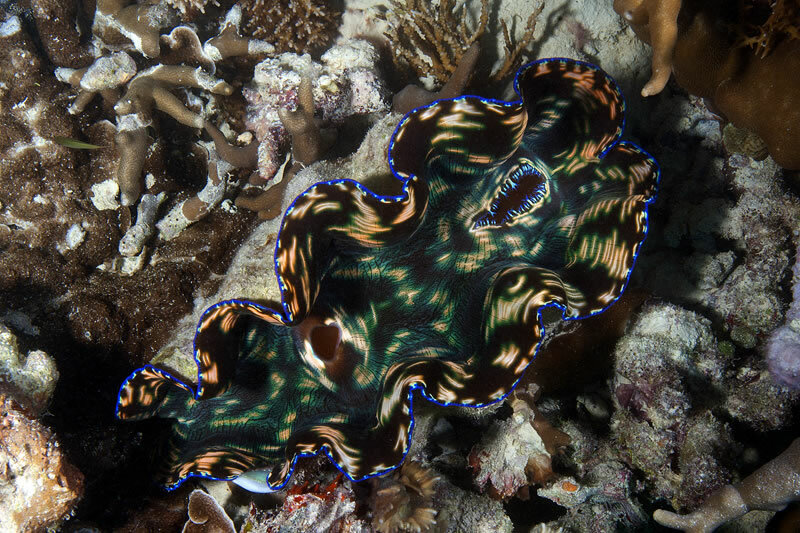 Here is a gorgeous giant clam. 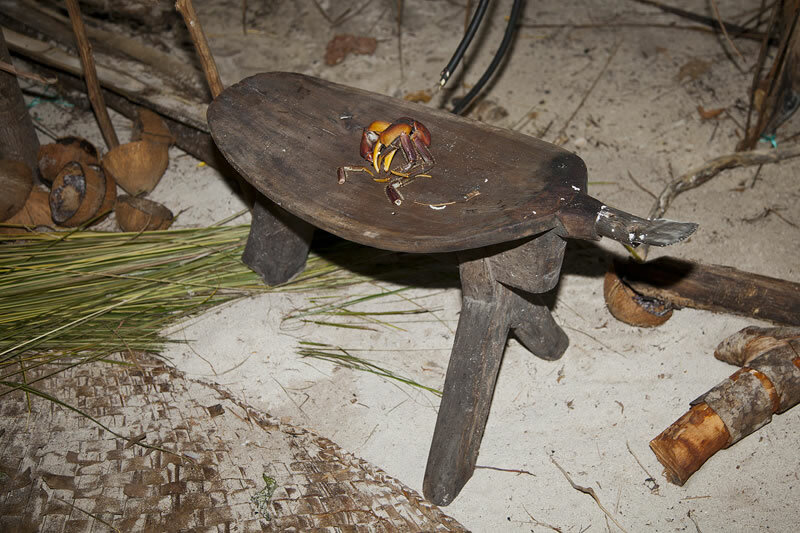 Notice the two openings called siphons. 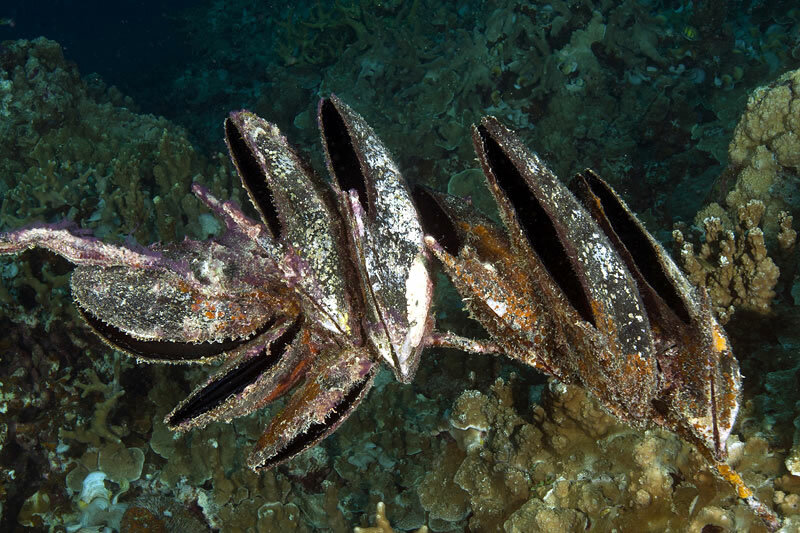 These siphons allow the clam to filter feed. 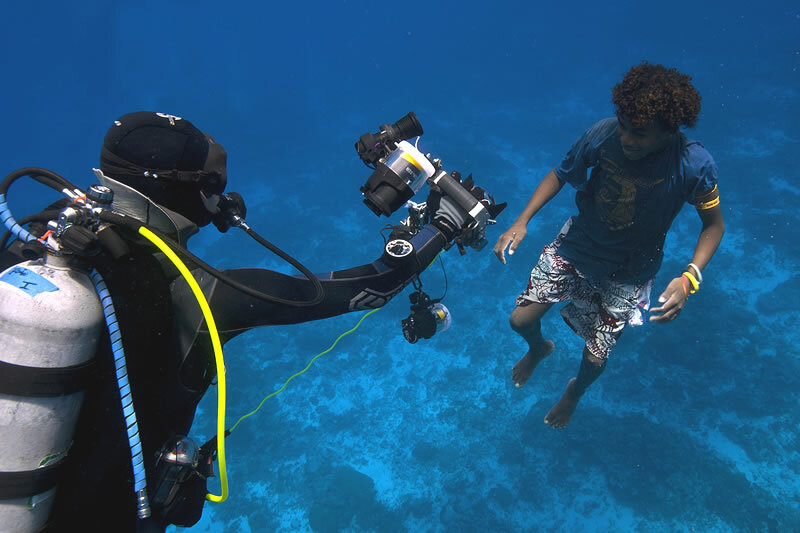 Scientists Monteiro and Anderson Mayfield ascending from a dive. 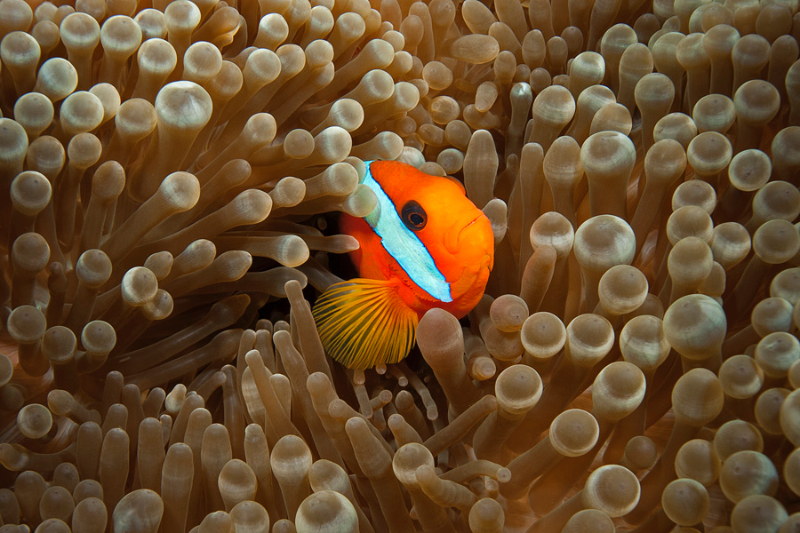 We Nemo AKA the clown anemonefish (Amphiprion percula). 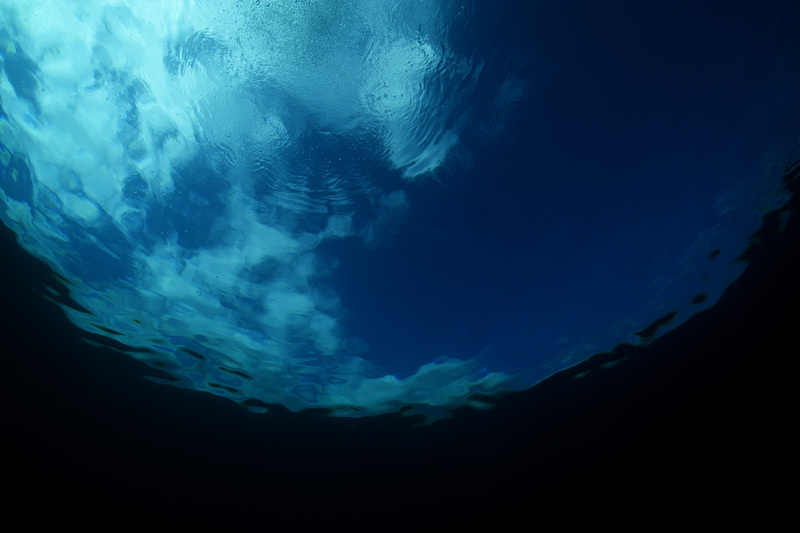 Looking up from the underwater world below. 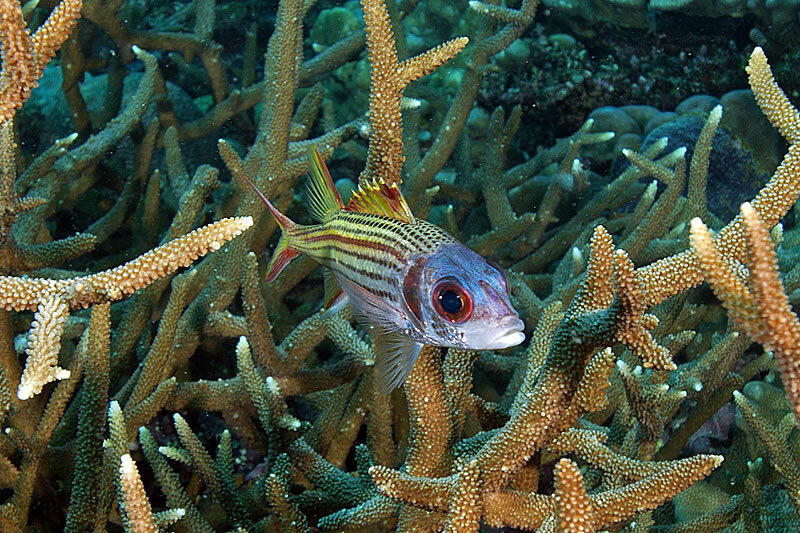 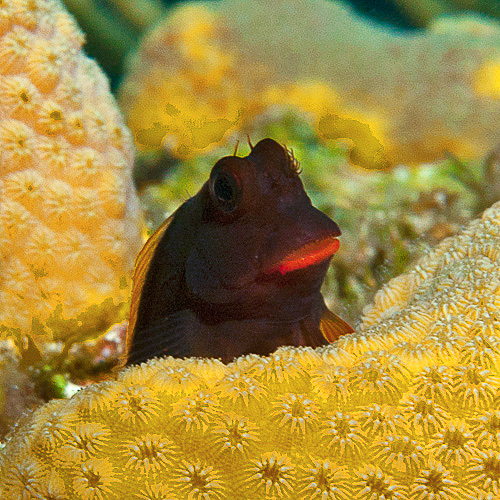 Spotfin squirrelfish (Neoniphon sammara) hanging out in staghorn coral. 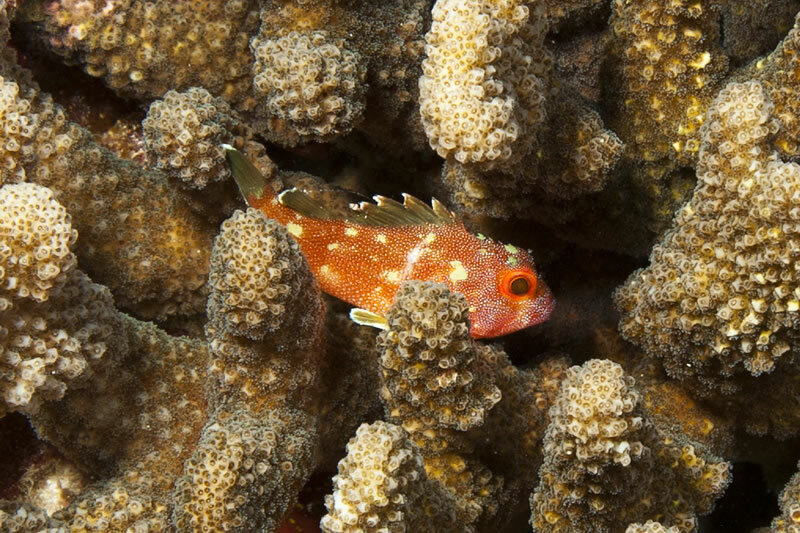 Freckled hawkfish (Paracirrhites forsteri) perched on coral. 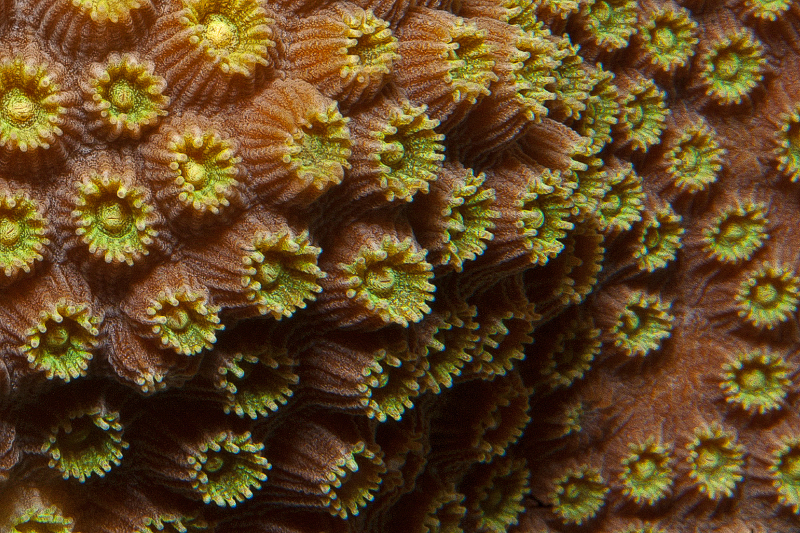 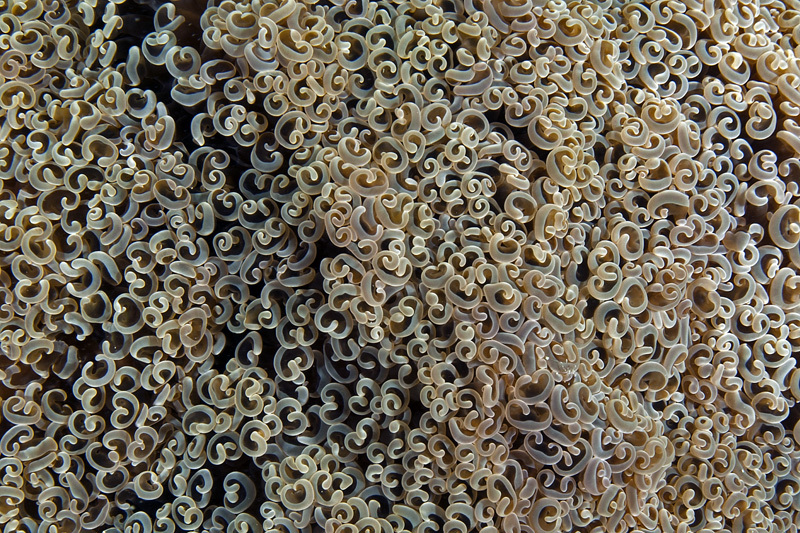 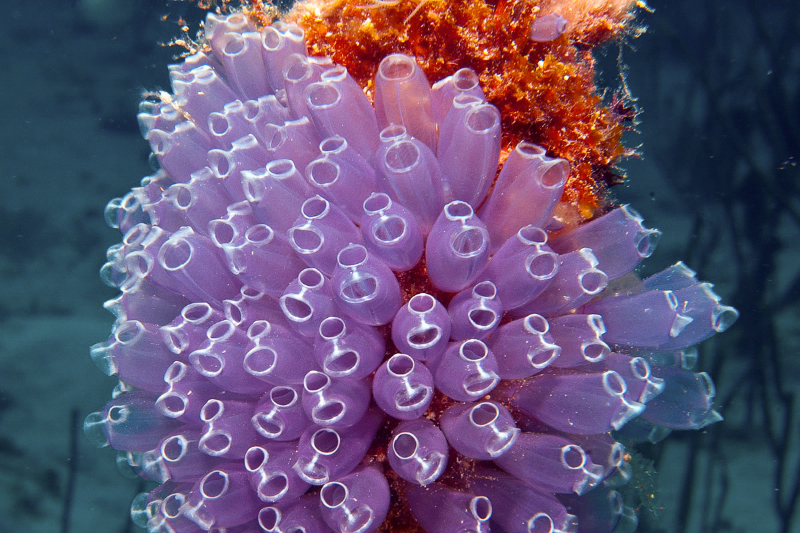 Close-up view of Symphyllia coral. 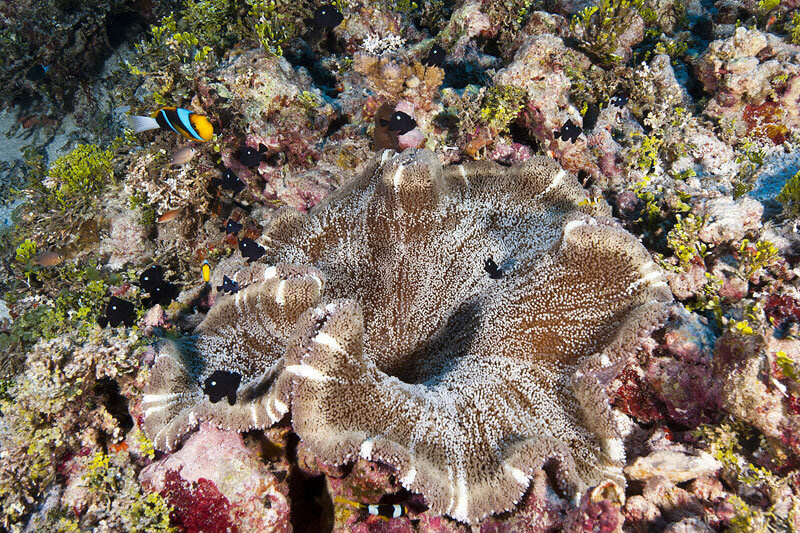 Side view of a lue elephant ear sponge. 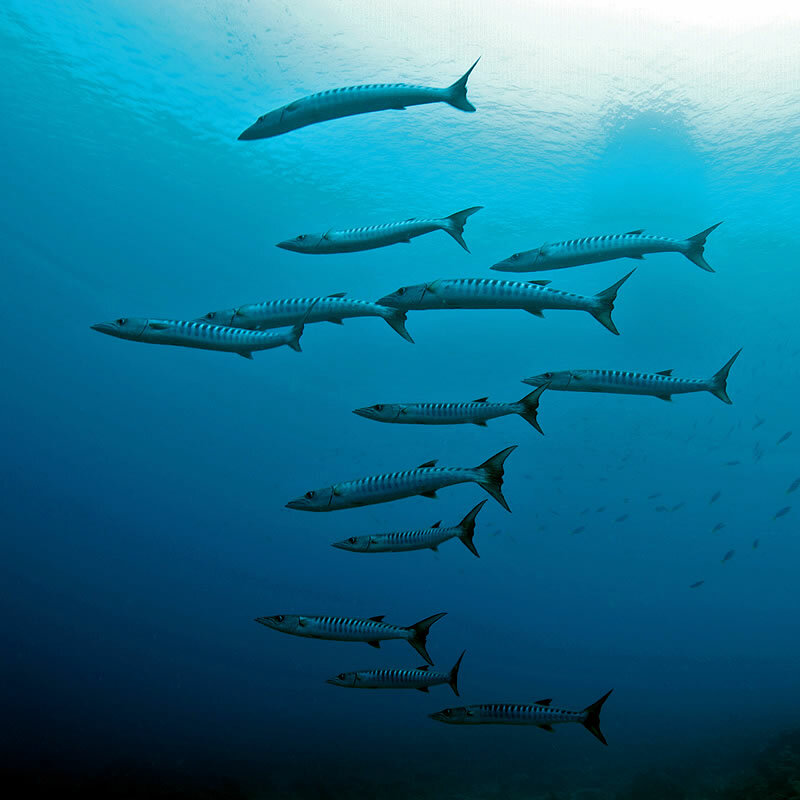 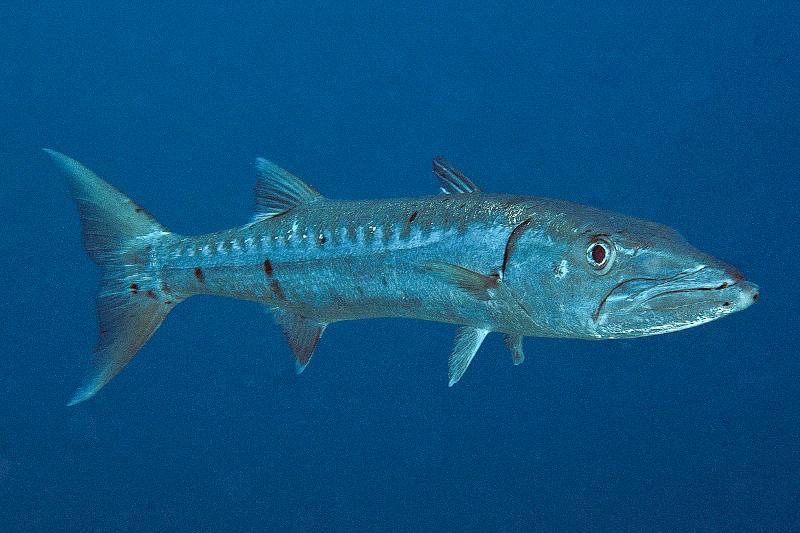 A school of blackfin barracuda (Sphyraena qenie). 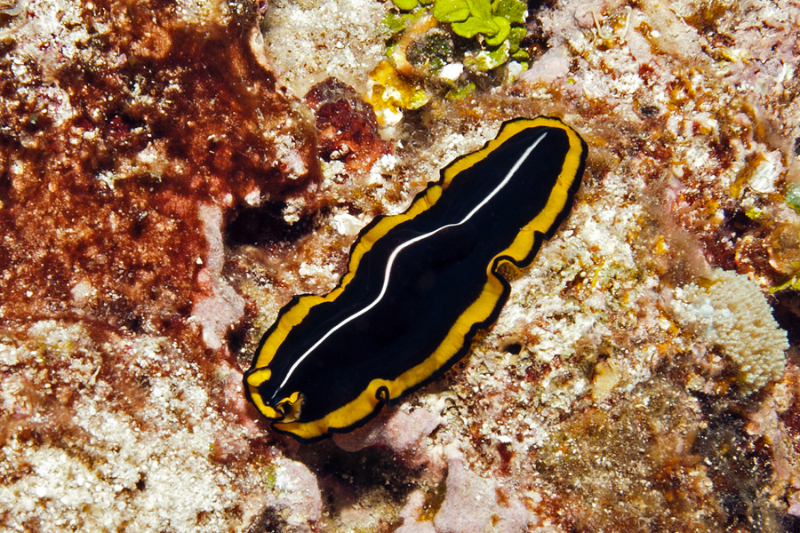 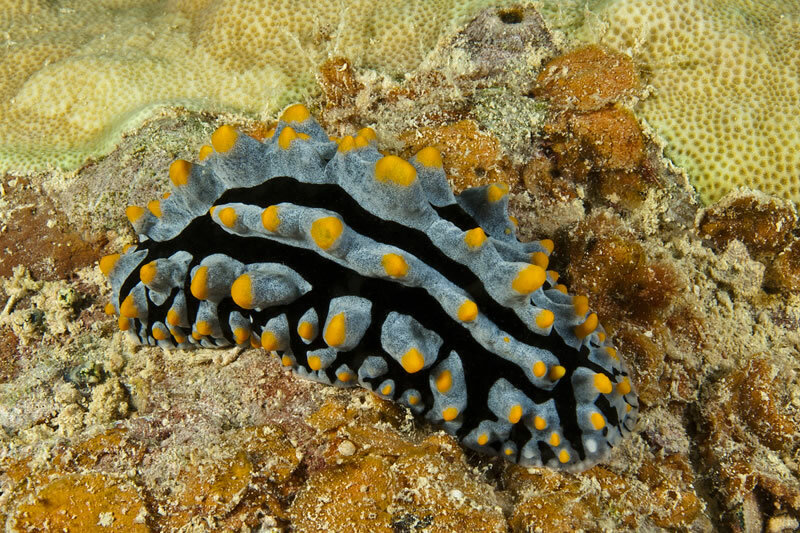 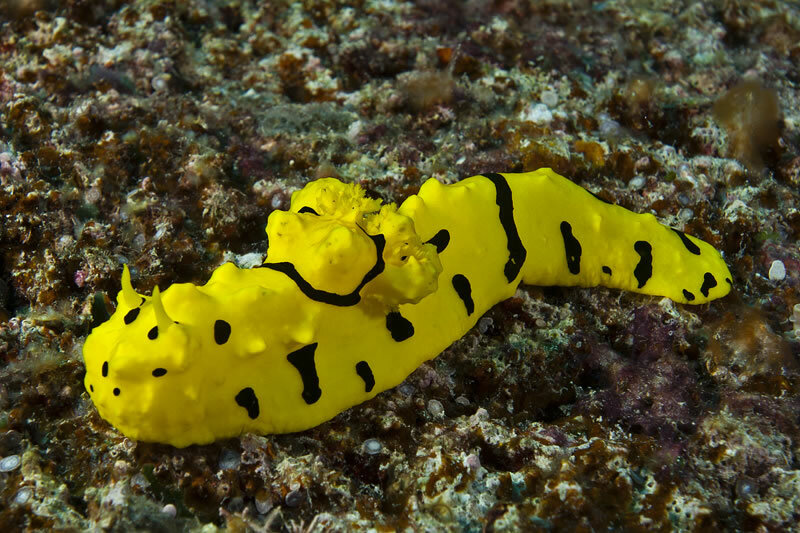 Phyllidia elegans, a type of dorid nudibranch. 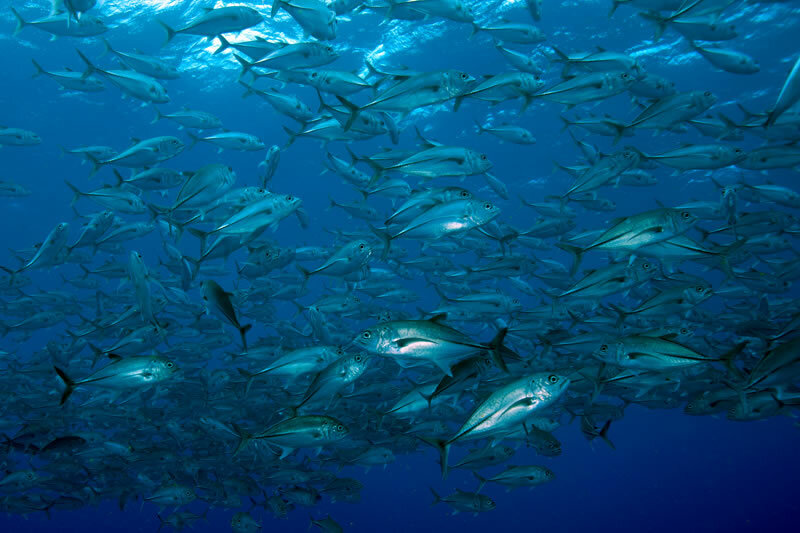 Large school of Bigeye Jacks (Caranx sexfasciatus) greeted us at the start of the dive. 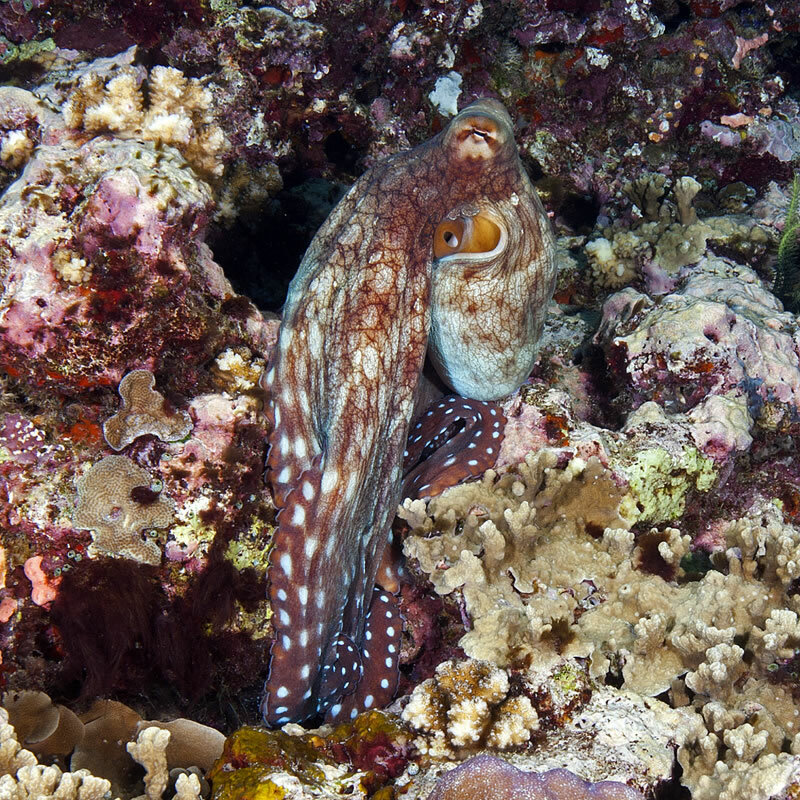 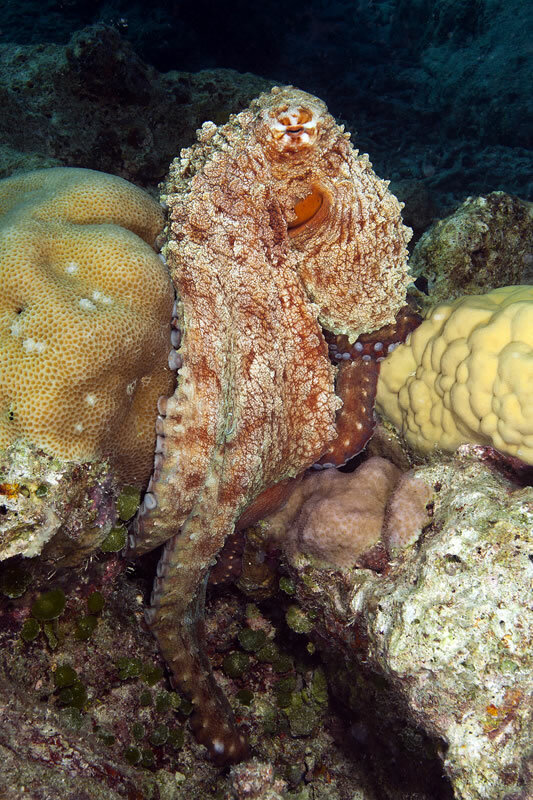 This day octopus (Octopus cyanea) was trying to camouflage itself near a rock. 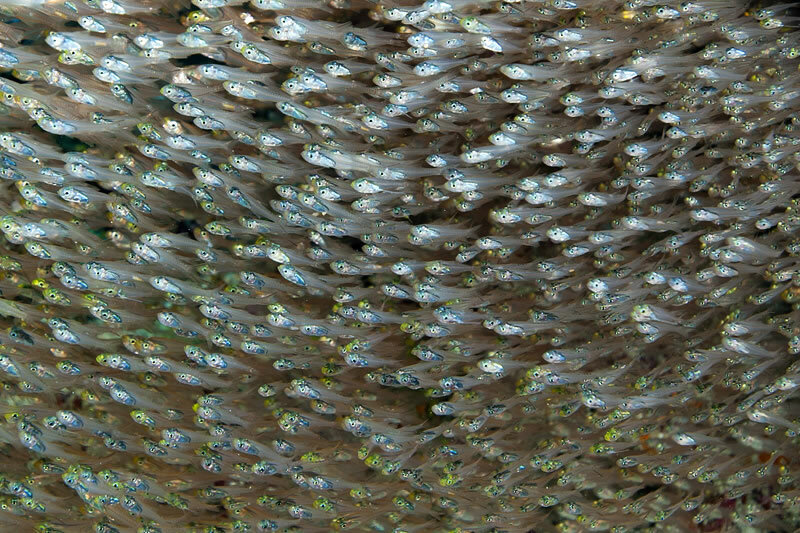 Large school of Bigeye Jacks (Caranx sexfasciatus) greeted us at the start of the dive (taken from underneath). 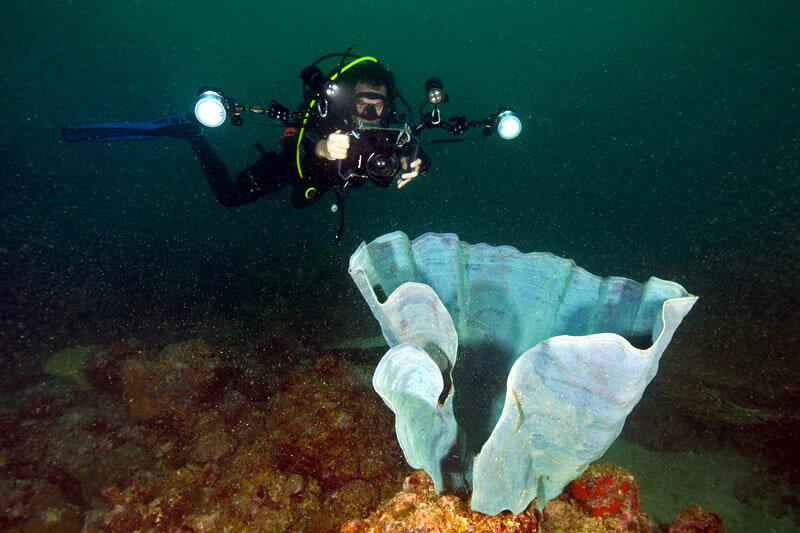 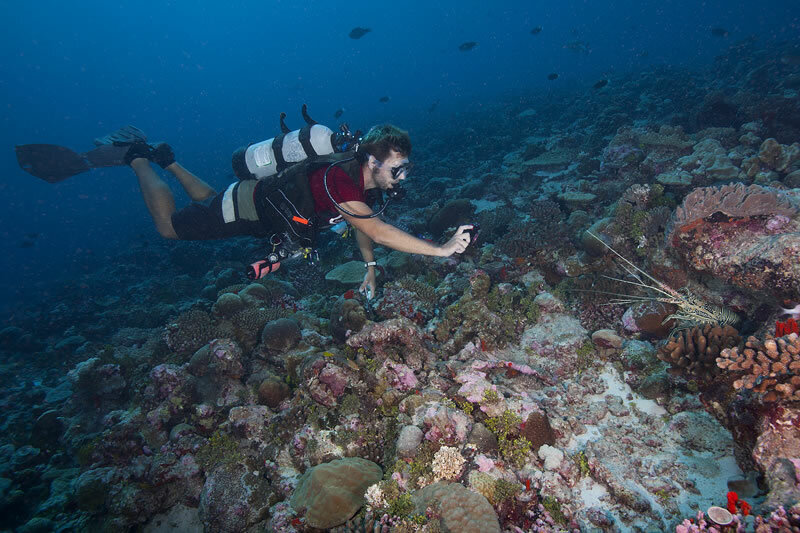 Fellow, Joao Monteiro photographing a blue, elephant ear sponge. 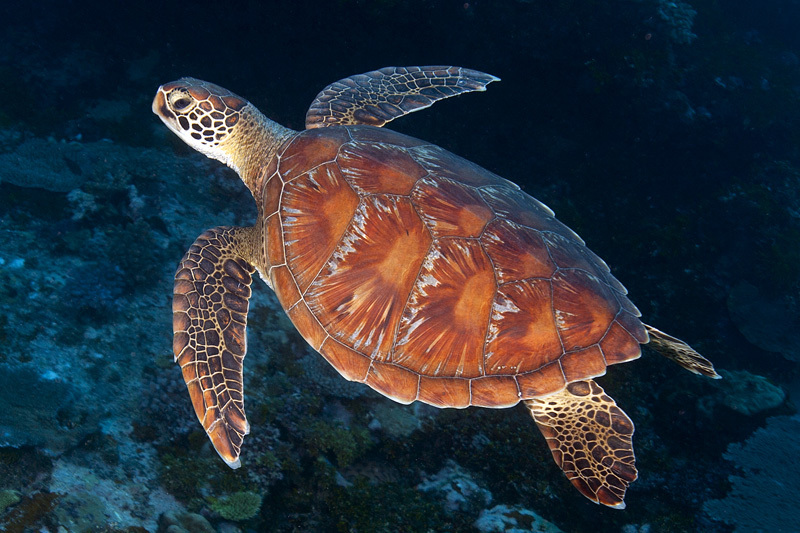 Friendly Hawksbill Sea Turtle (Eretmochelys imbricata). 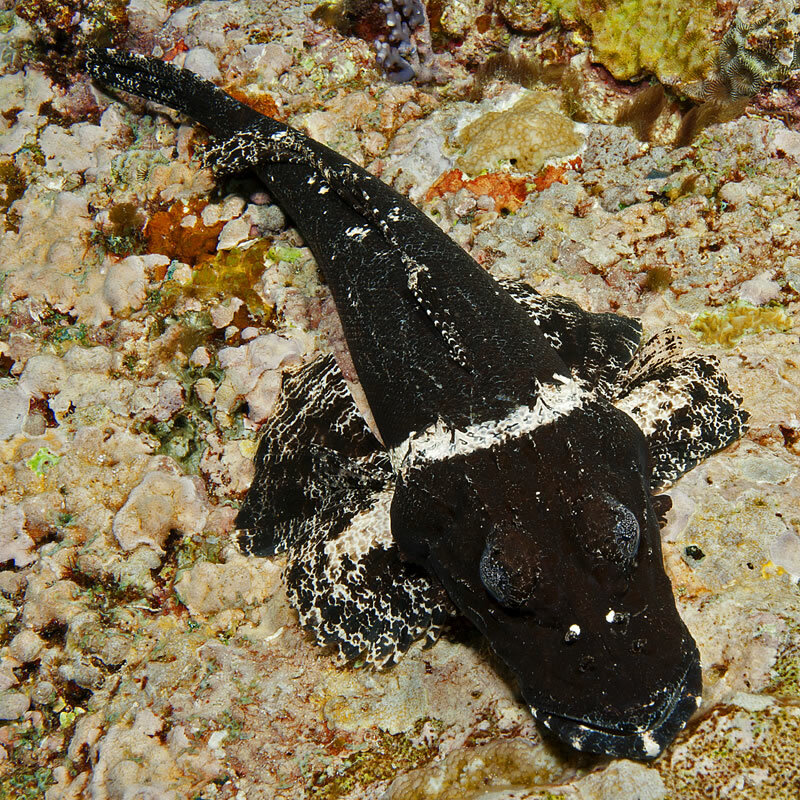 Crocodile flatheads (Cymbacephalus beauforti) usually try to camouflage themselves; however, we saw this fish in its black phase. 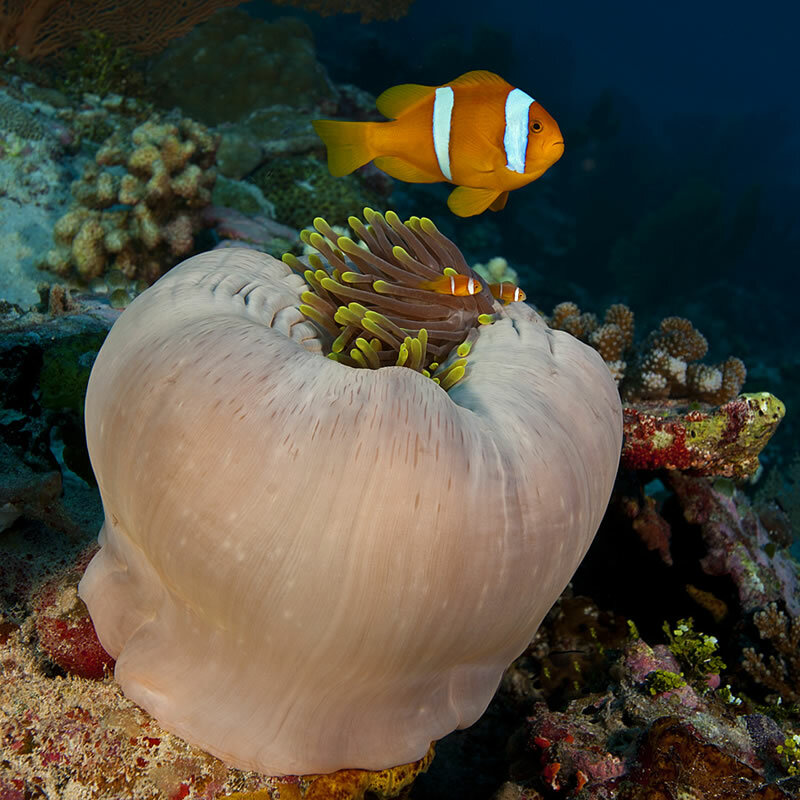 Pair of Pink Anemonefish (Amphiprion perideraion) in a large Leathery Sea Anemone (Heteractis crispa). 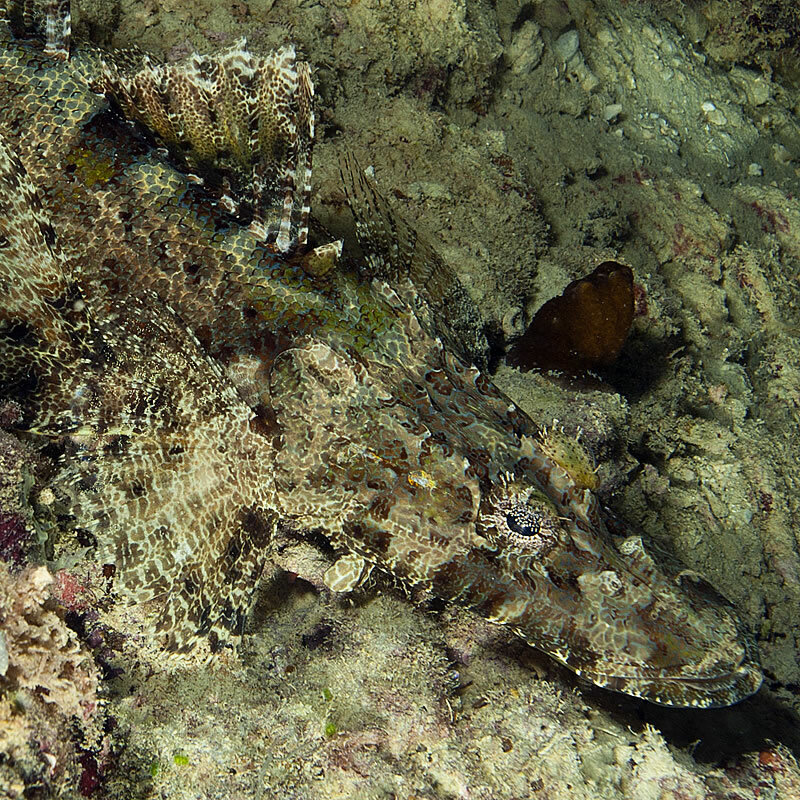 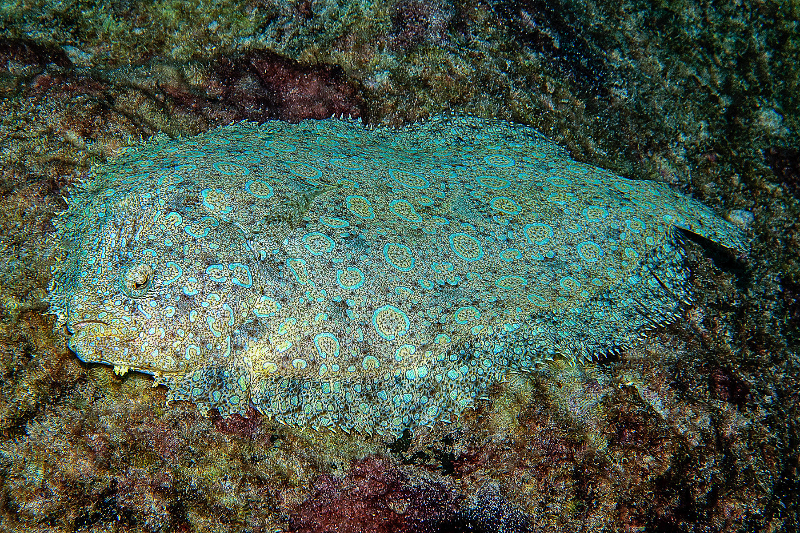 A crocodile flathead (Cymbacephalus beauforti) blending in with its background. 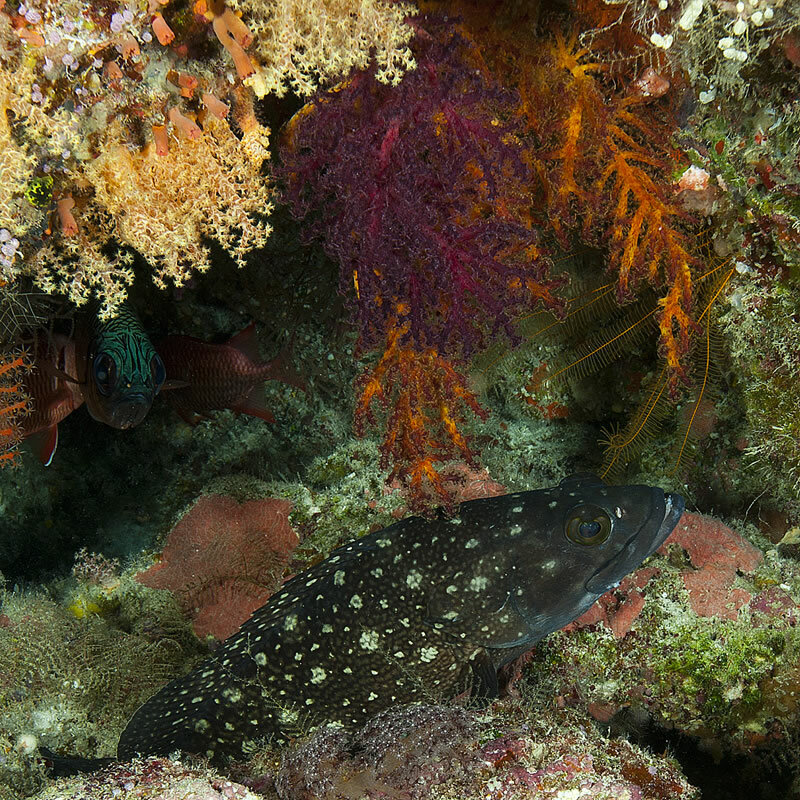 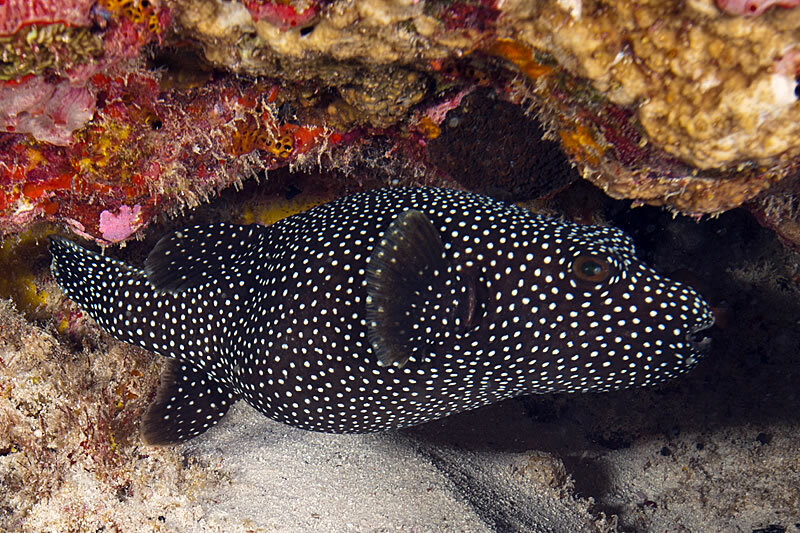 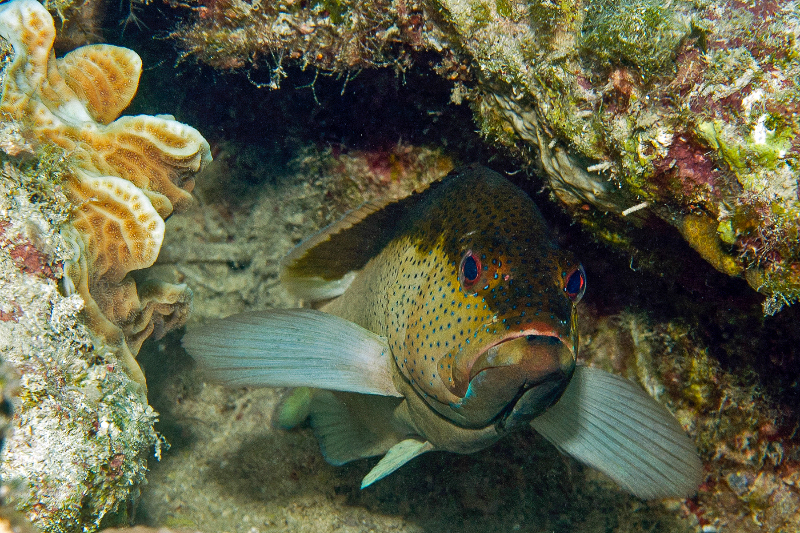 White Spotted Grouper (Epinephelus caeruleopunctatus) hiding beneath an overhang surrounded by soft corals. 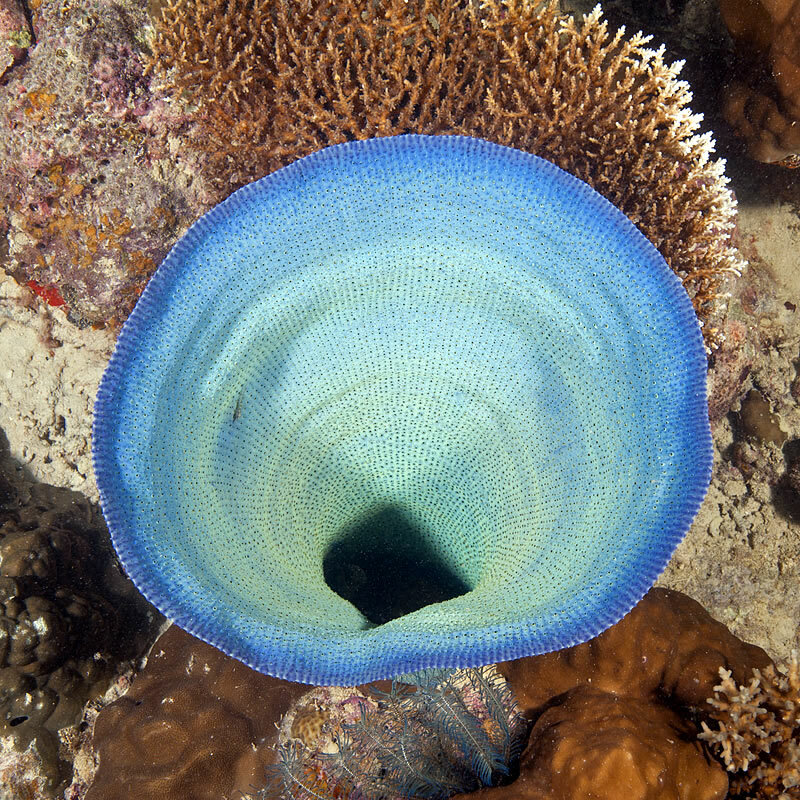 Top view of a lue elephant ear sponge. 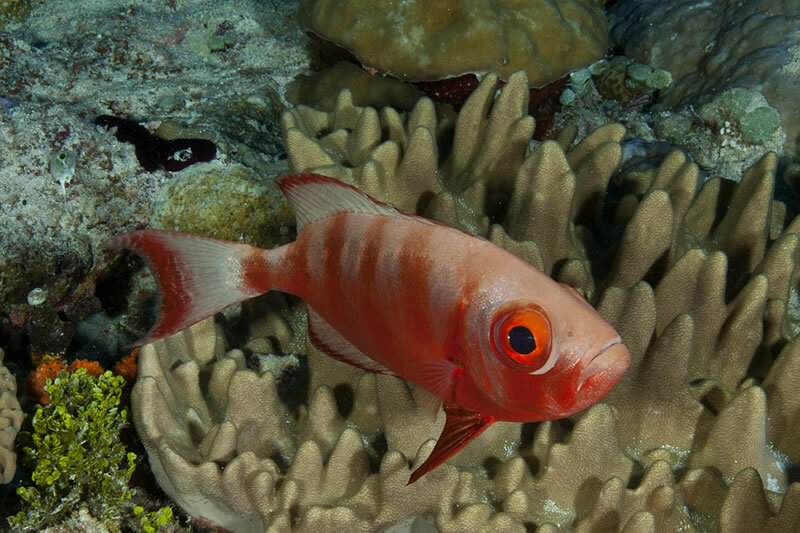 Commonly seen Shadowfin Soldierfish (Myripristis adusta) hugs the reef. 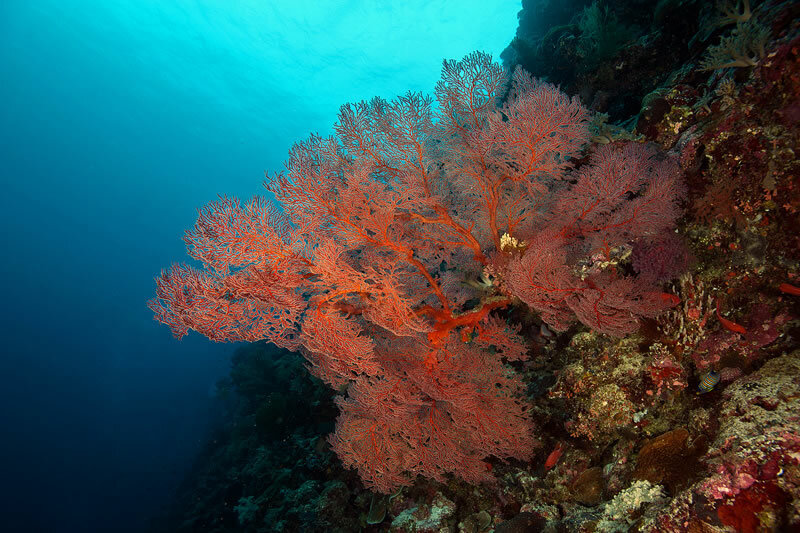 Large bushy red sea fan soft coral juts out from a sheer wall in order to filter plankton passing by on the current. 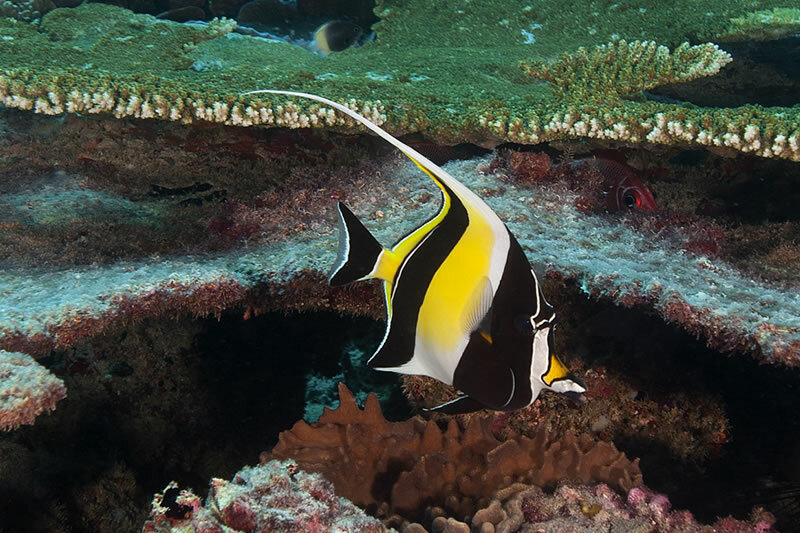 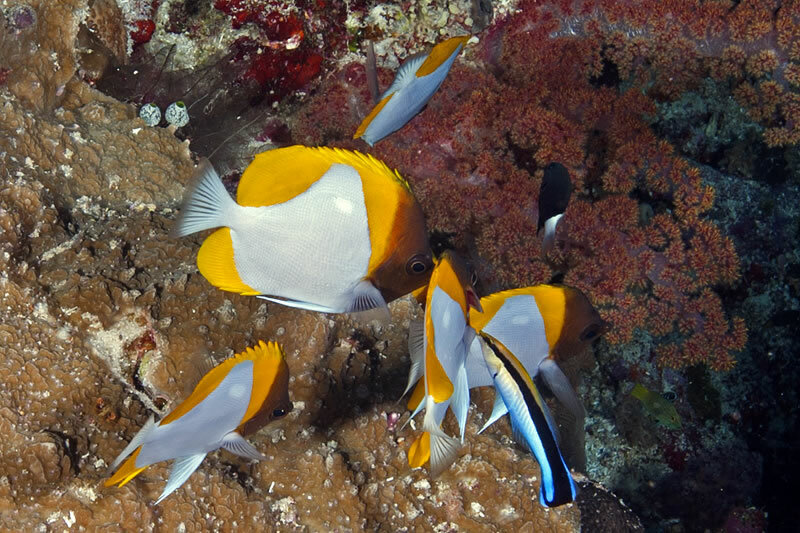 Group of Pyramid Butterflyfish (Hemitaurichthys polylepis) being cleaned by a Bluestreak Cleaner Wrasse (Labroides dimidiatus). 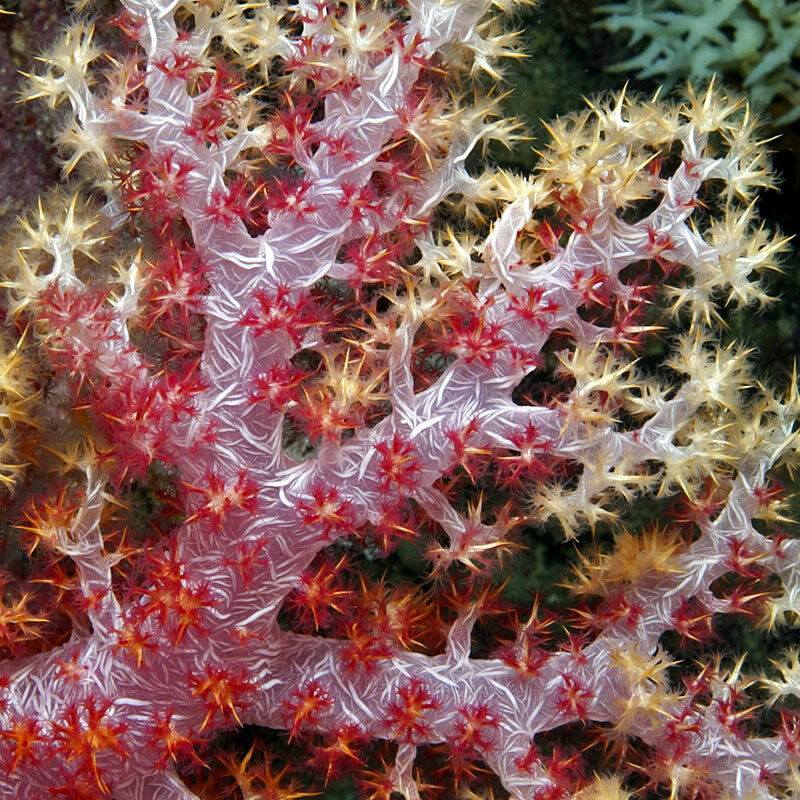 Bright red Dendronephthya soft coral looks purple underwater till it is hit with the light of a camera strobe. 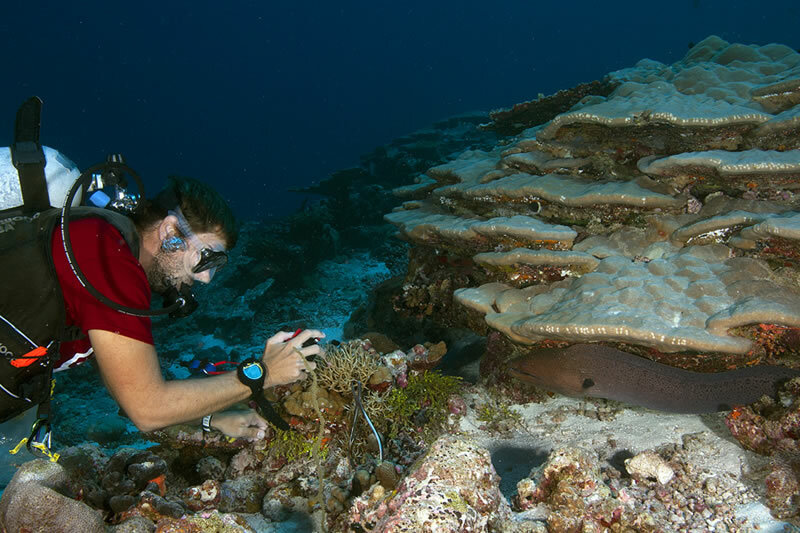 Samantha Clements performing benthic surveys on the edge of a wall. 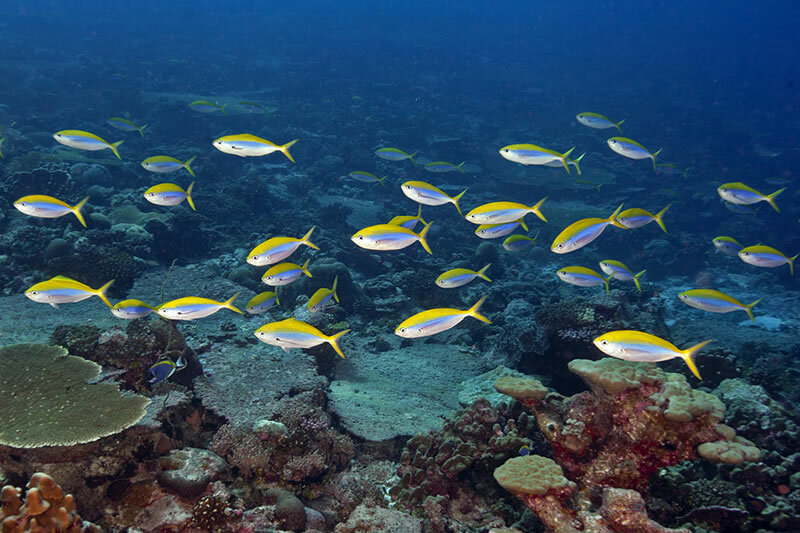 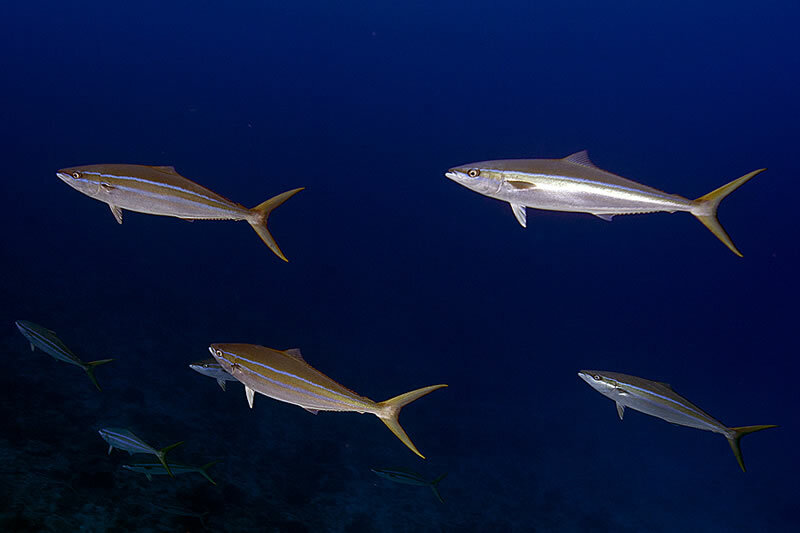 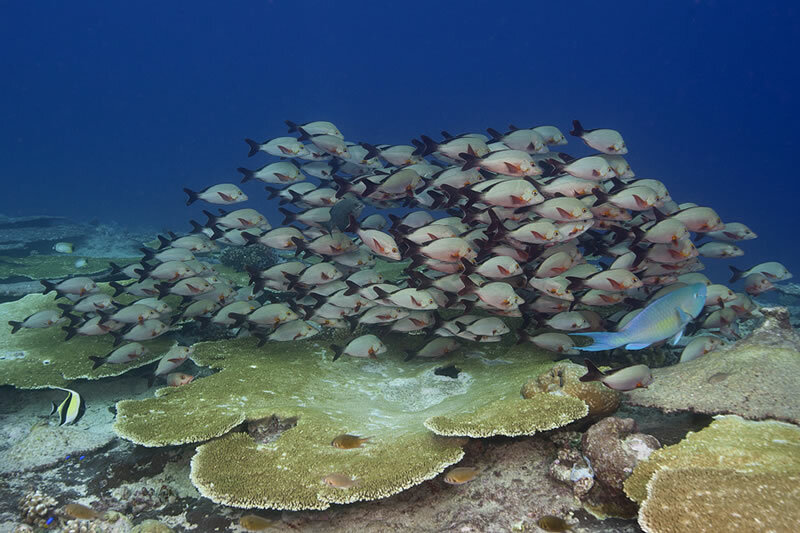 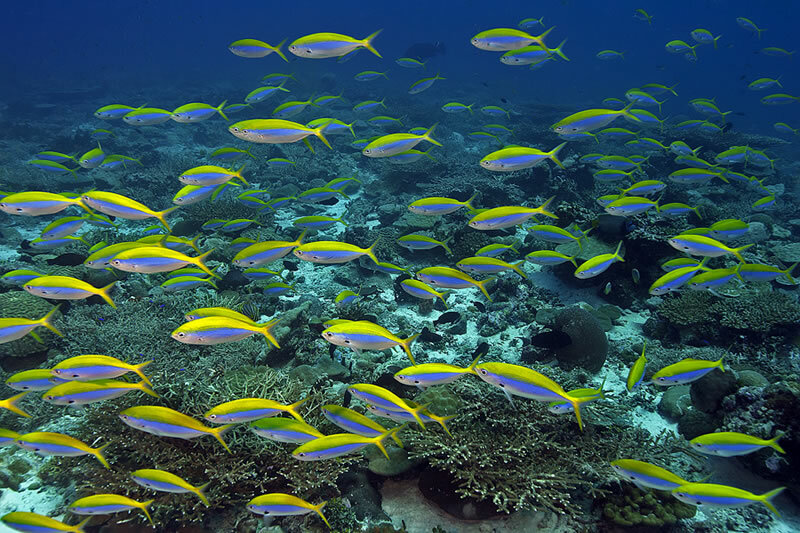 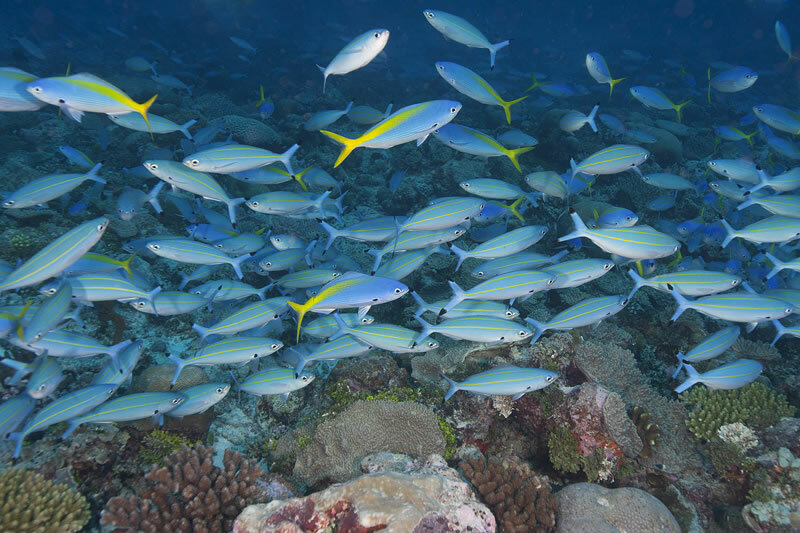 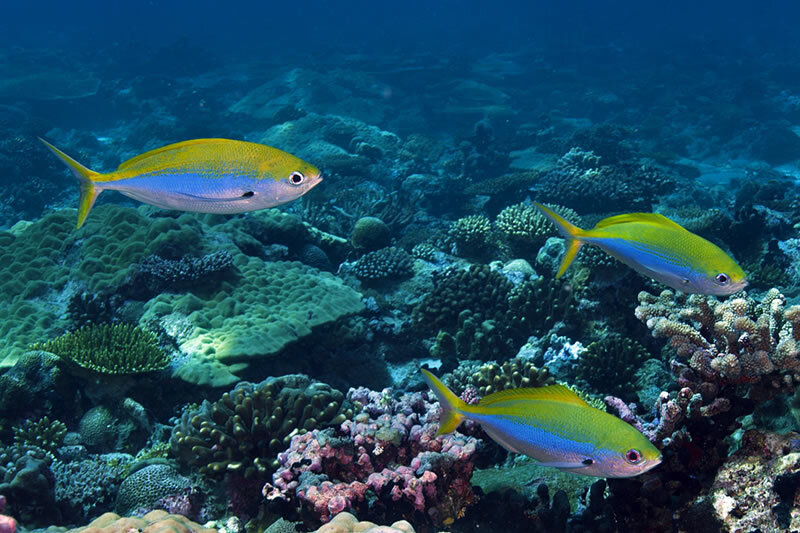 Large polarized school of Yellowfin Goatfish (Mulloidichthys vanicolensis) sweeps by the reef. 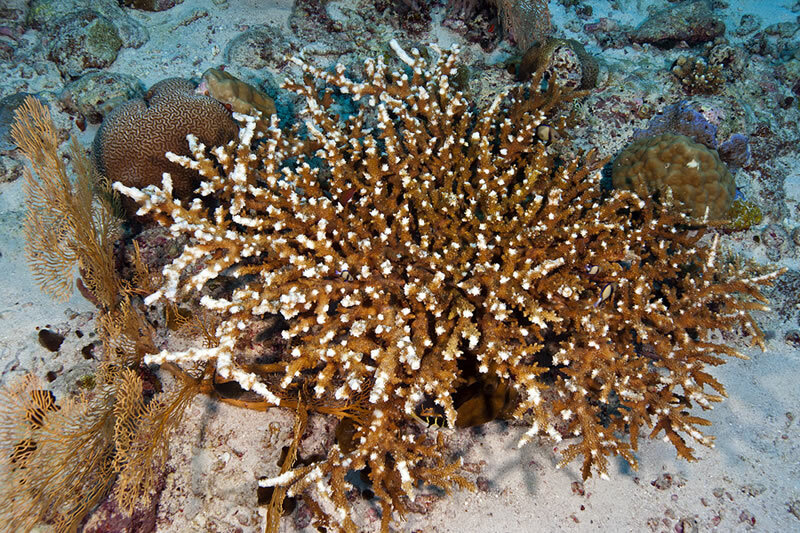 Group of Penguin's Wing Oysters (Pteria penguin) growing on branch of an old octocoral. 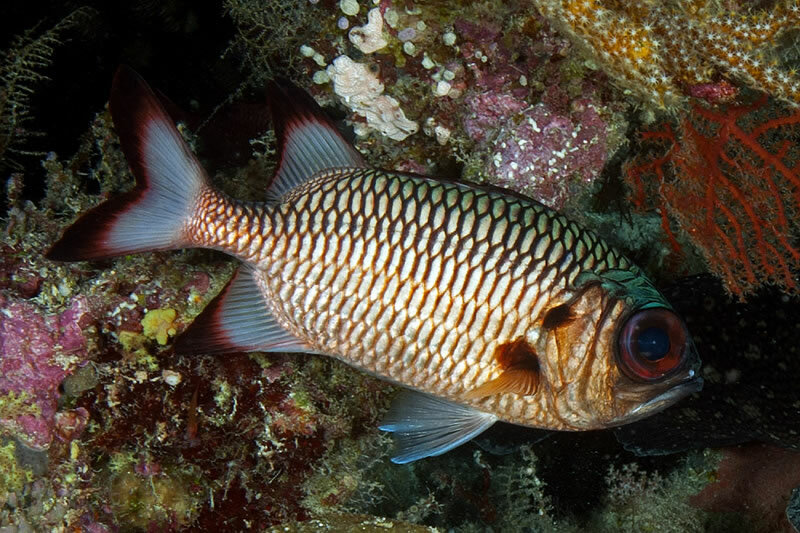 Oddly put together Pajama Cardinalfish (Sphaeramia nematoptera) looking like they were designed by committee in a patch of Porites cylindrica coral. 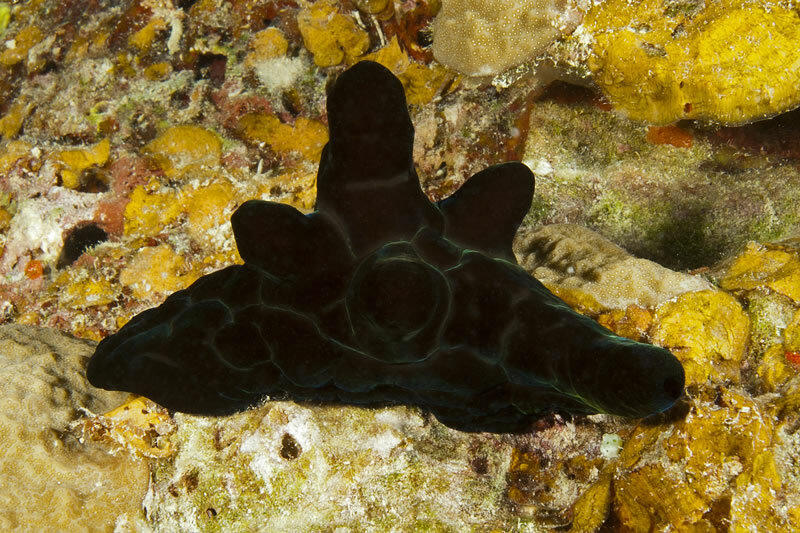 Black Velvet Snail (Coriocella nigra) looks like a nudibranch but has an internal shell. 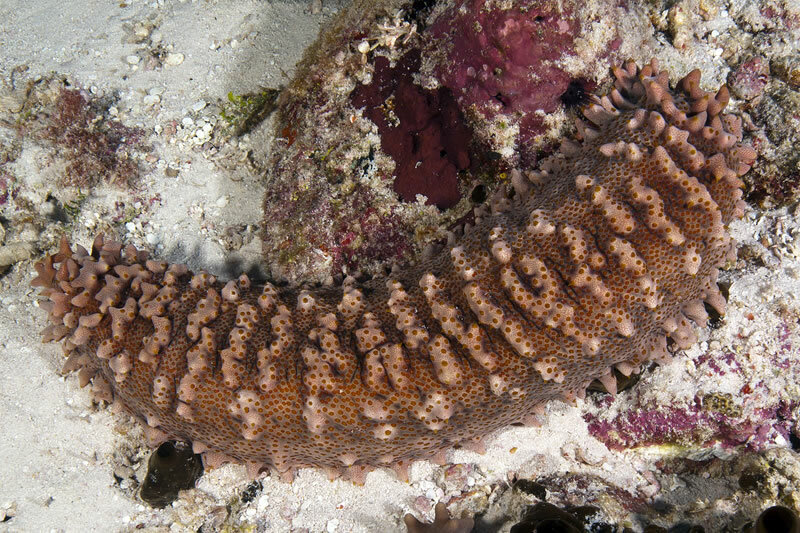 Worm Sea Cucumbers (Synaptula sp.) 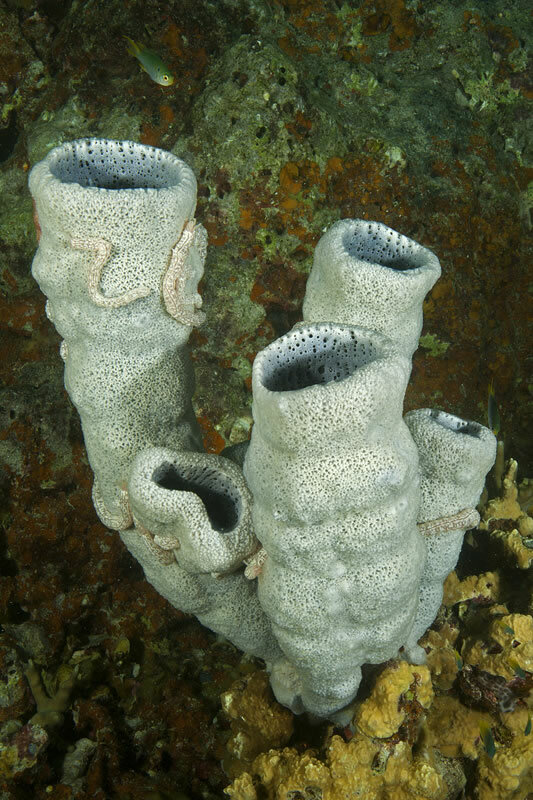 on a cluster of pale blue tube sponges.